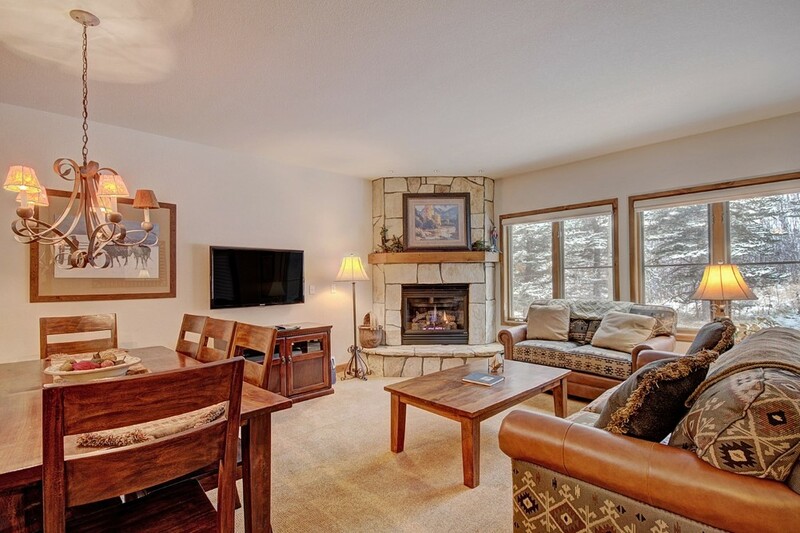 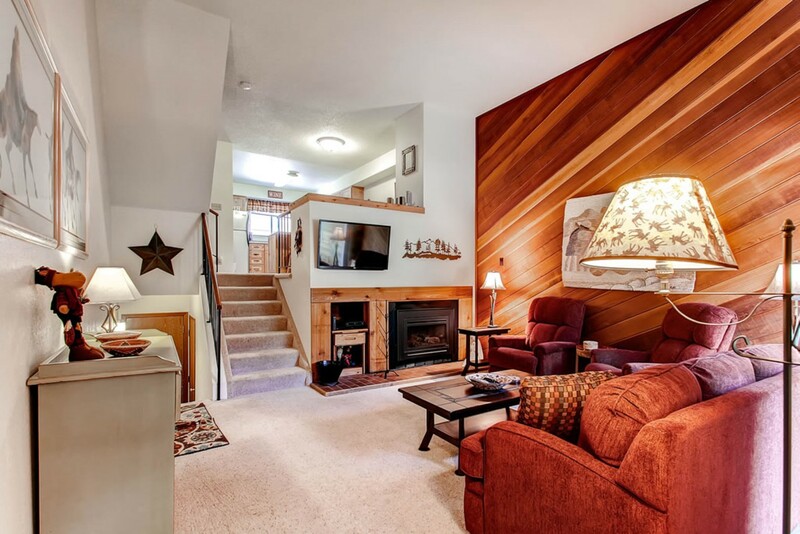 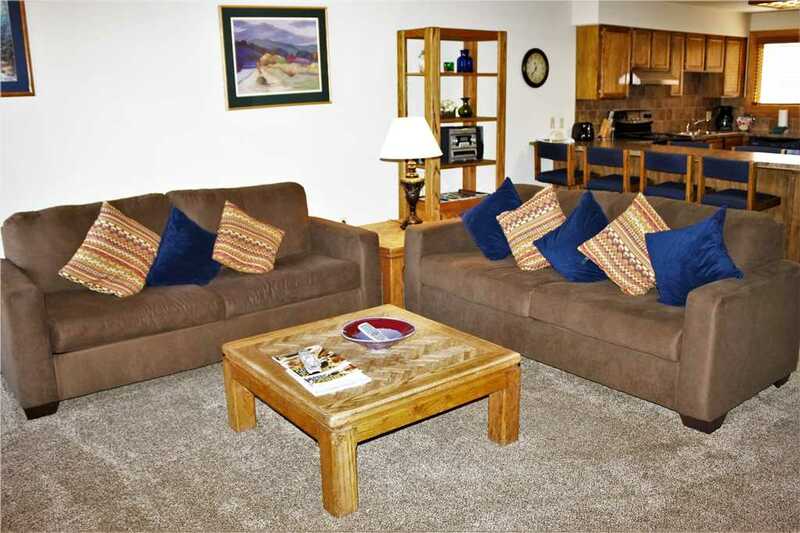 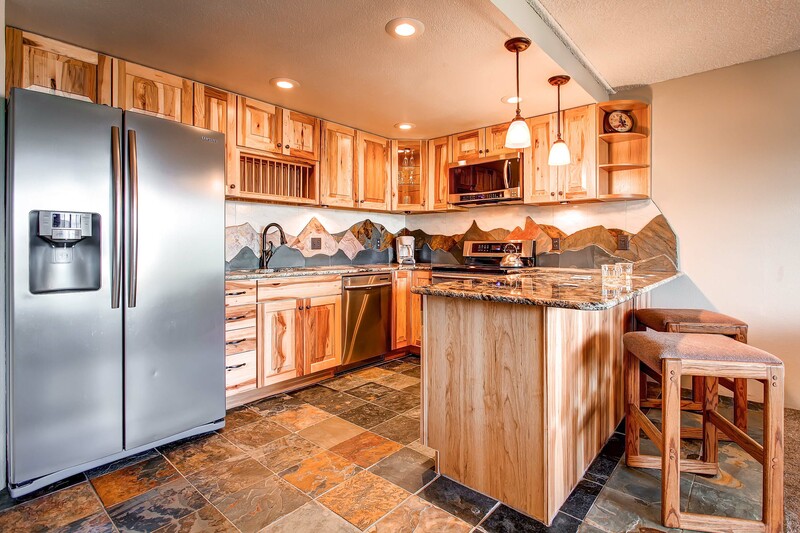 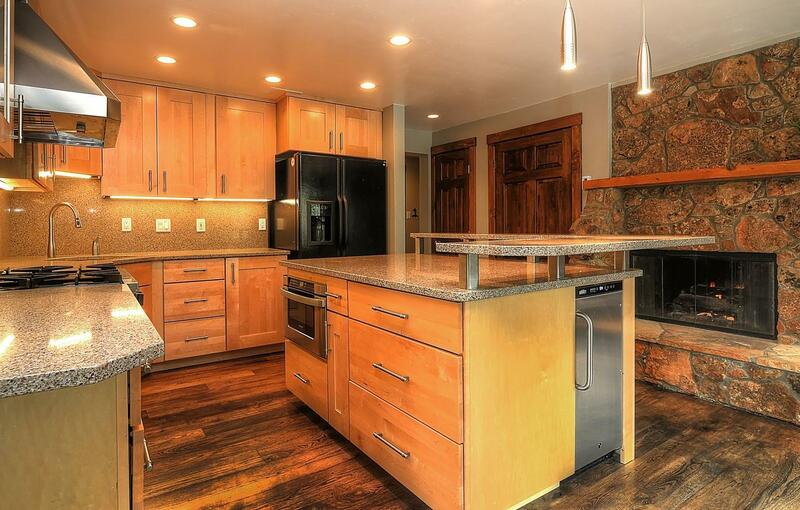 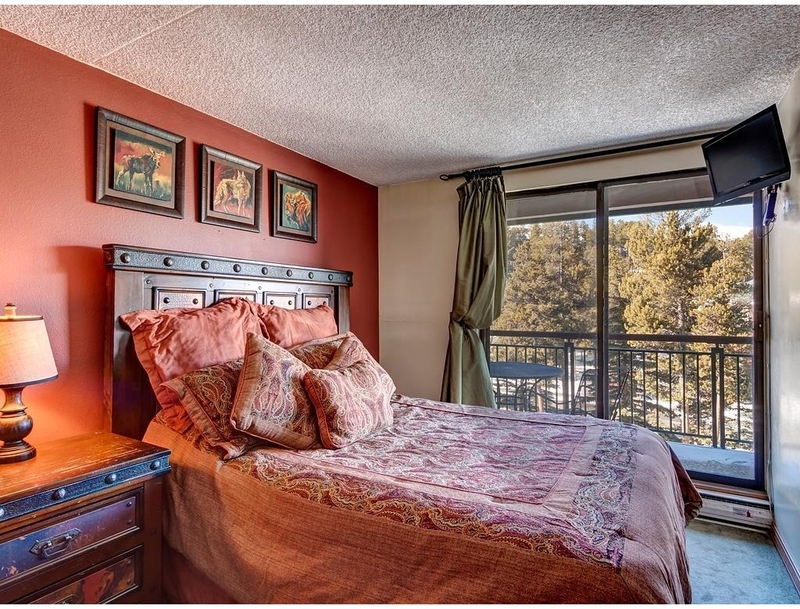 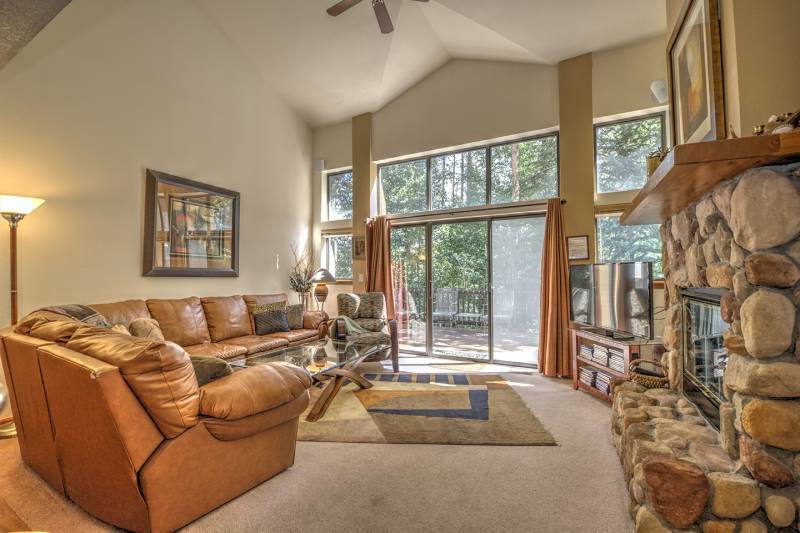 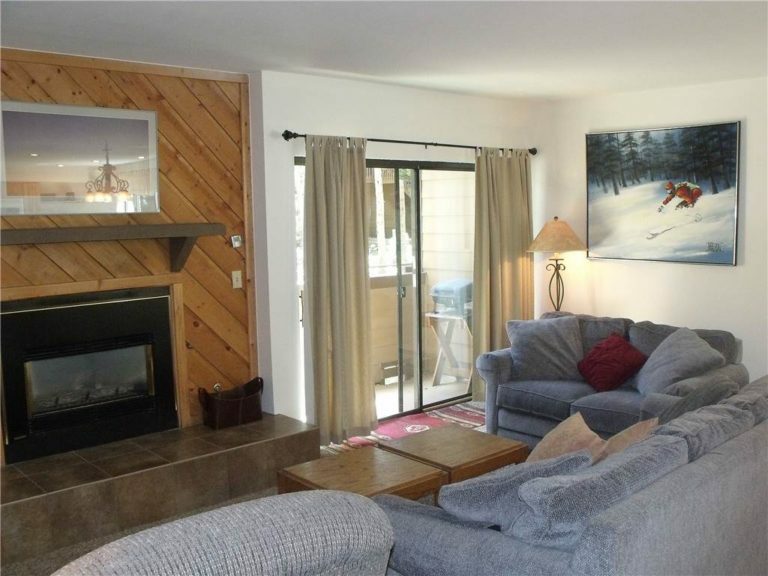 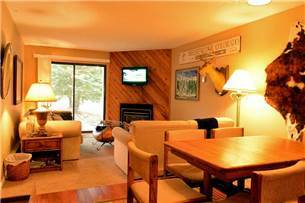 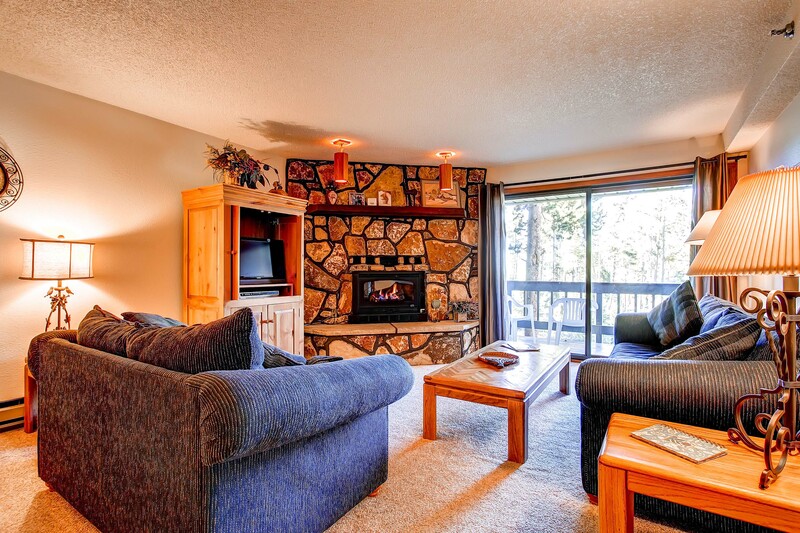 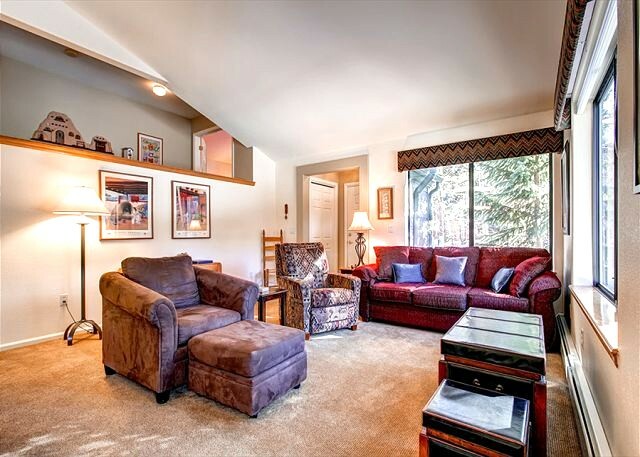 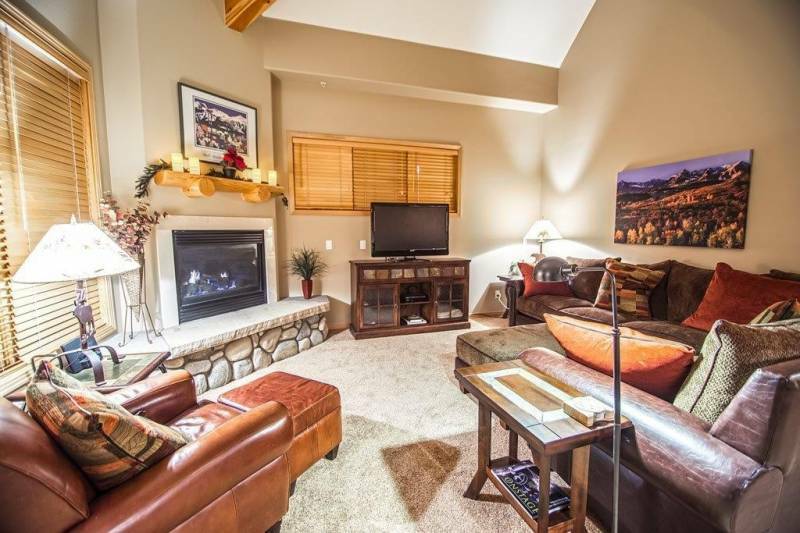 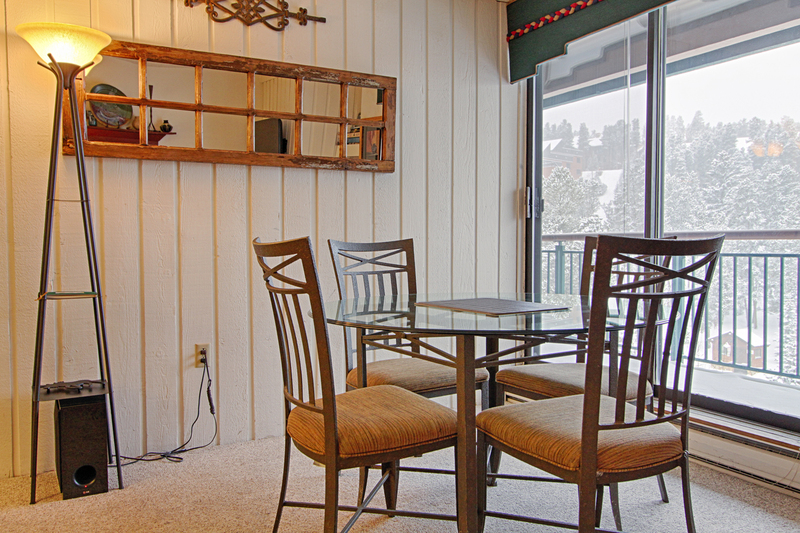 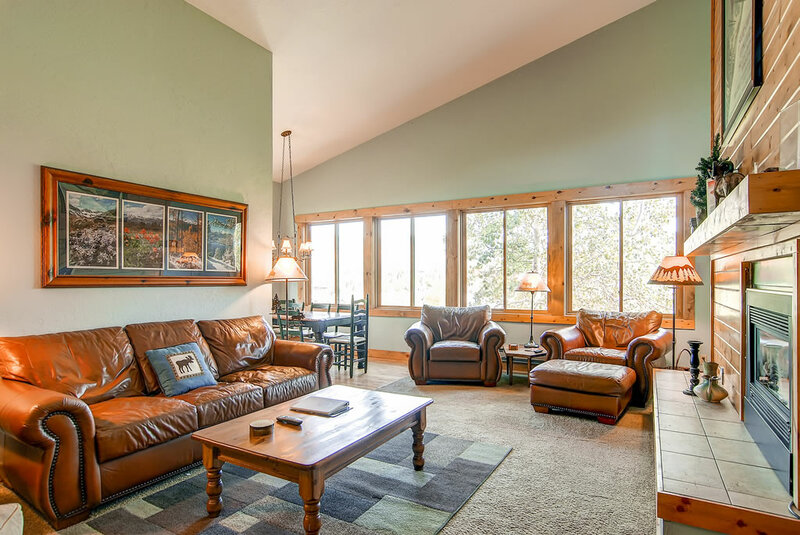 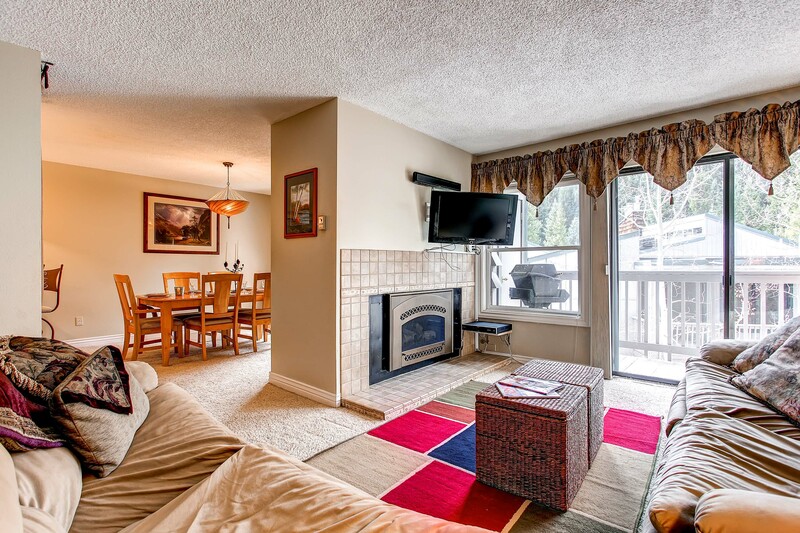 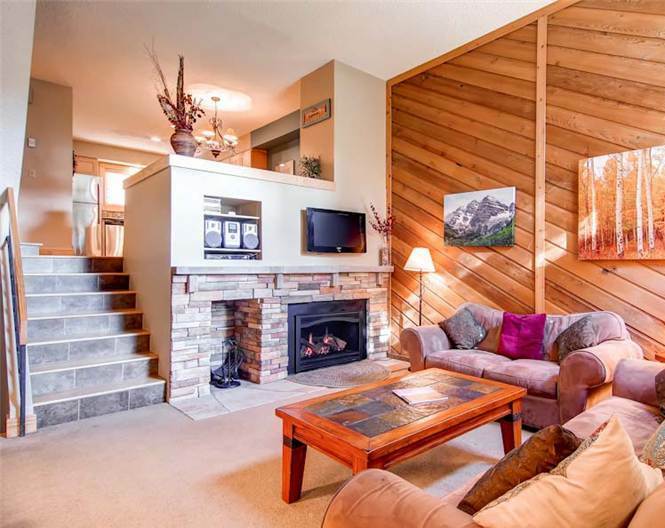 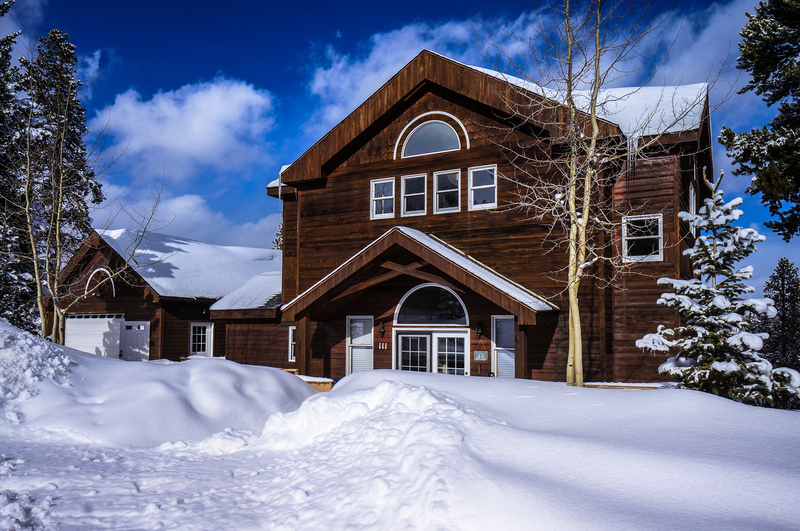 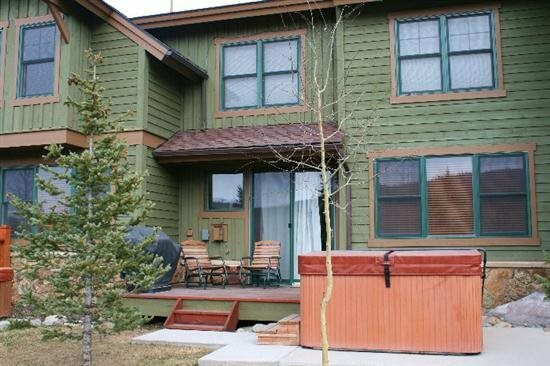 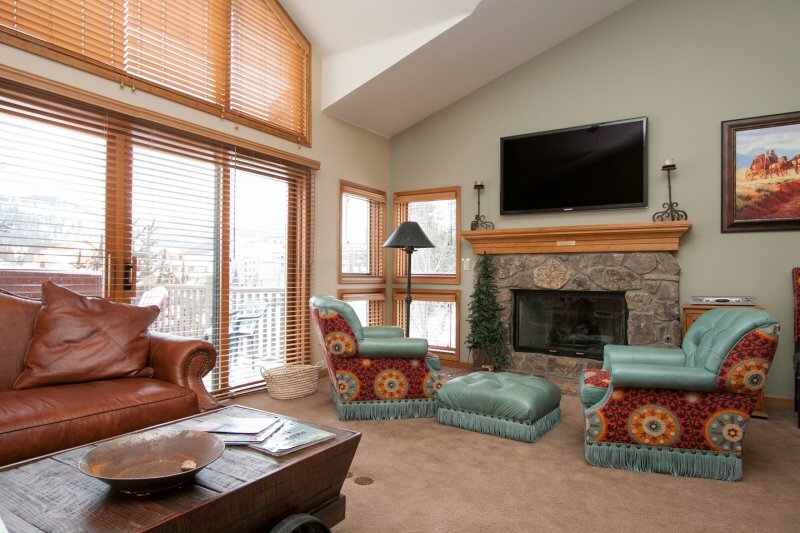 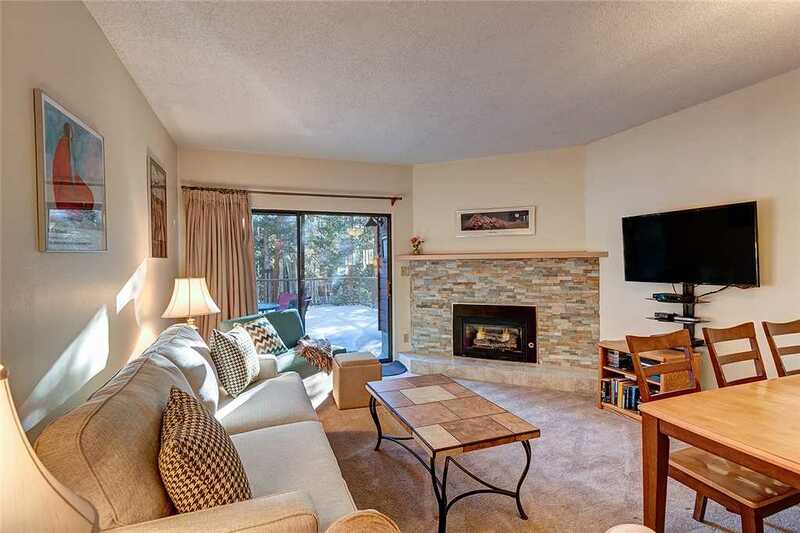 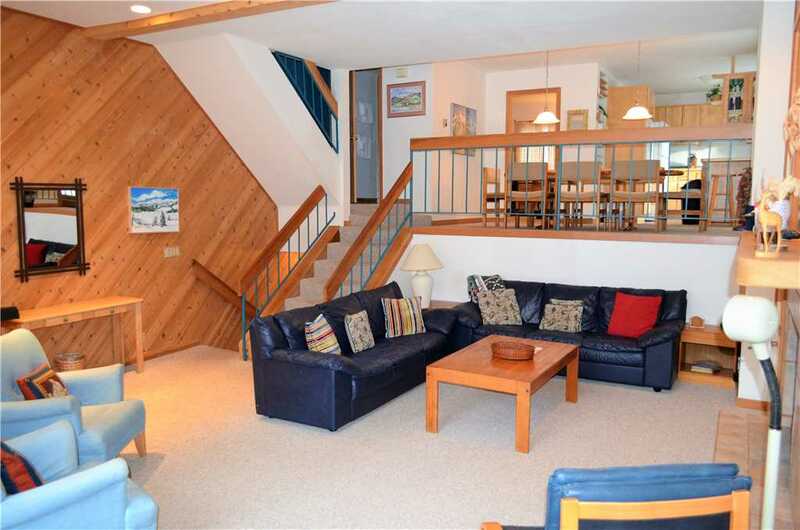 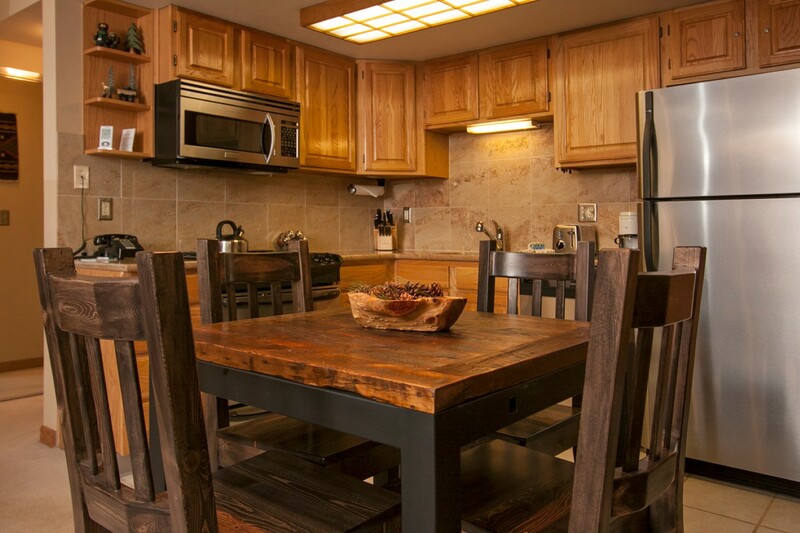 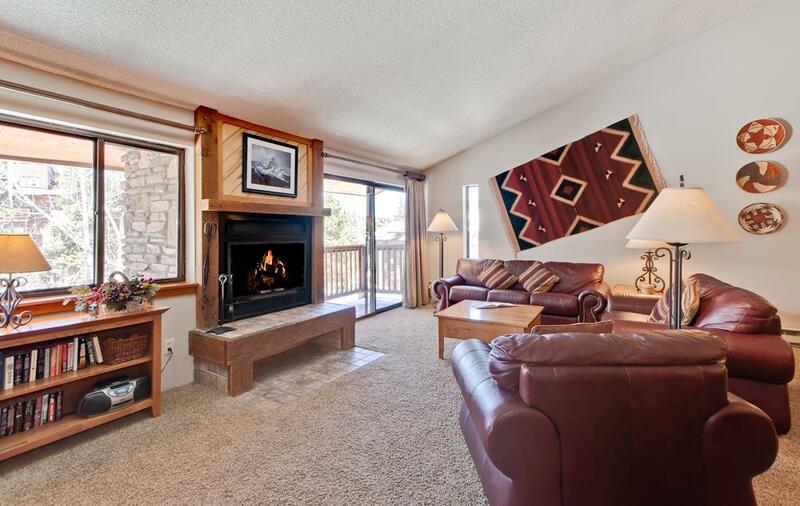 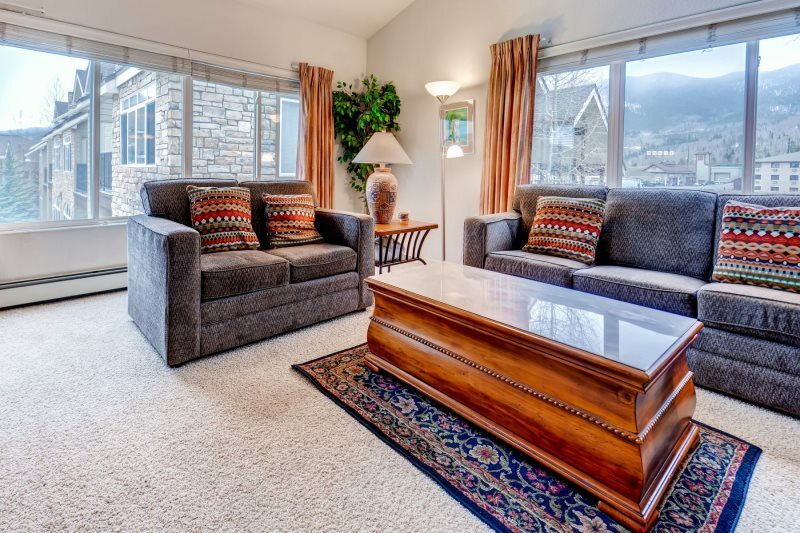 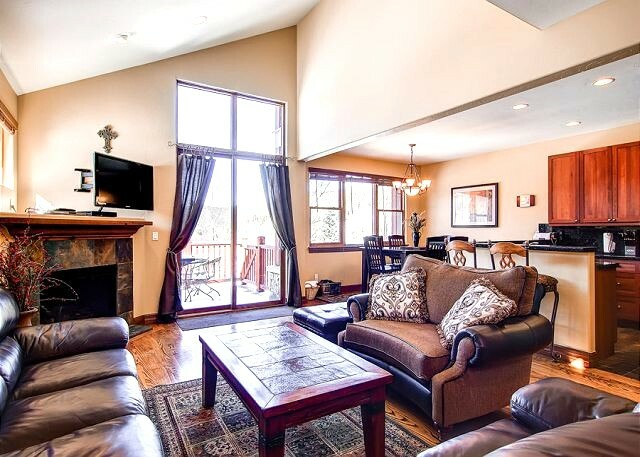 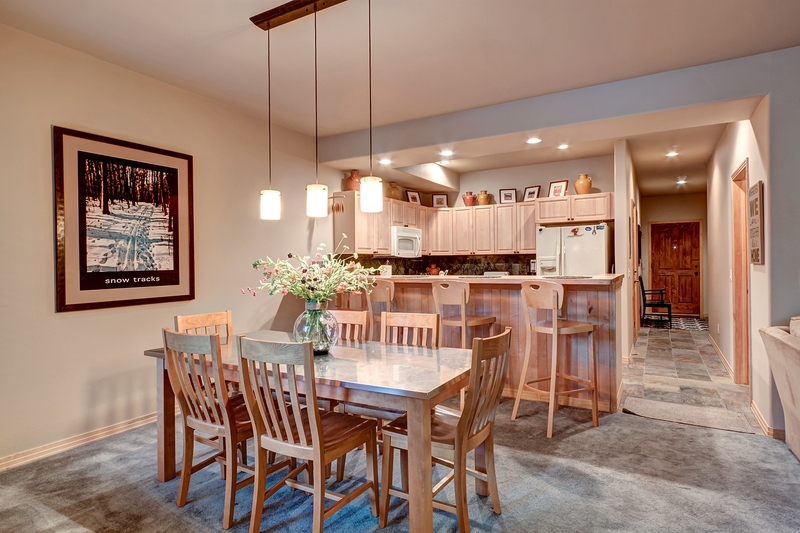 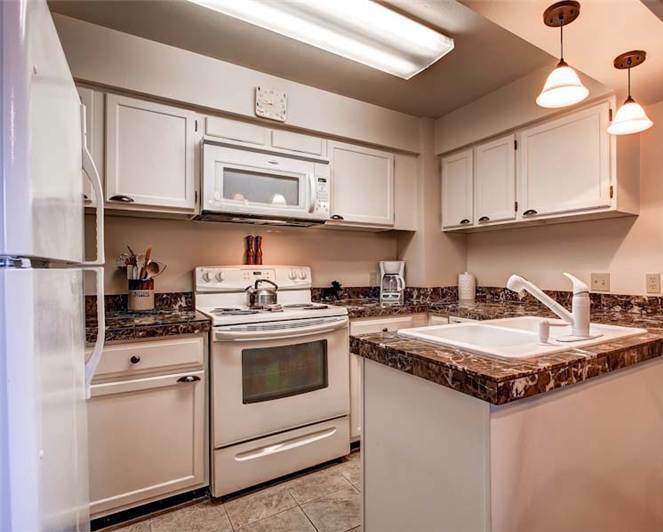 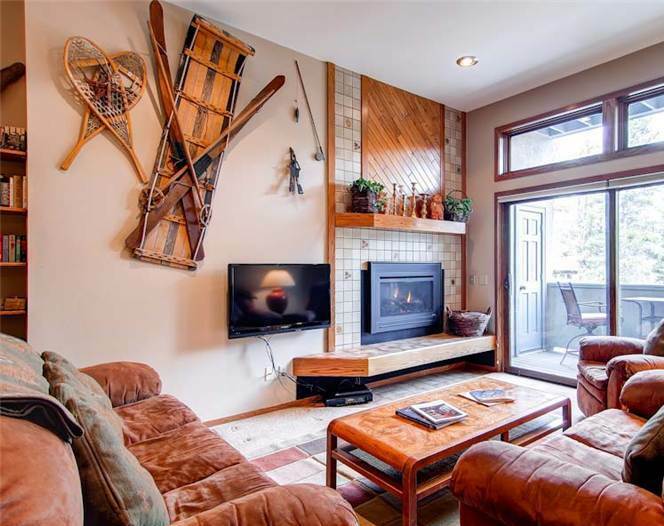 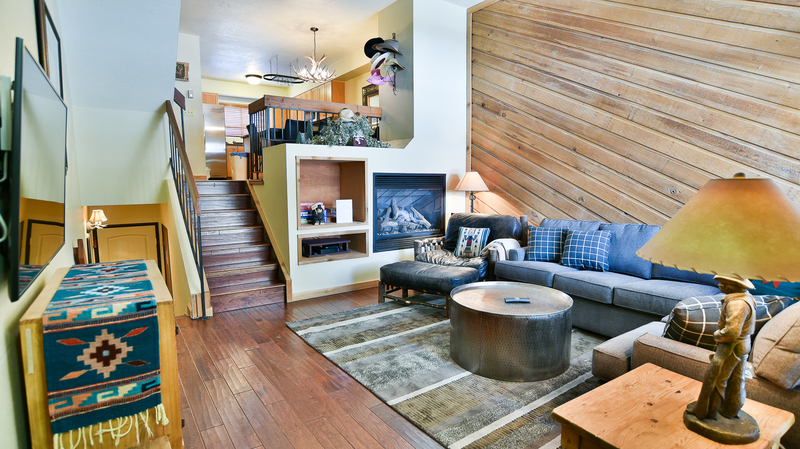 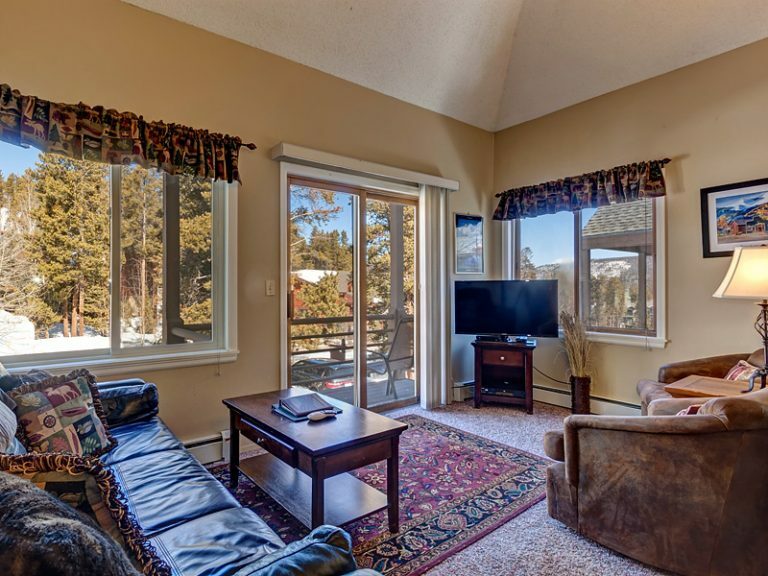 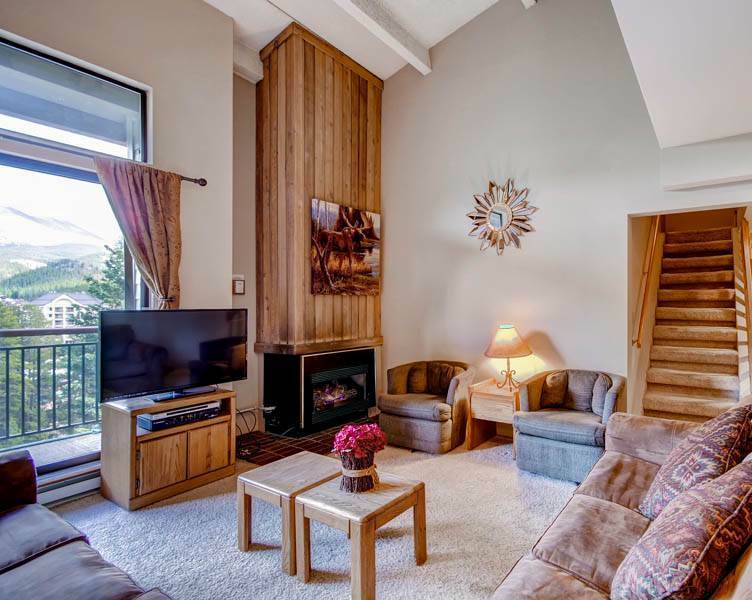 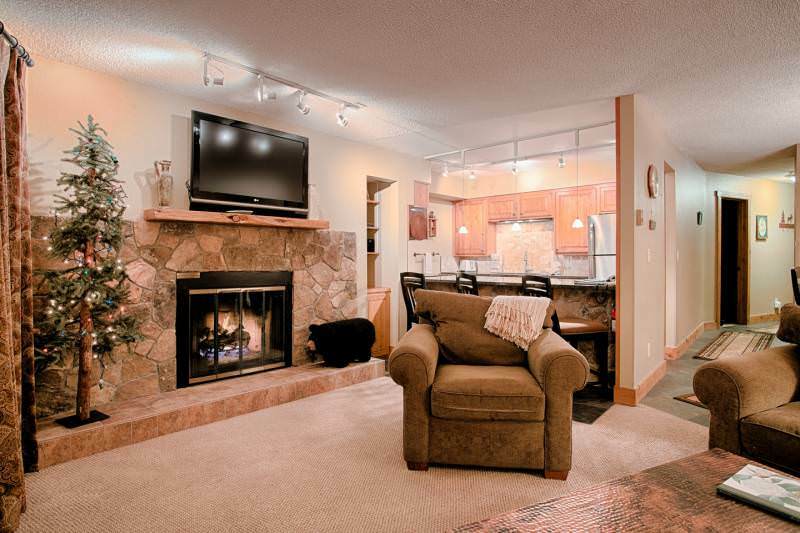 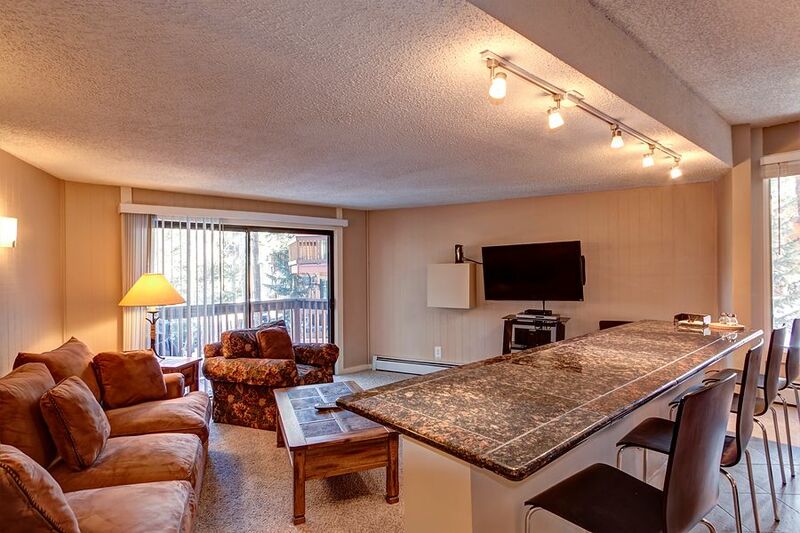 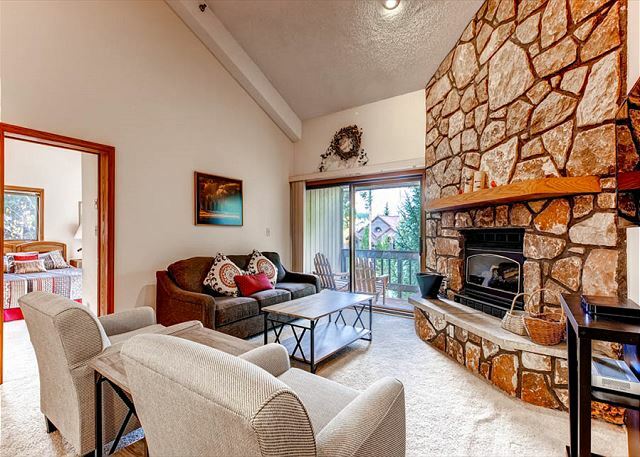 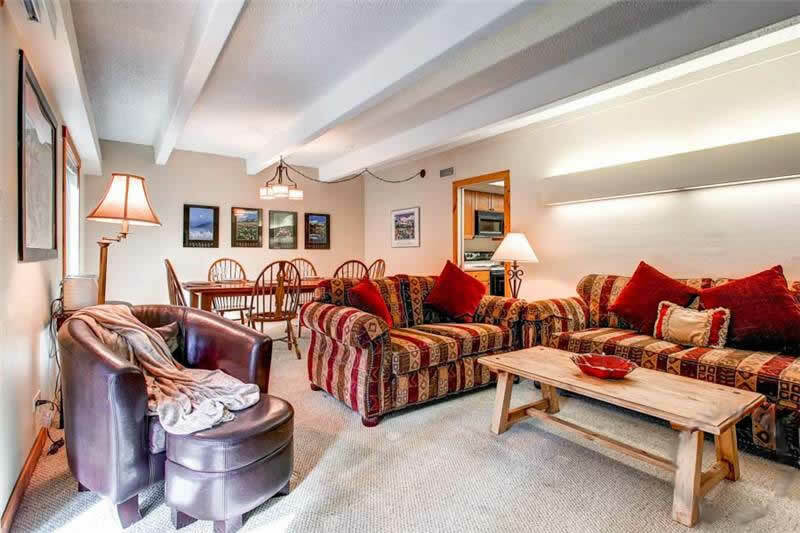 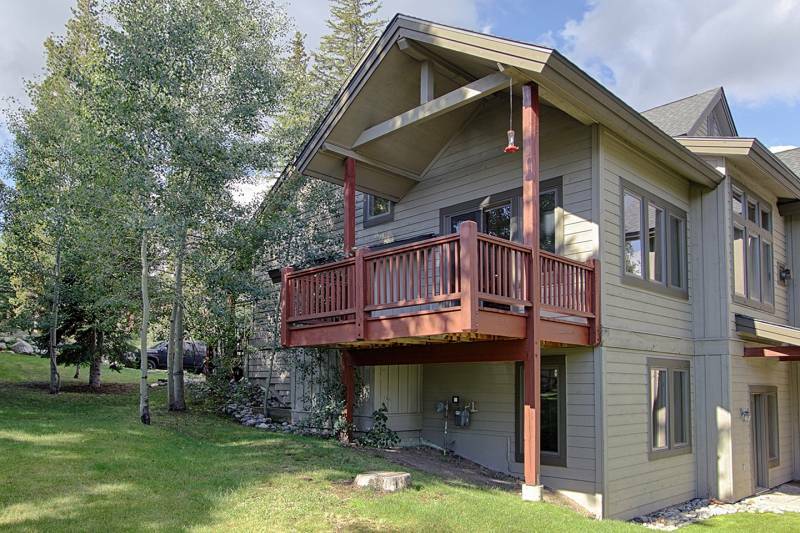 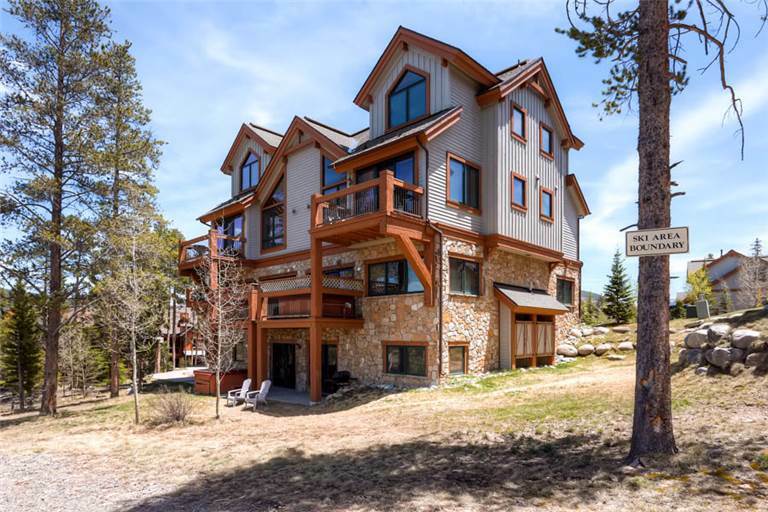 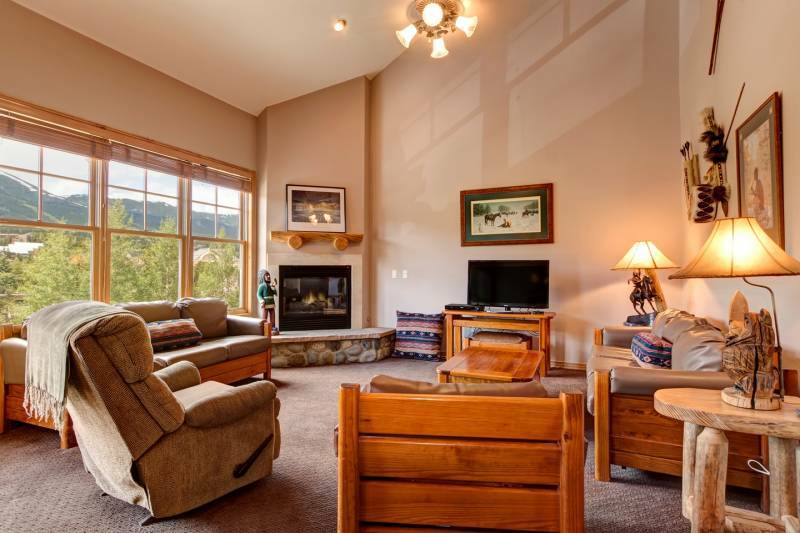 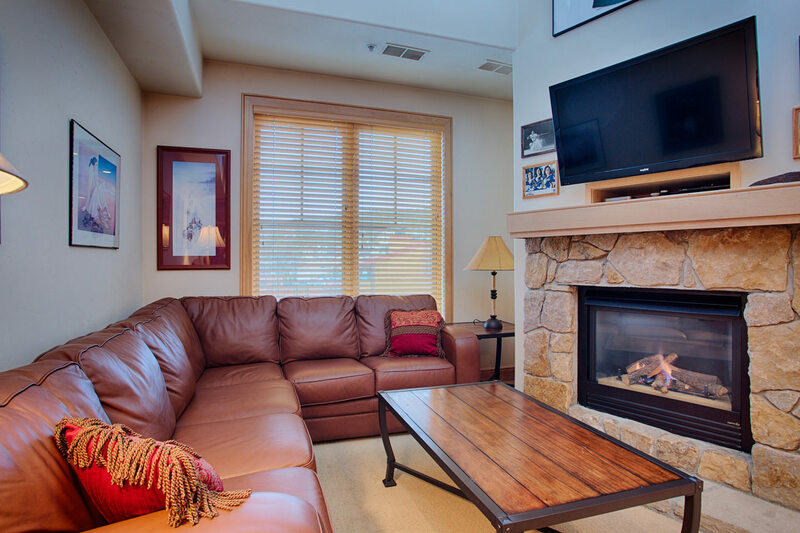 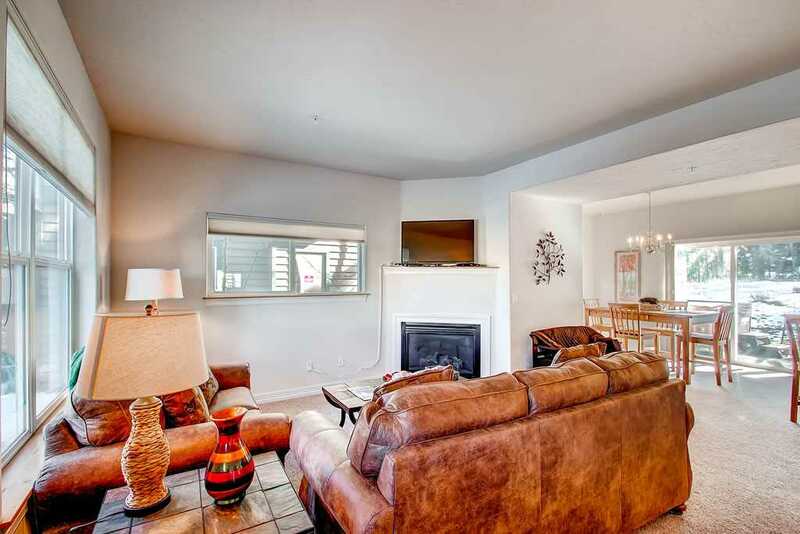 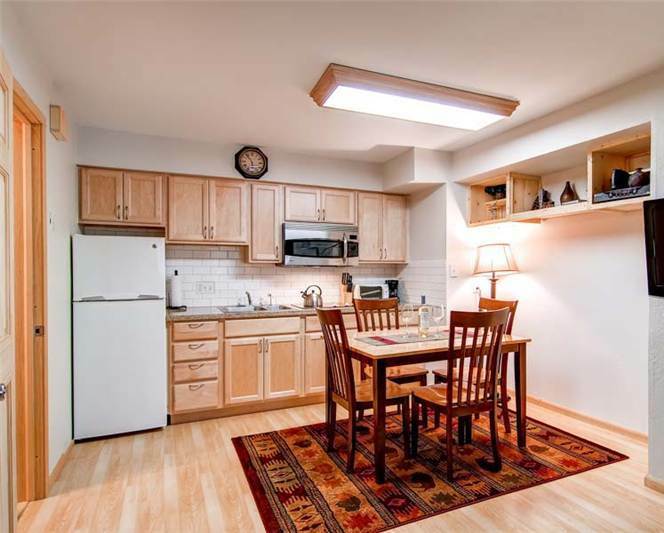 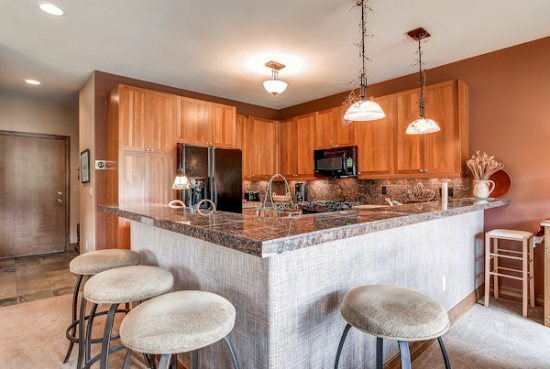 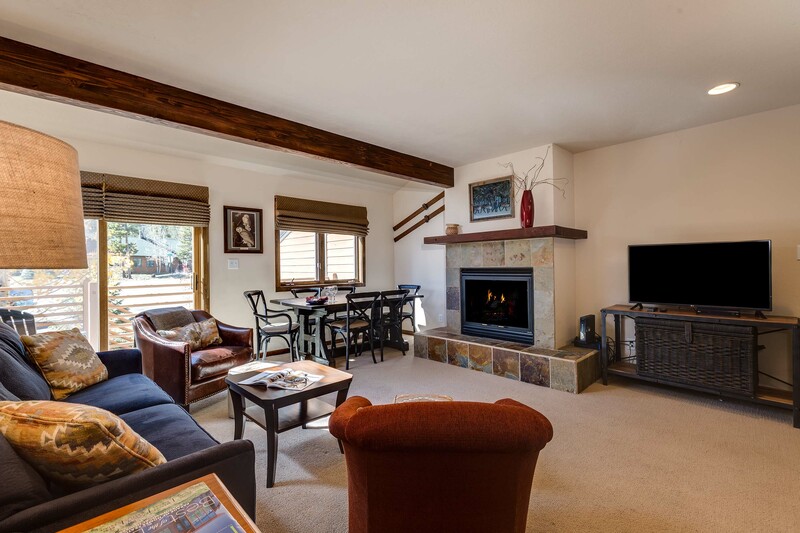 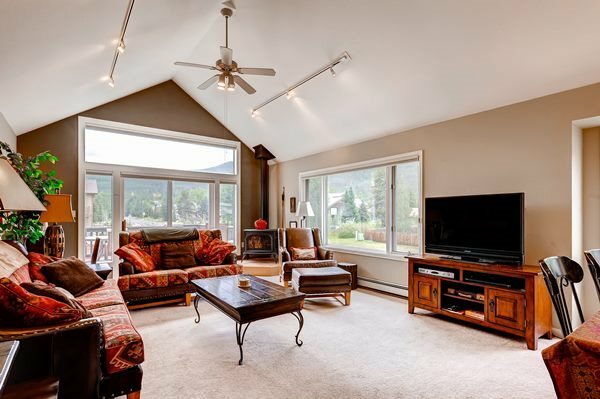 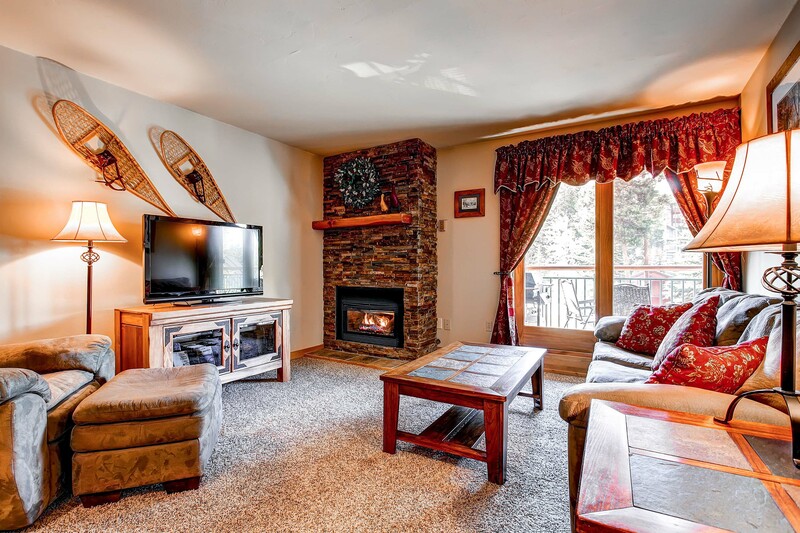 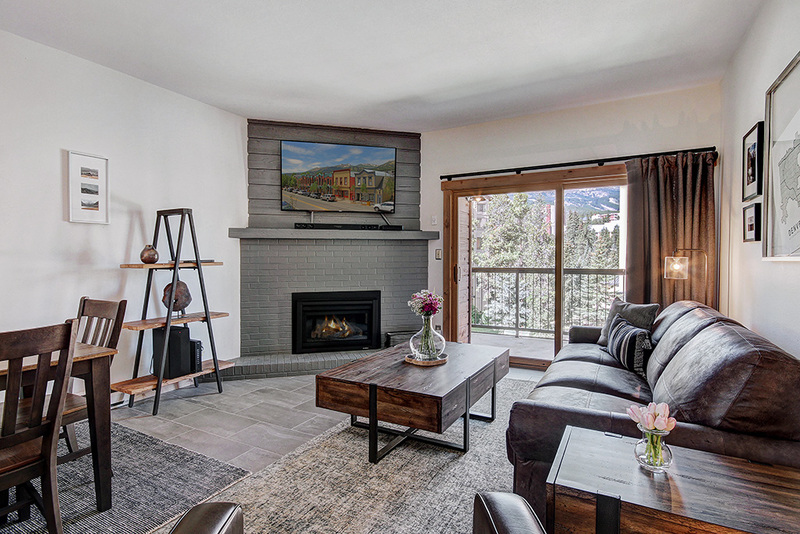 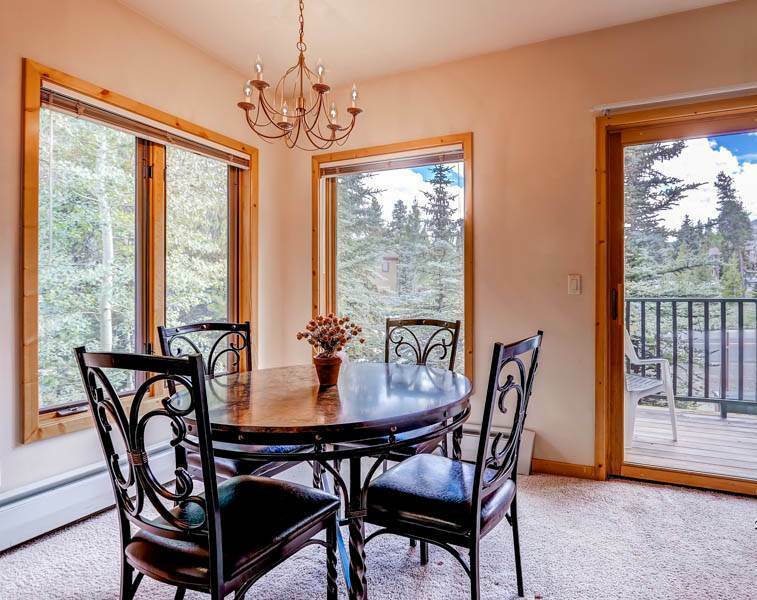 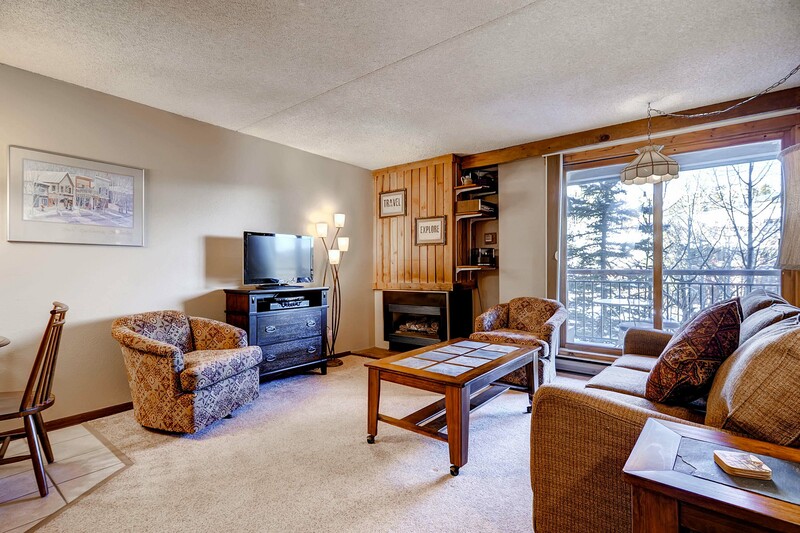 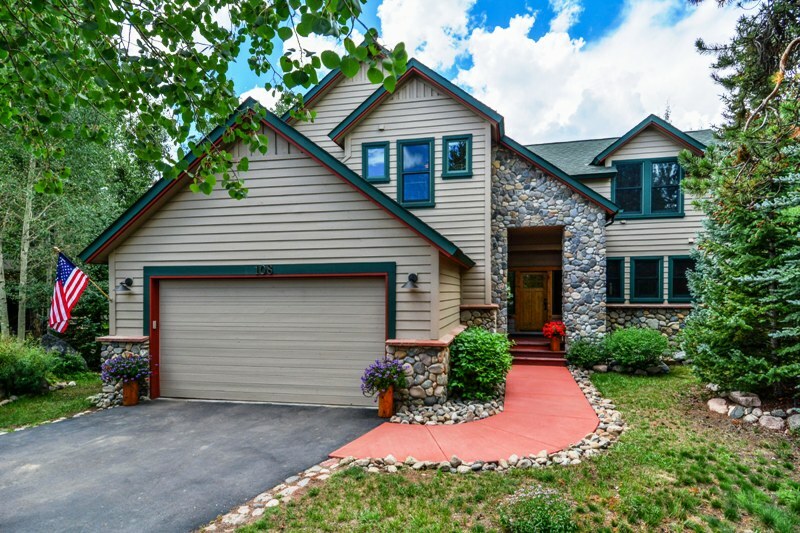 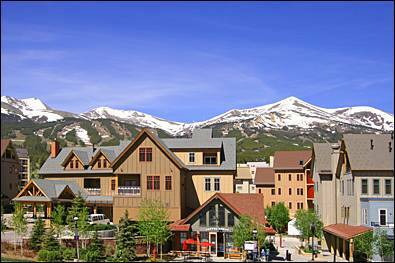 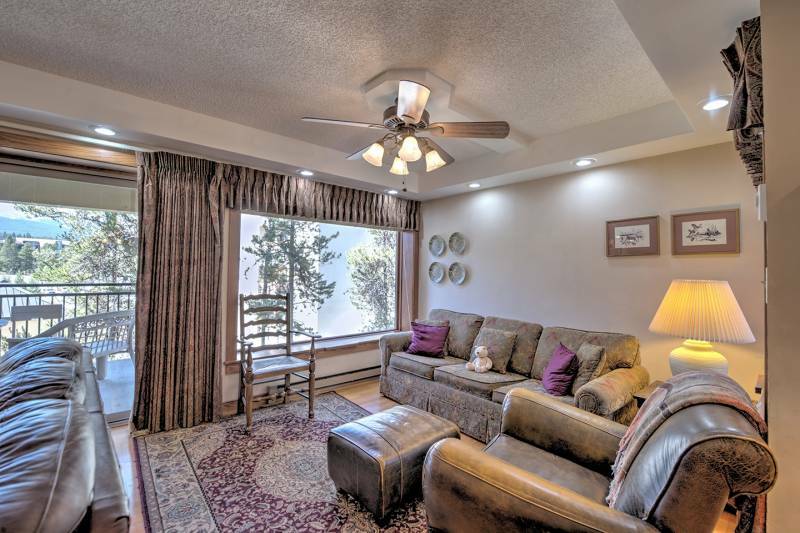 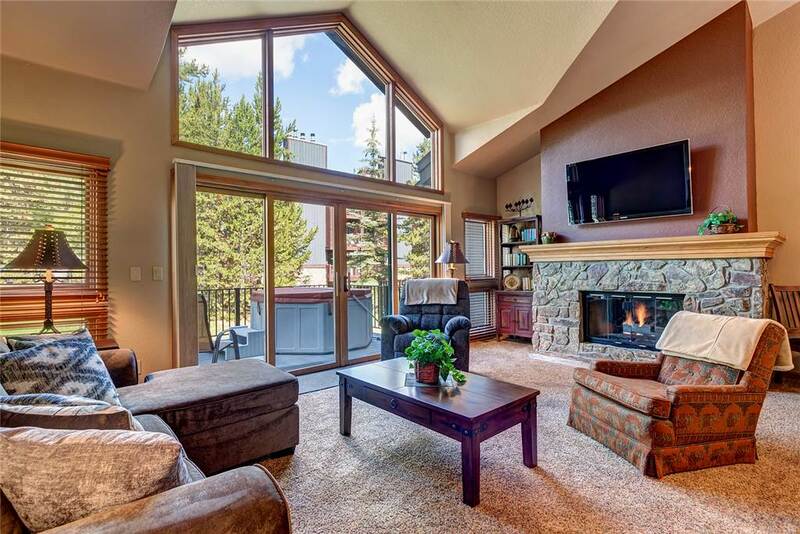 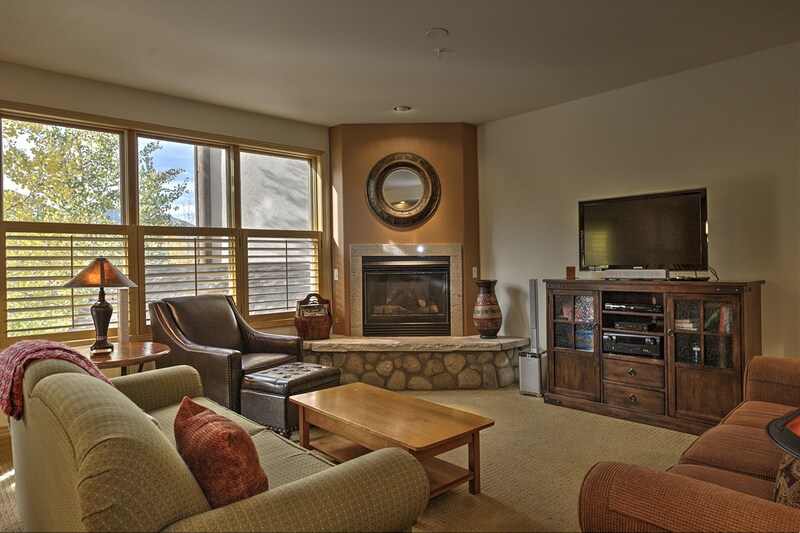 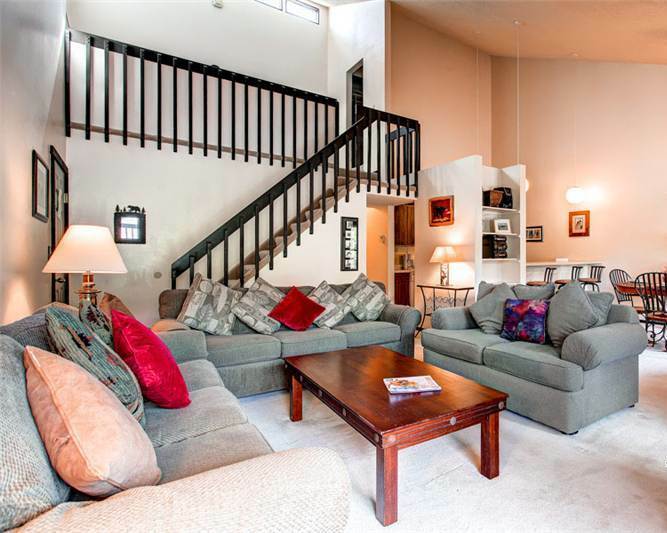 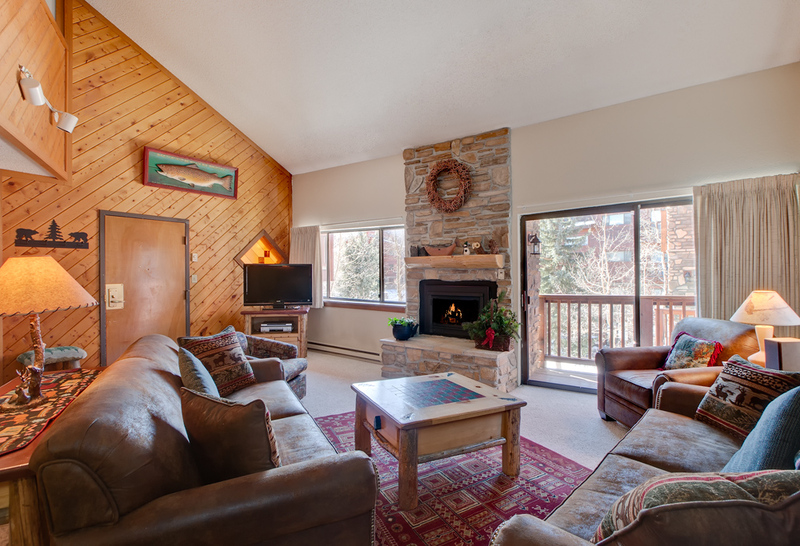 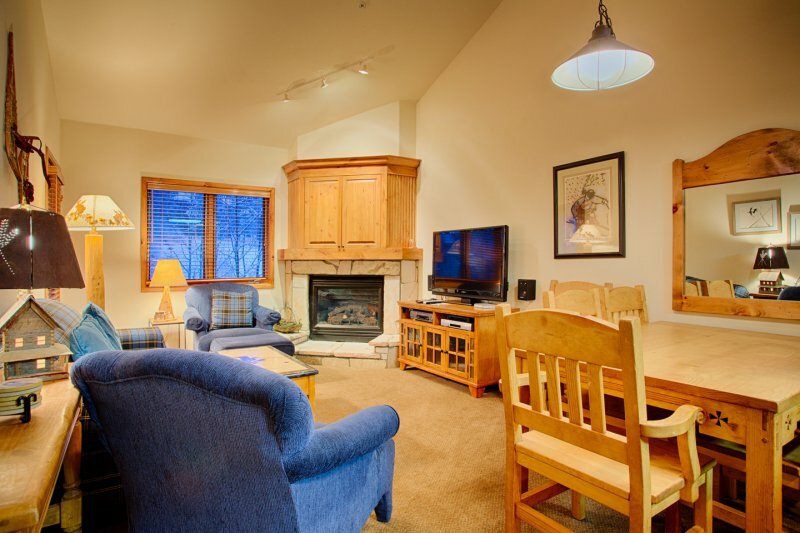 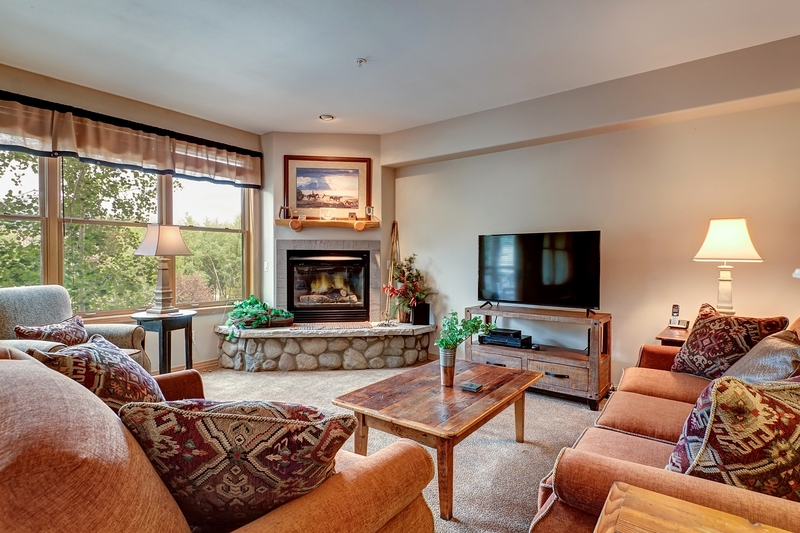 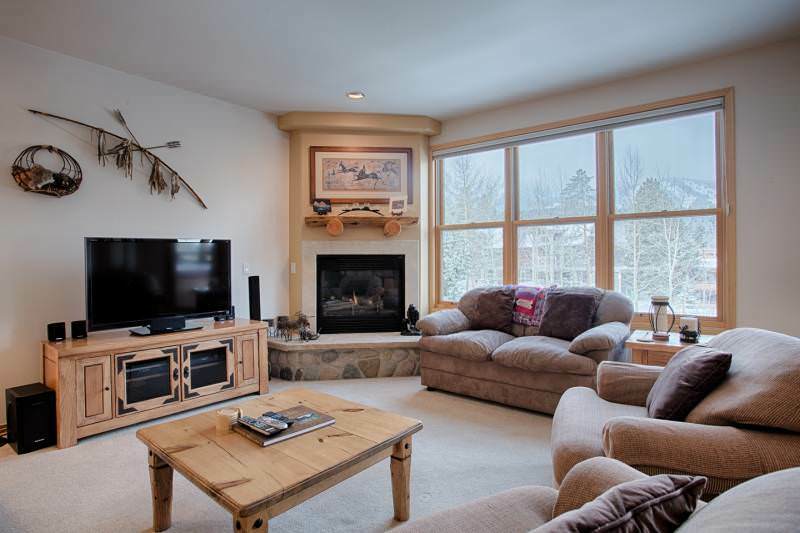 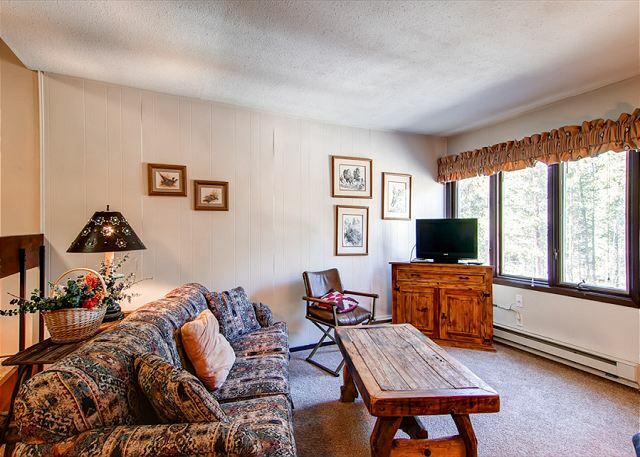 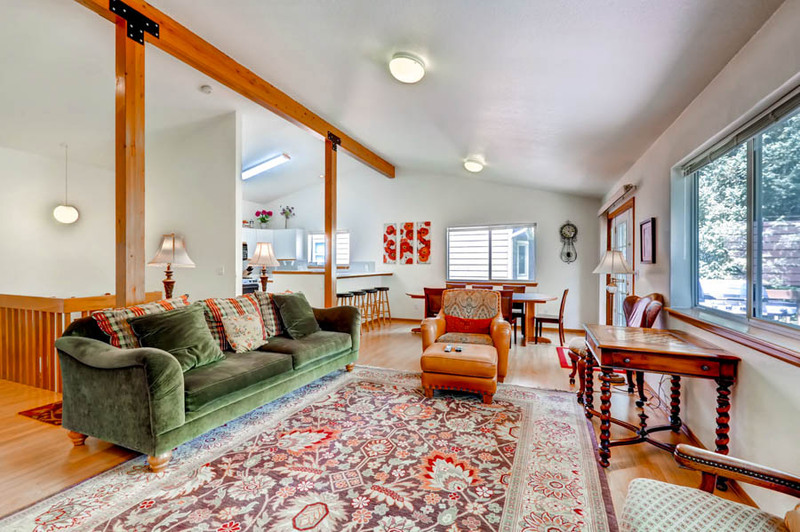 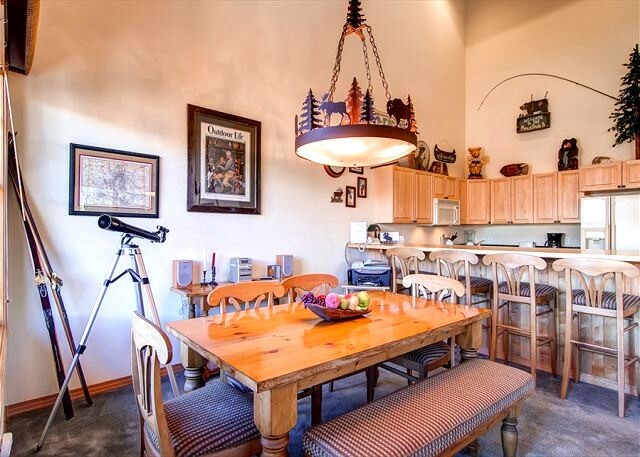 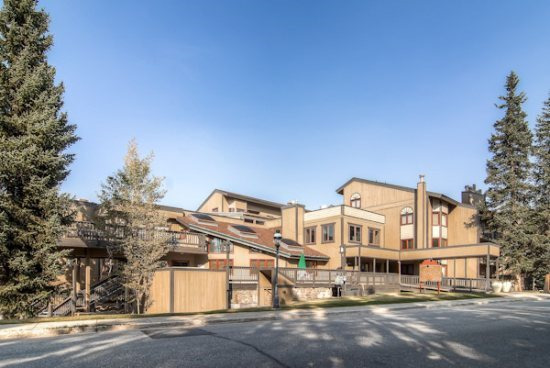 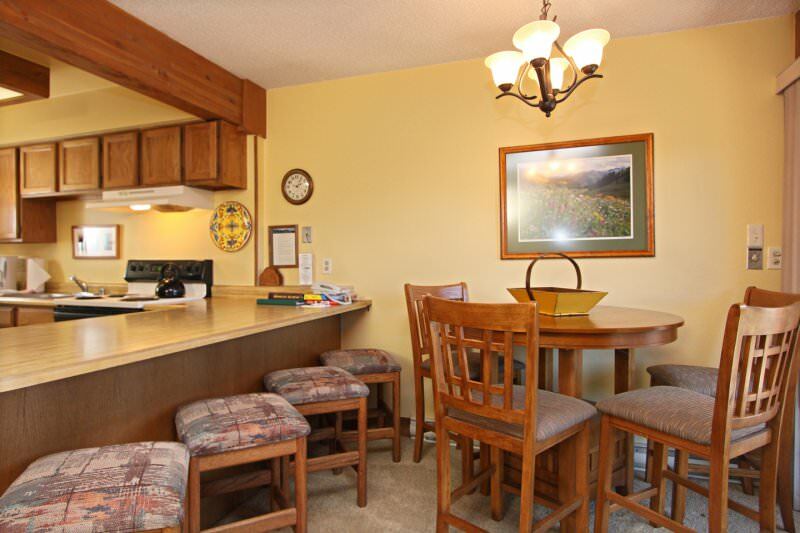 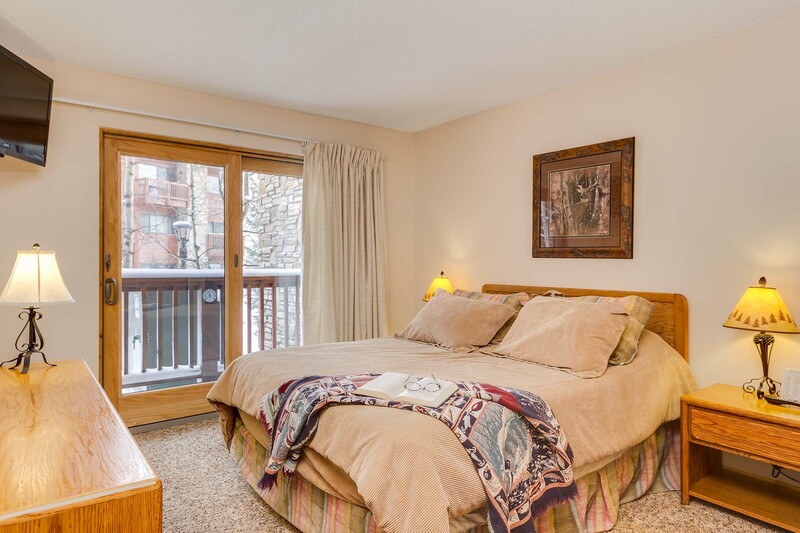 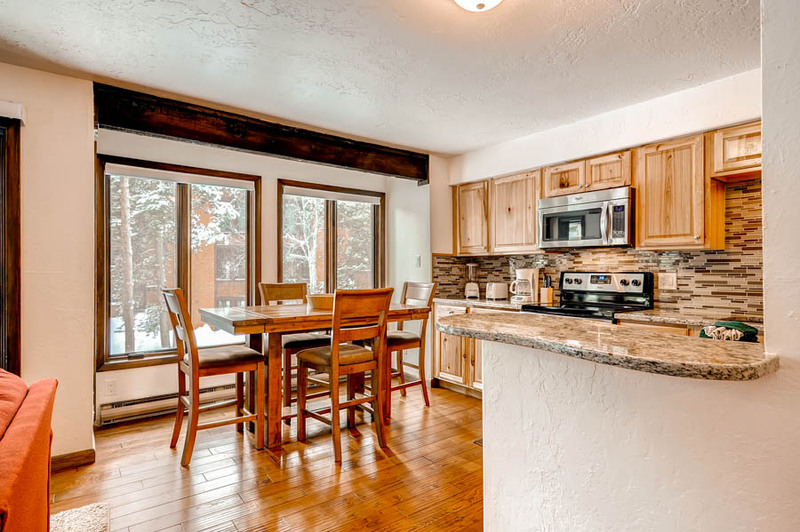 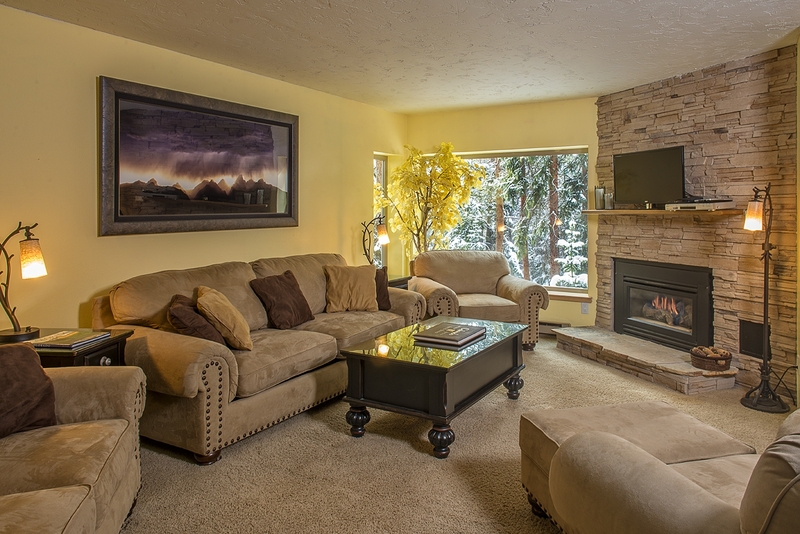 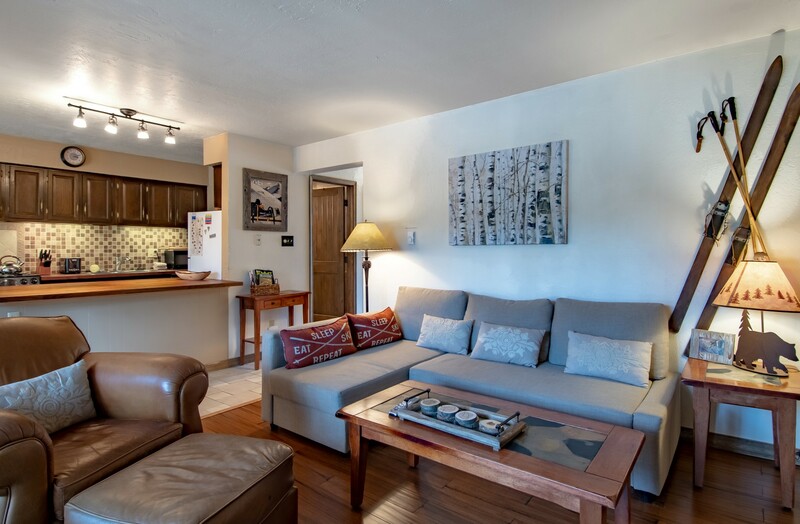 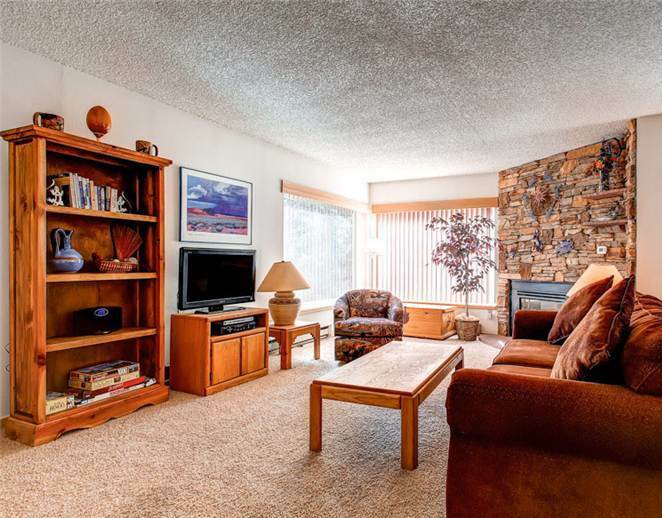 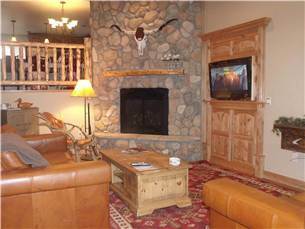 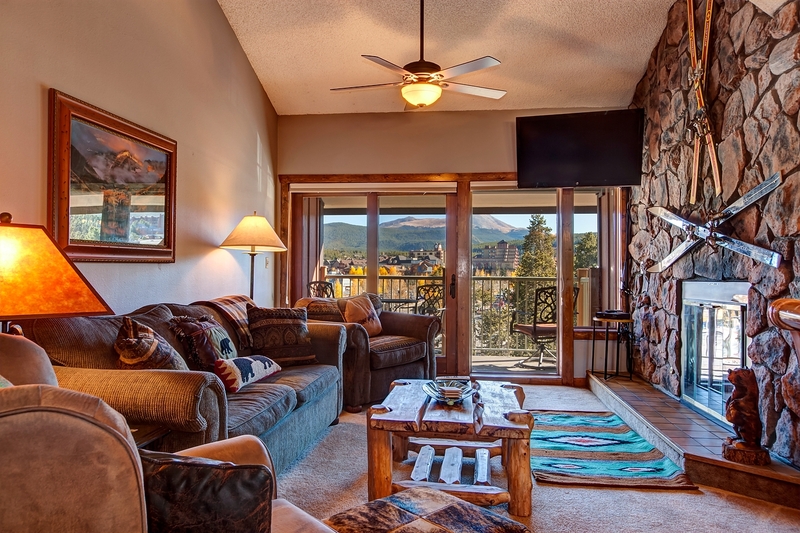 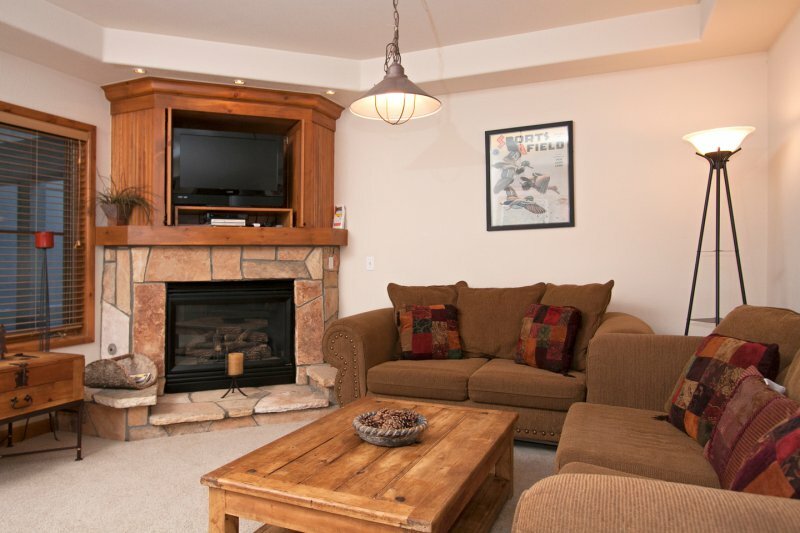 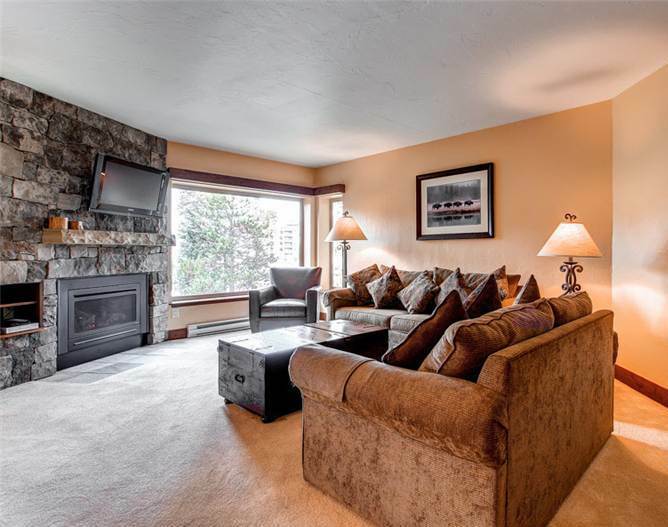 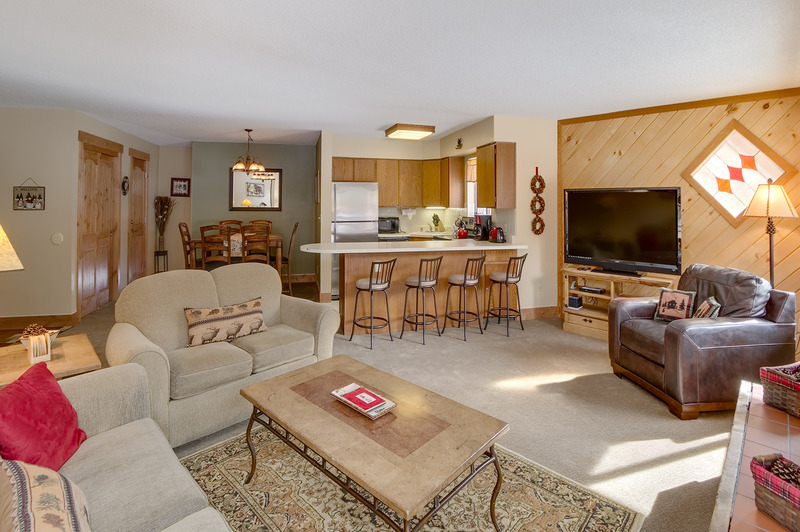 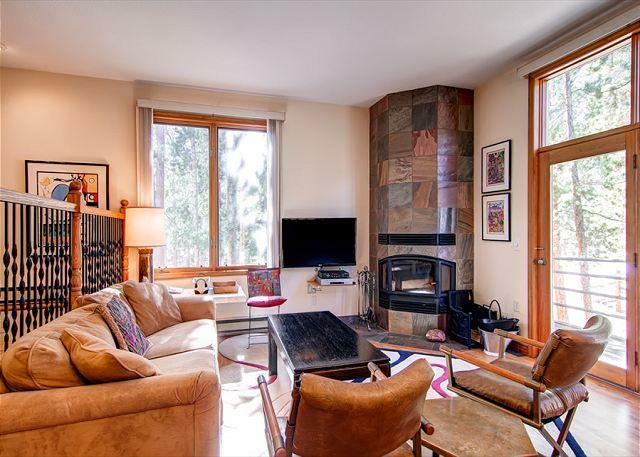 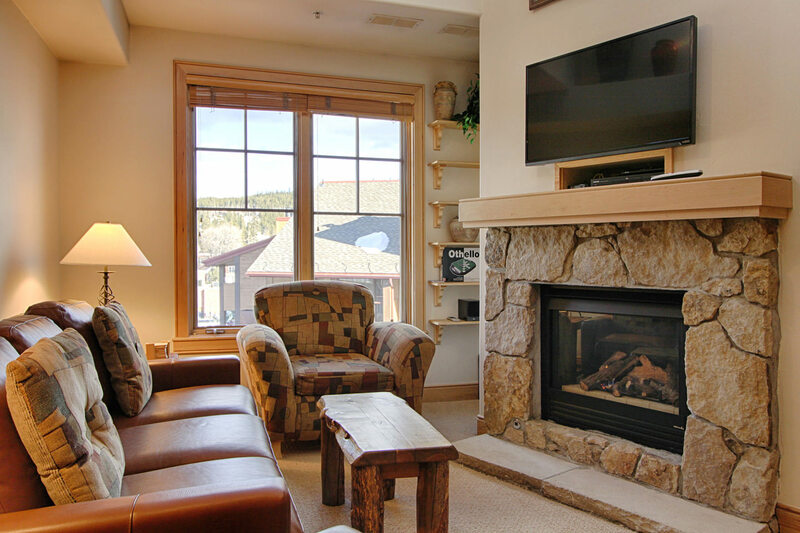 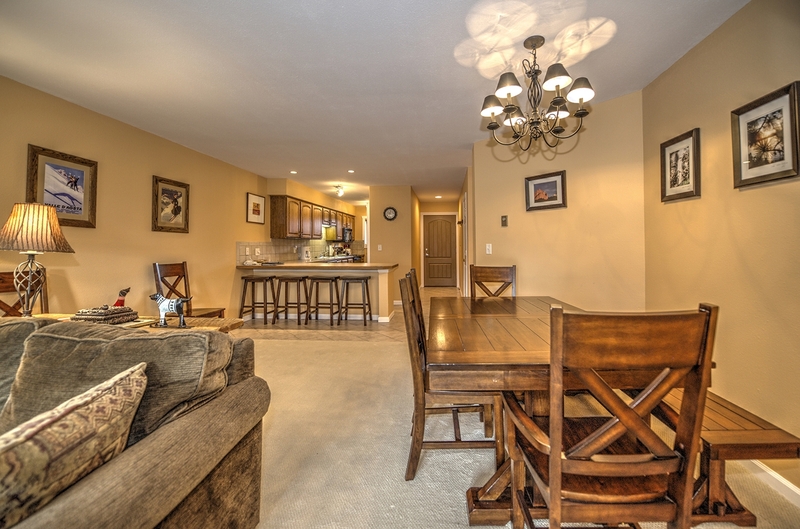 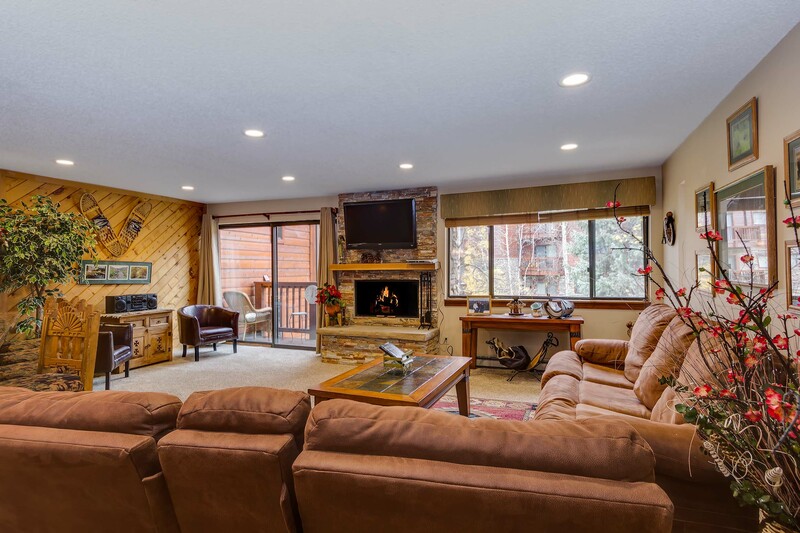 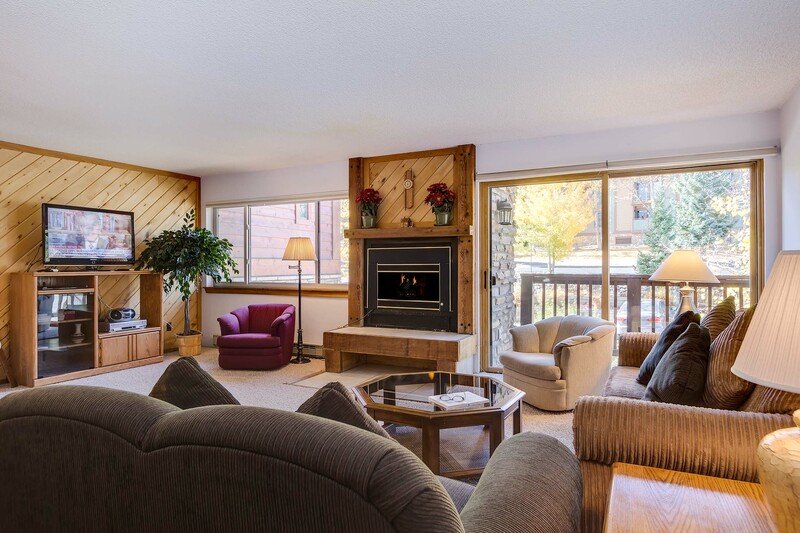 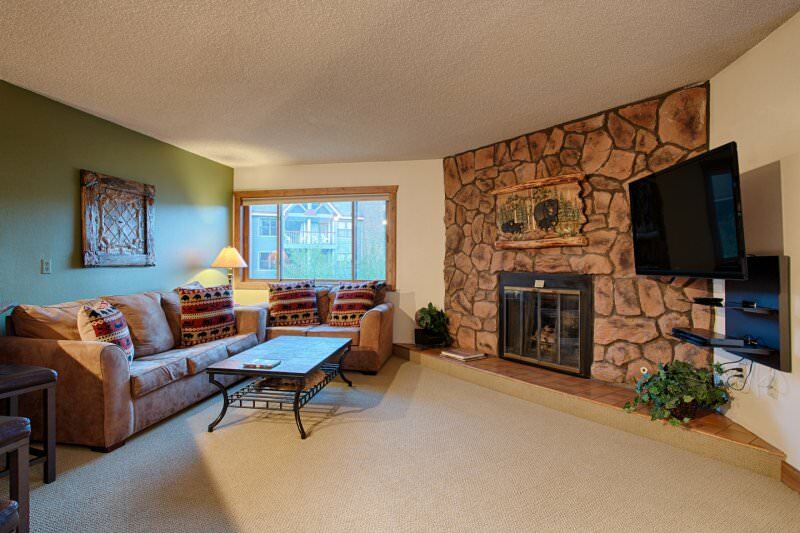 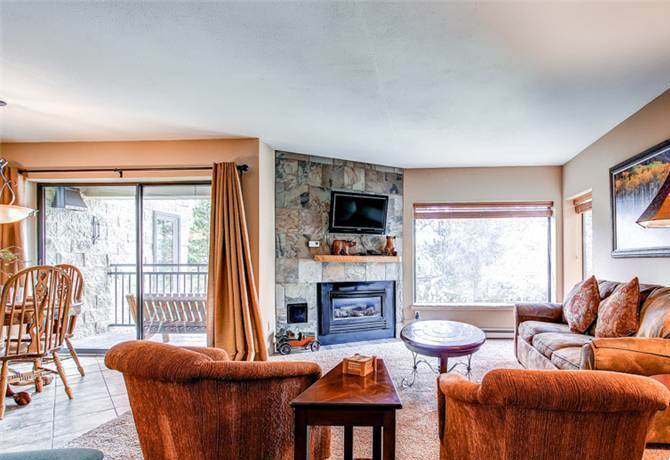 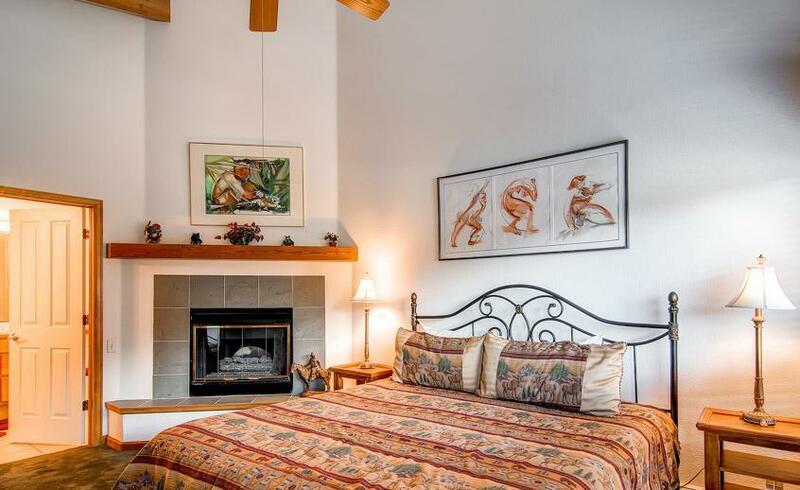 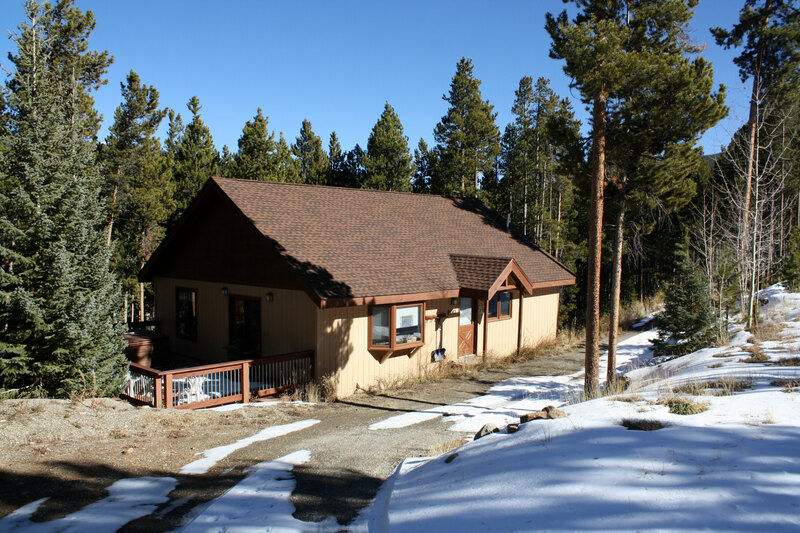 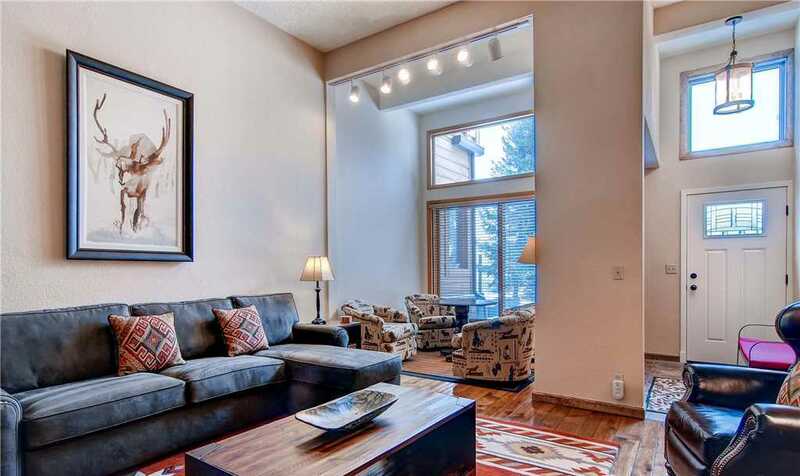 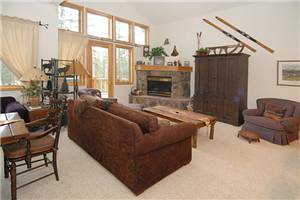 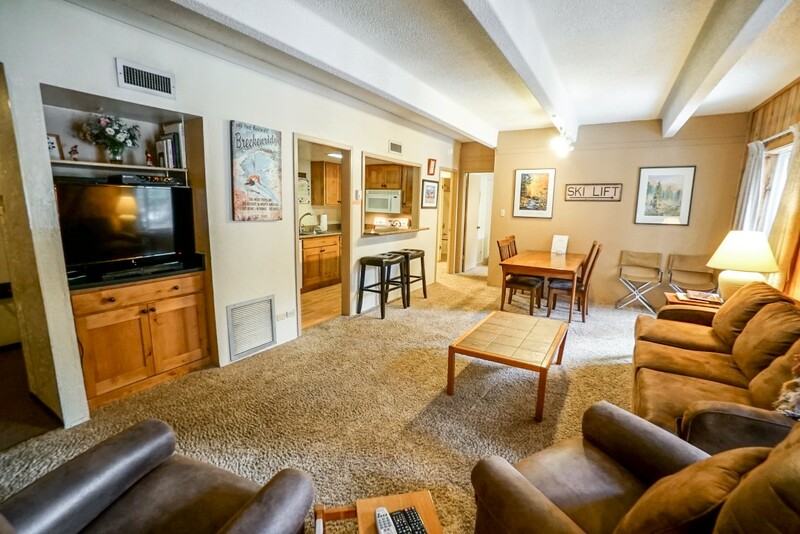 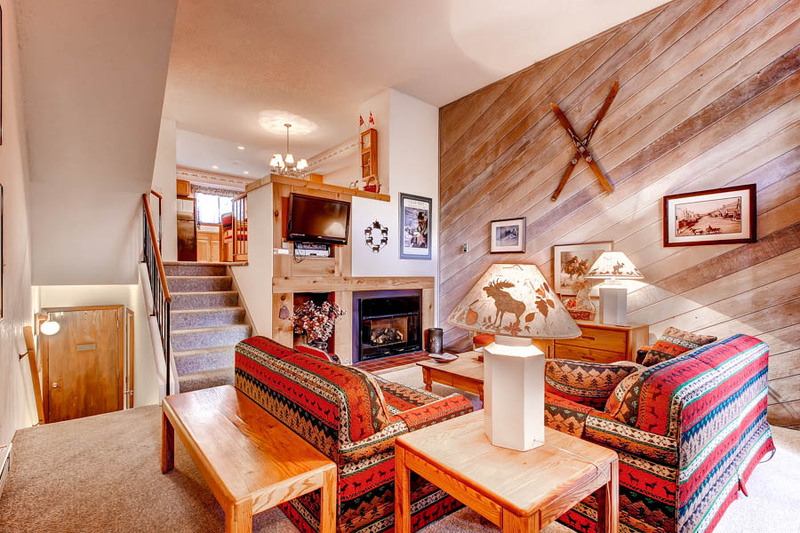 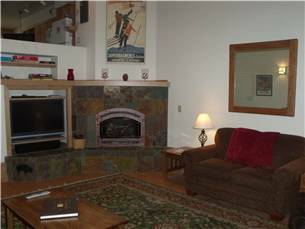 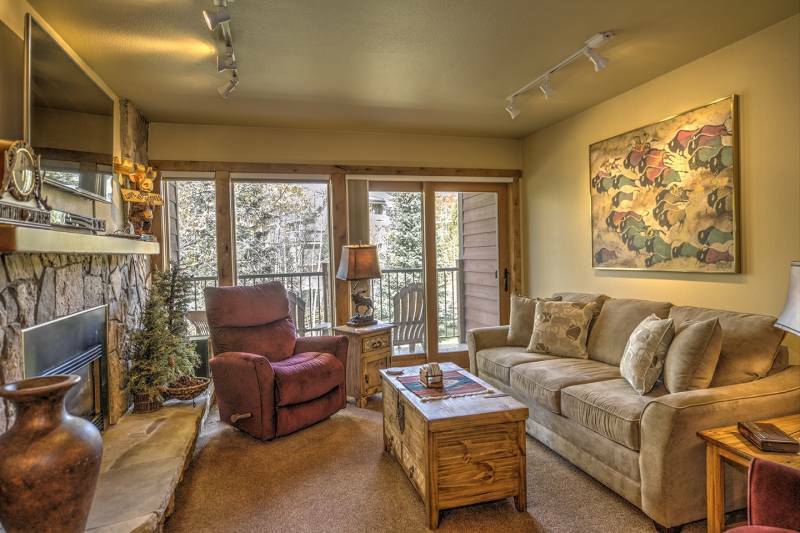 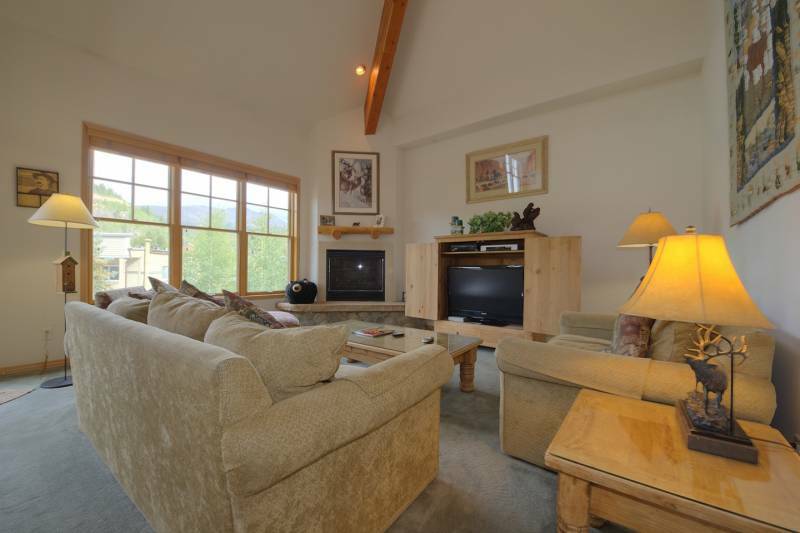 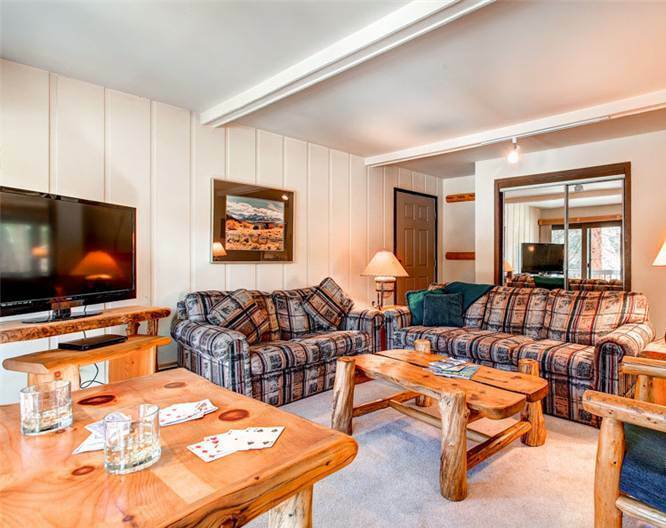 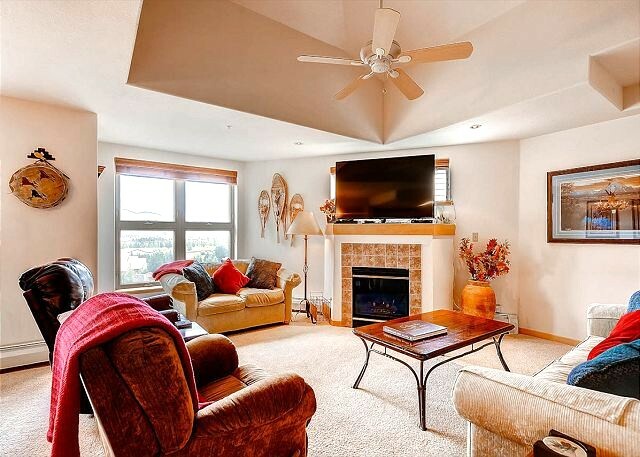 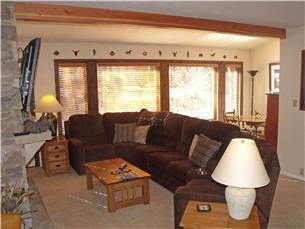 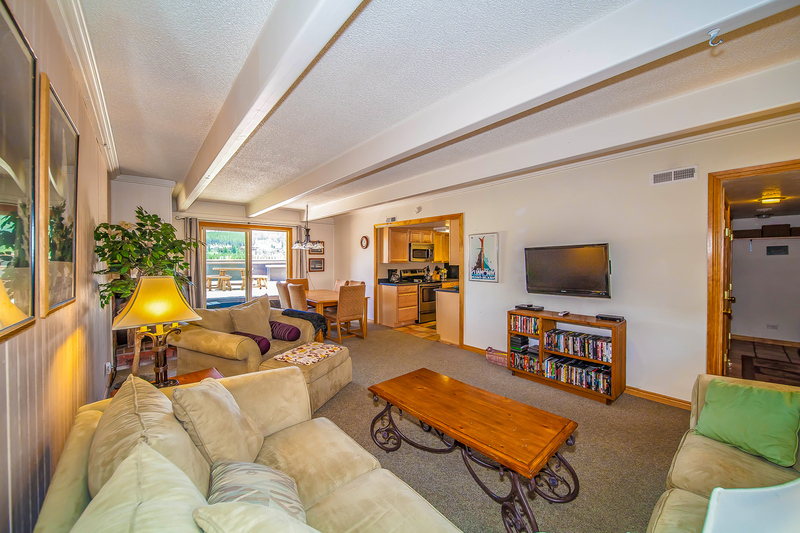 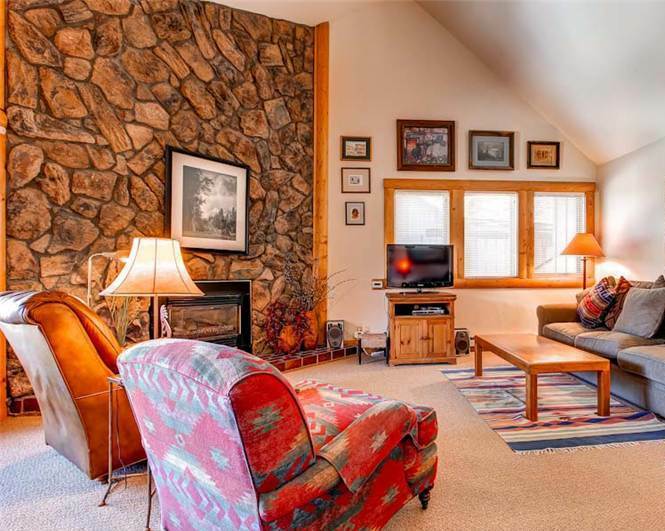 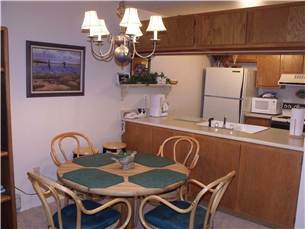 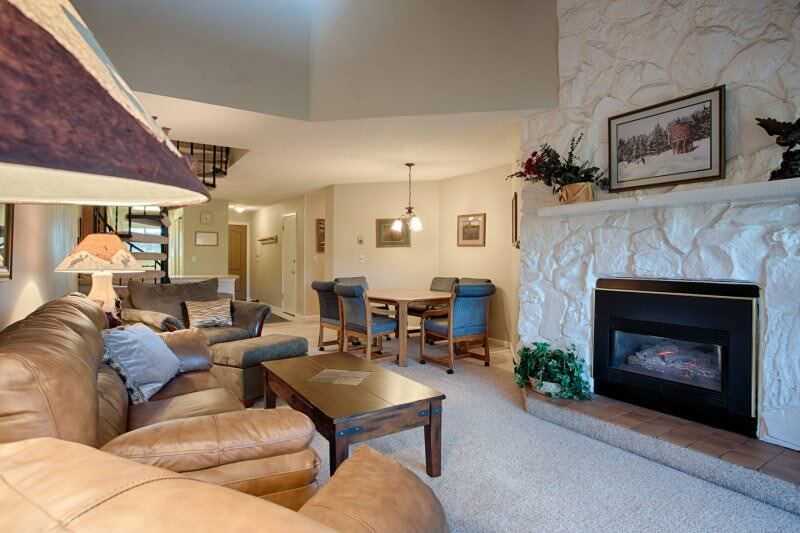 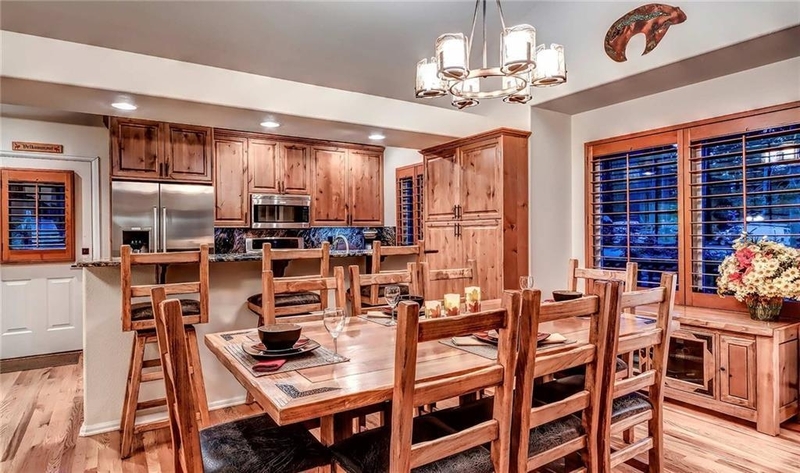 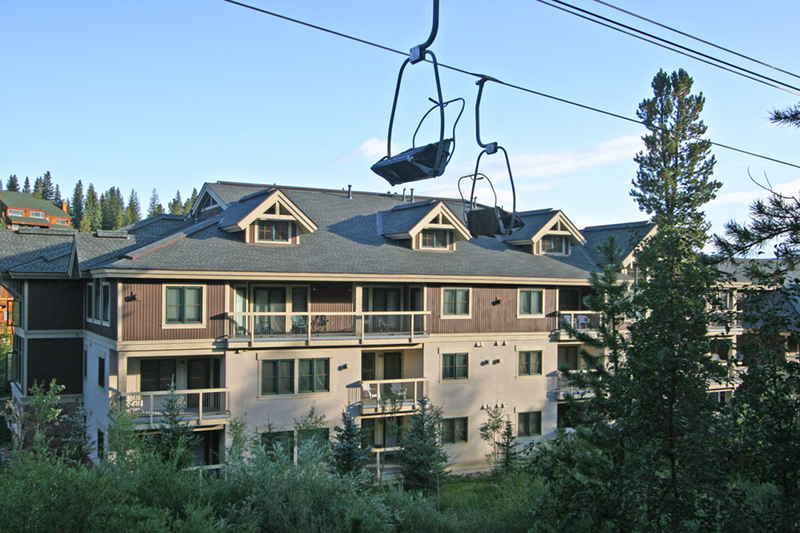 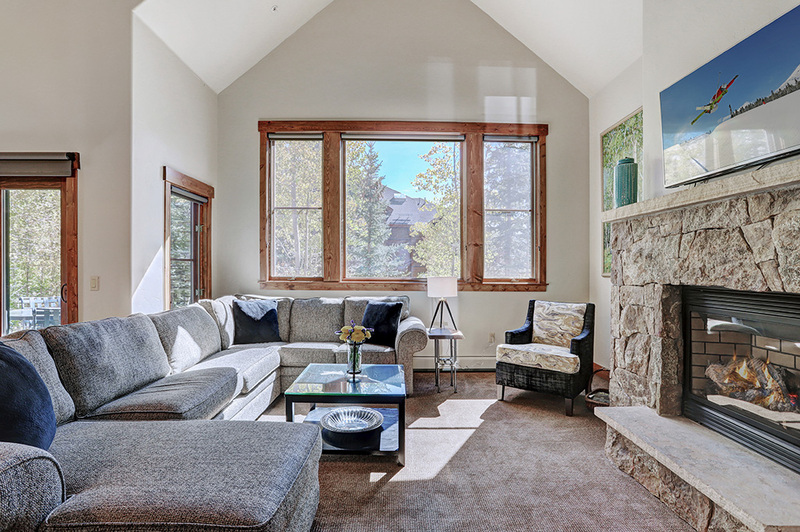 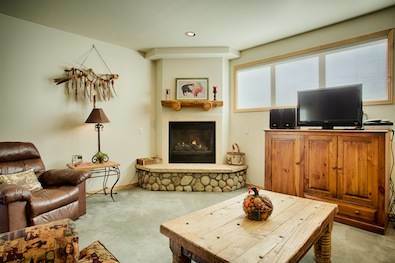 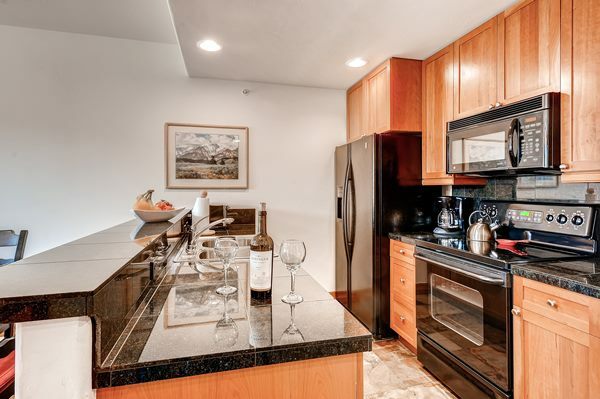 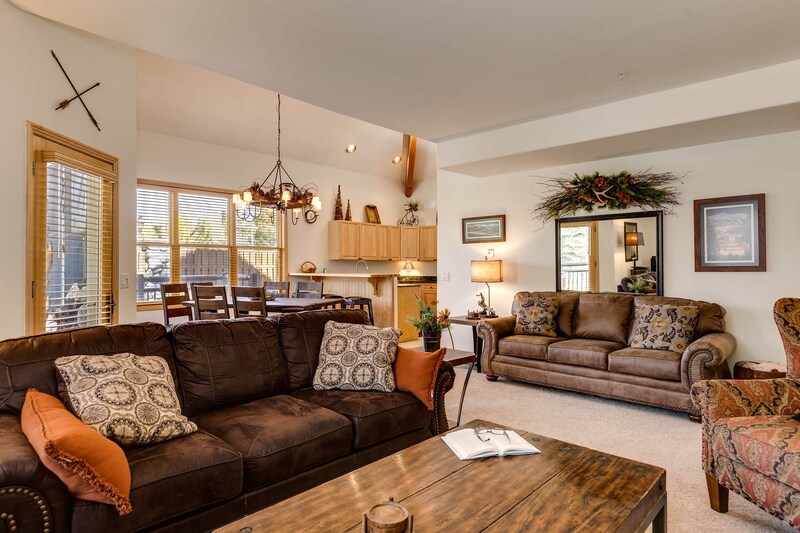 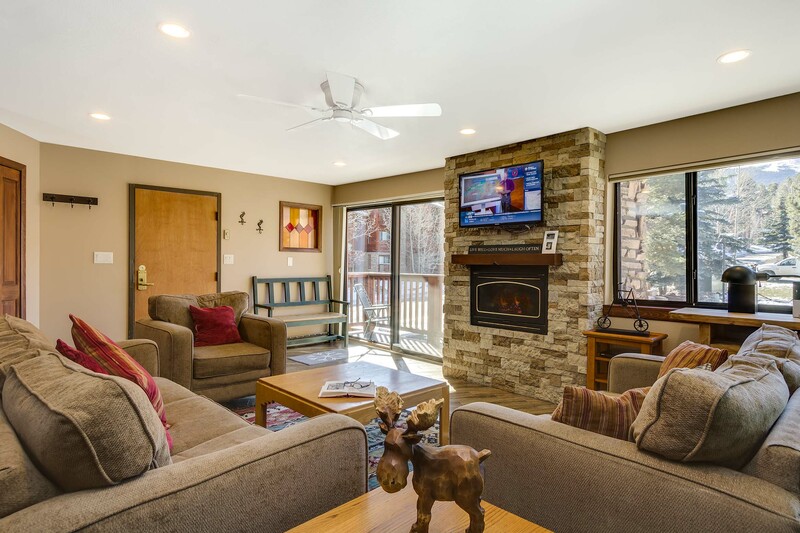 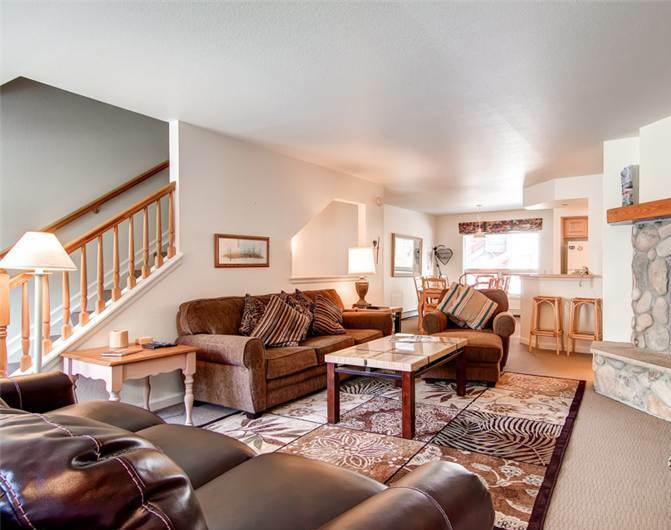 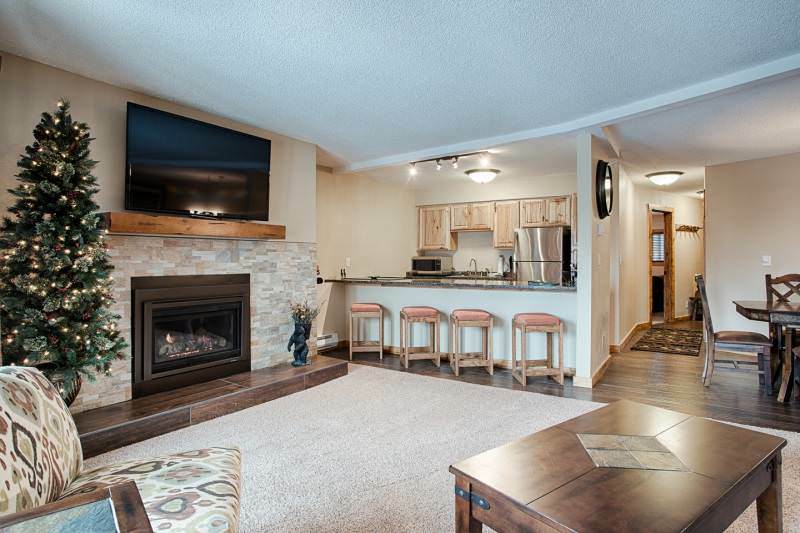 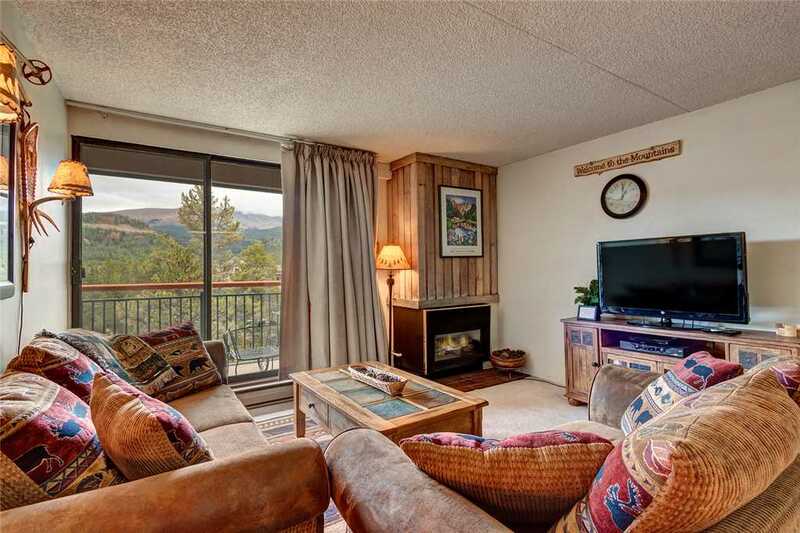 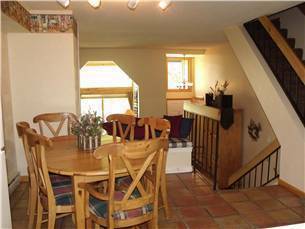 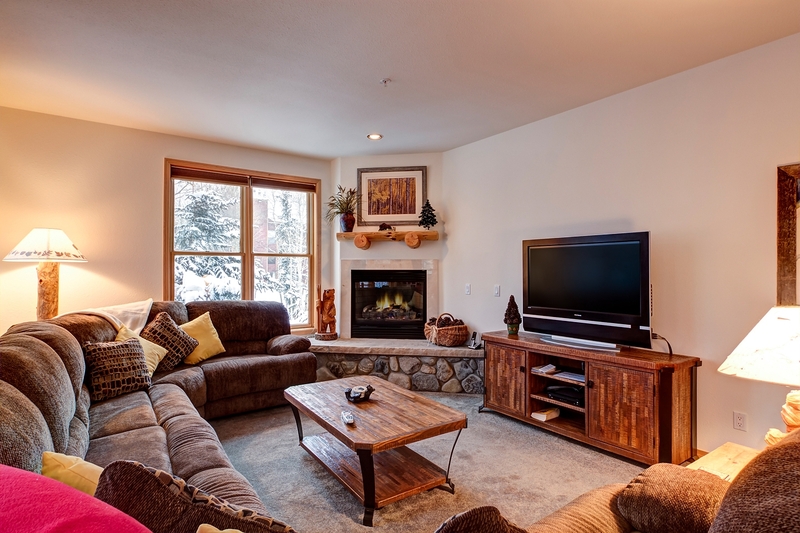 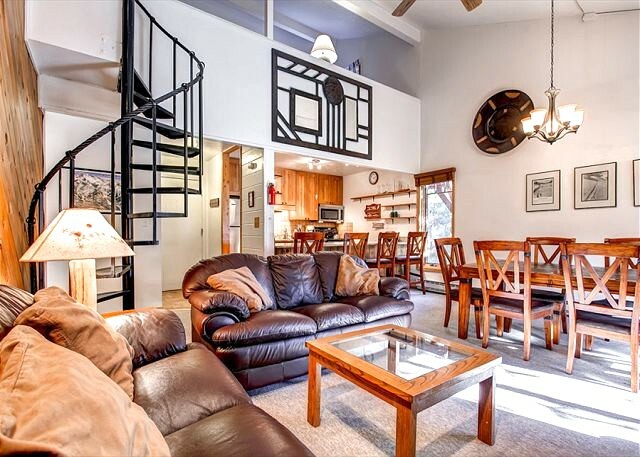 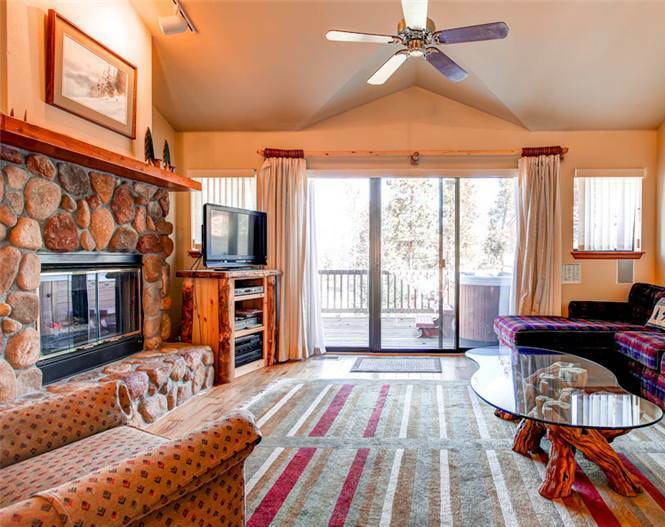 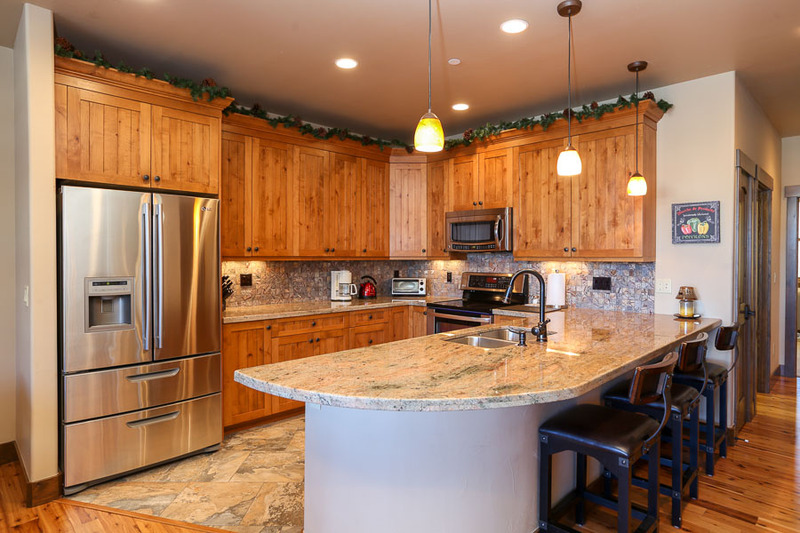 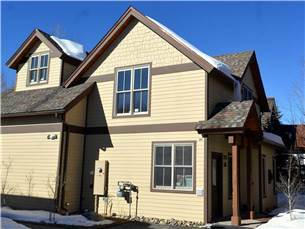 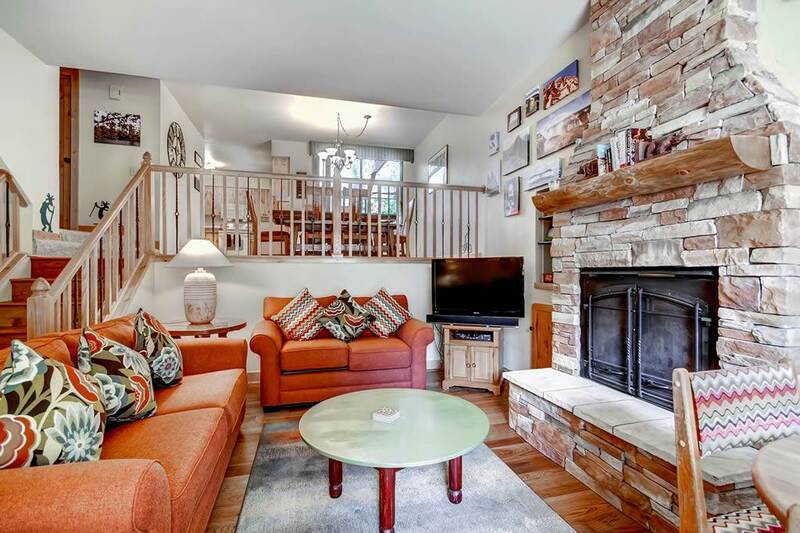 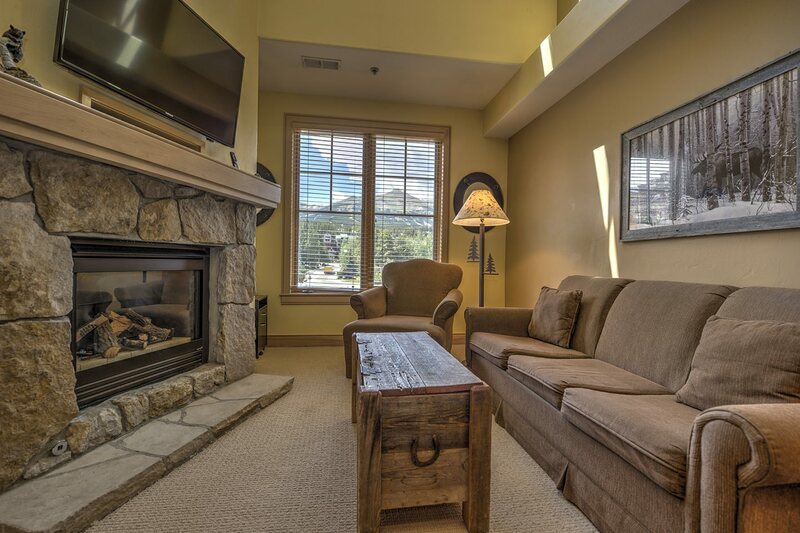 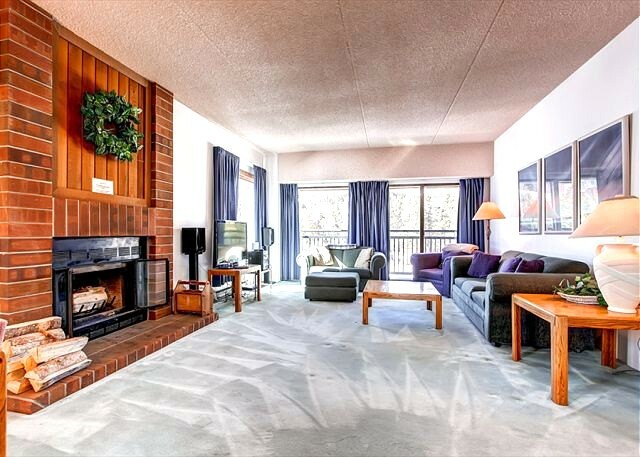 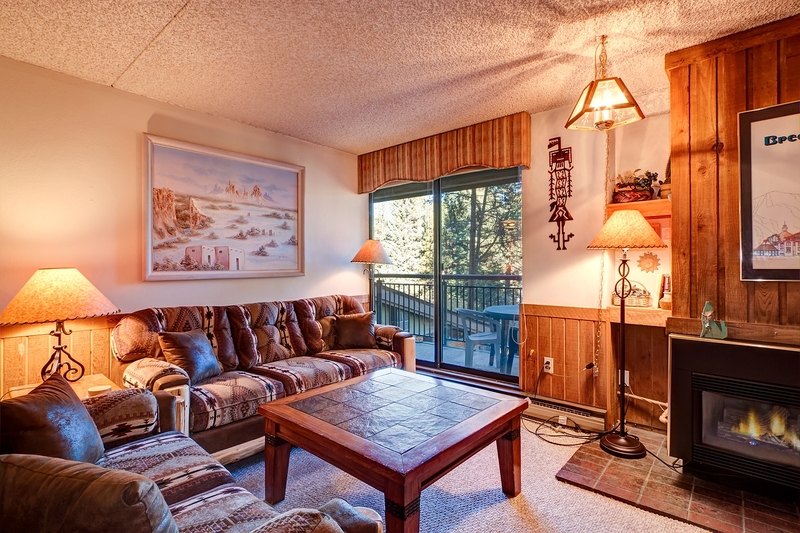 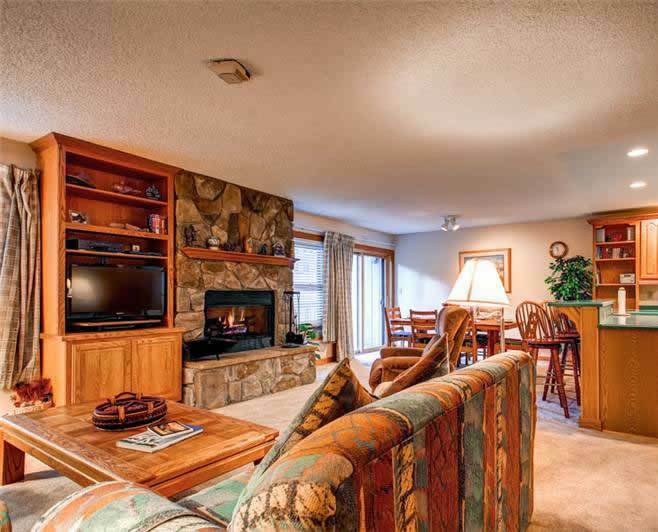 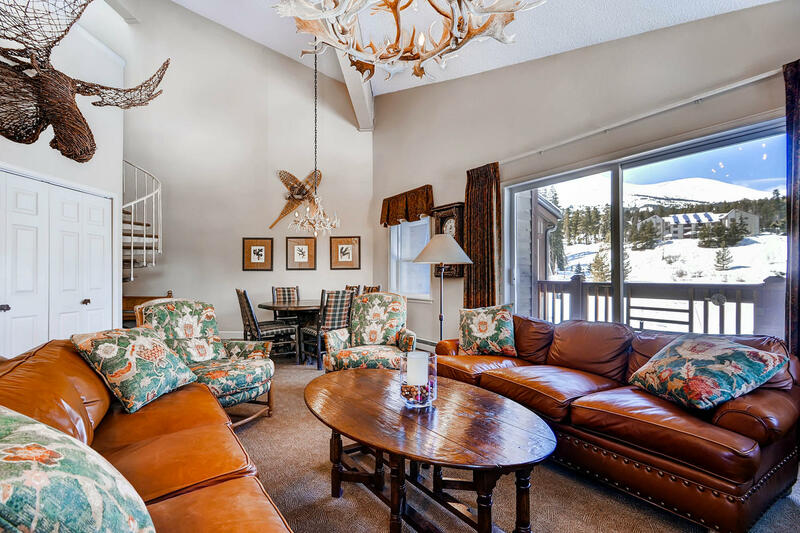 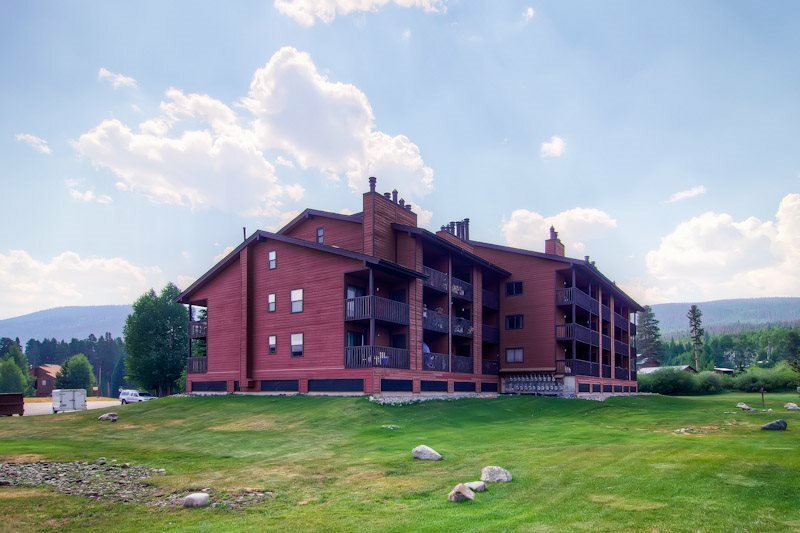 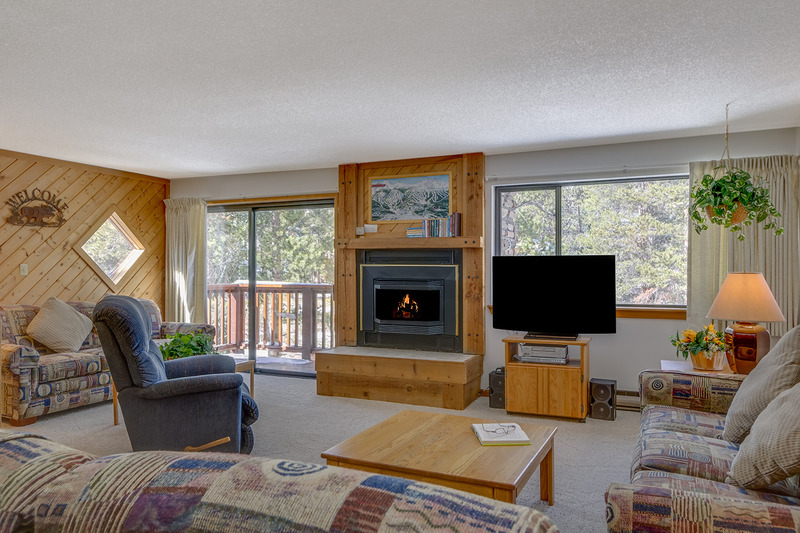 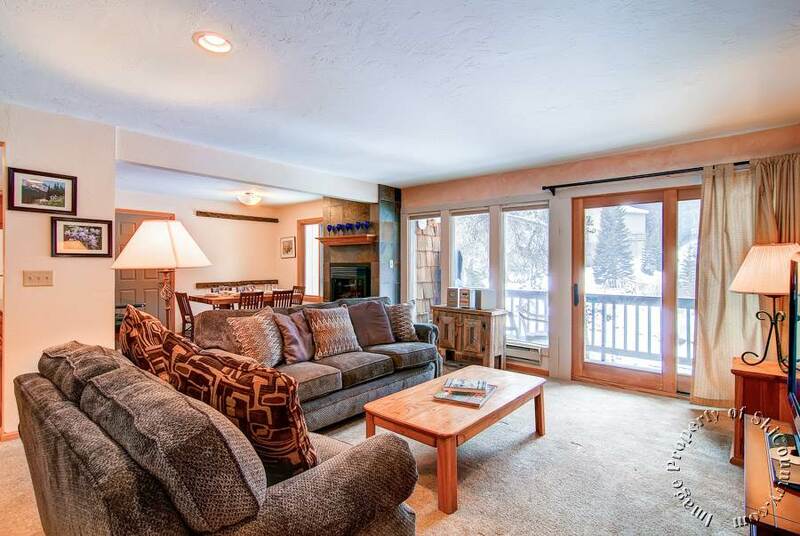 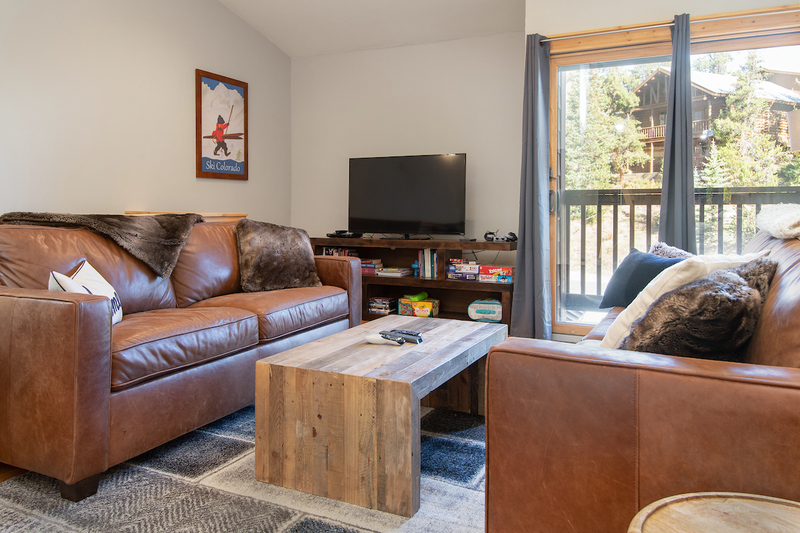 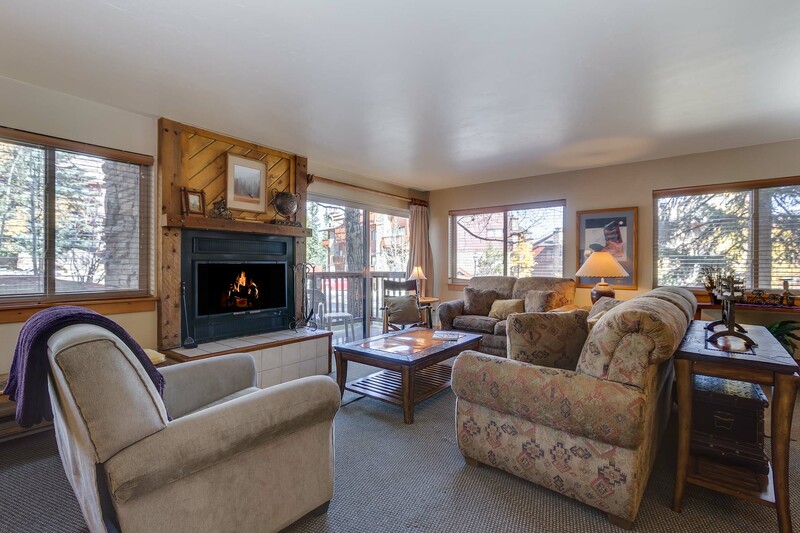 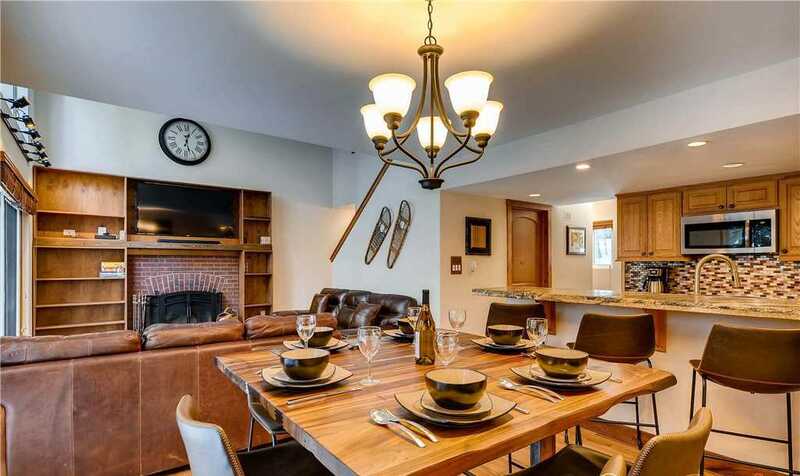 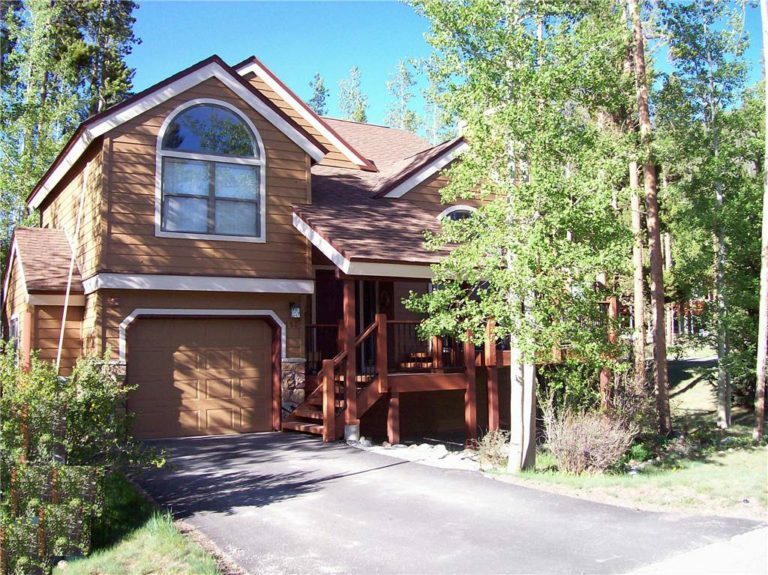 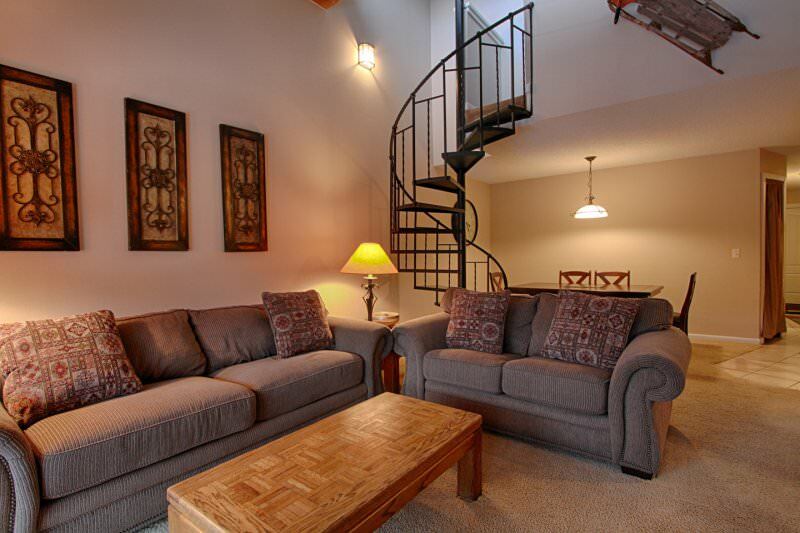 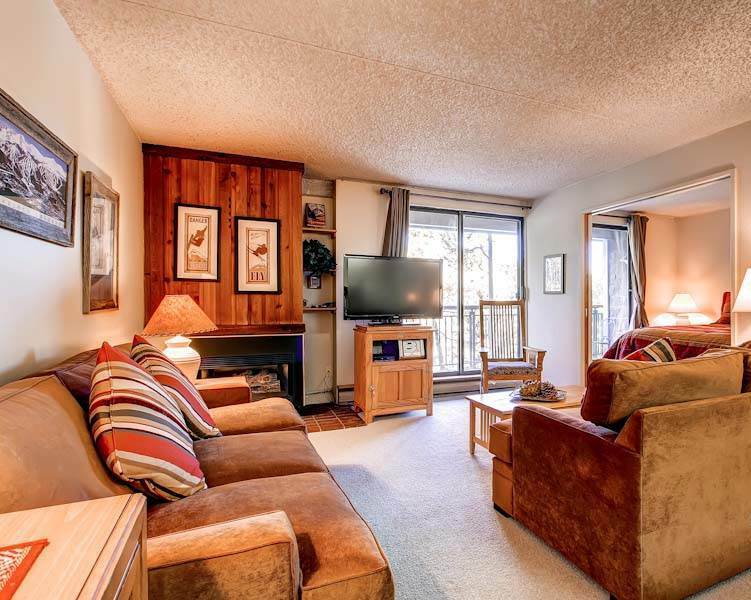 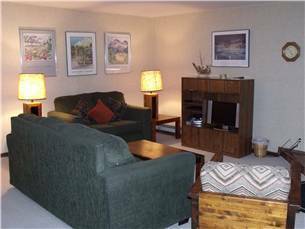 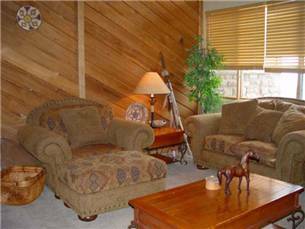 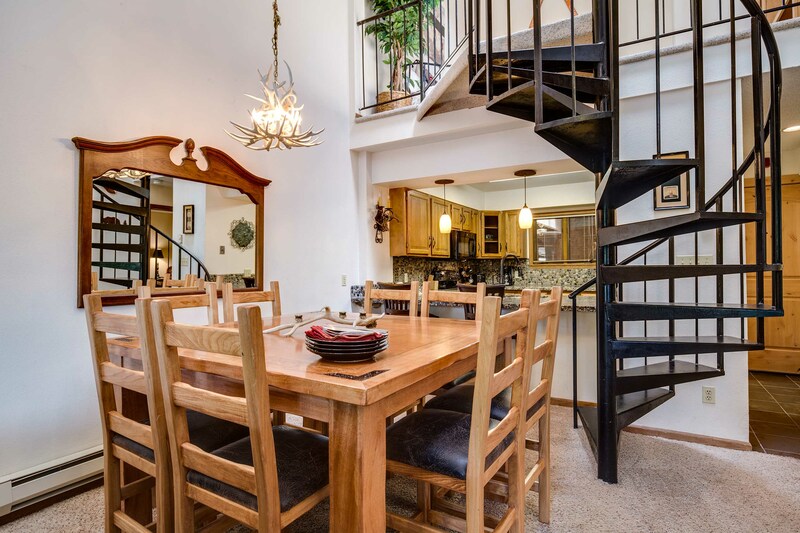 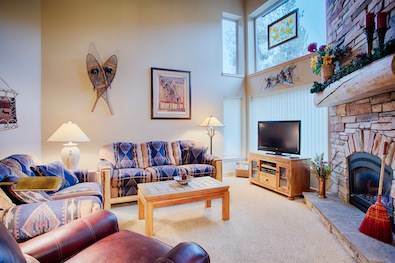 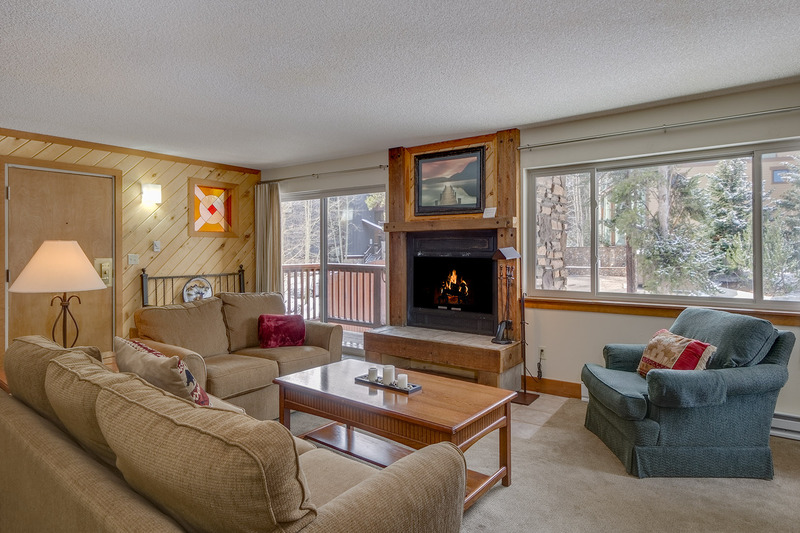 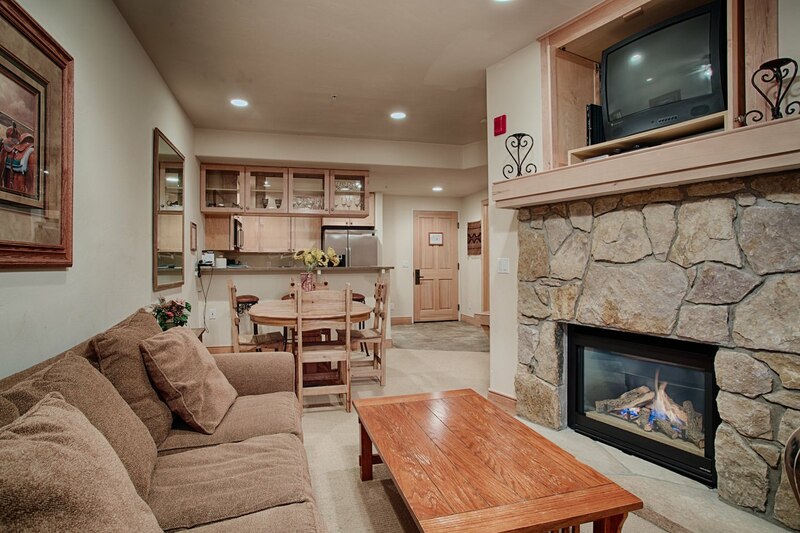 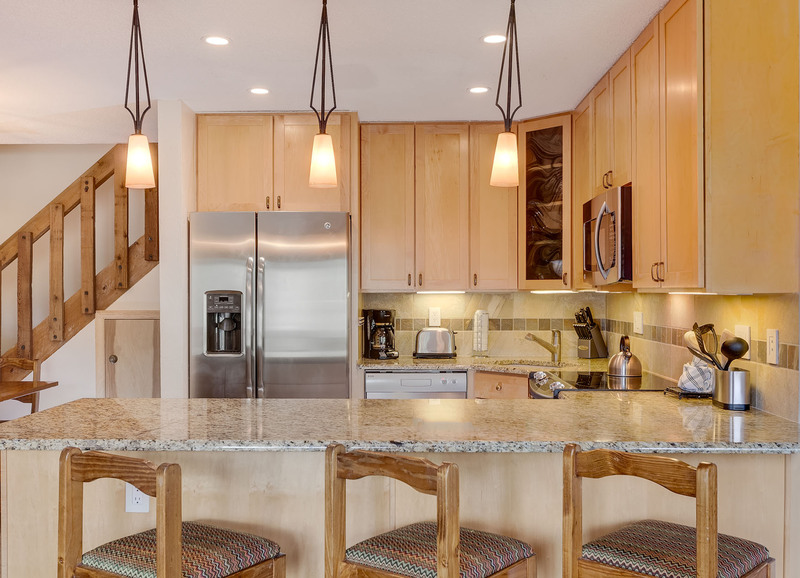 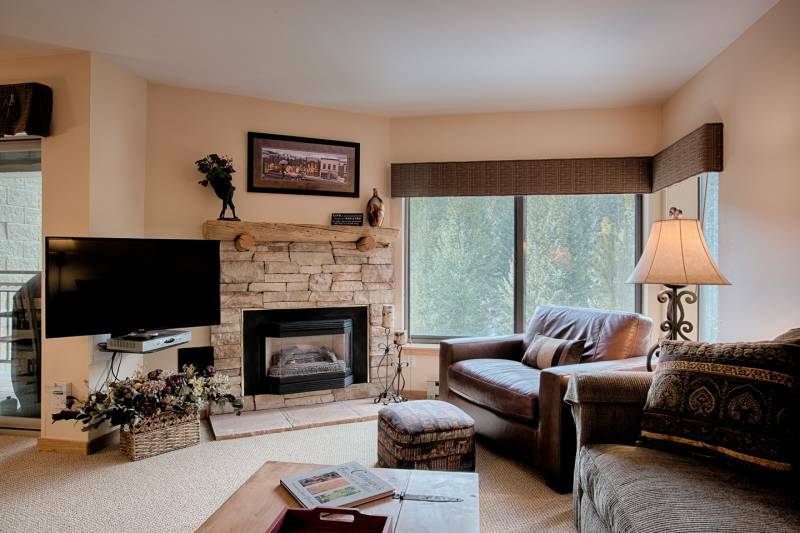 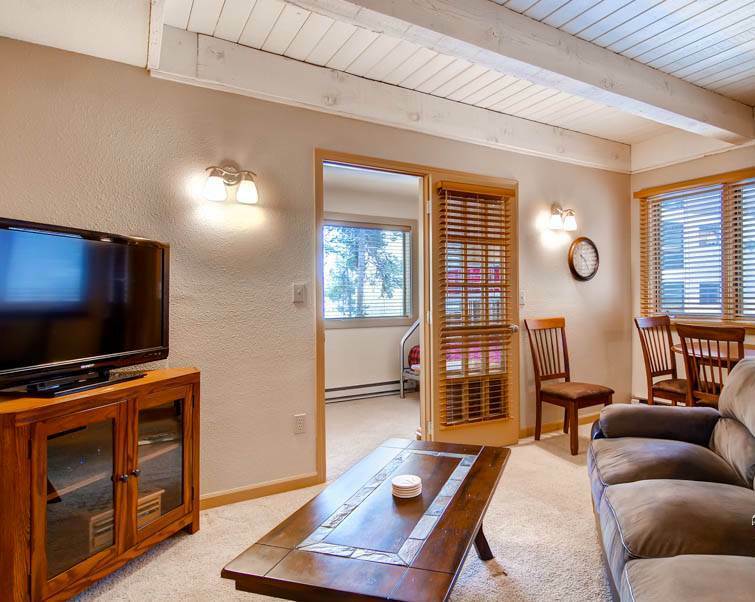 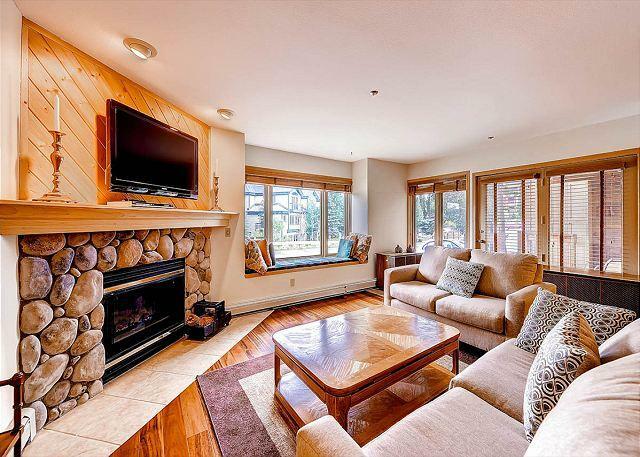 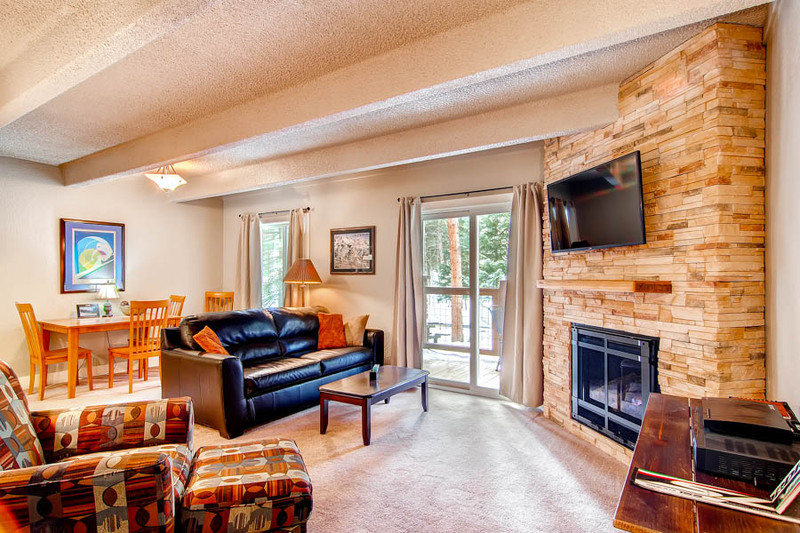 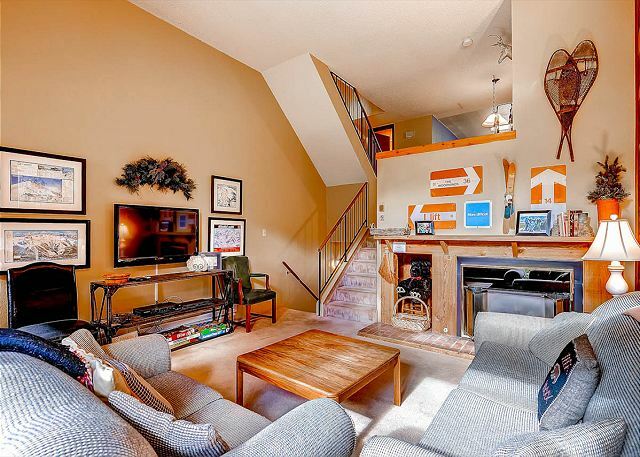 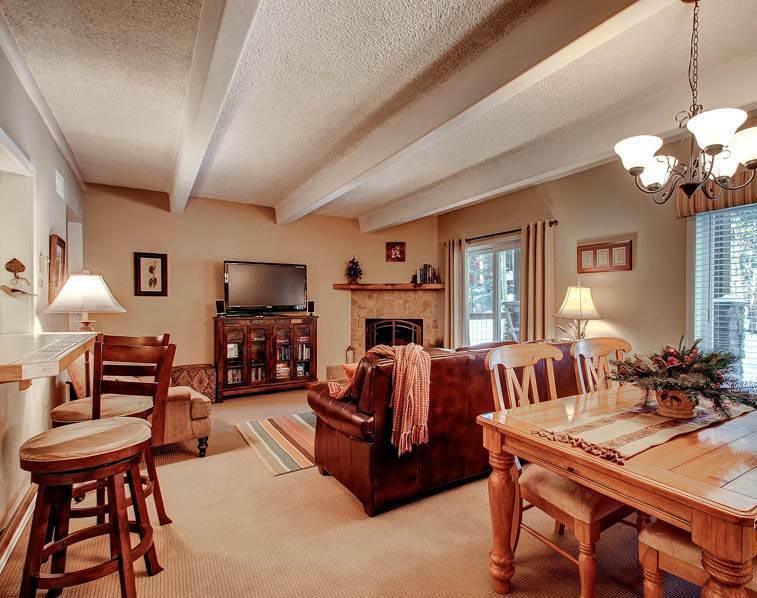 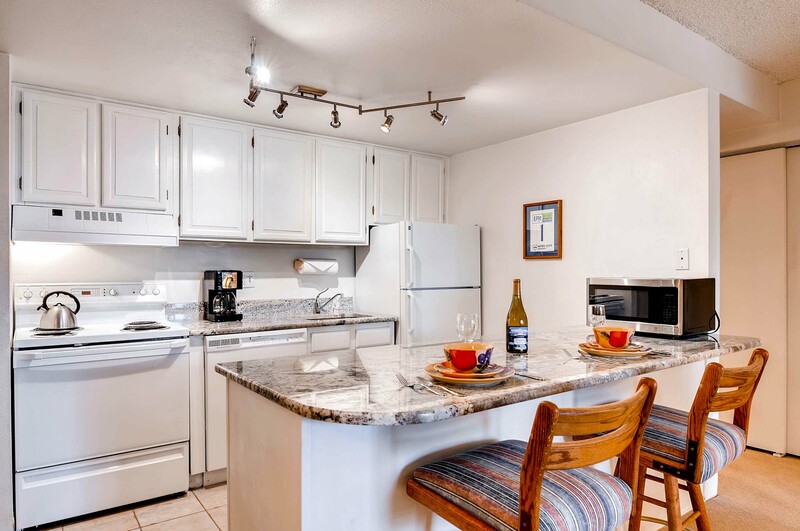 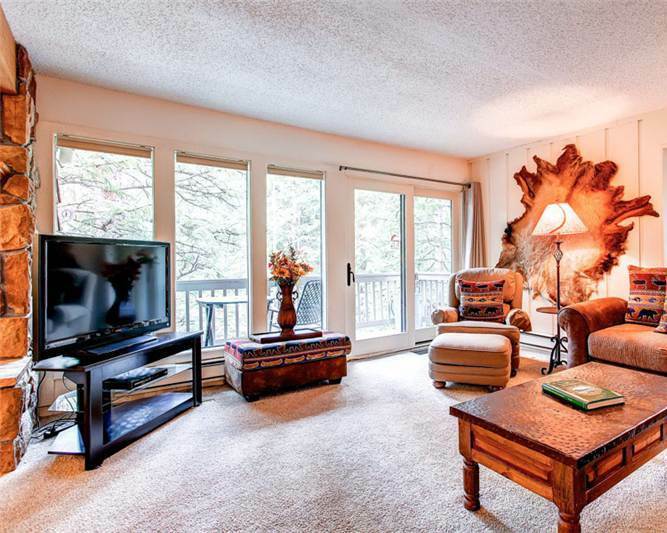 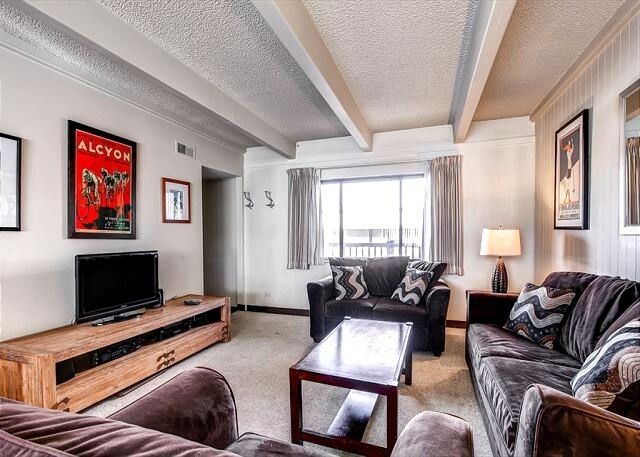 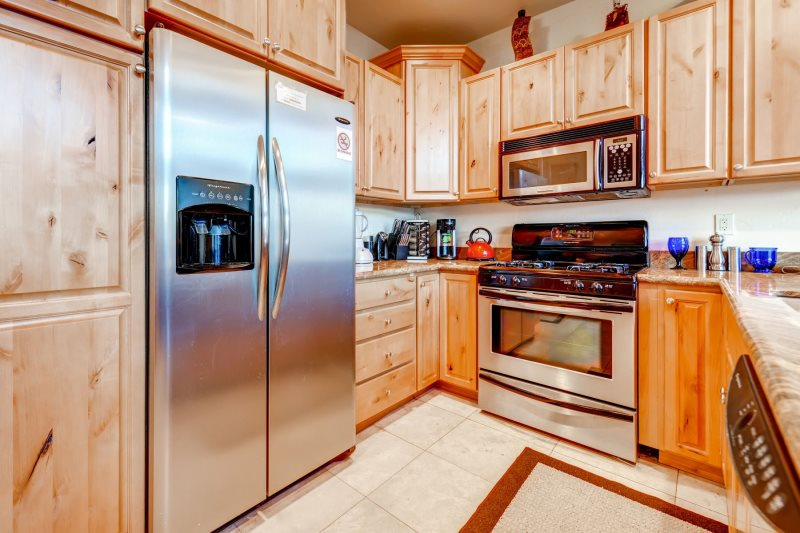 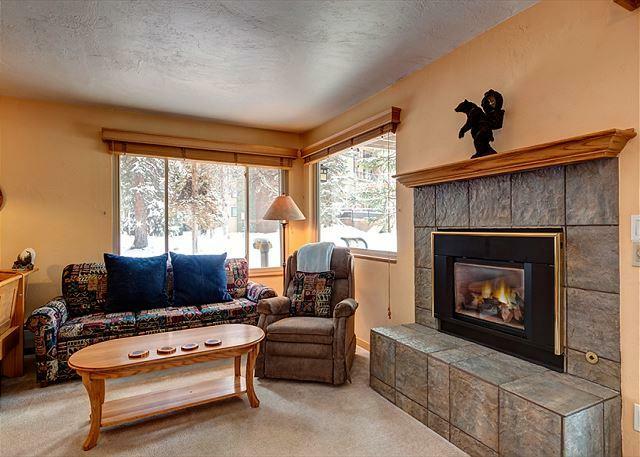 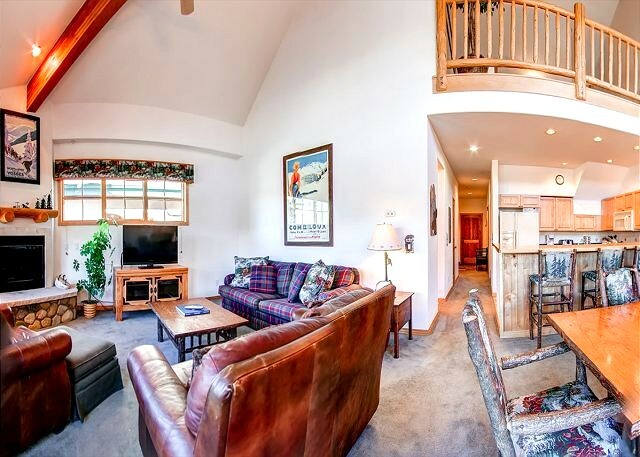 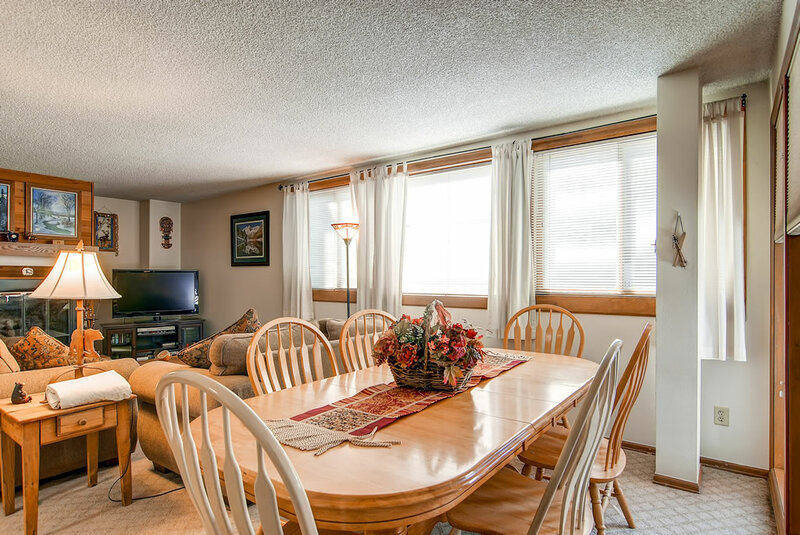 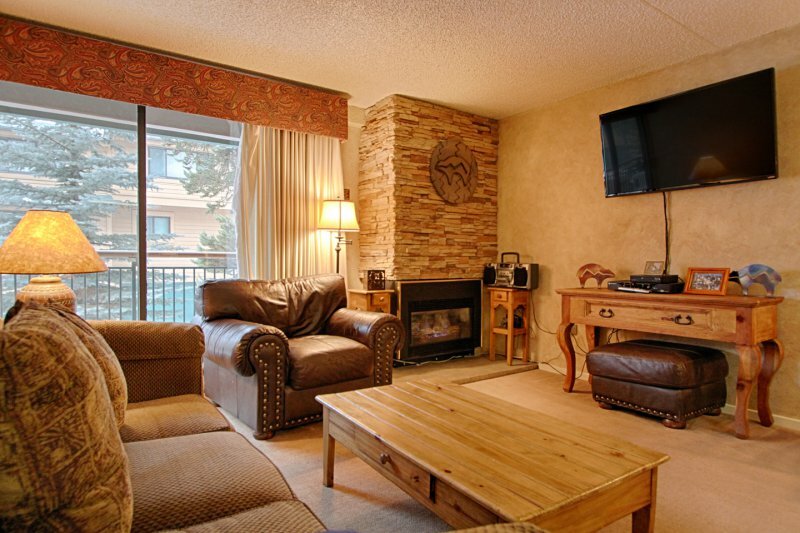 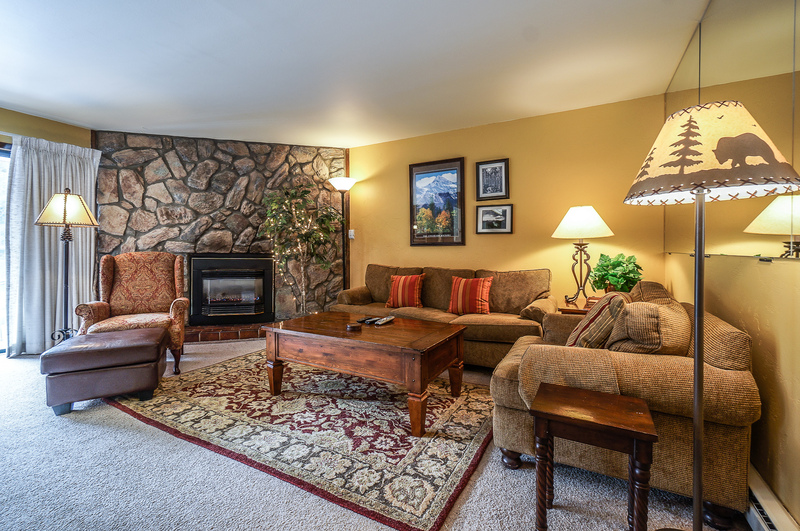 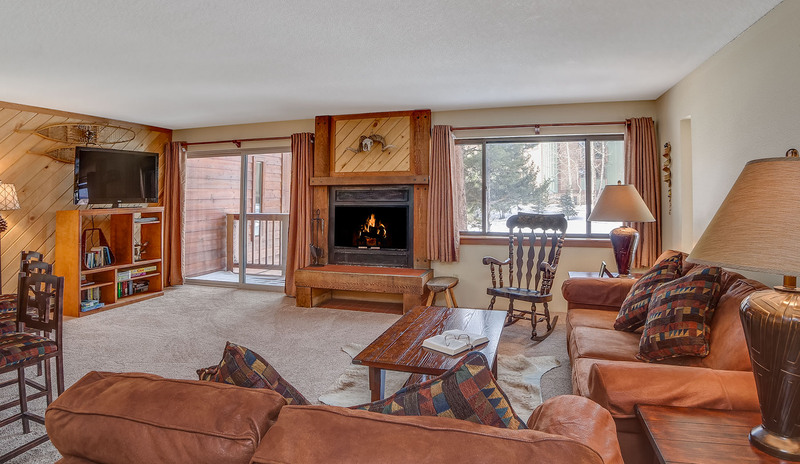 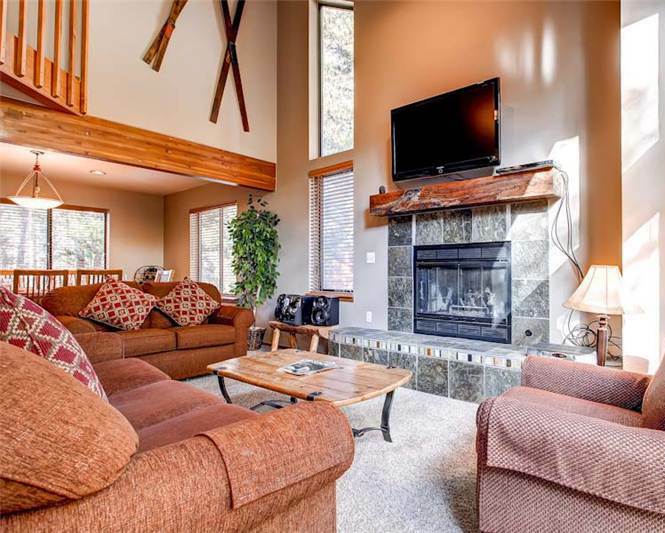 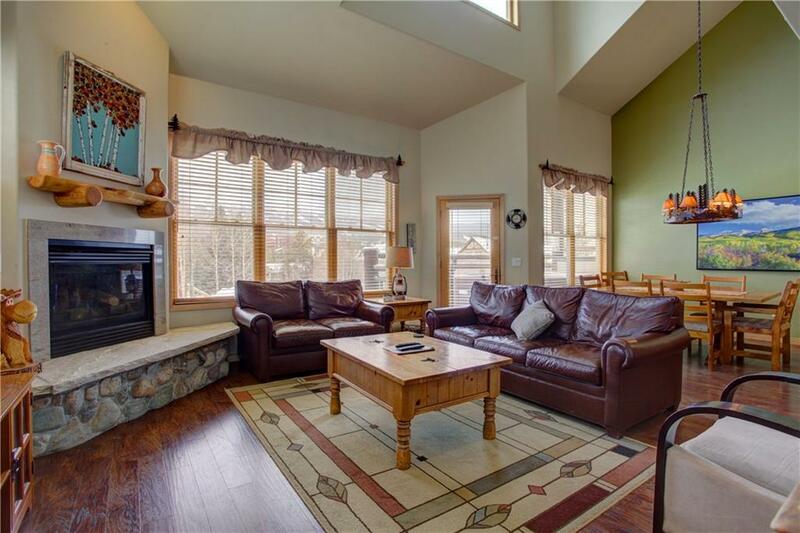 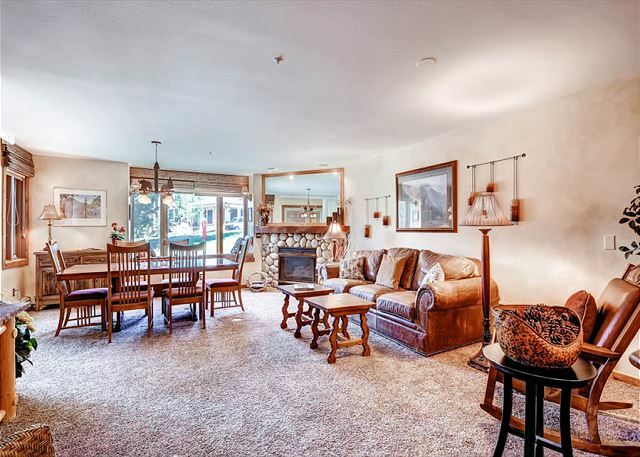 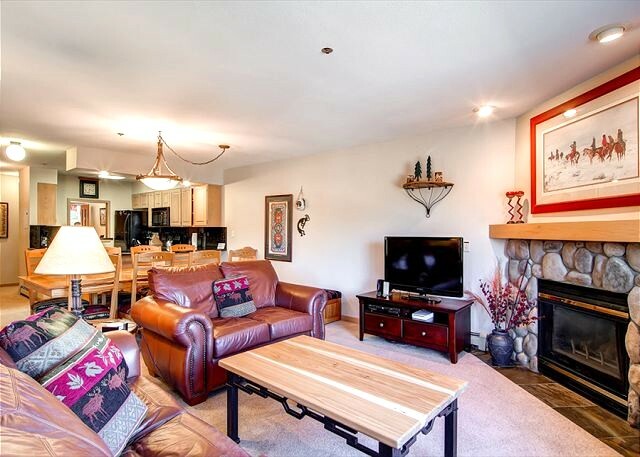 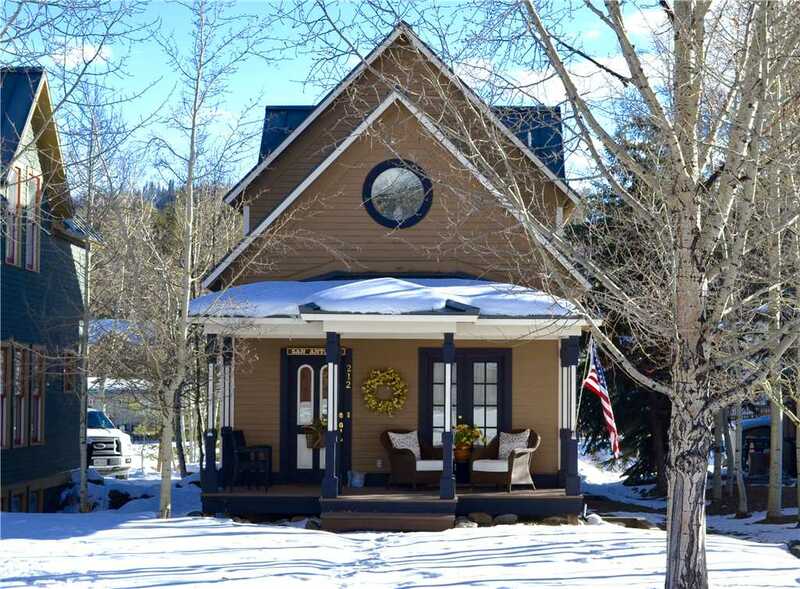 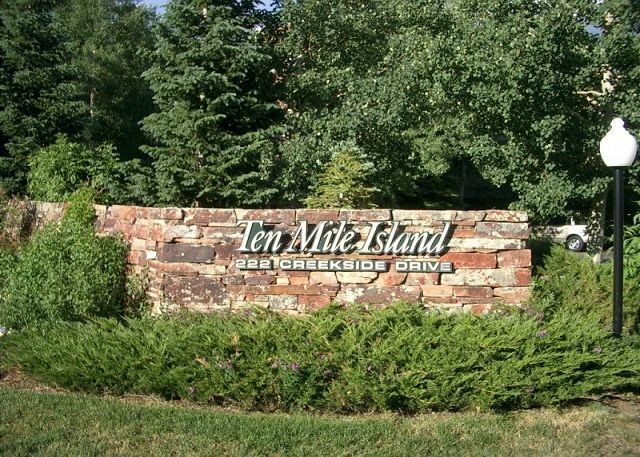 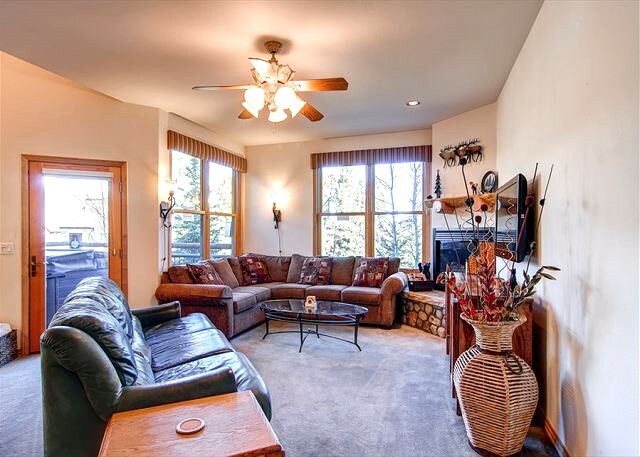 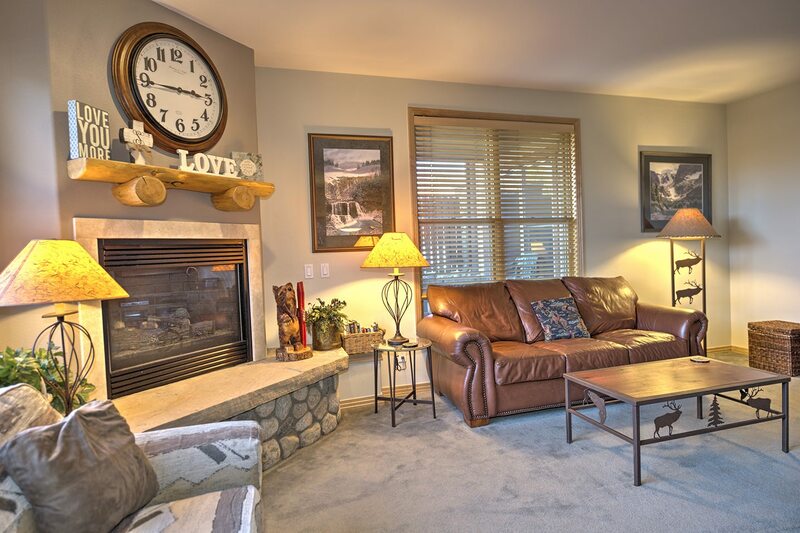 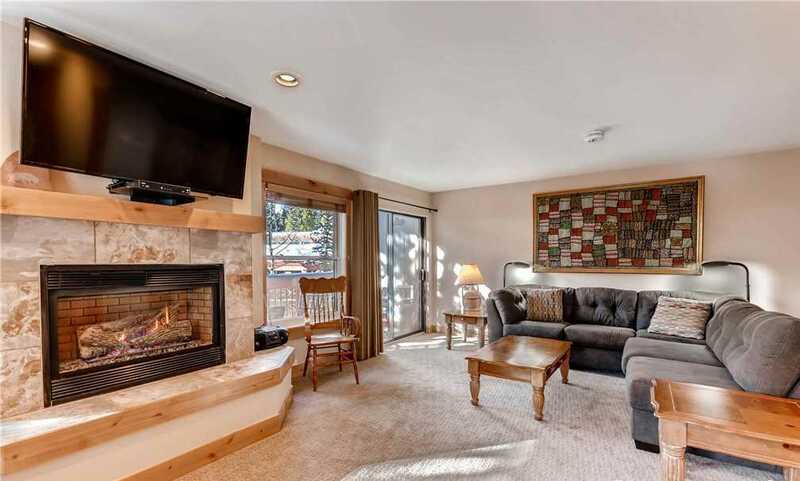 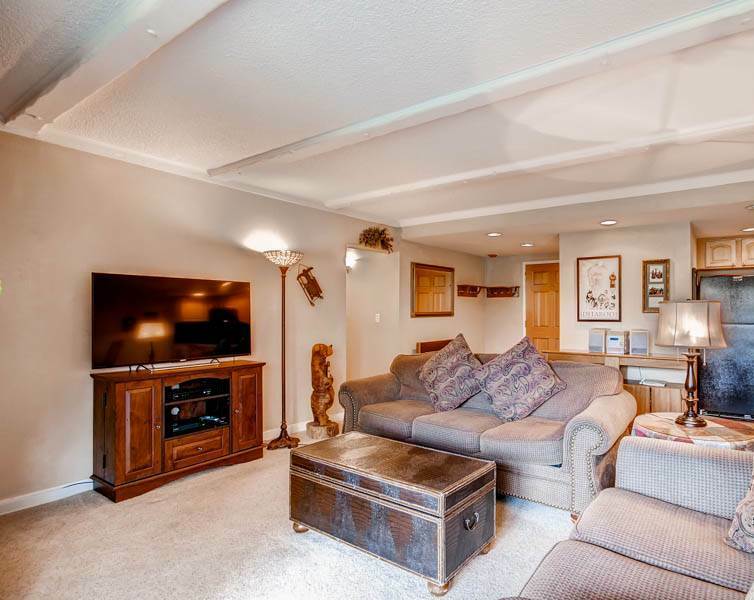 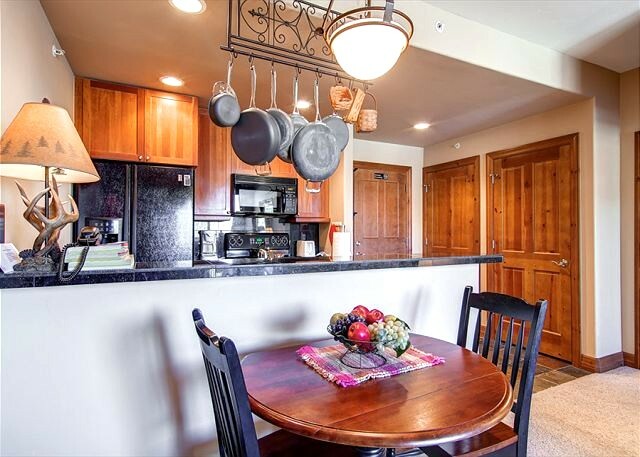 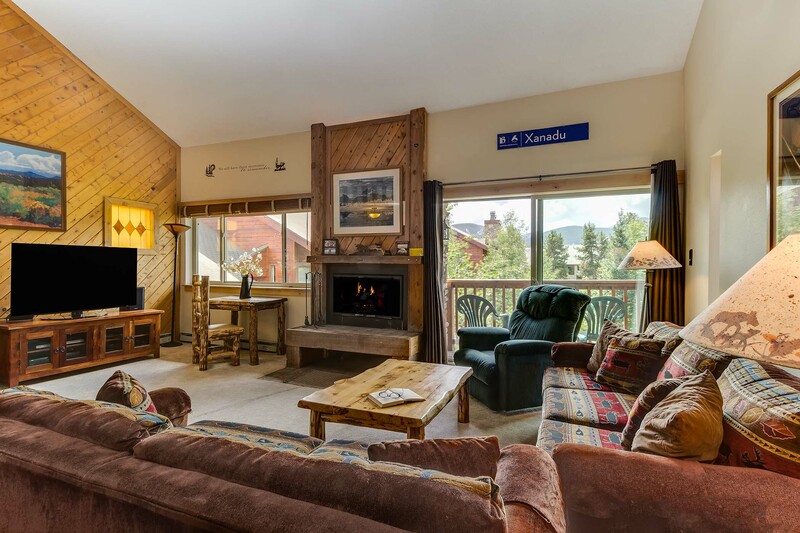 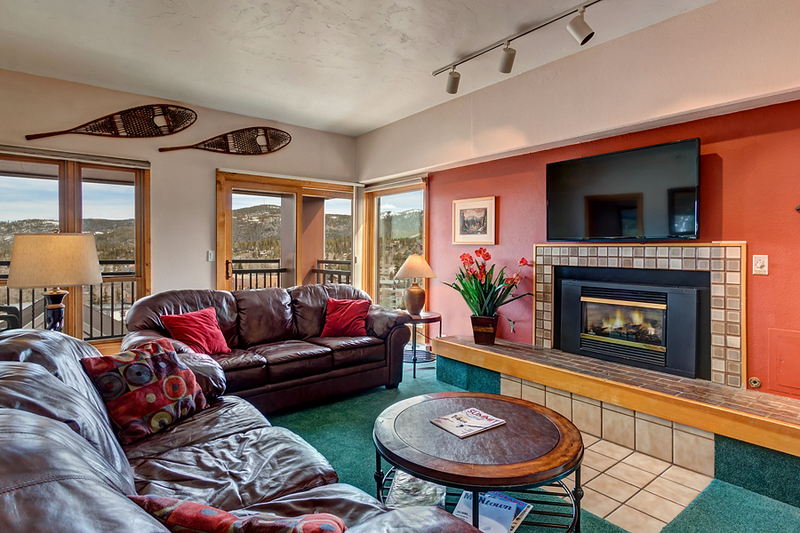 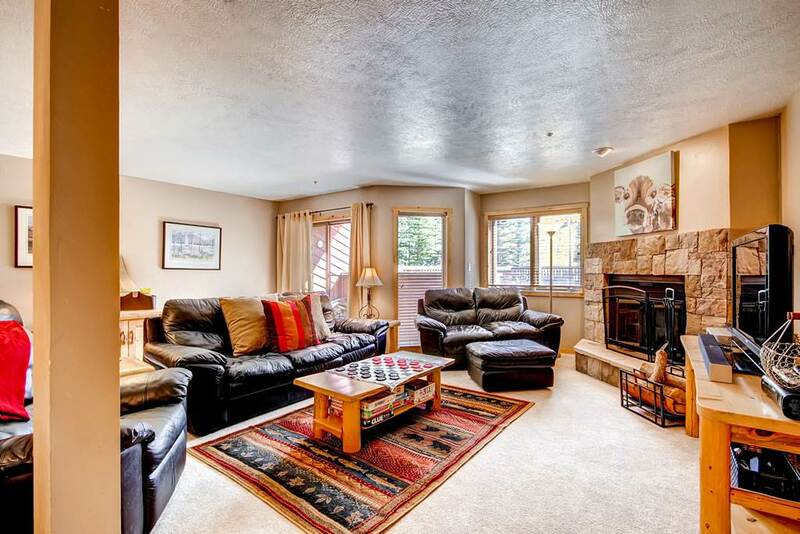 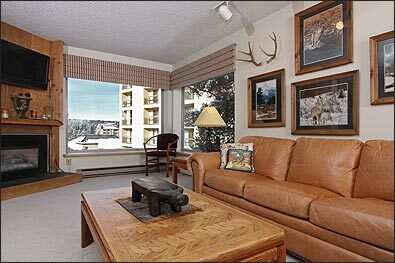 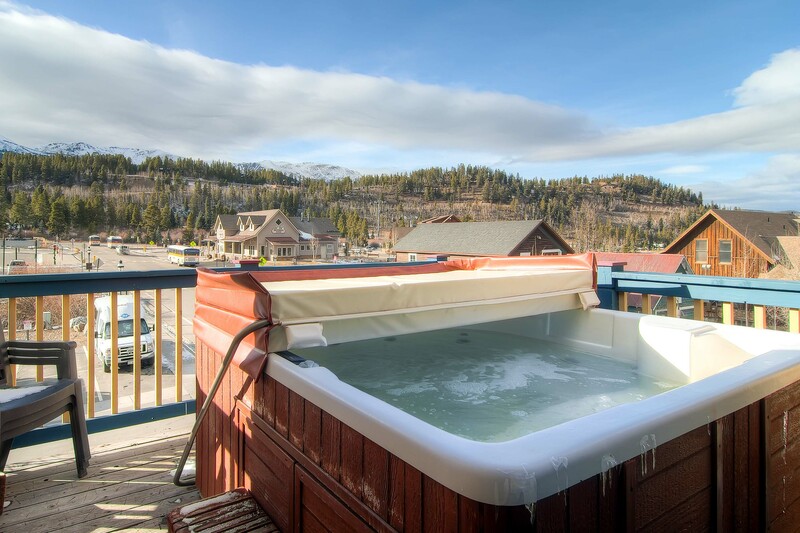 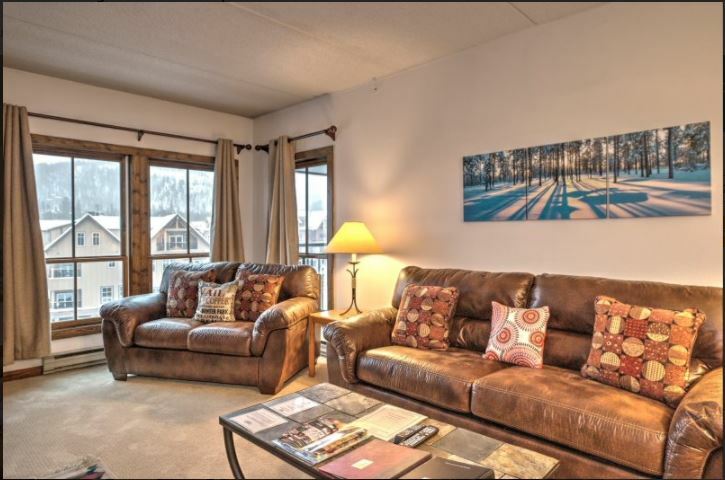 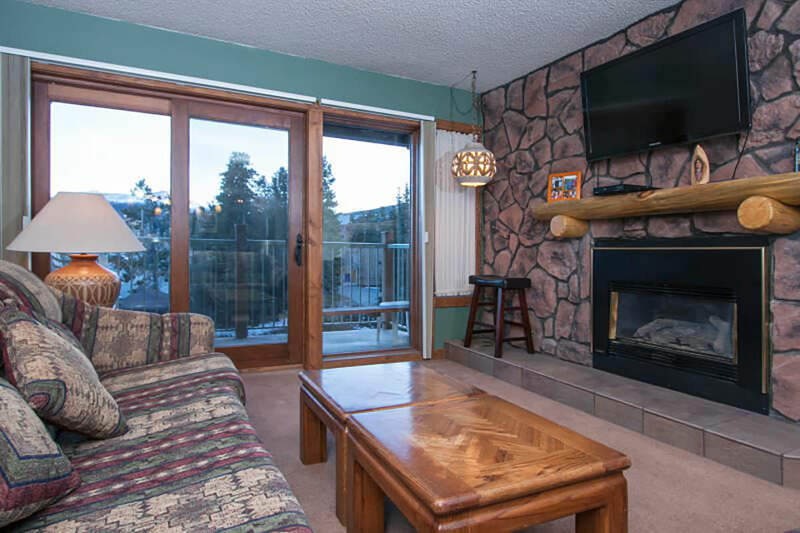 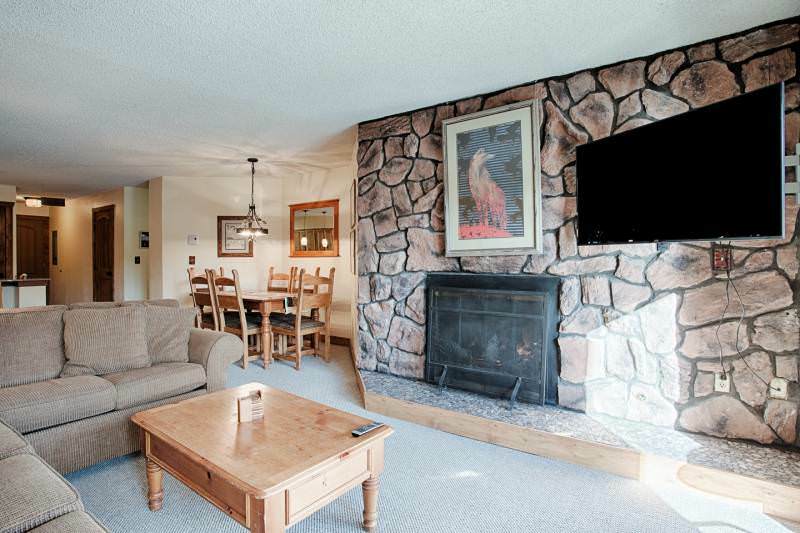 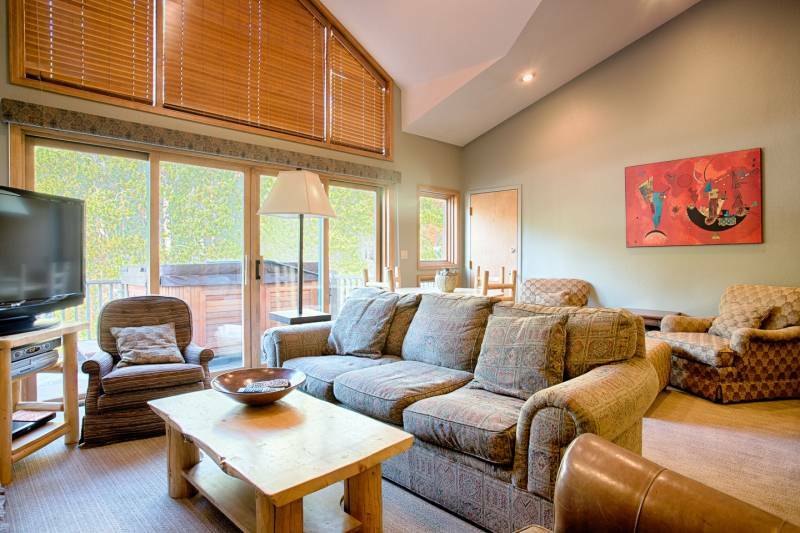 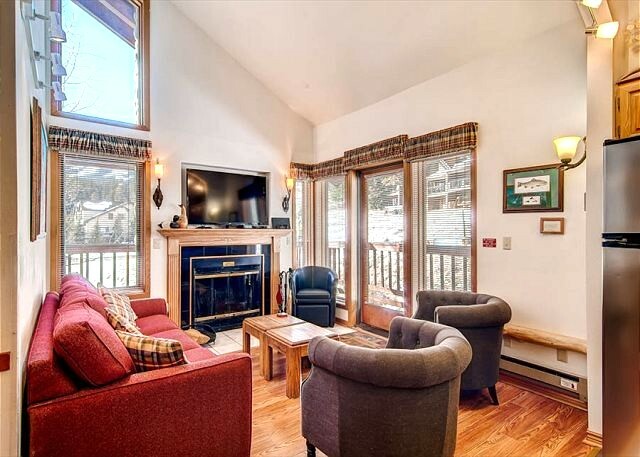 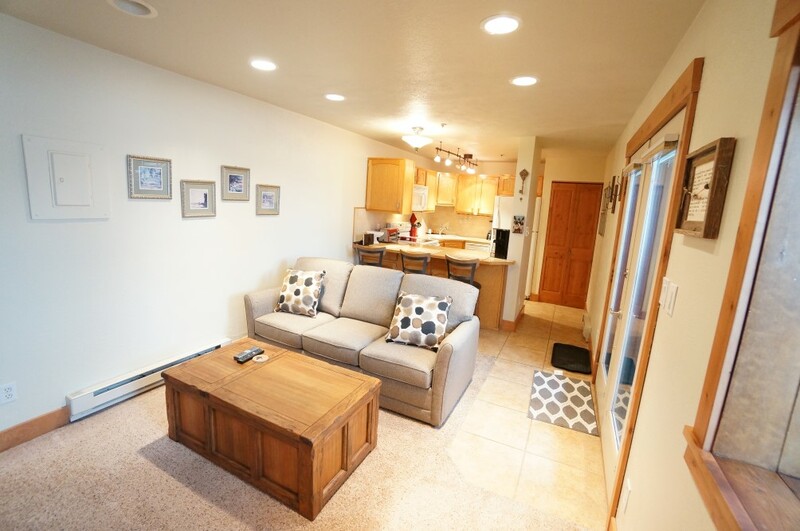 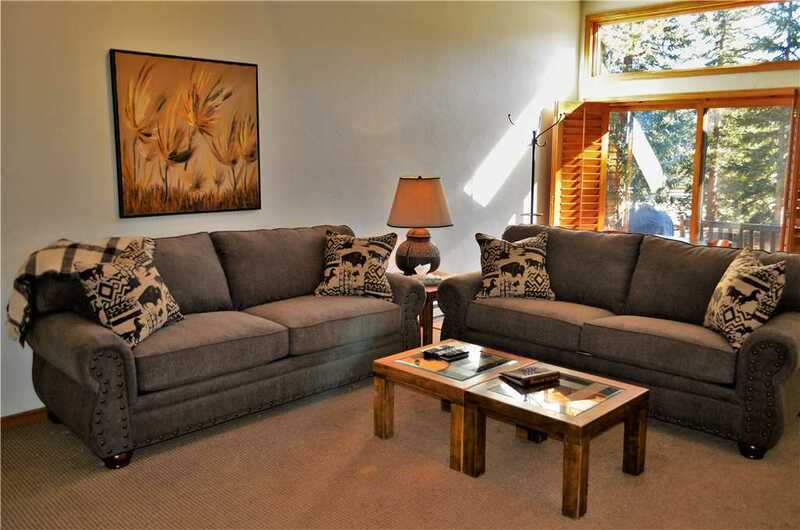 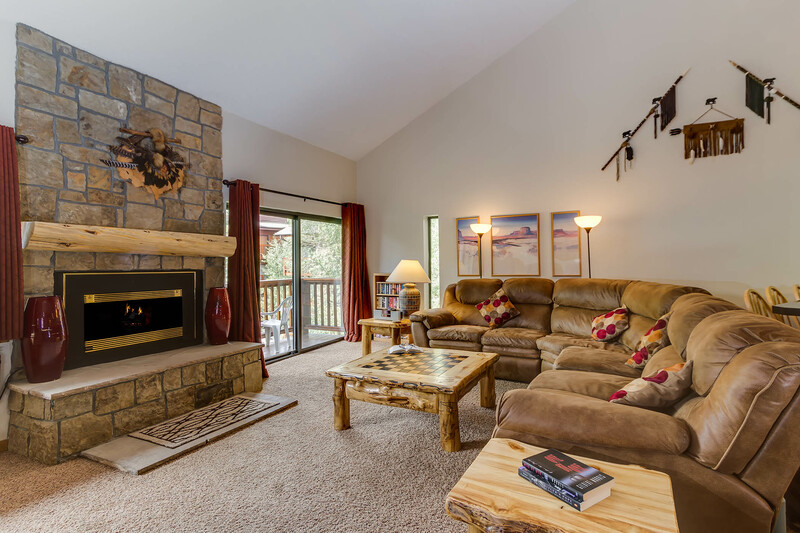 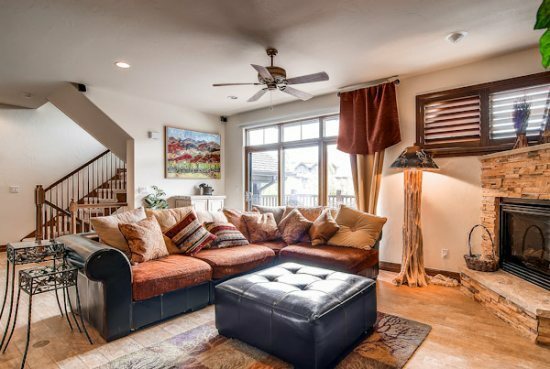 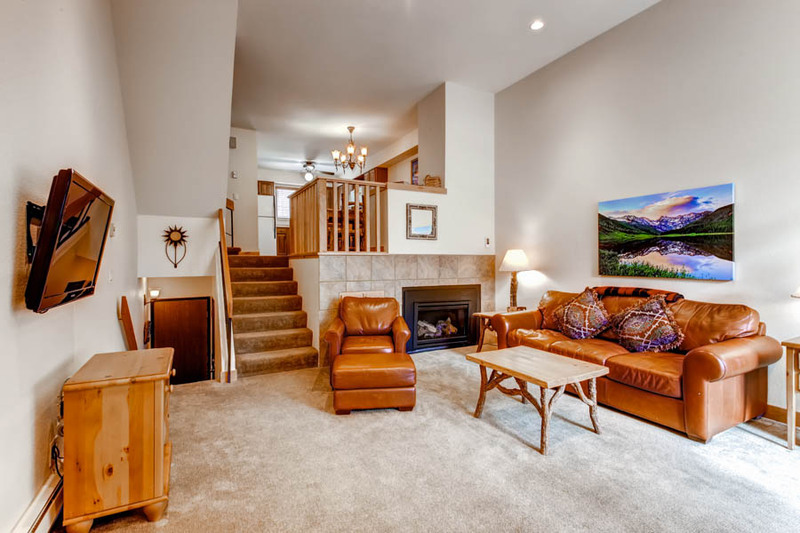 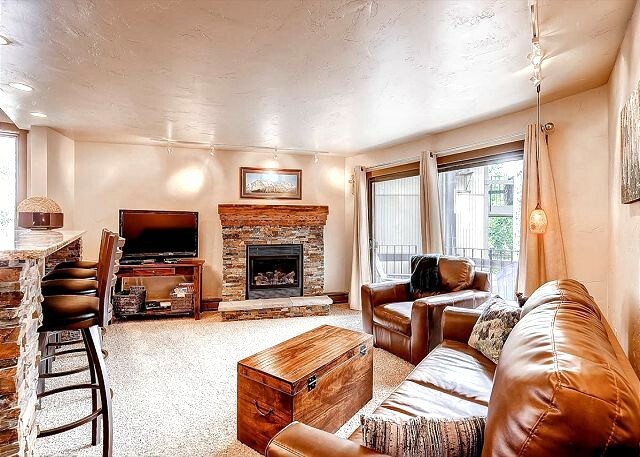 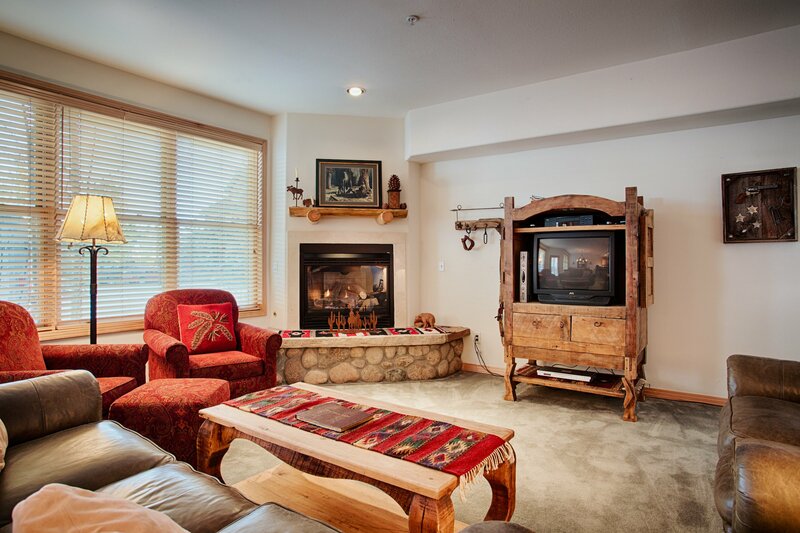 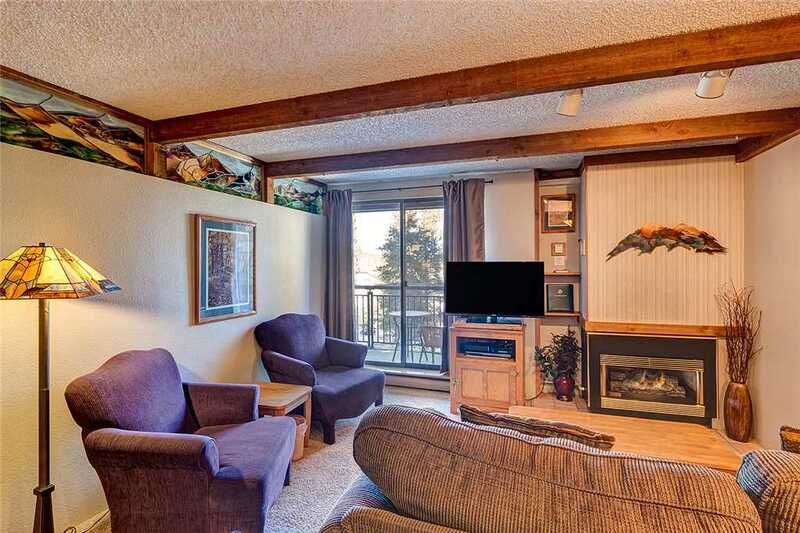 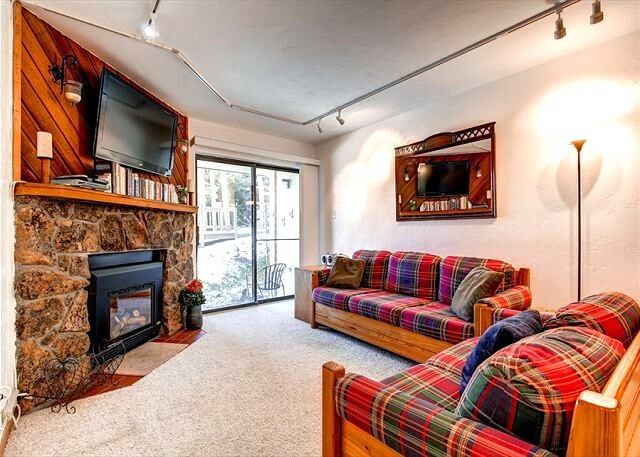 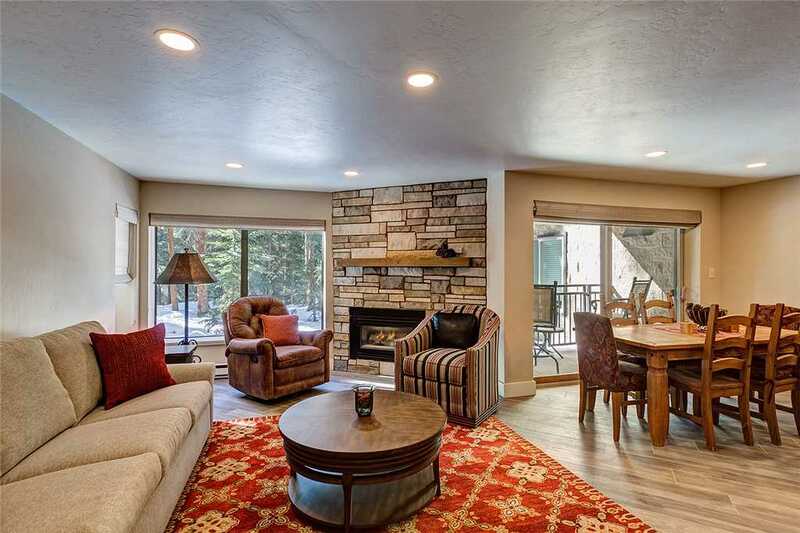 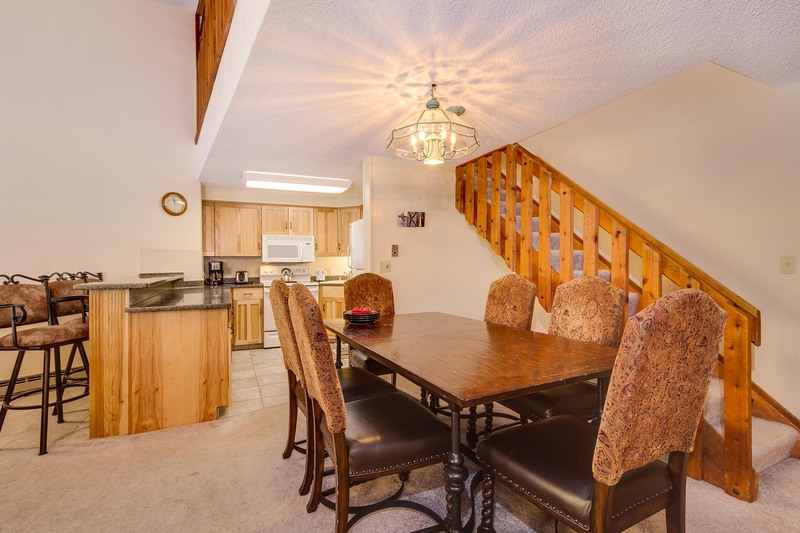 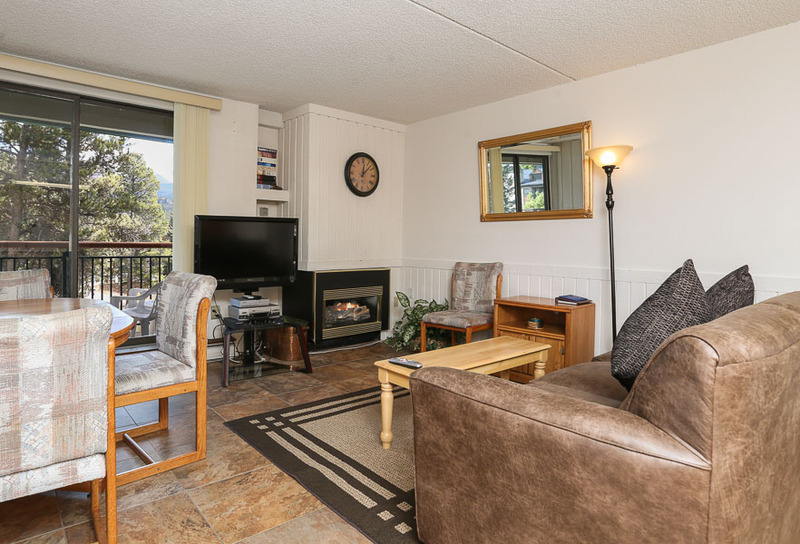 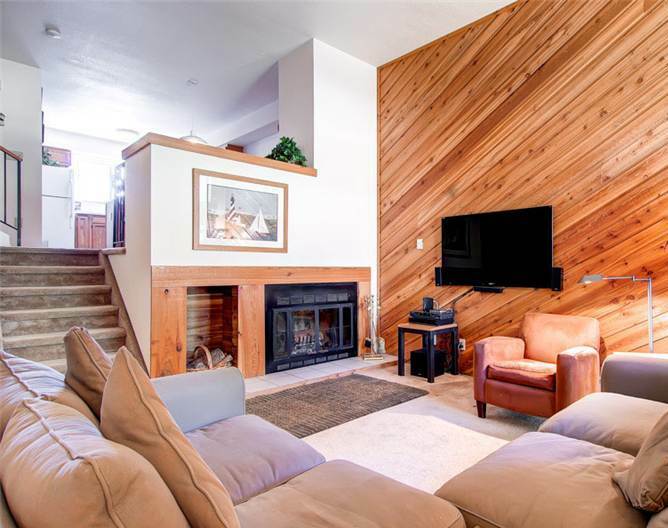 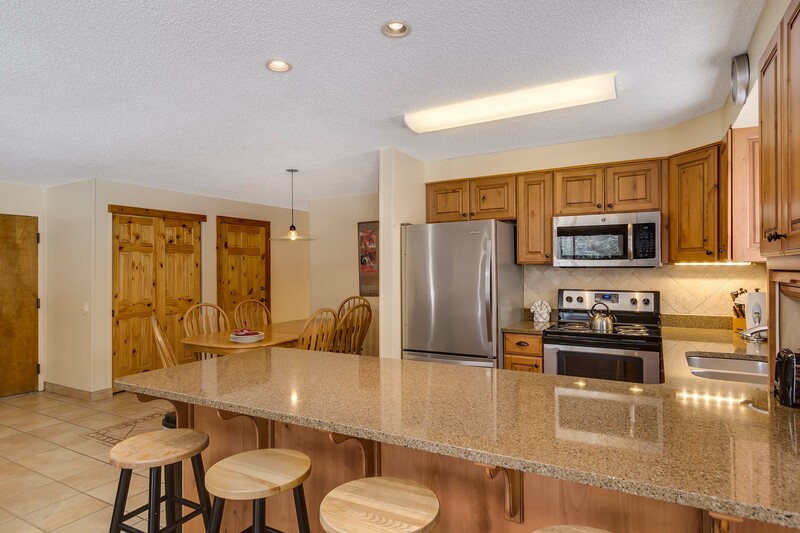 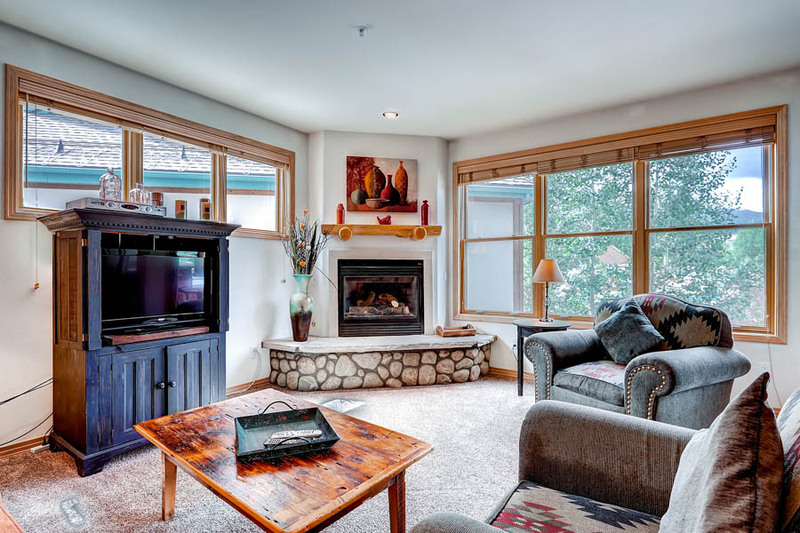 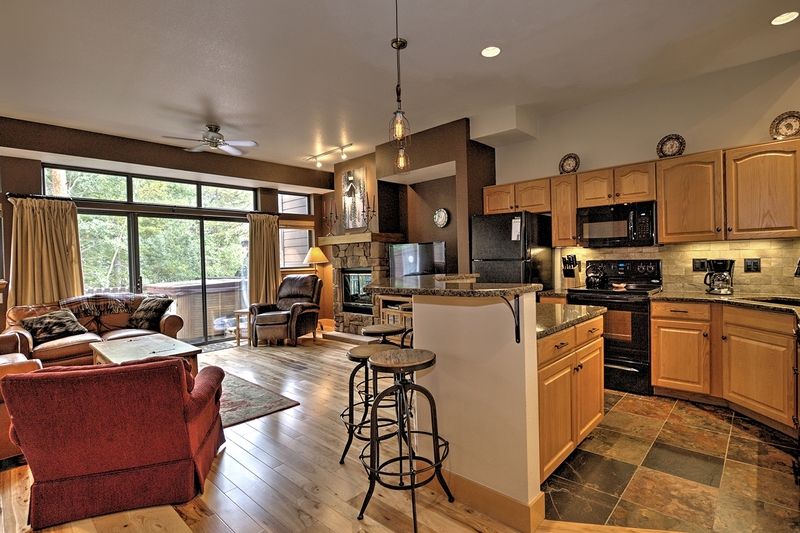 This Platinum-rated loft condominium features a fresh remodel, gorgeous mountain decor and a quiet location close to the community pool. 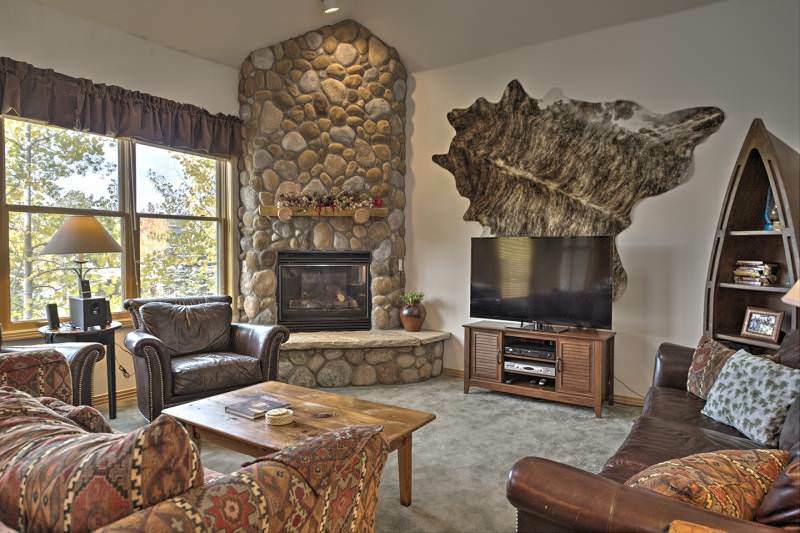 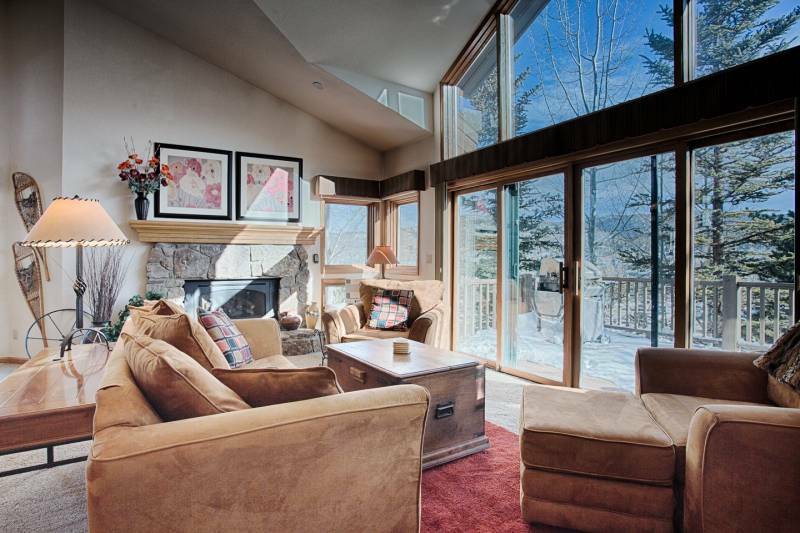 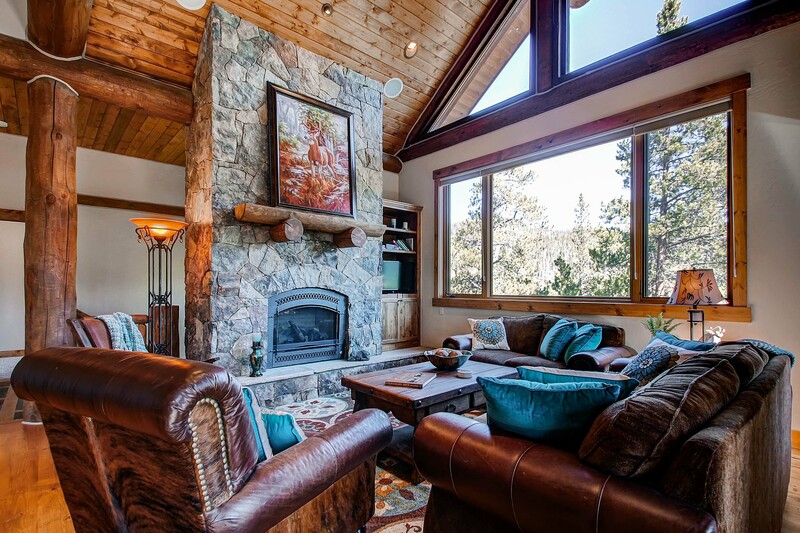 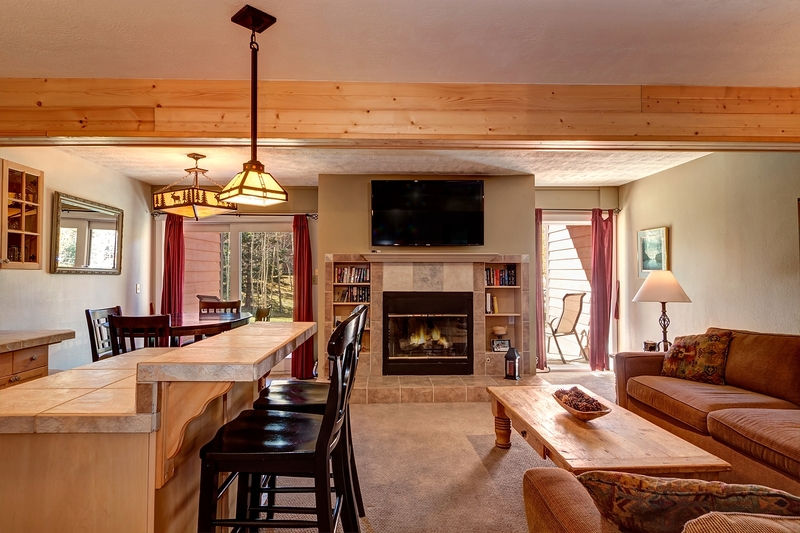 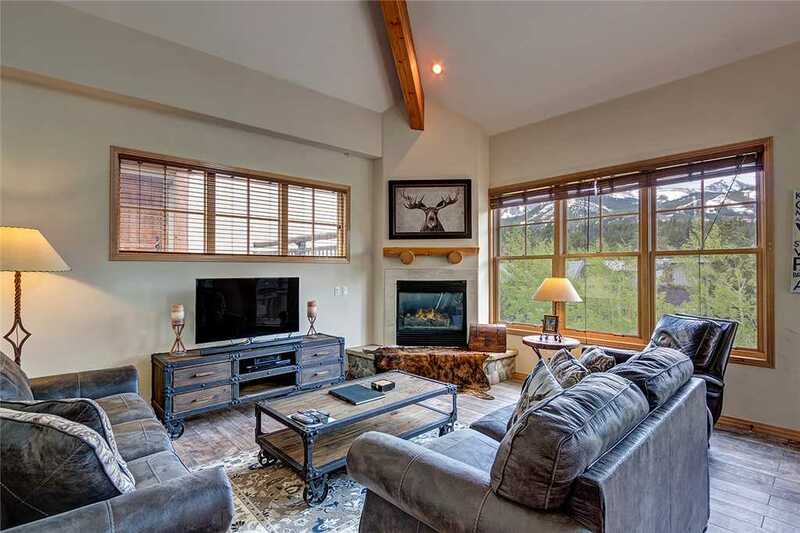 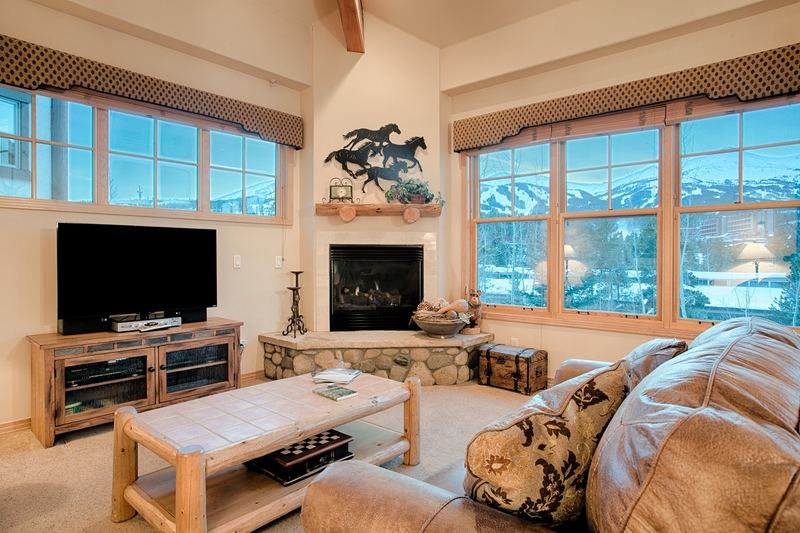 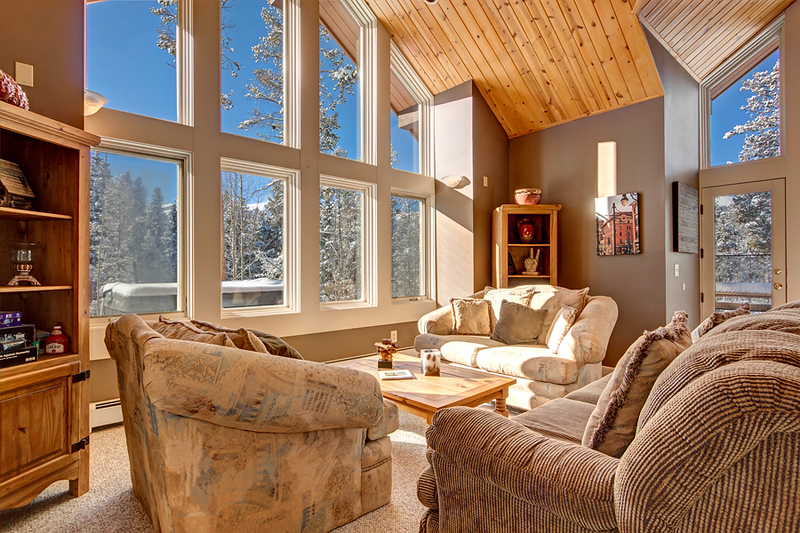 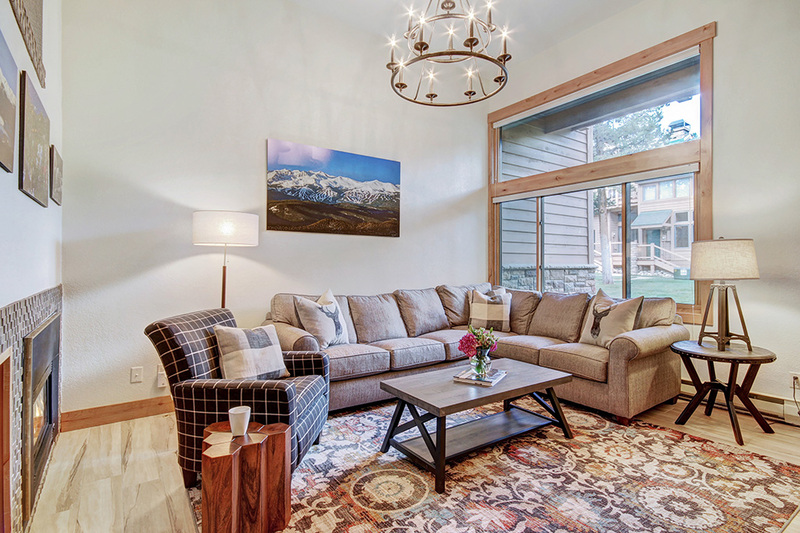 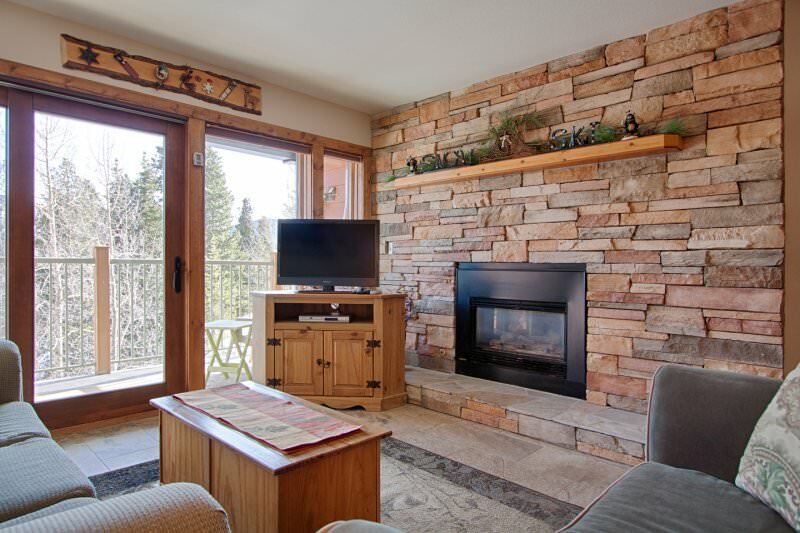 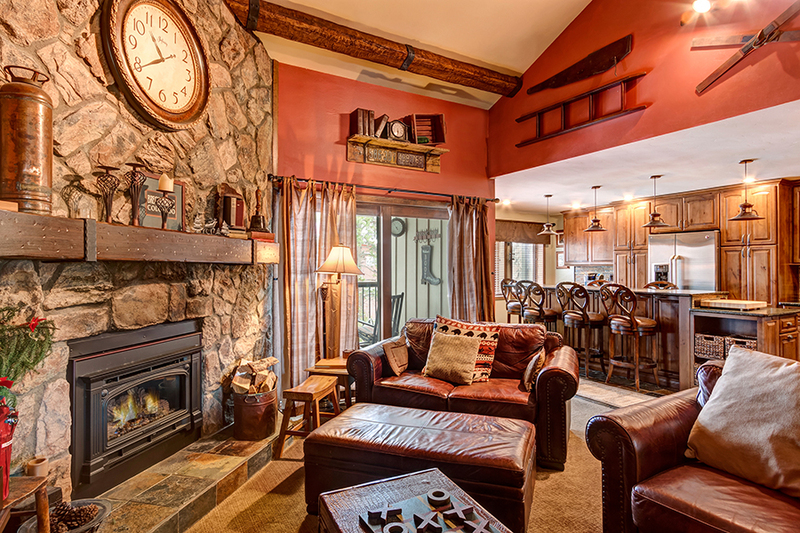 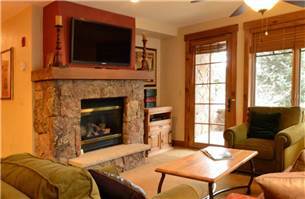 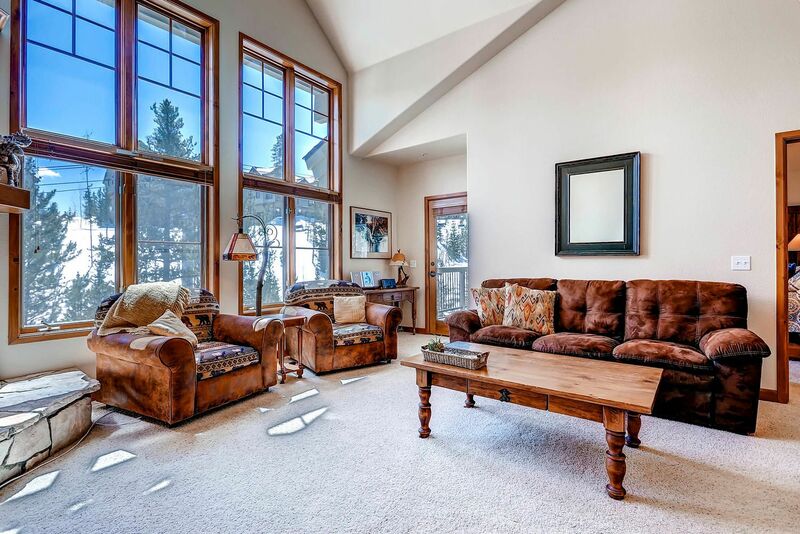 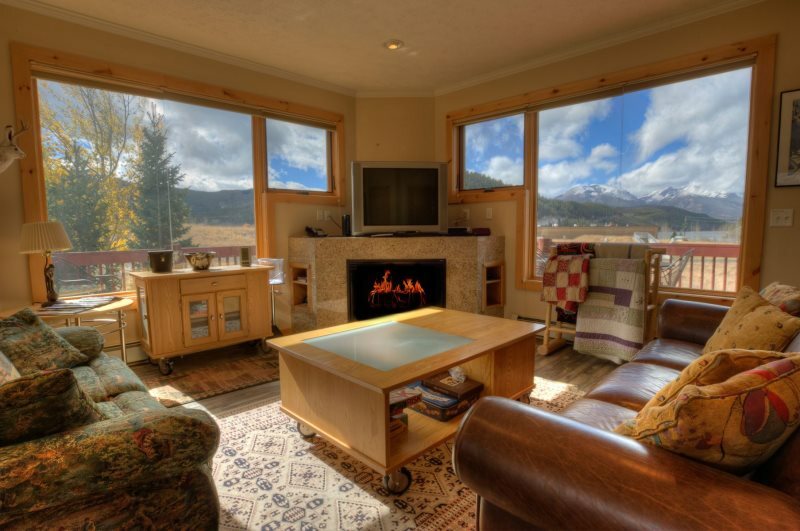 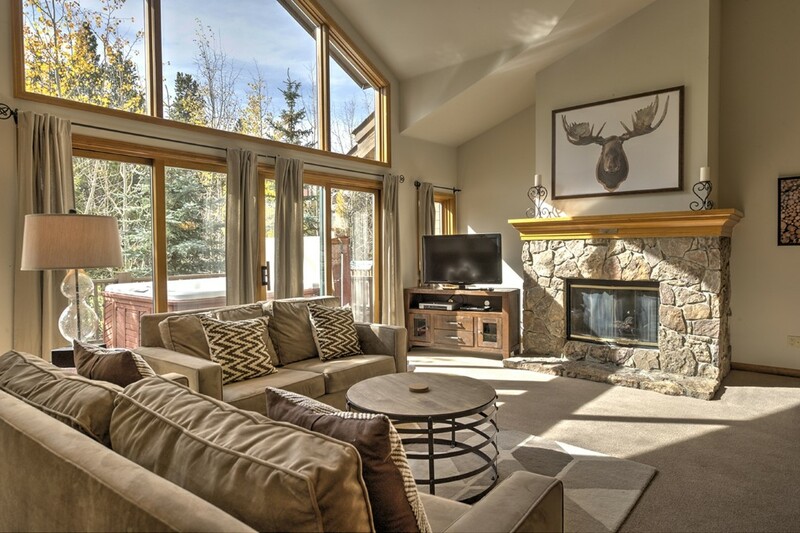 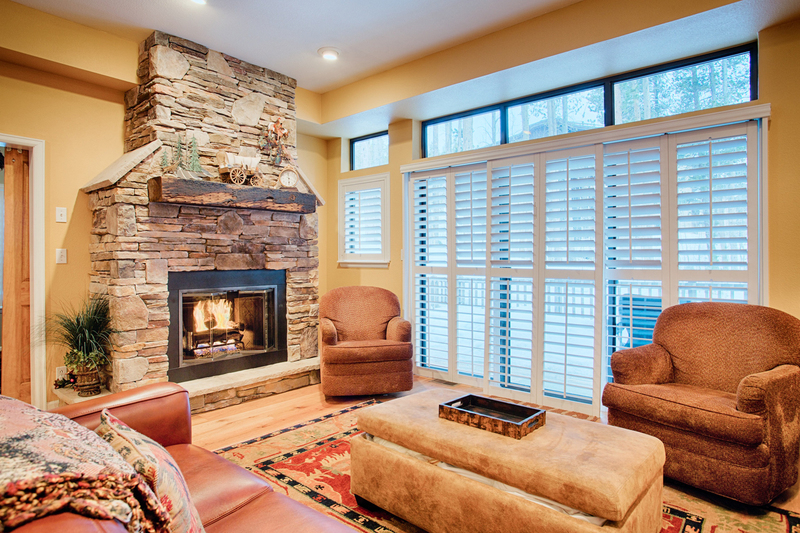 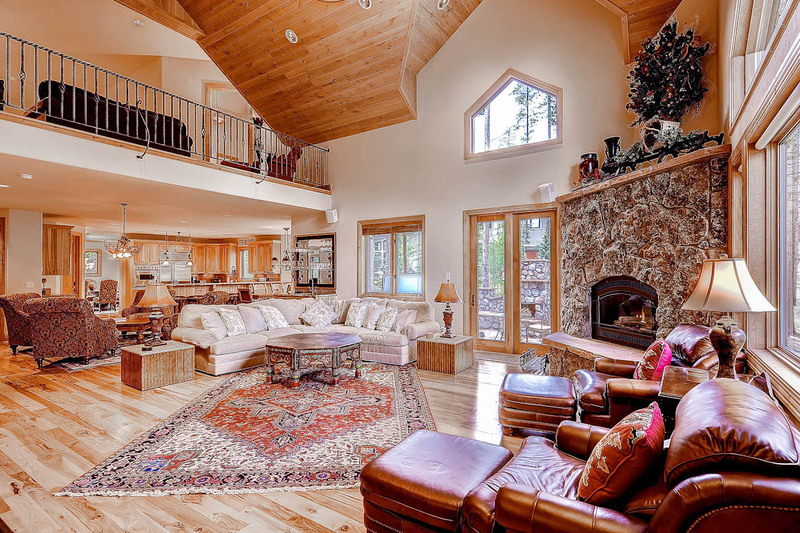 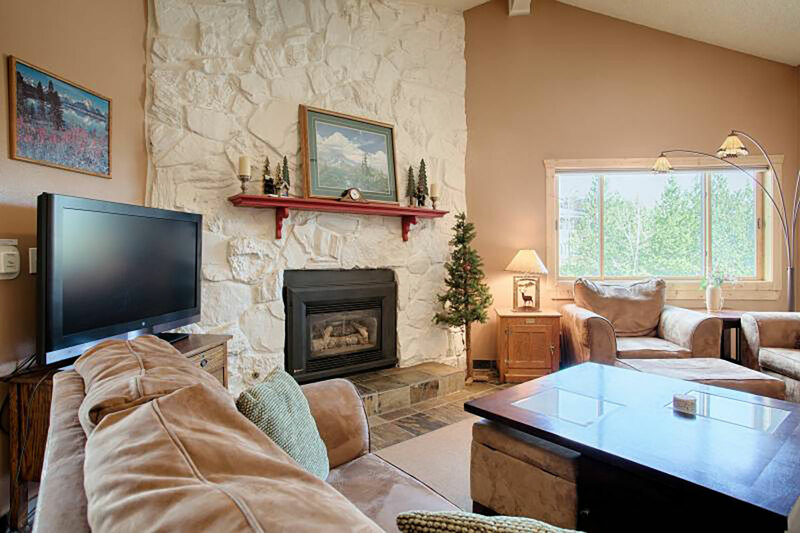 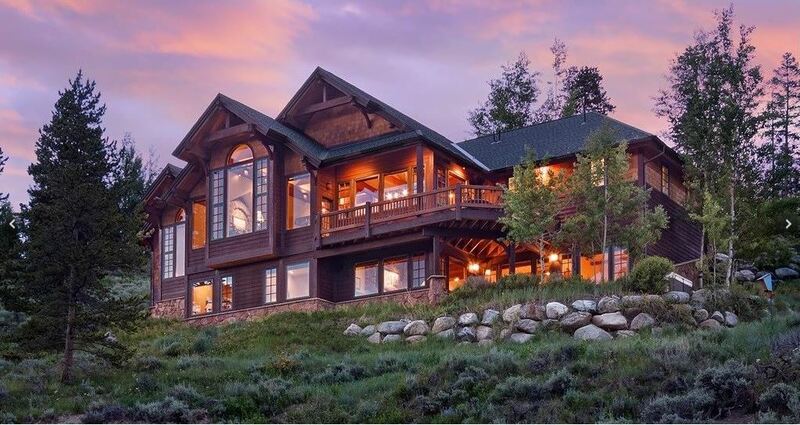 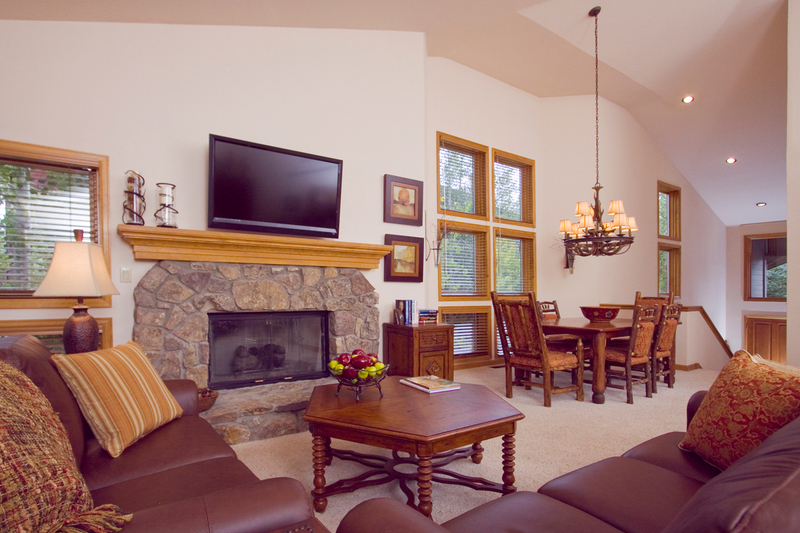 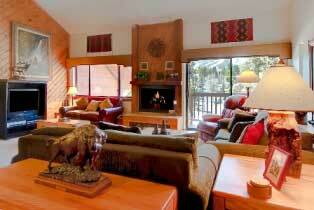 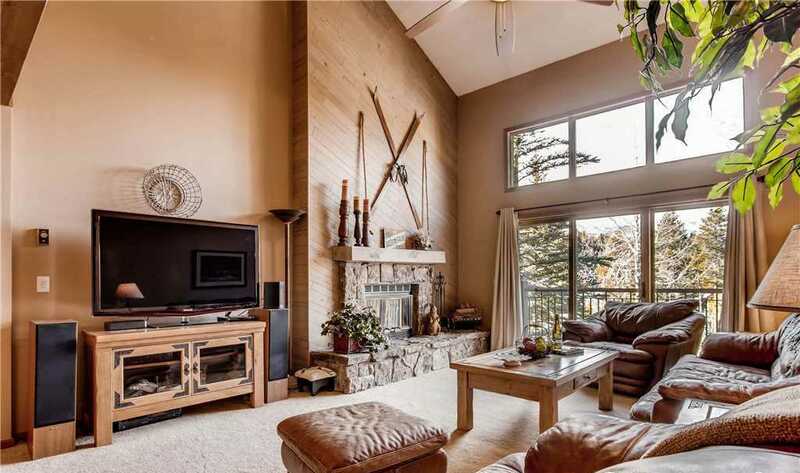 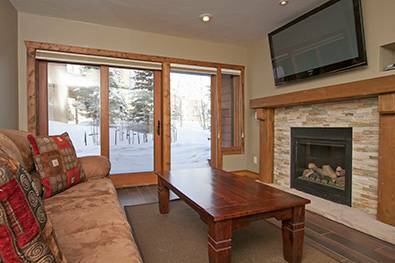 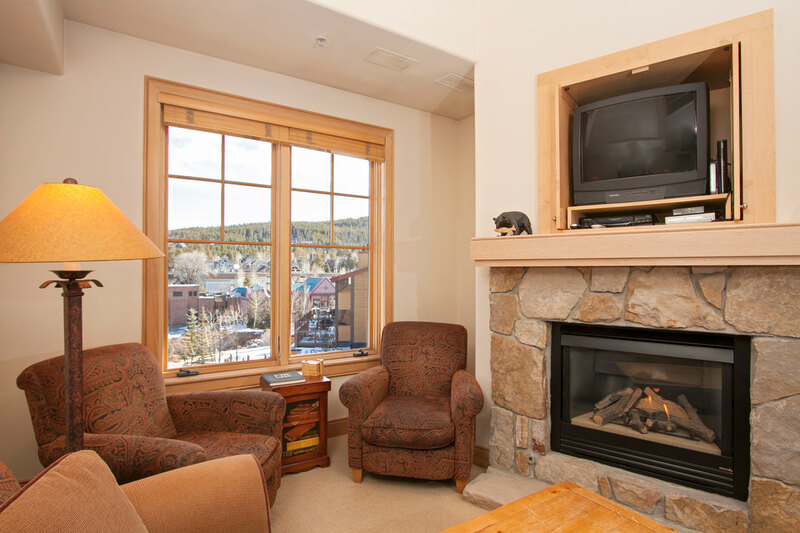 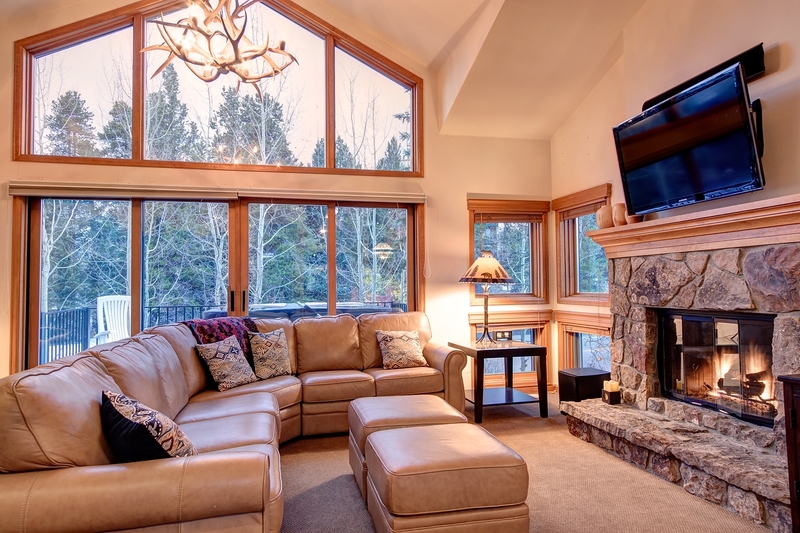 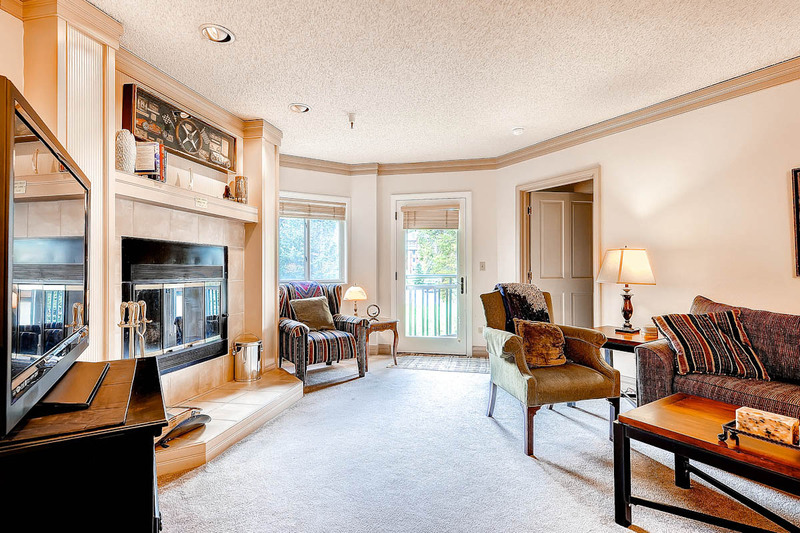 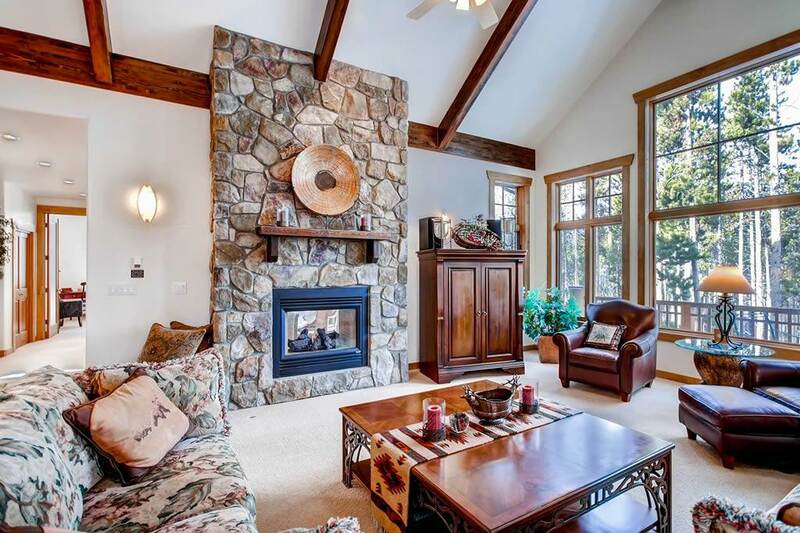 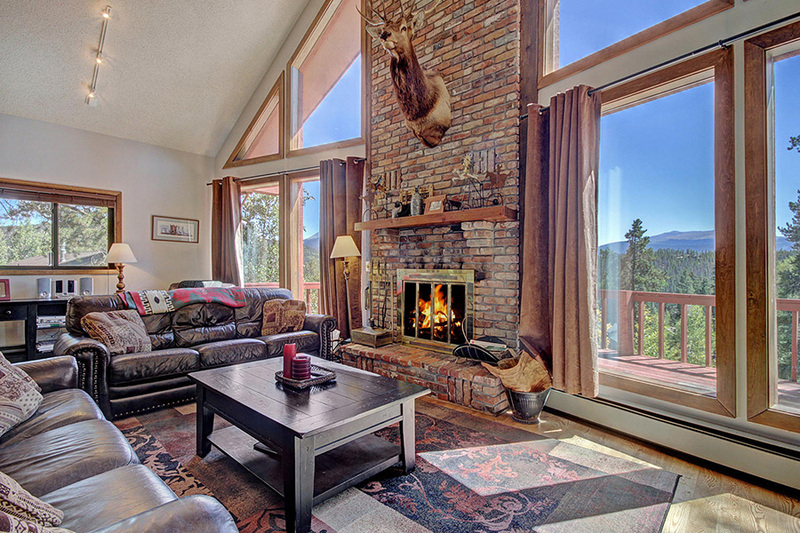 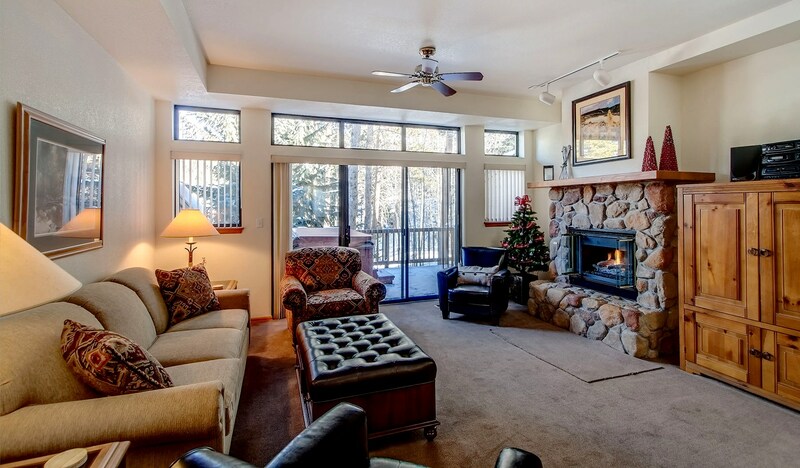 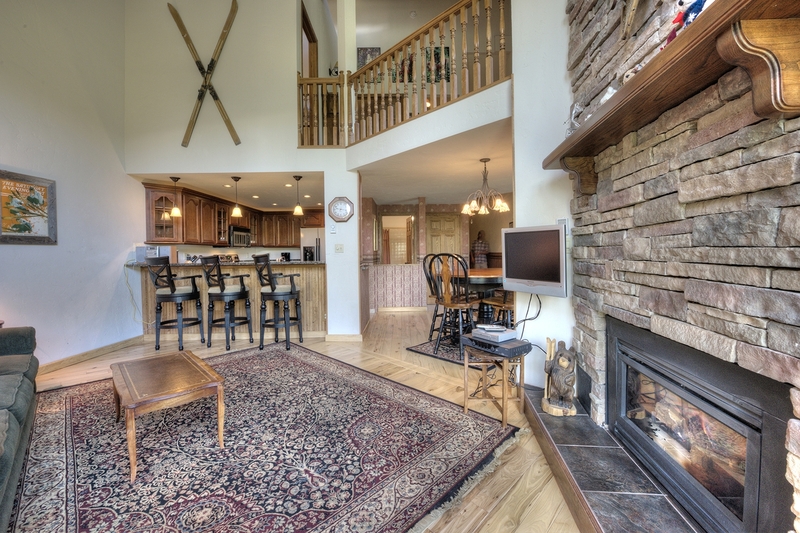 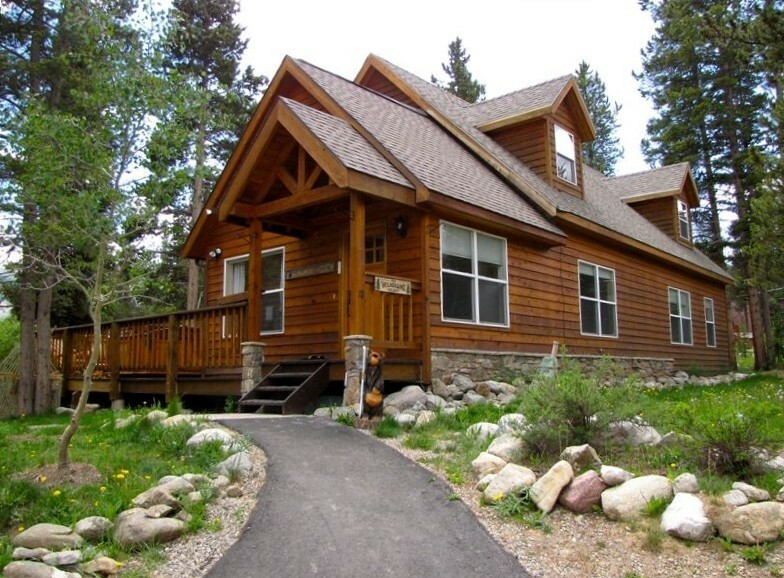 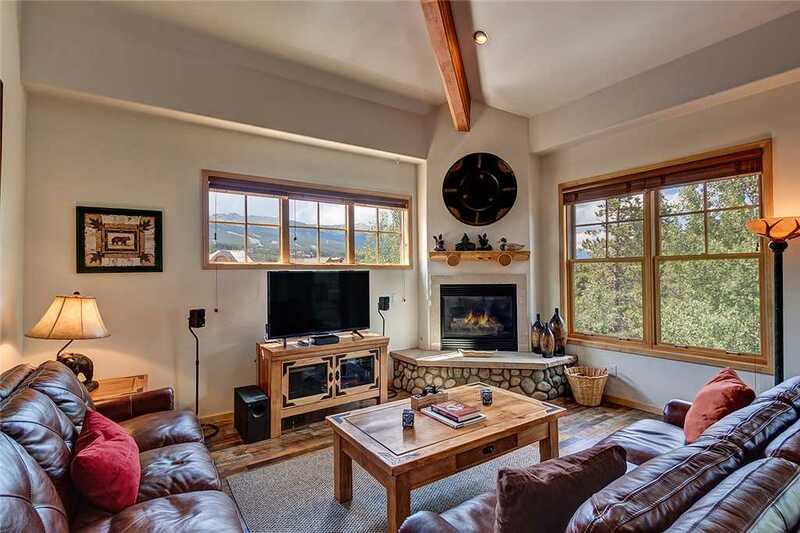 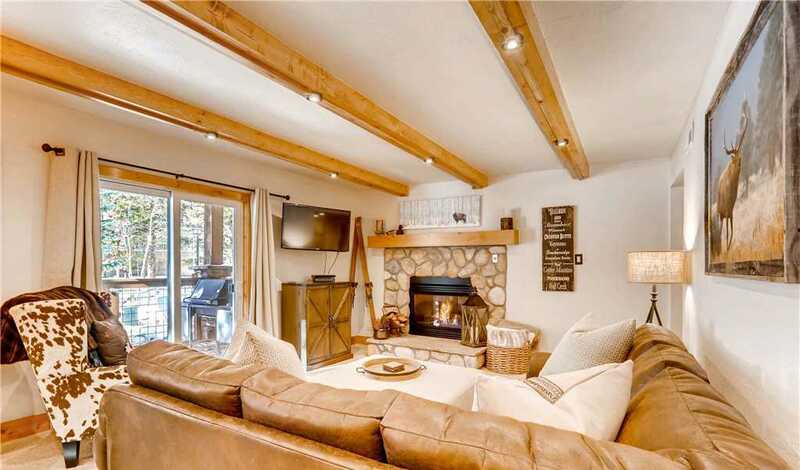 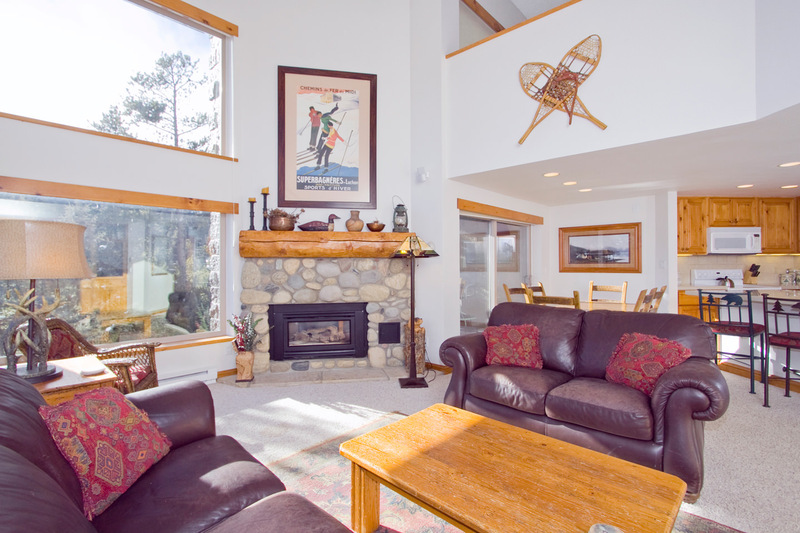 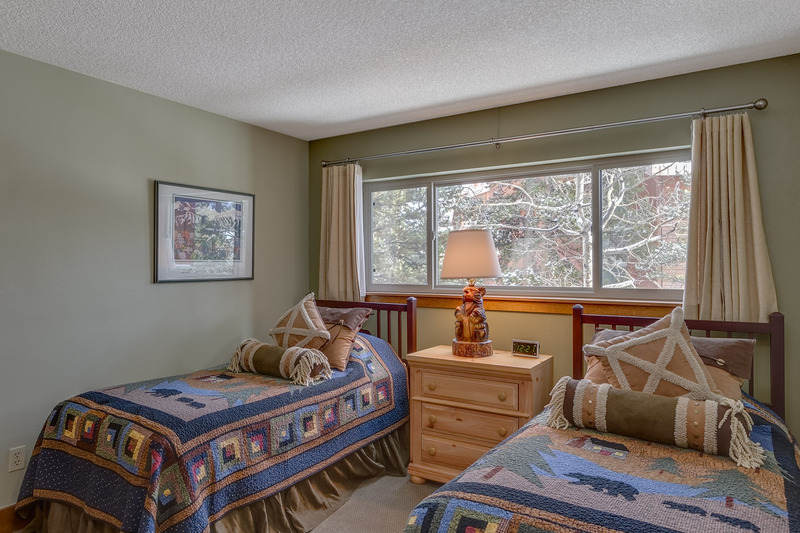 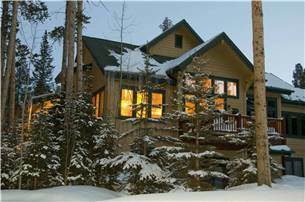 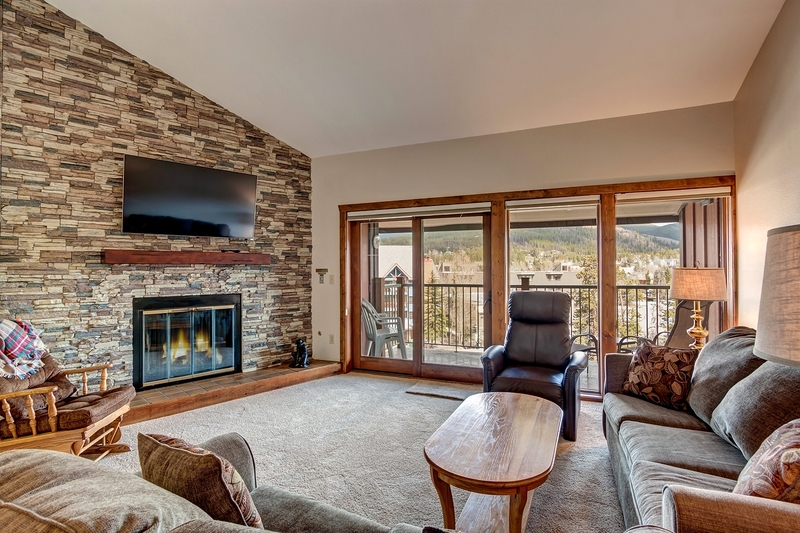 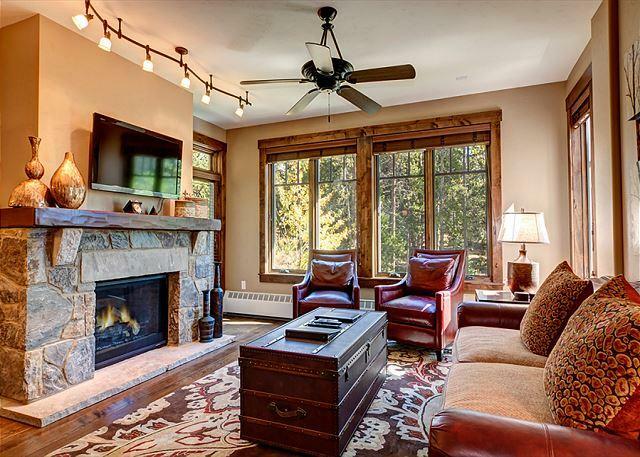 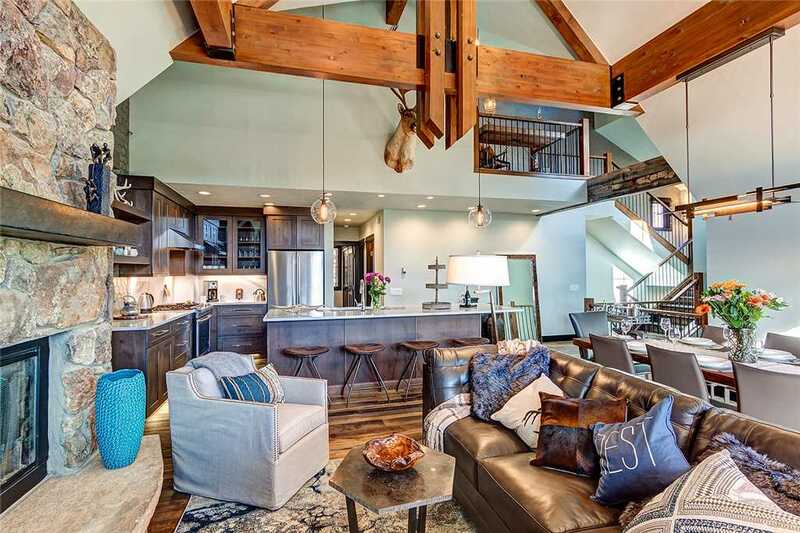 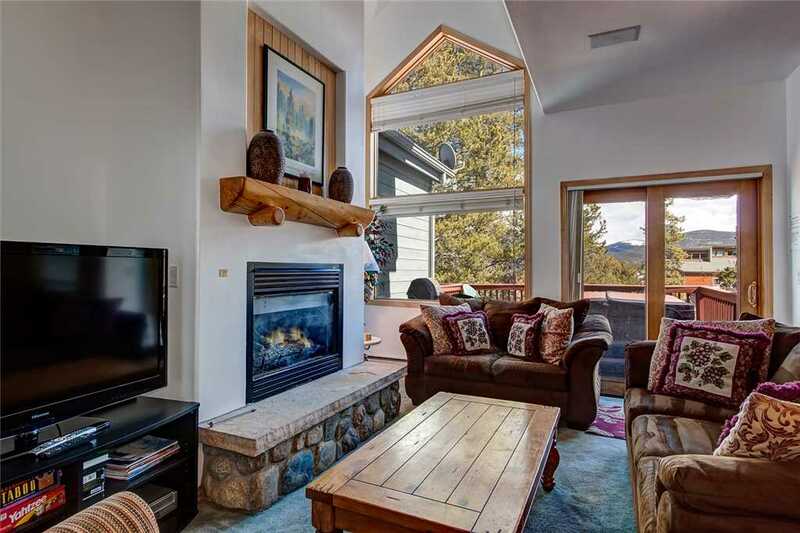 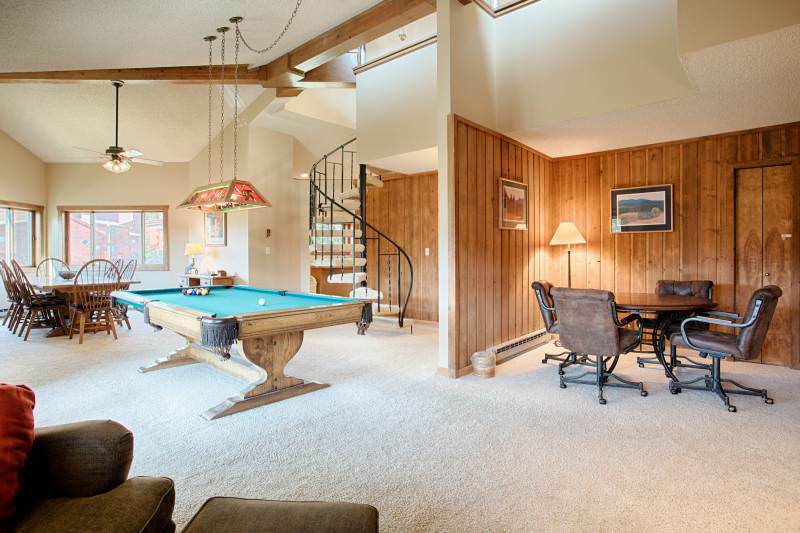 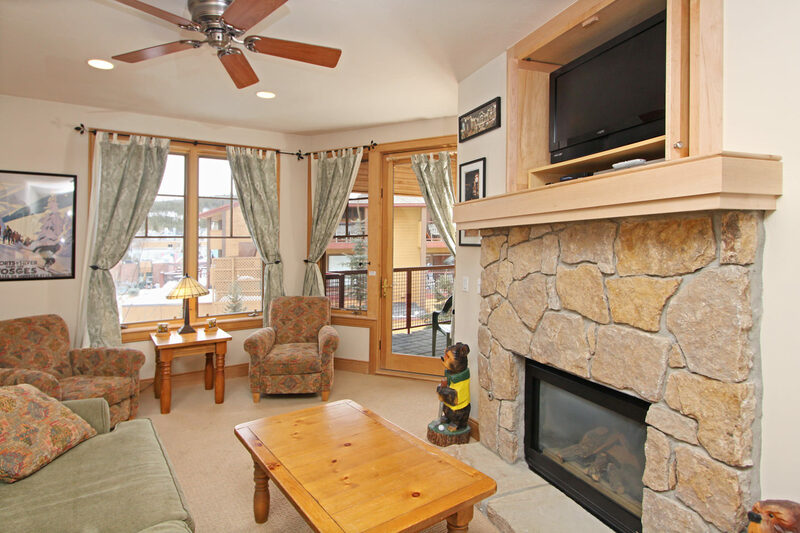 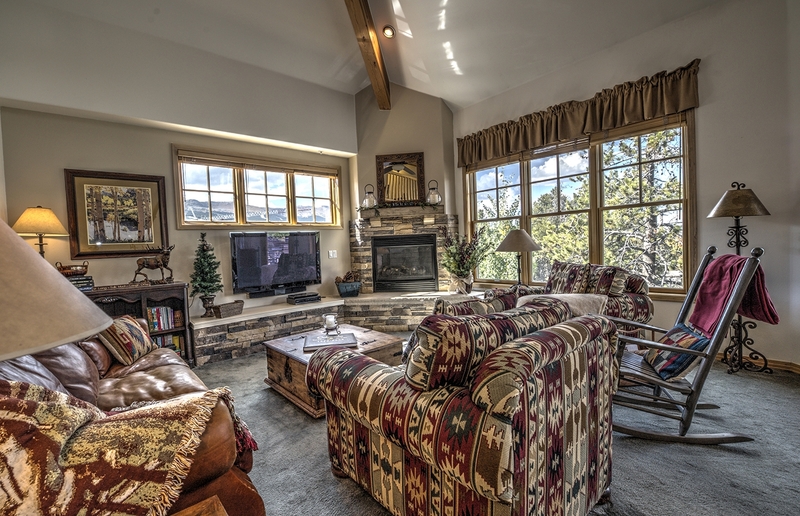 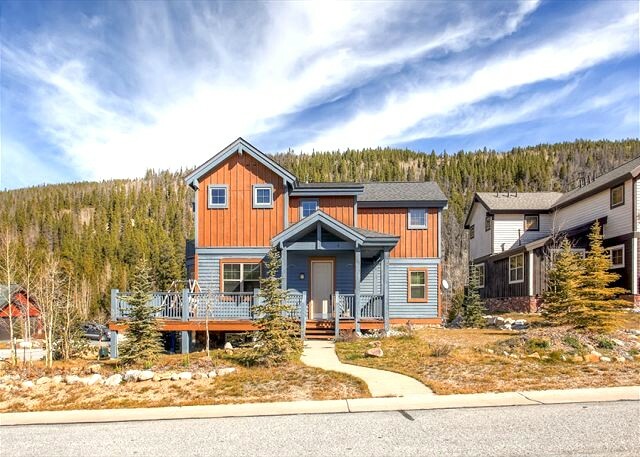 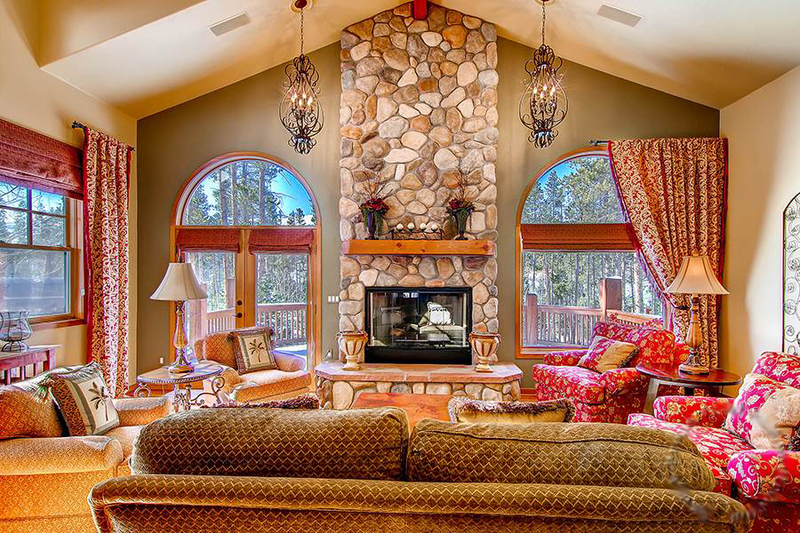 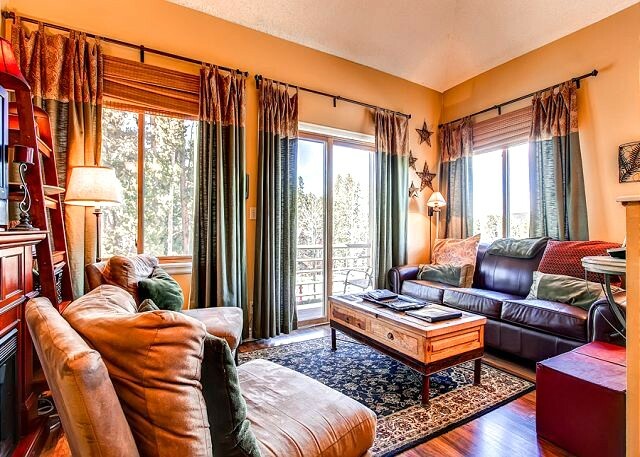 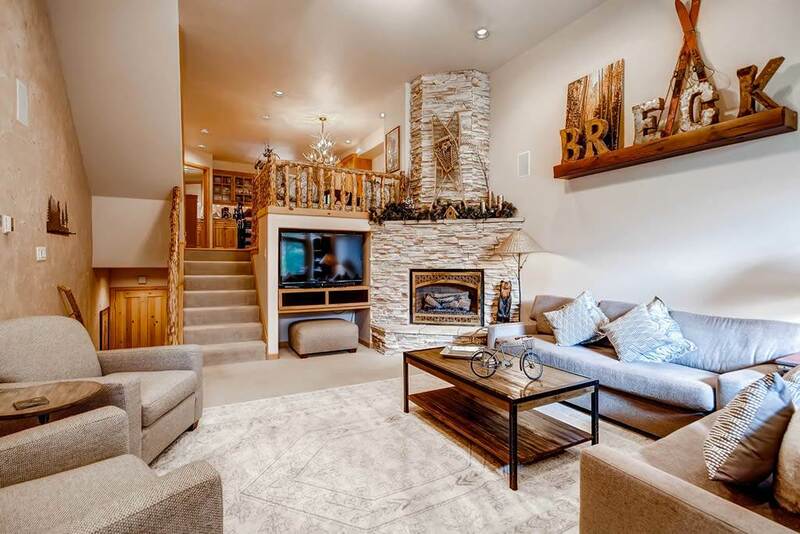 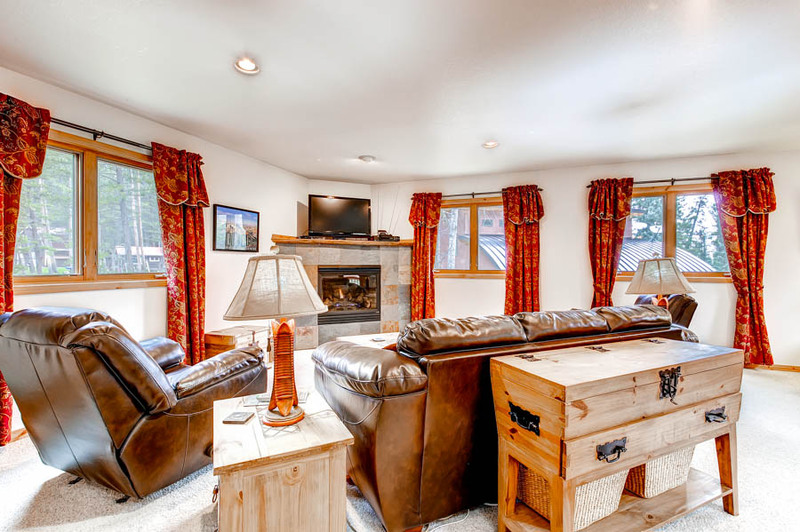 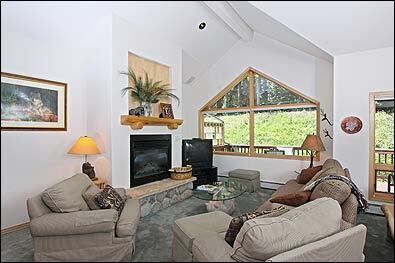 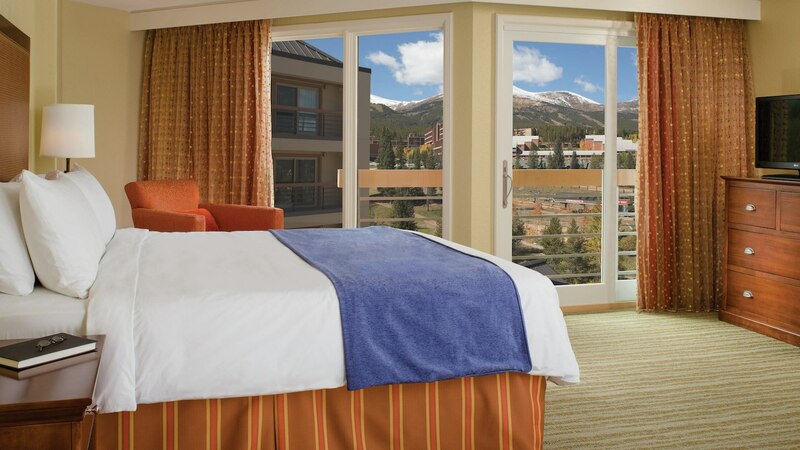 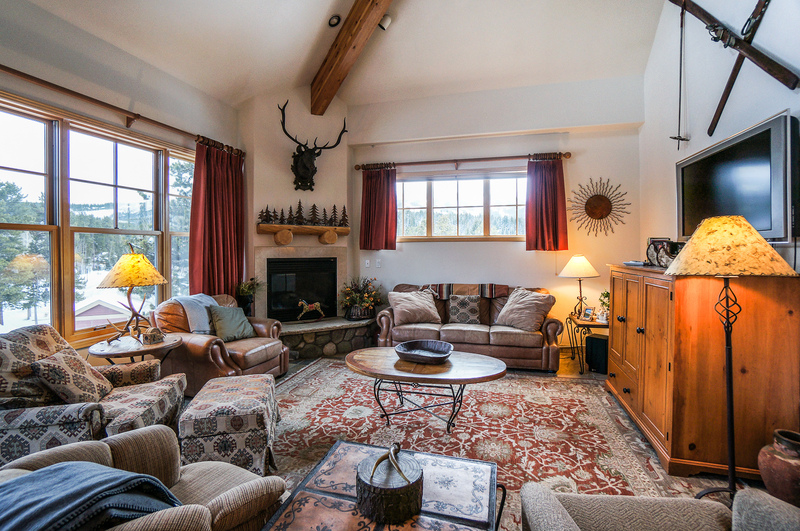 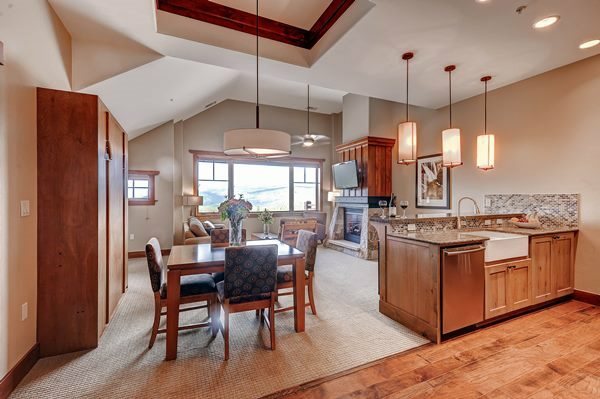 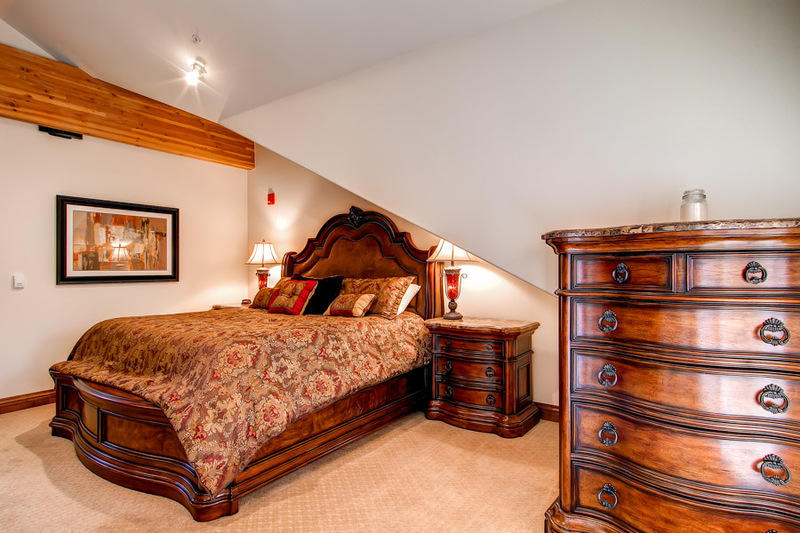 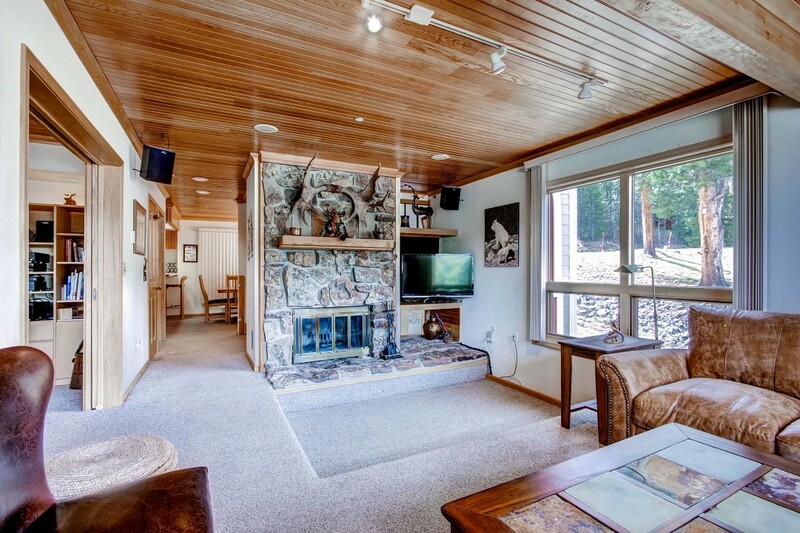 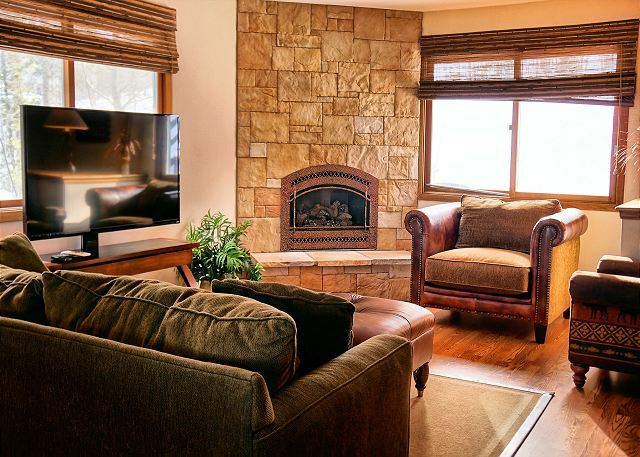 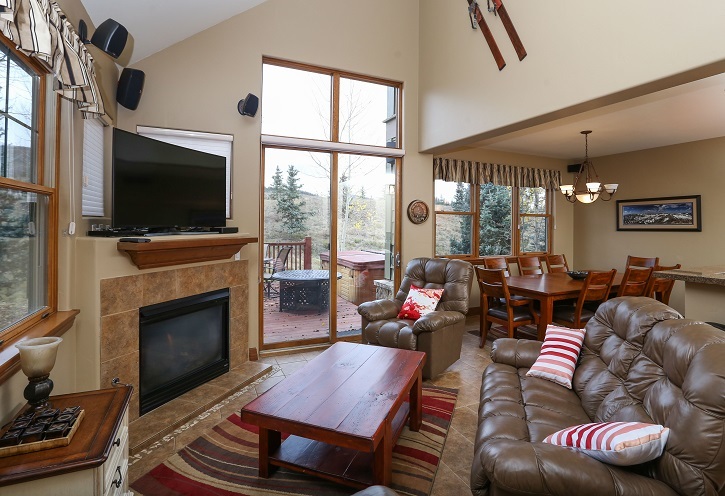 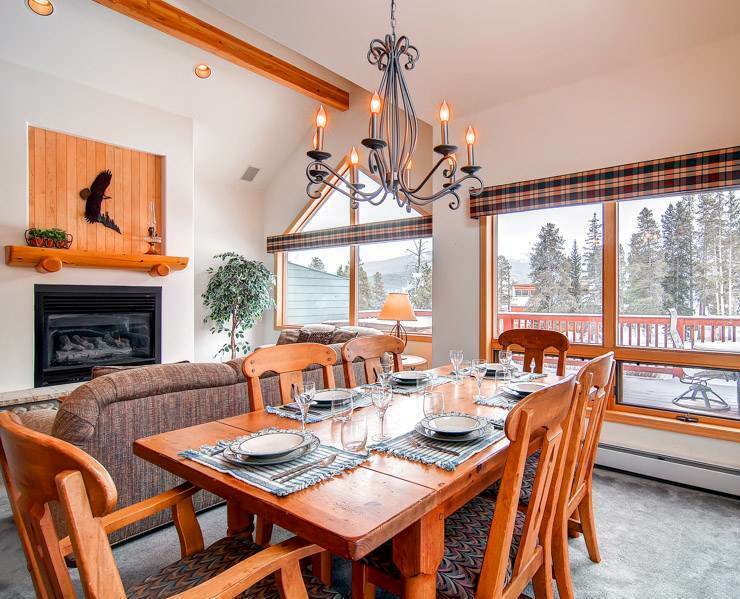 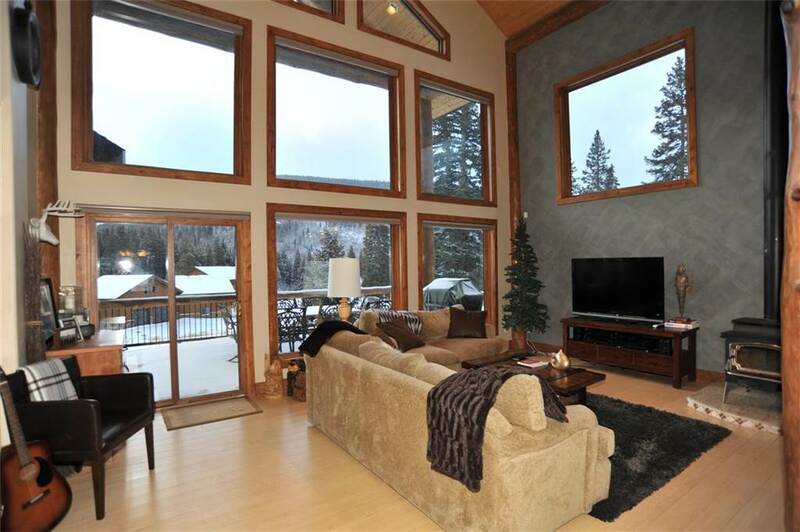 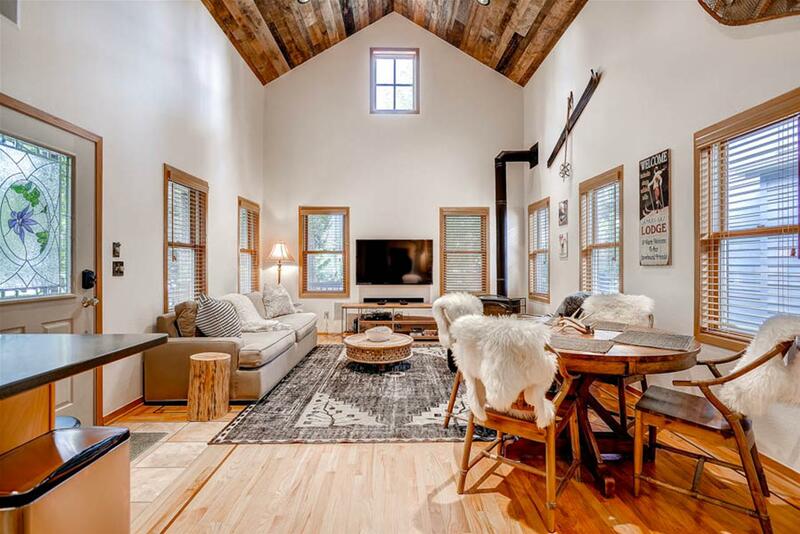 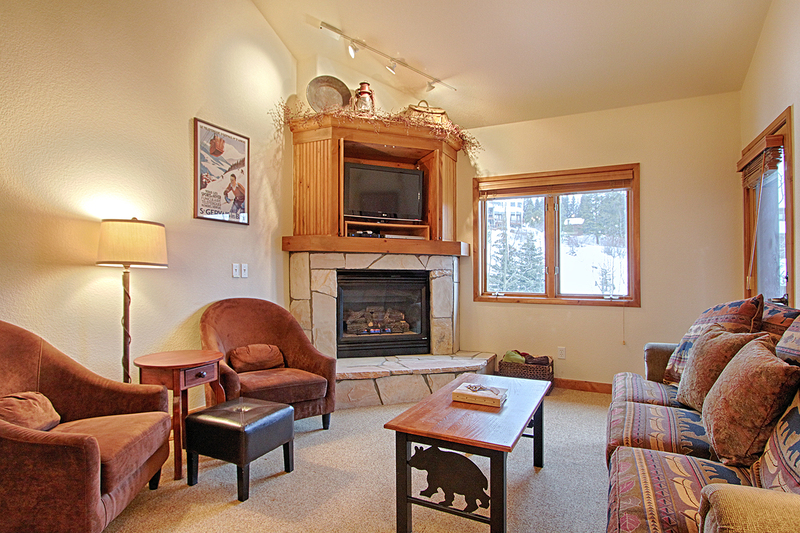 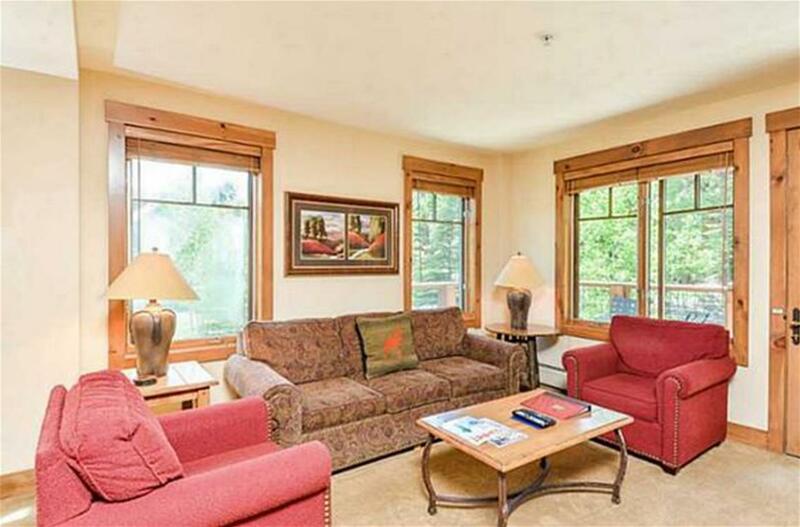 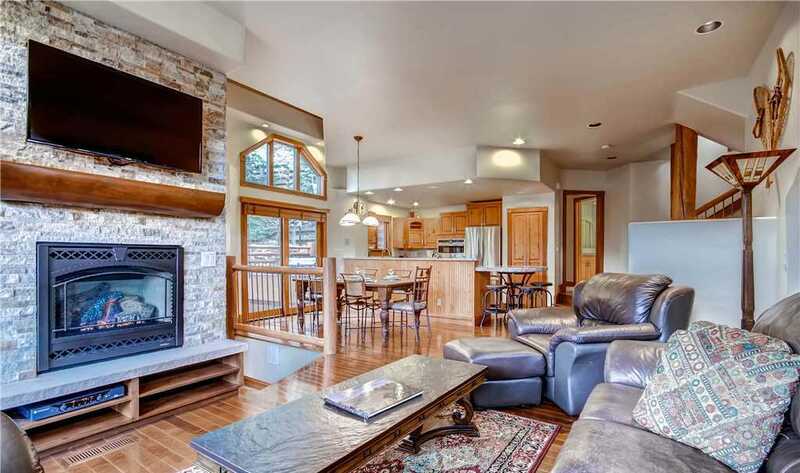 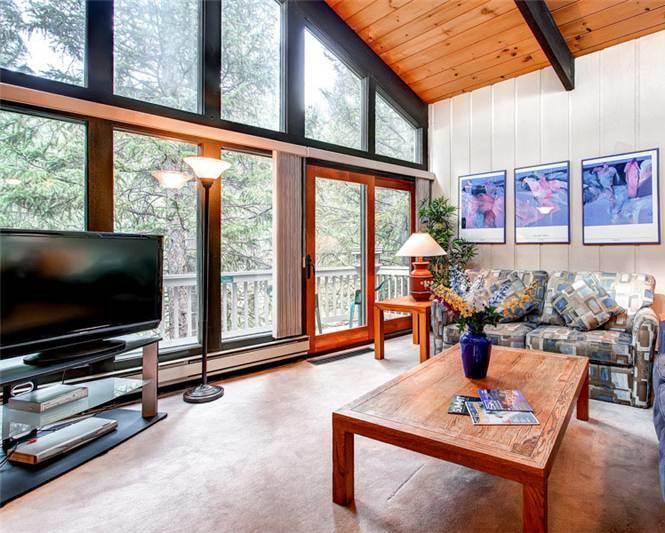 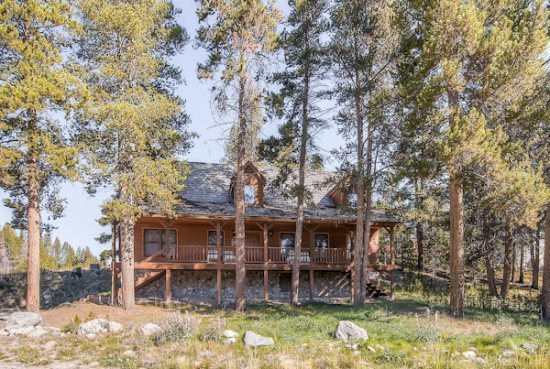 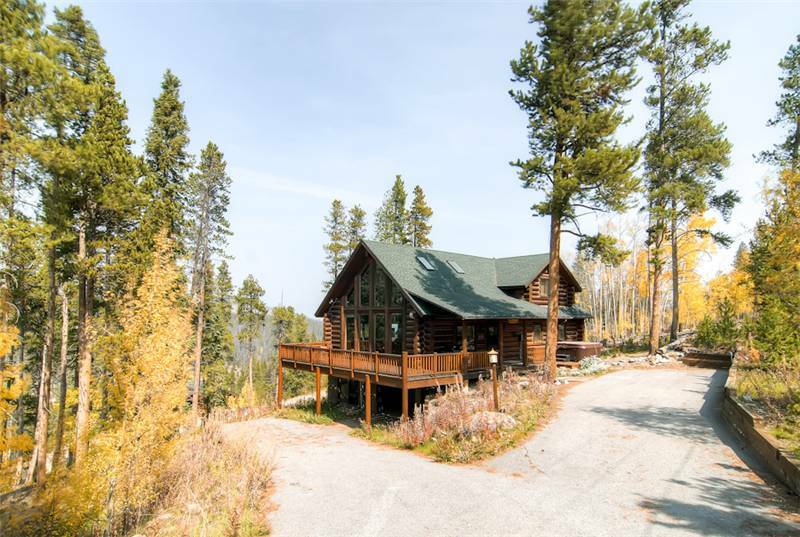 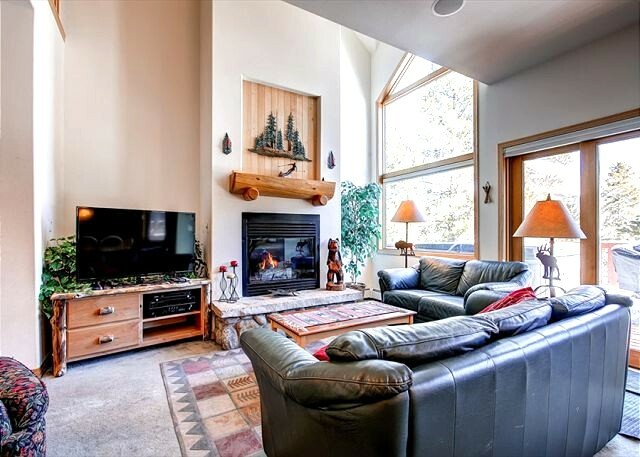 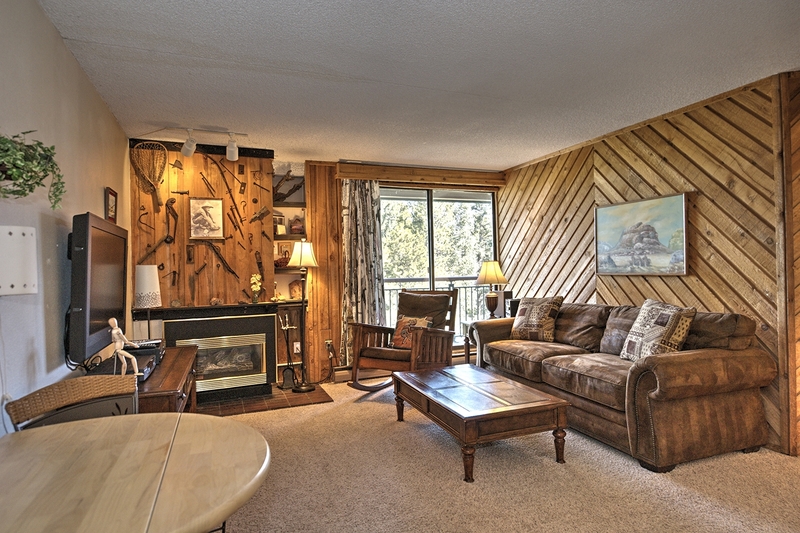 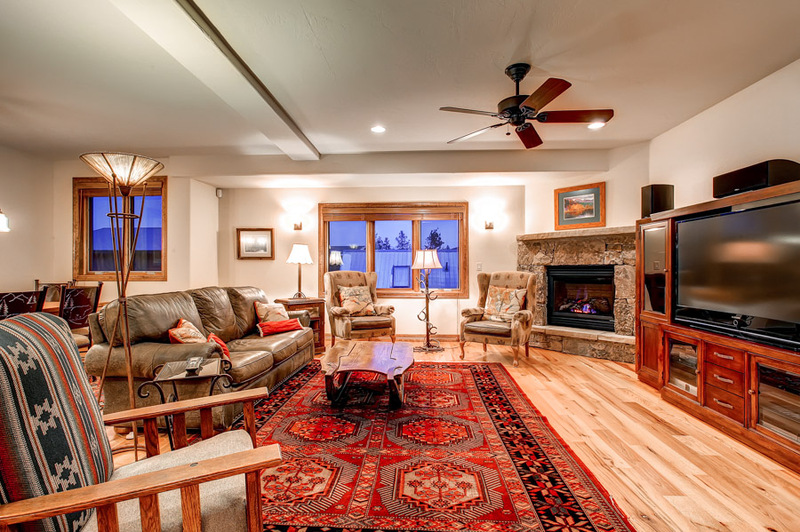 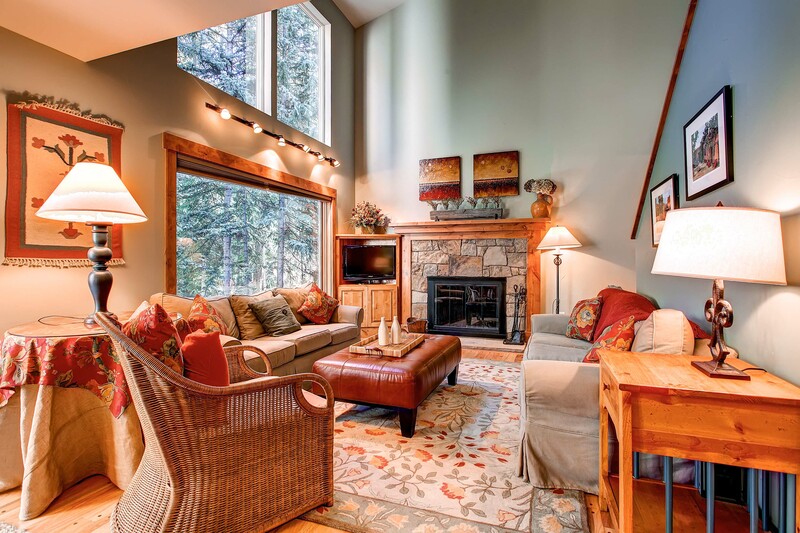 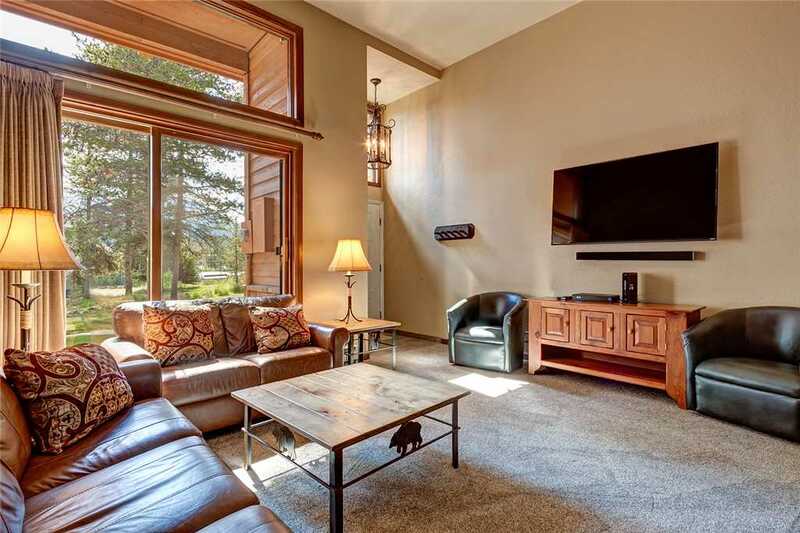 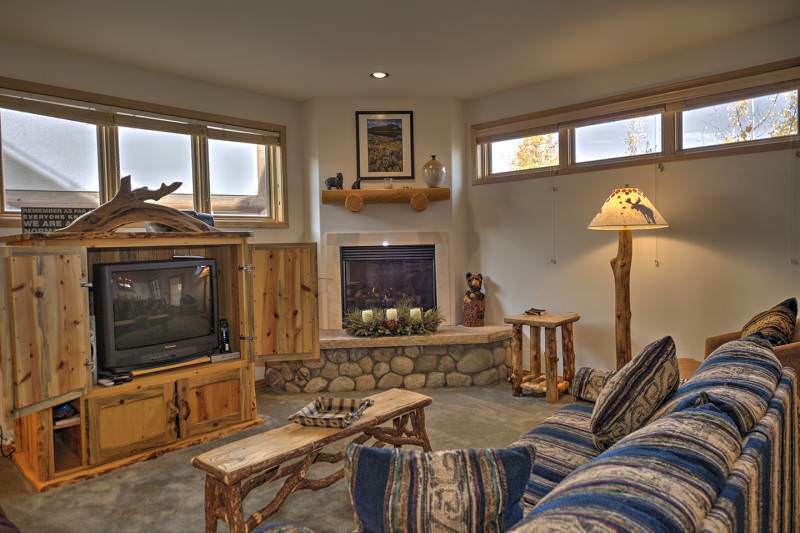 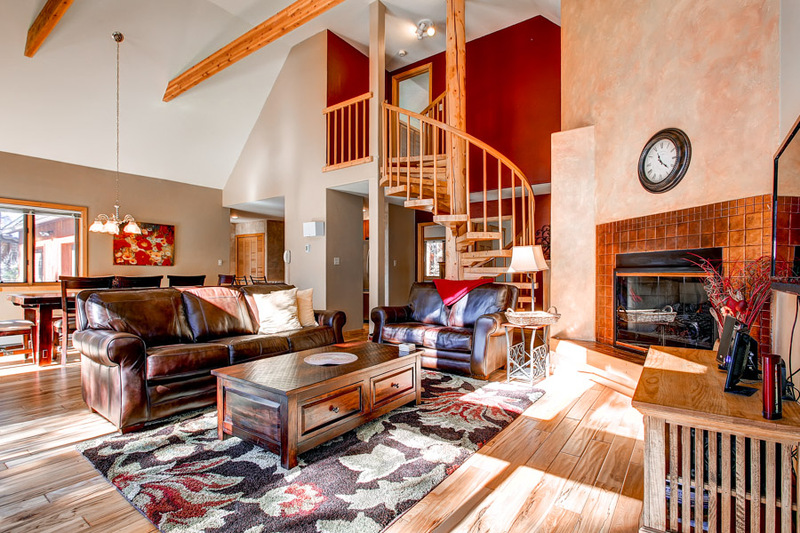 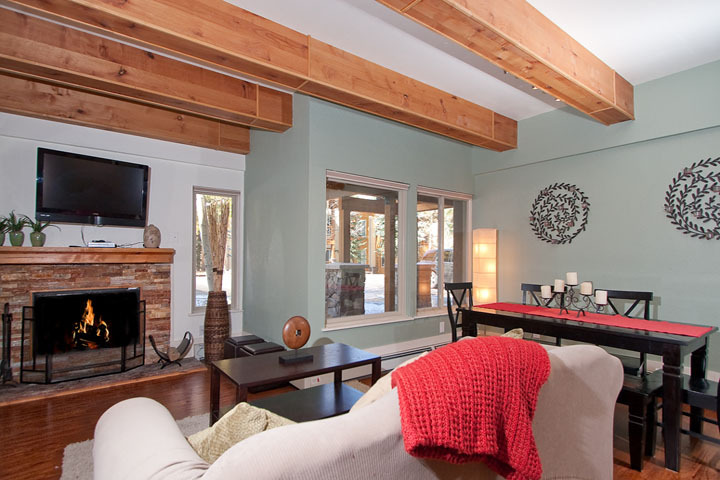 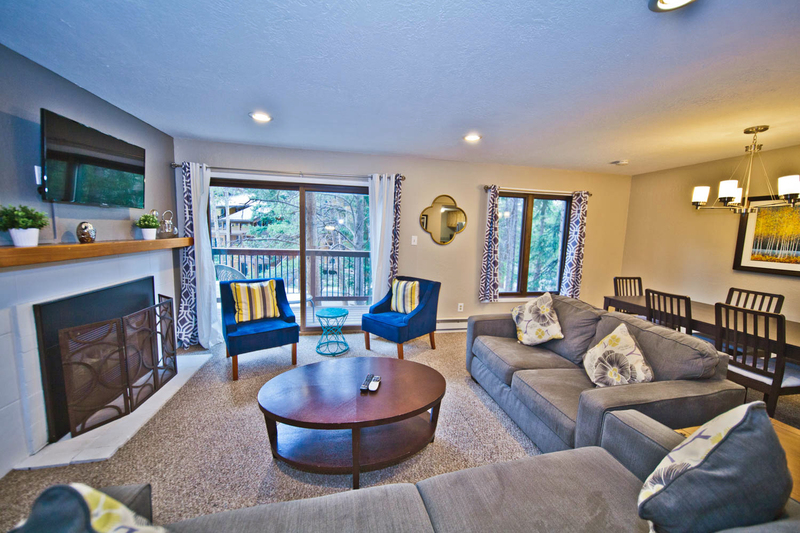 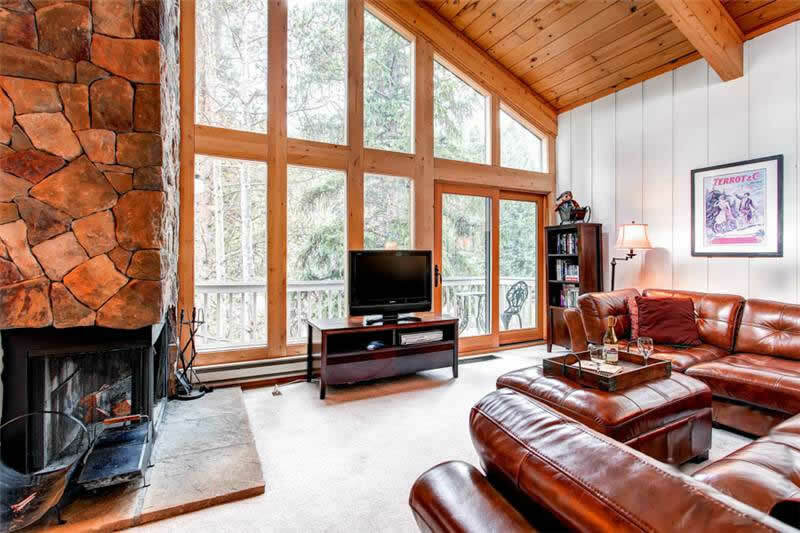 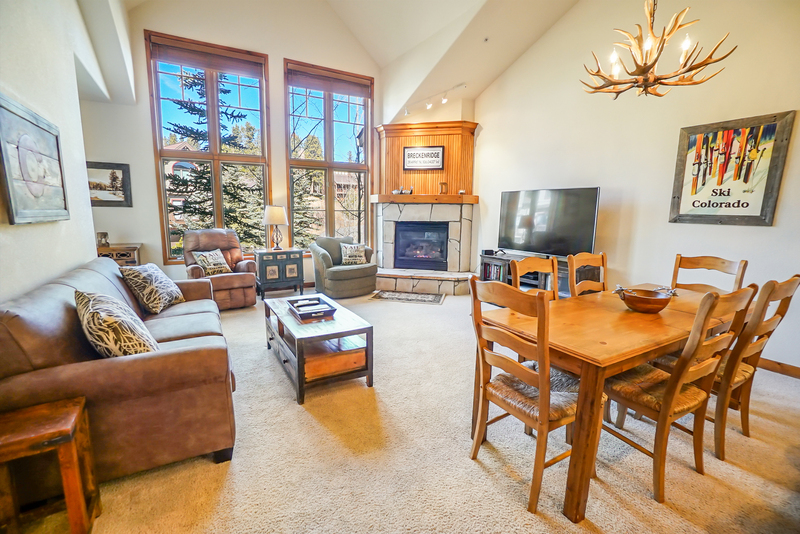 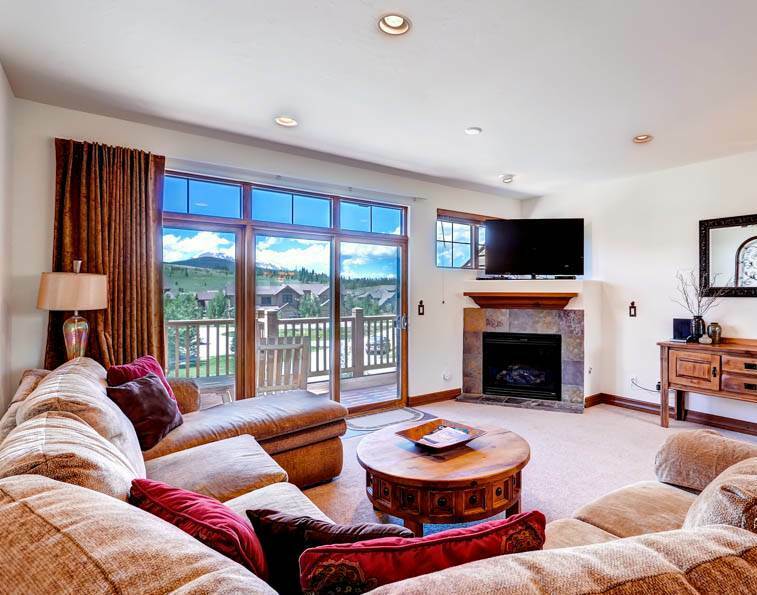 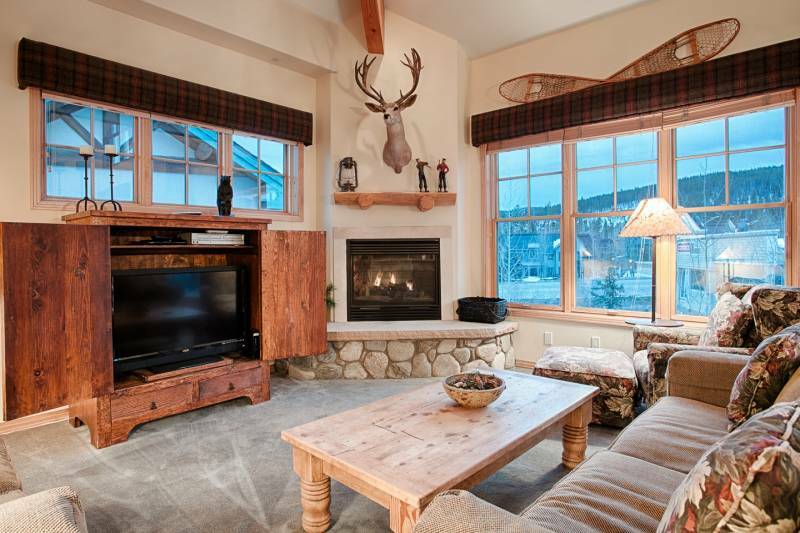 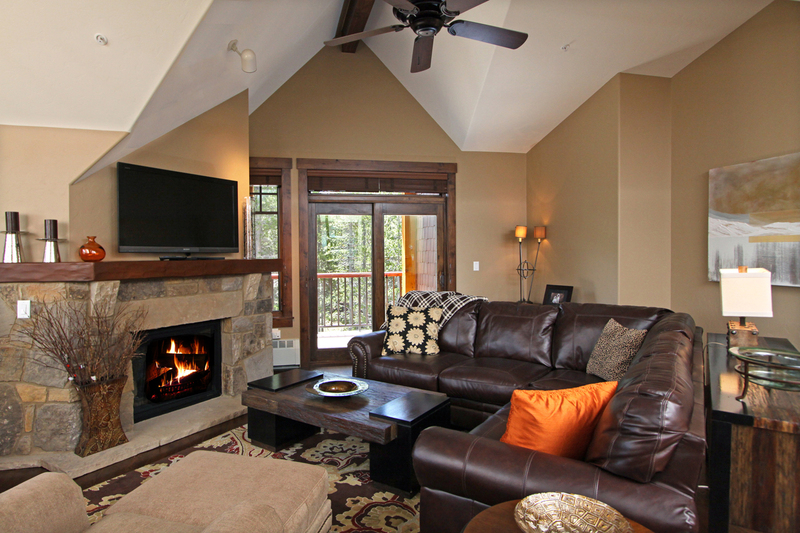 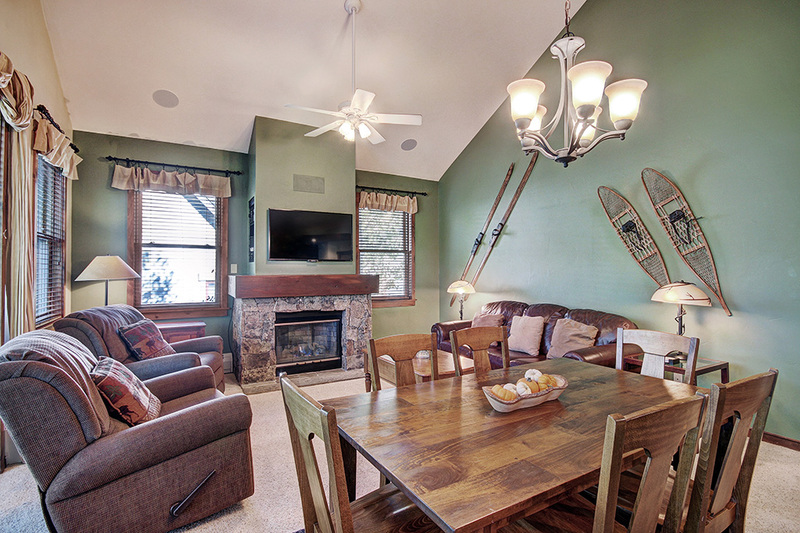 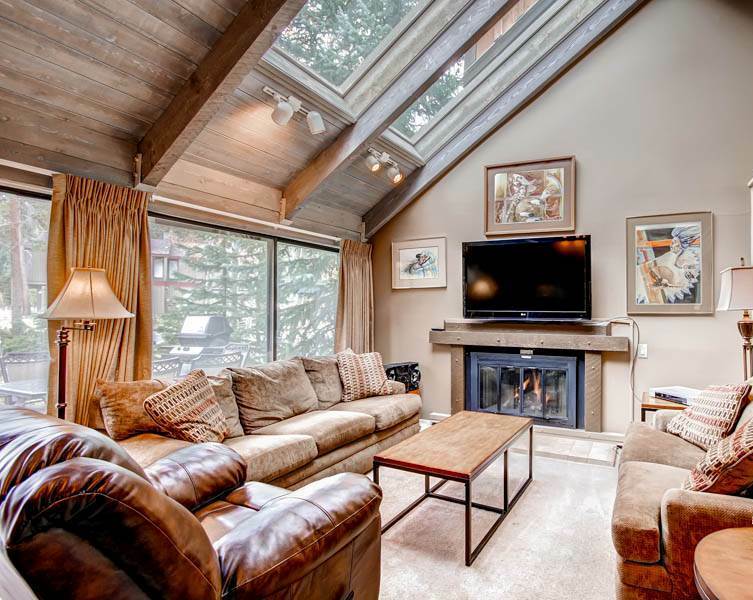 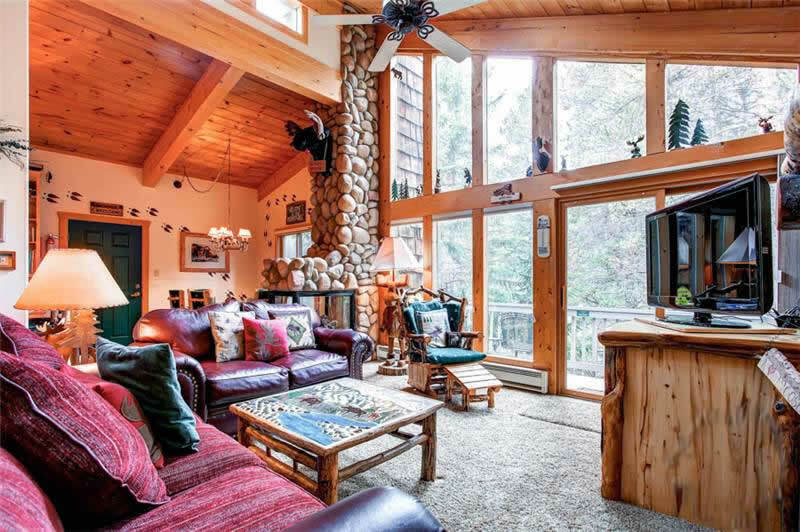 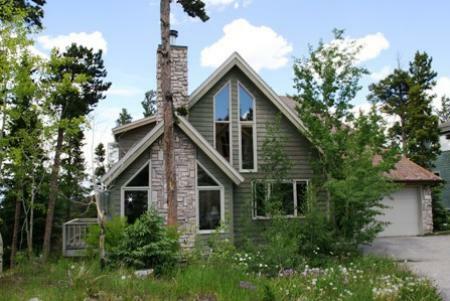 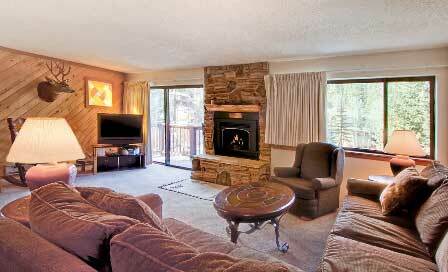 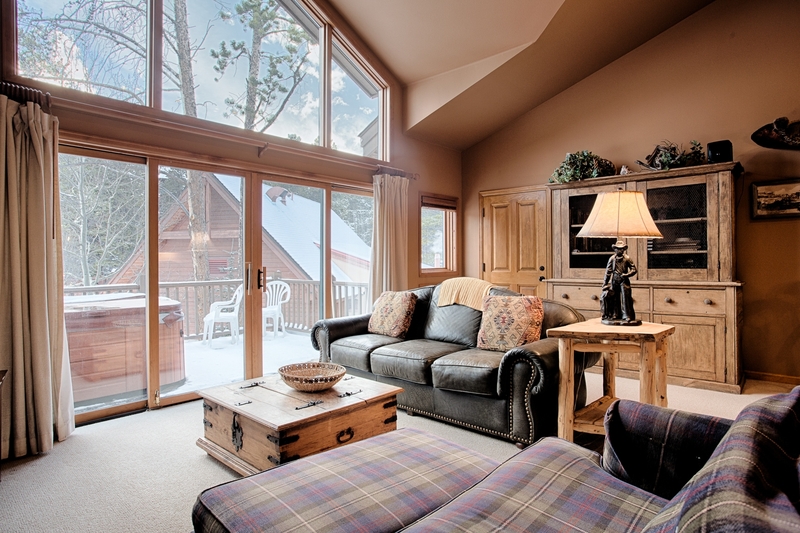 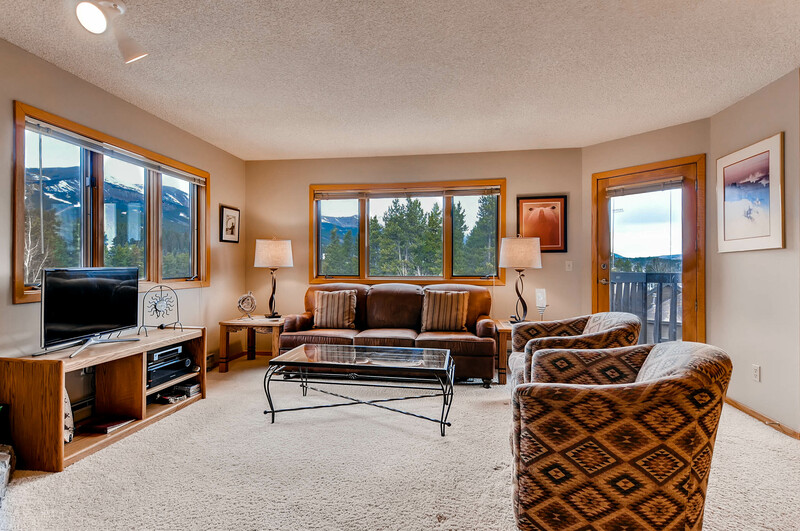 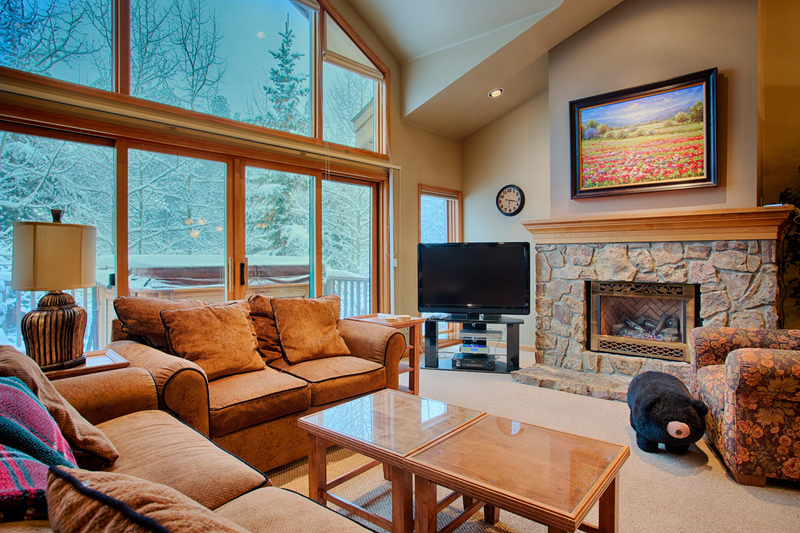 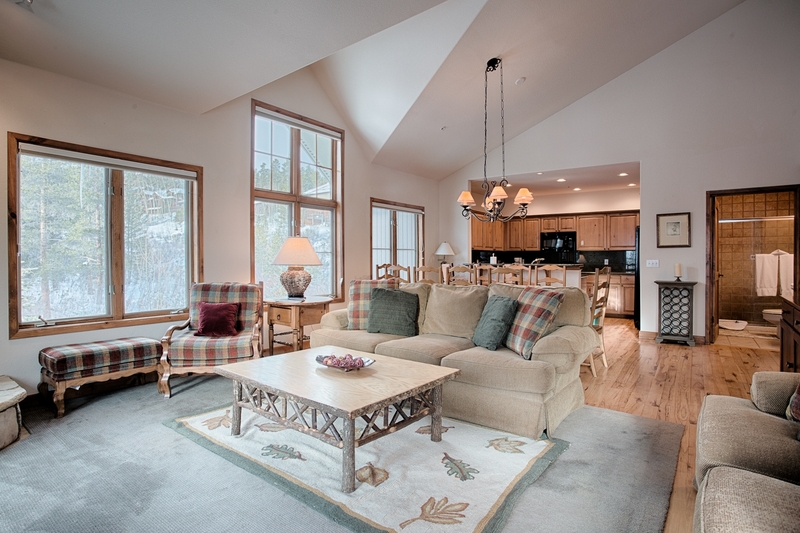 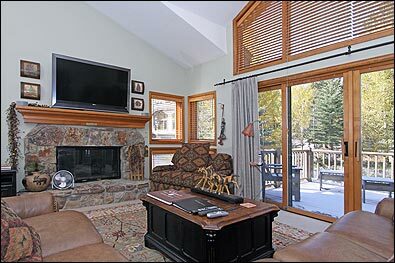 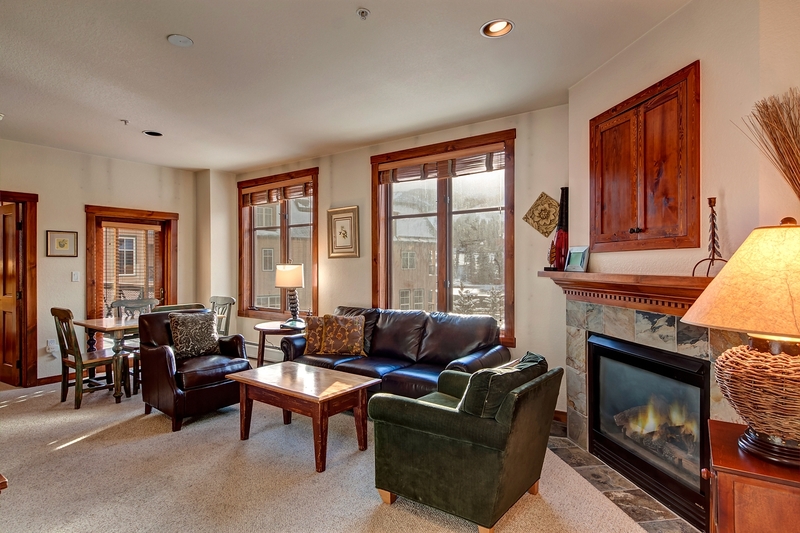 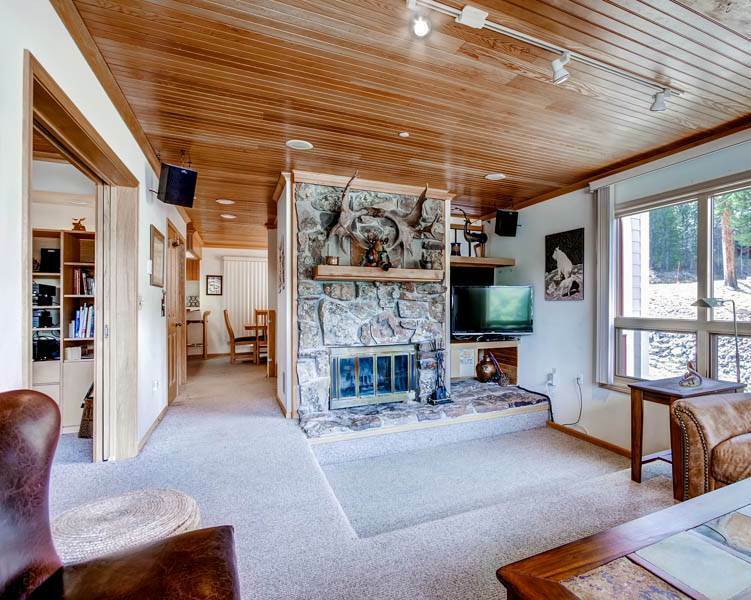 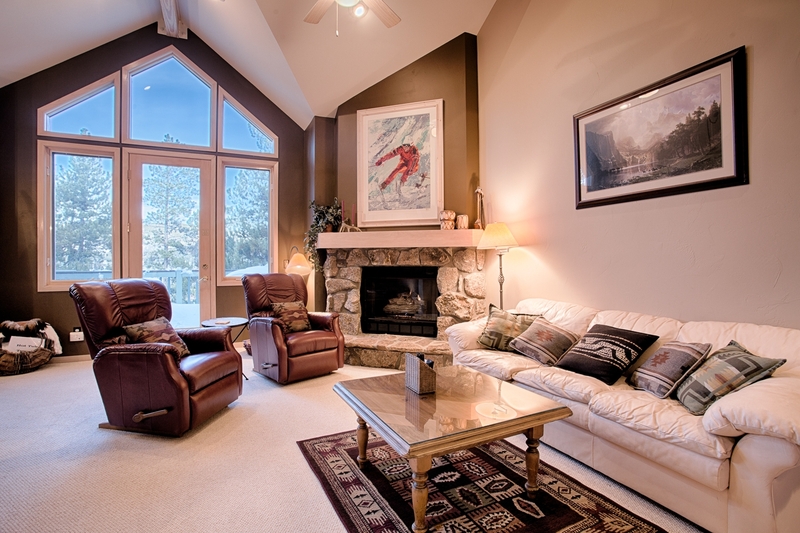 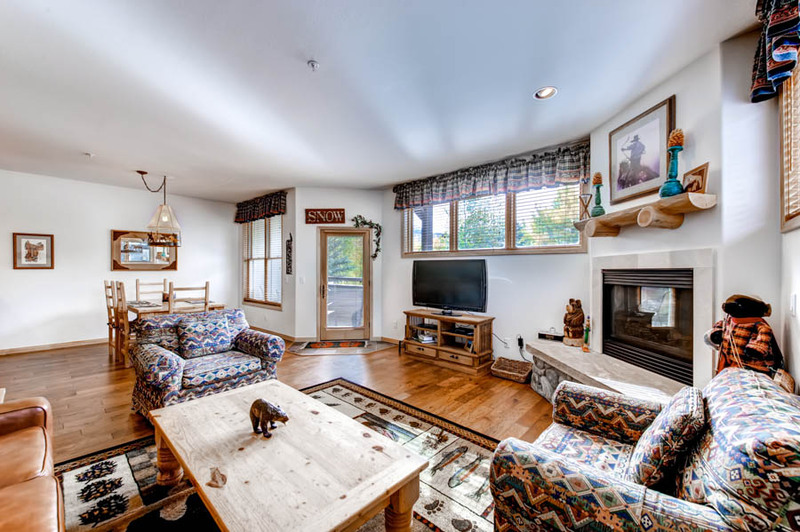 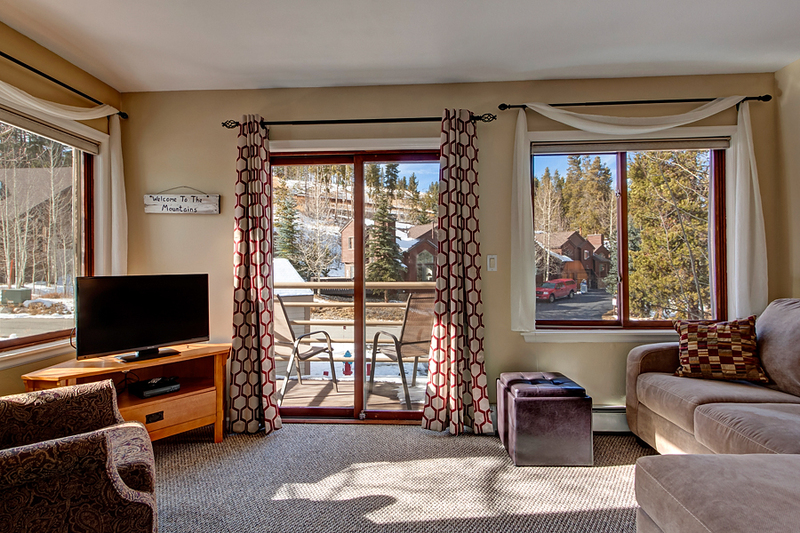 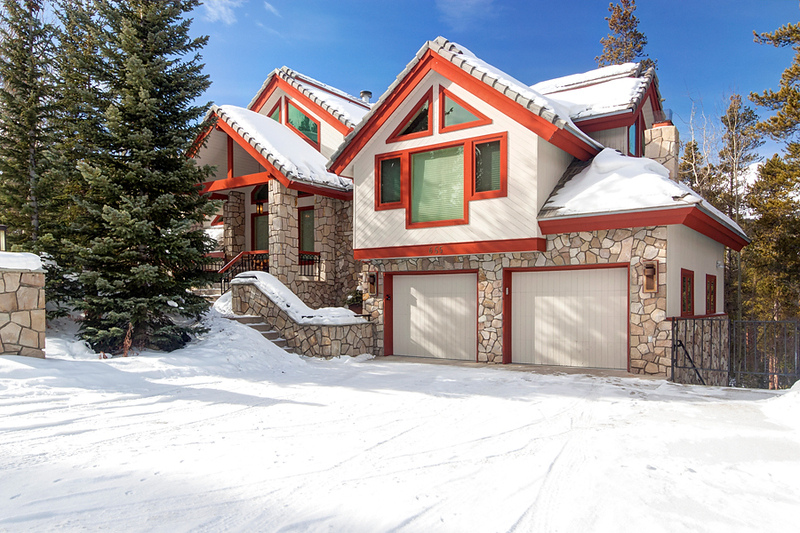 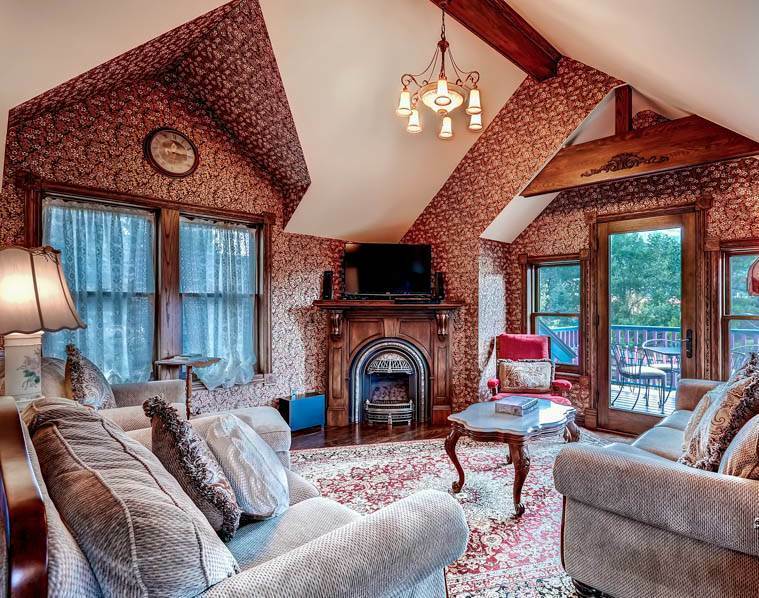 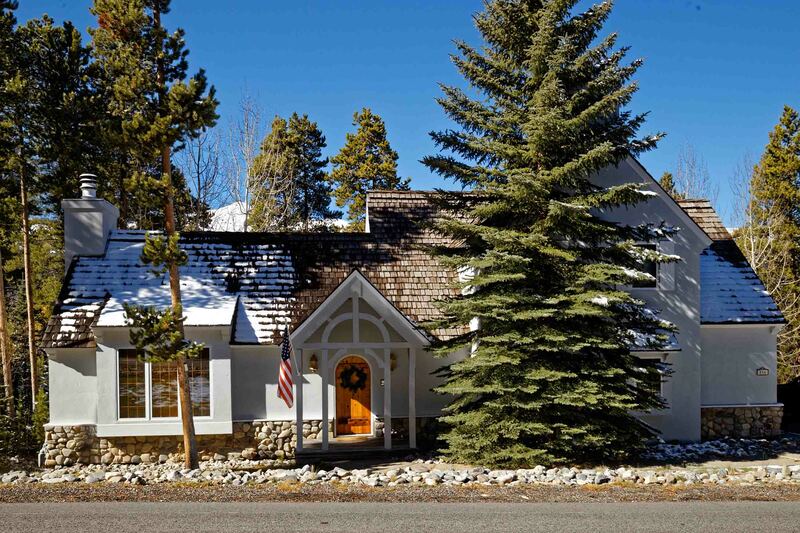 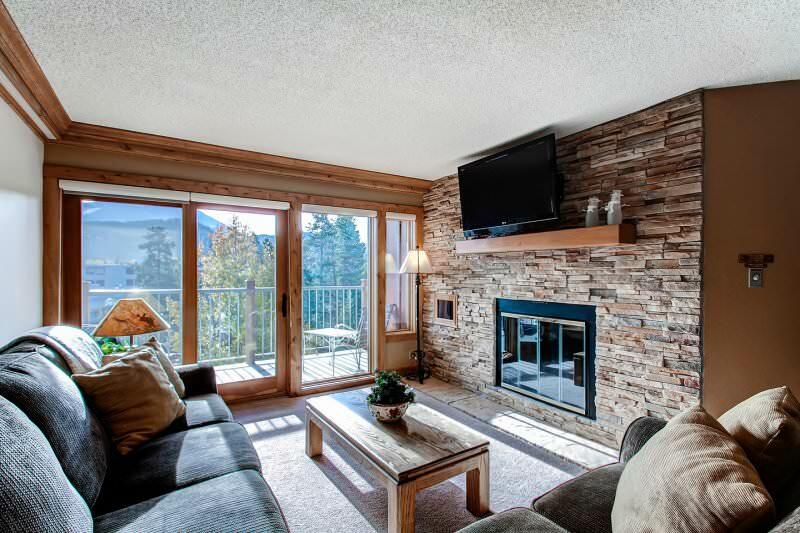 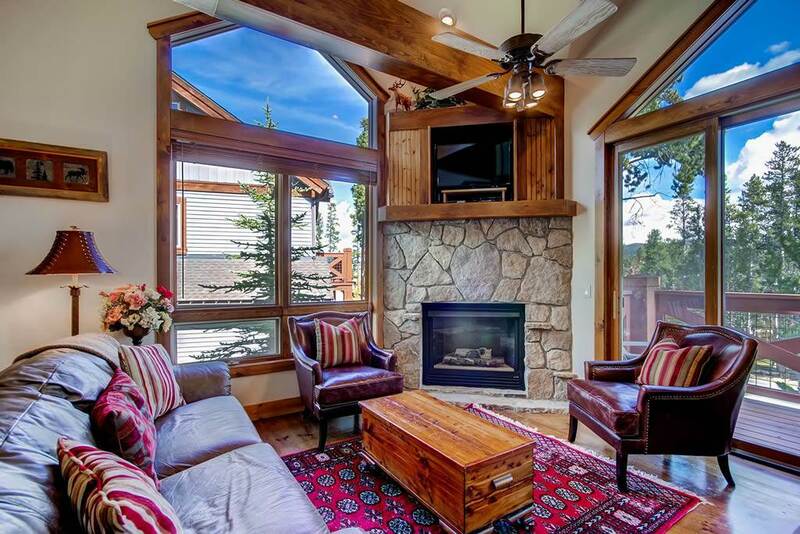 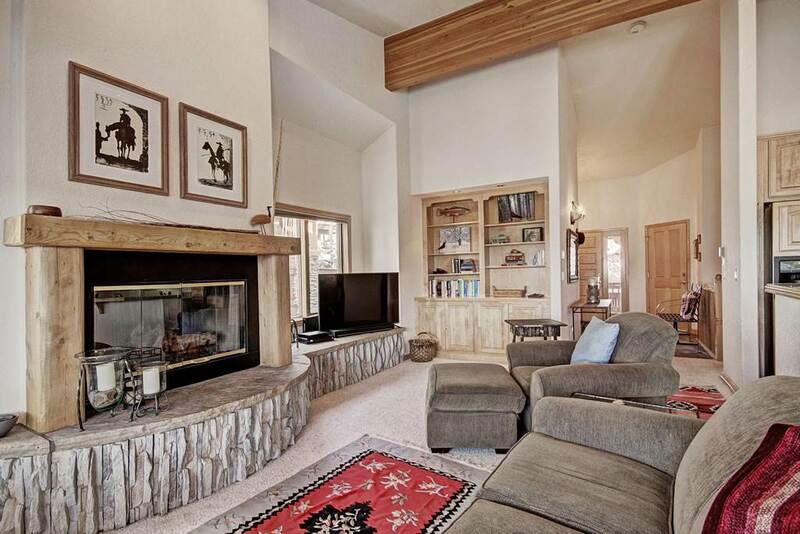 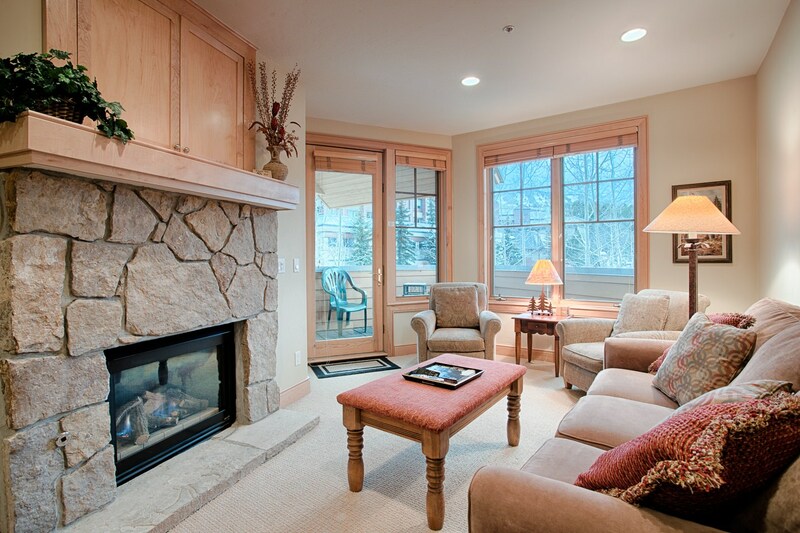 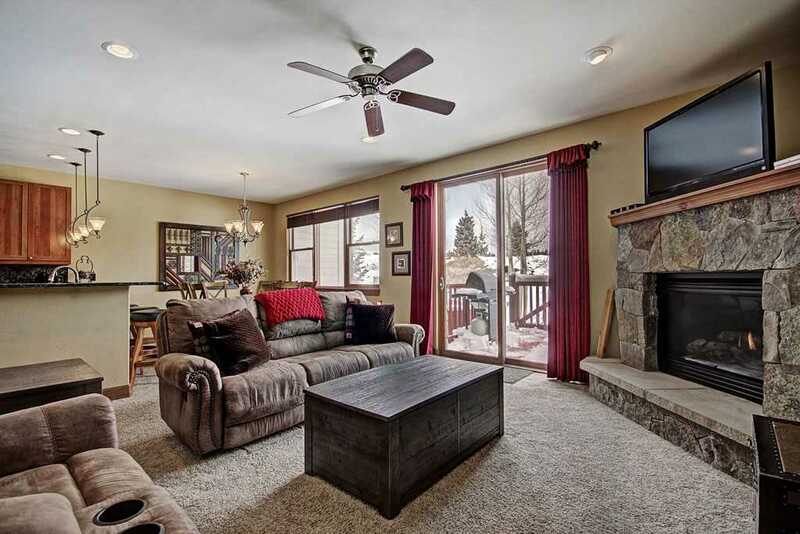 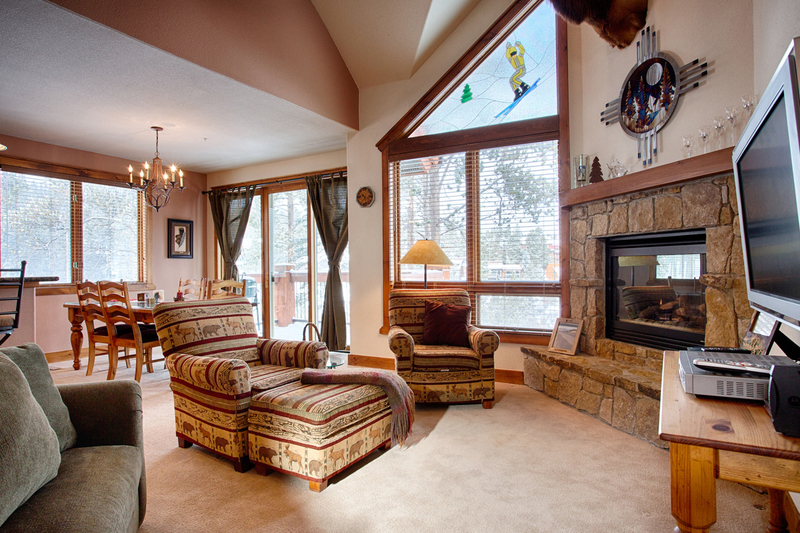 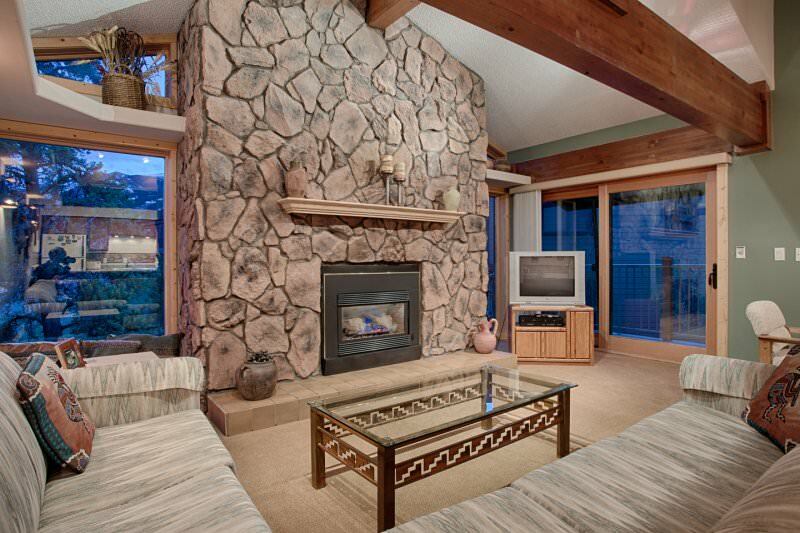 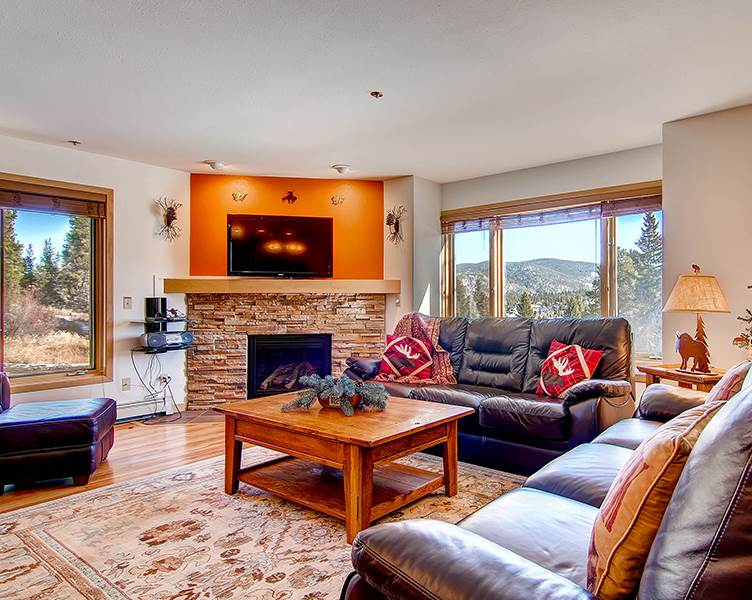 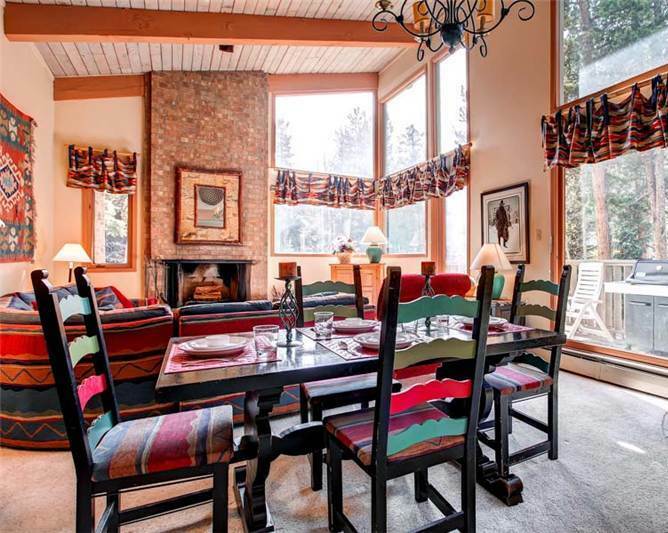 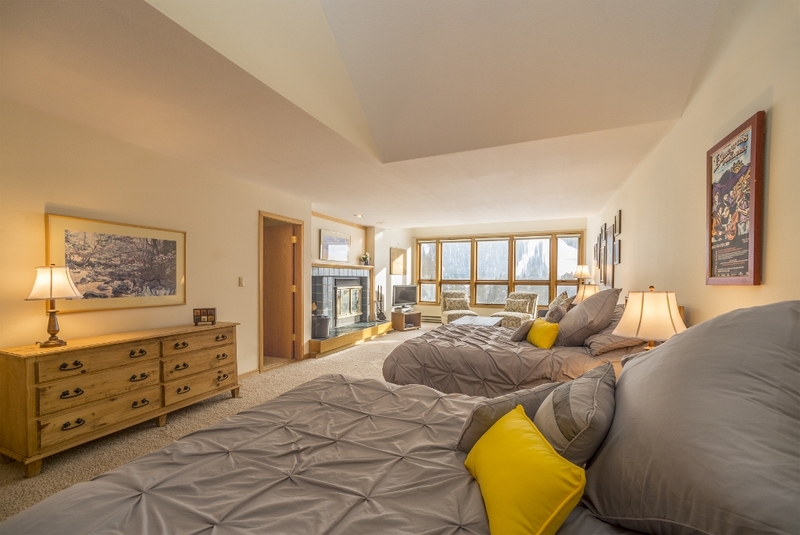 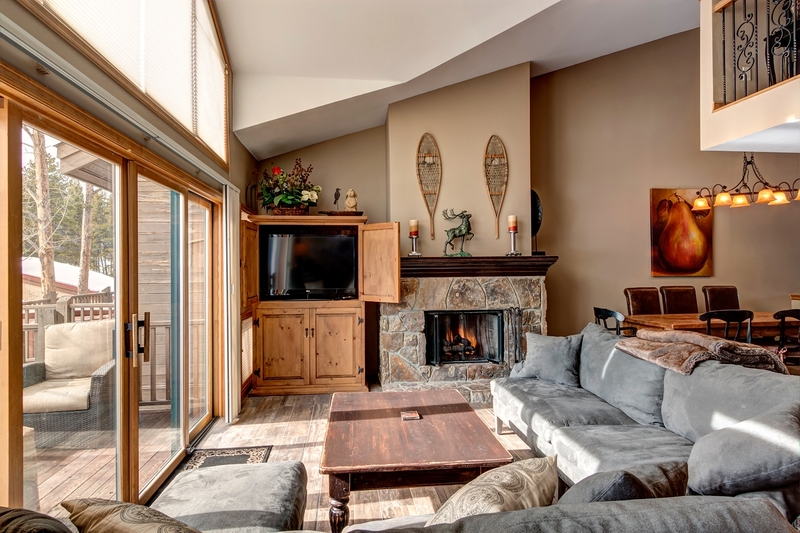 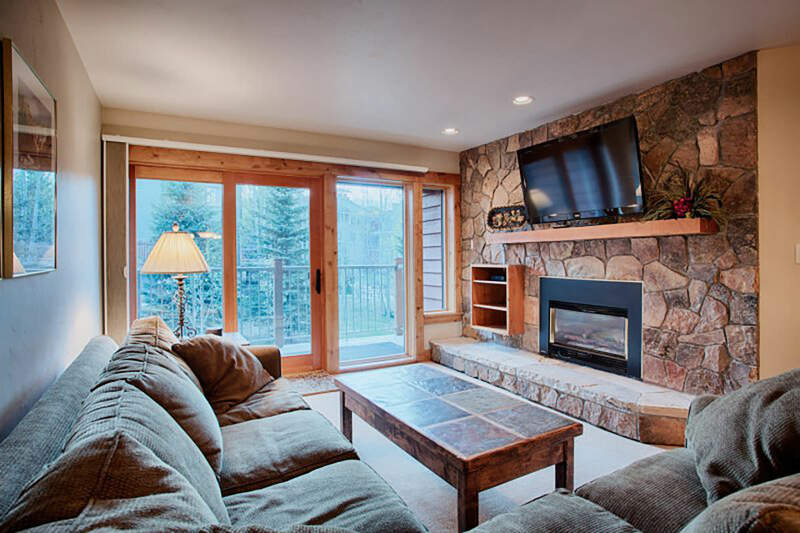 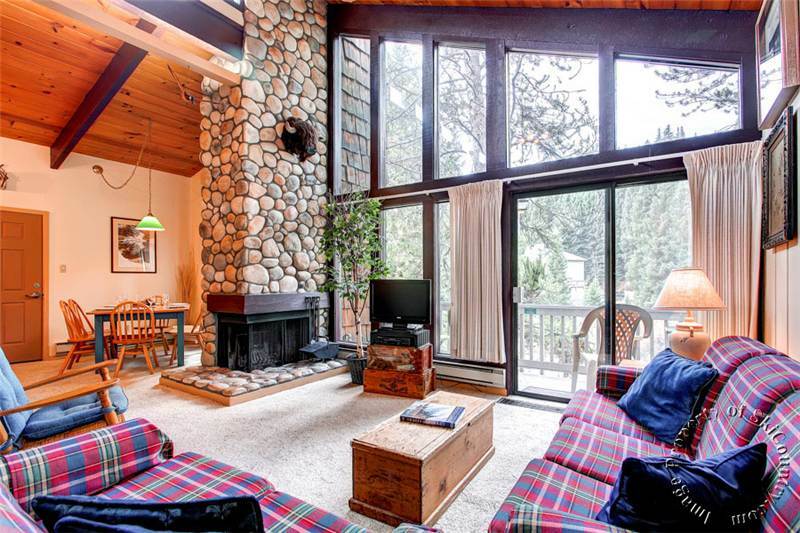 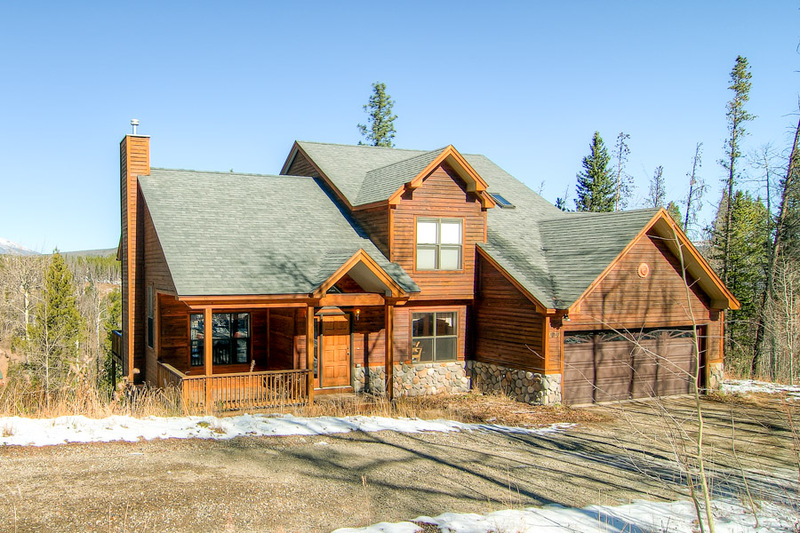 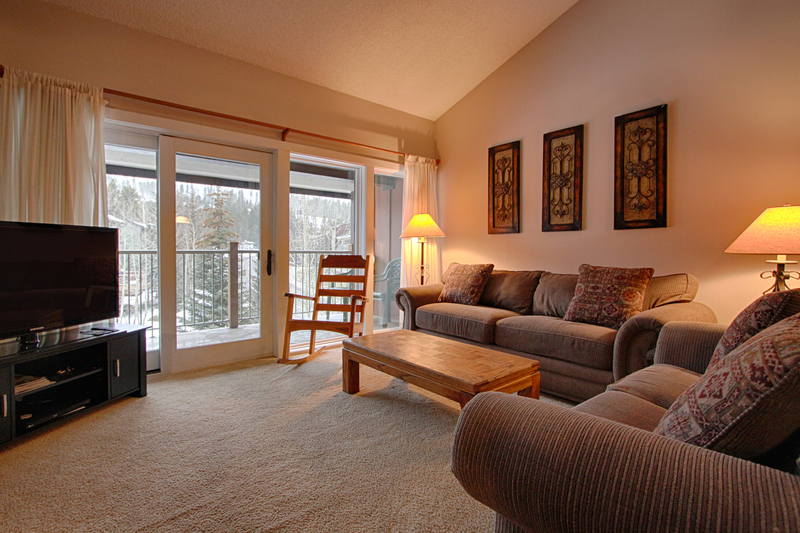 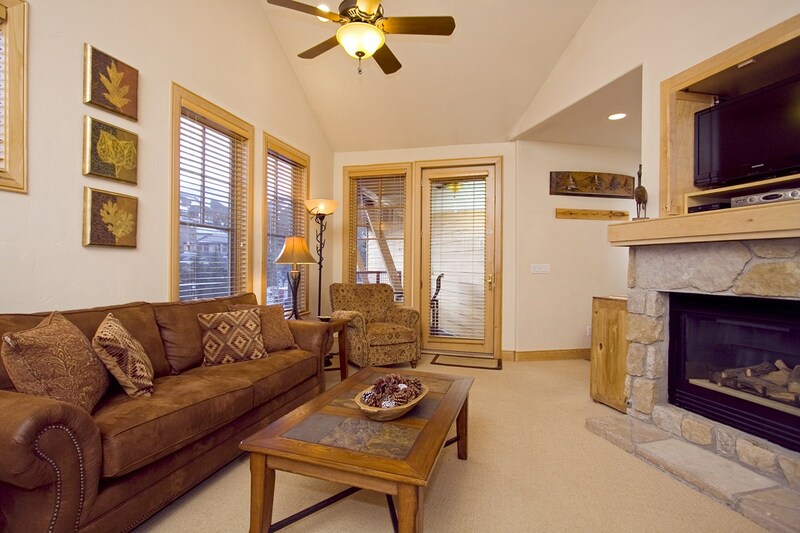 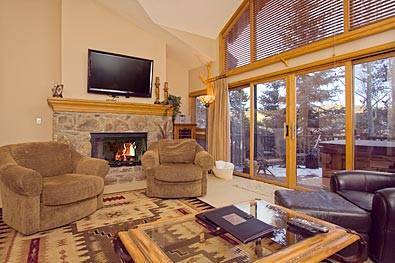 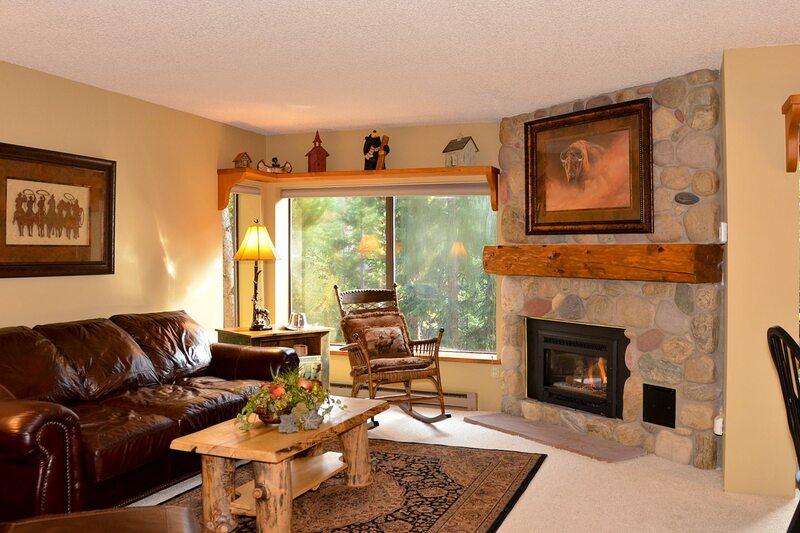 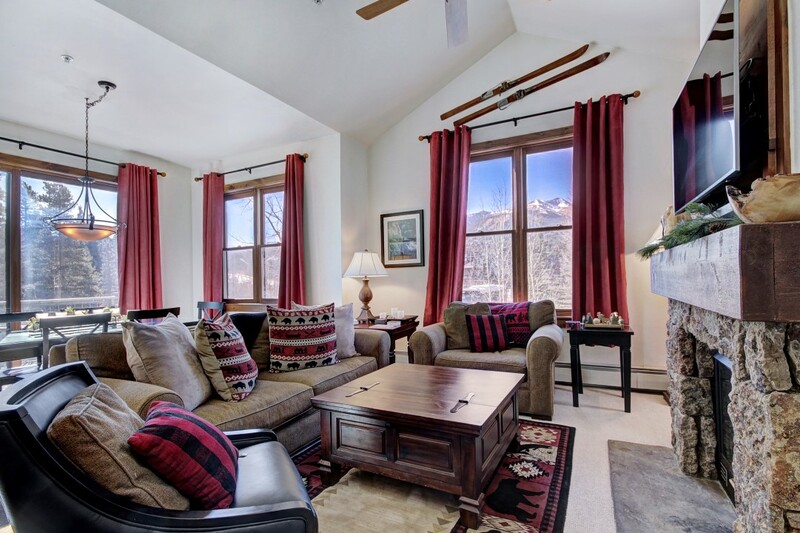 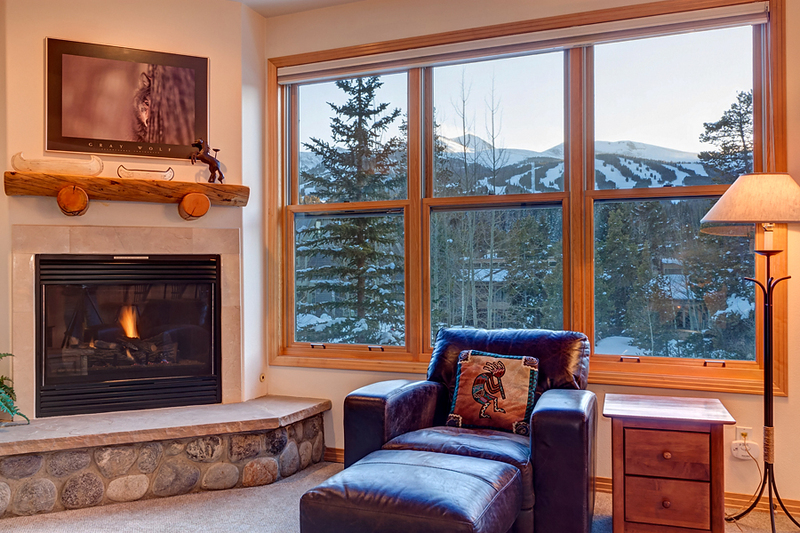 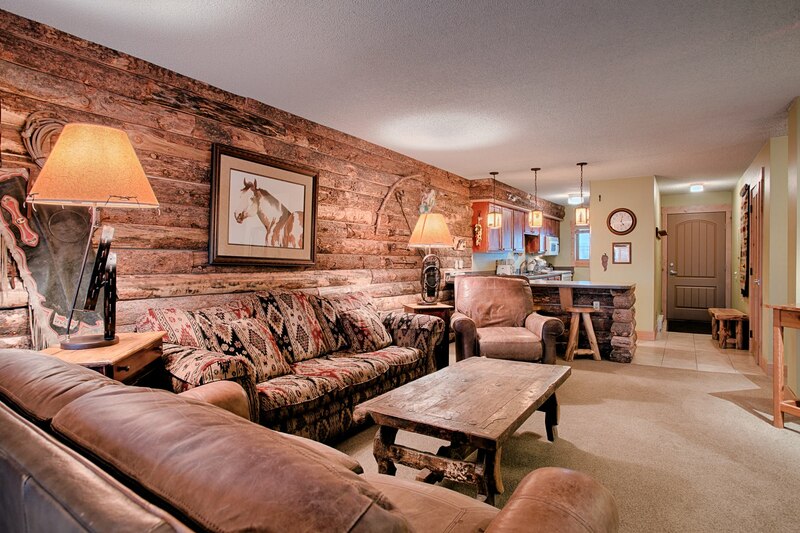 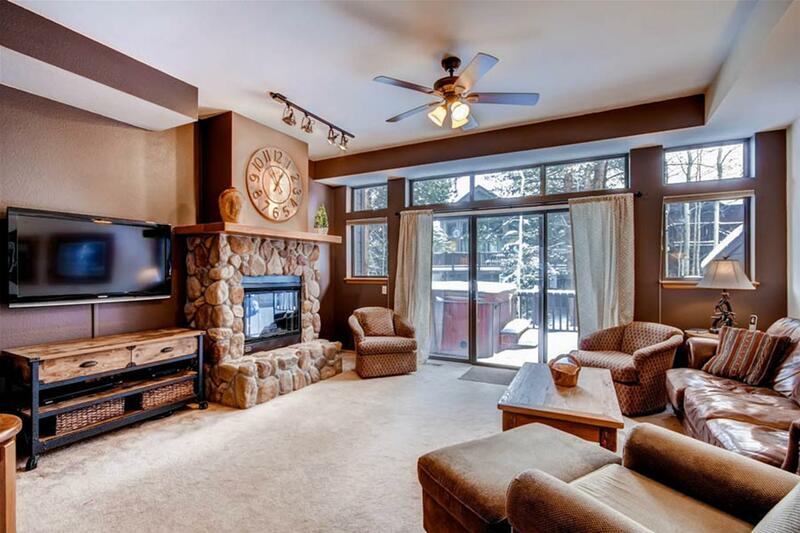 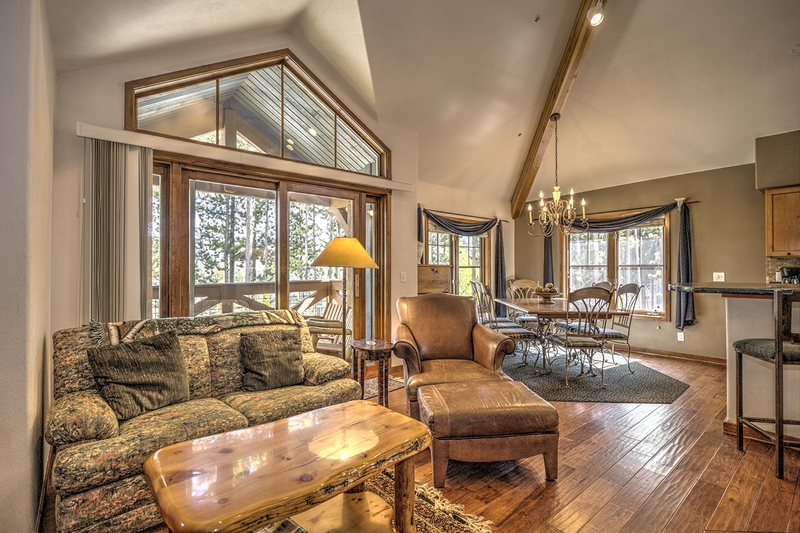 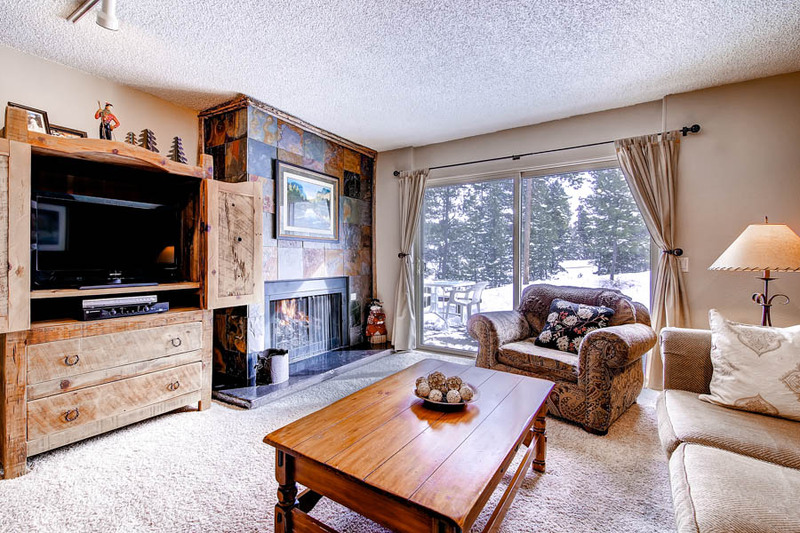 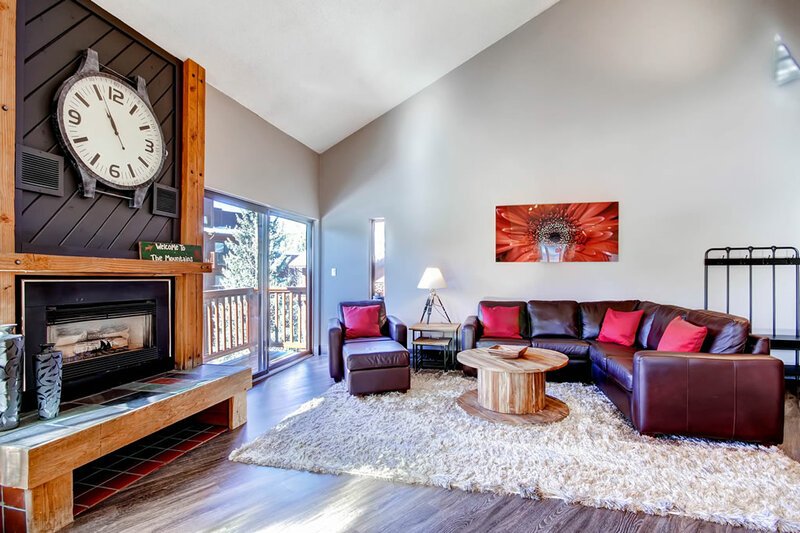 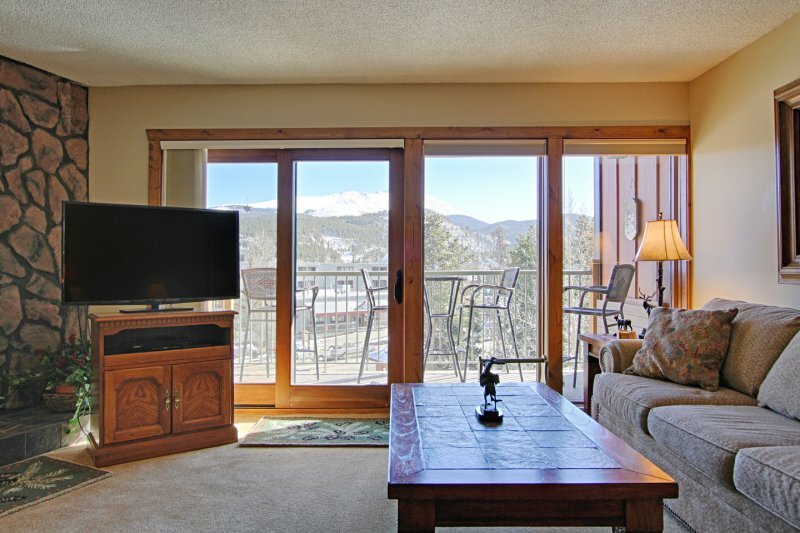 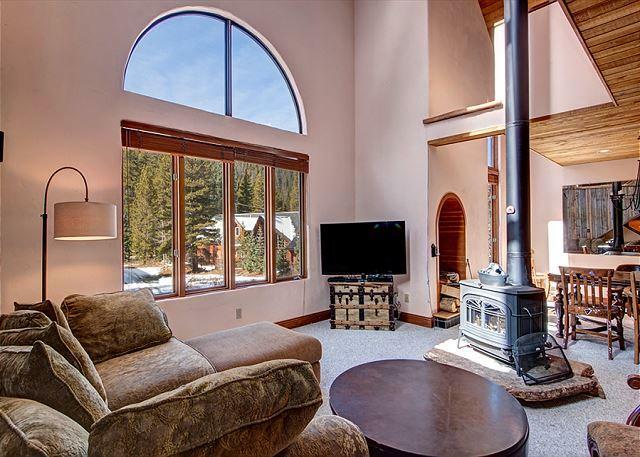 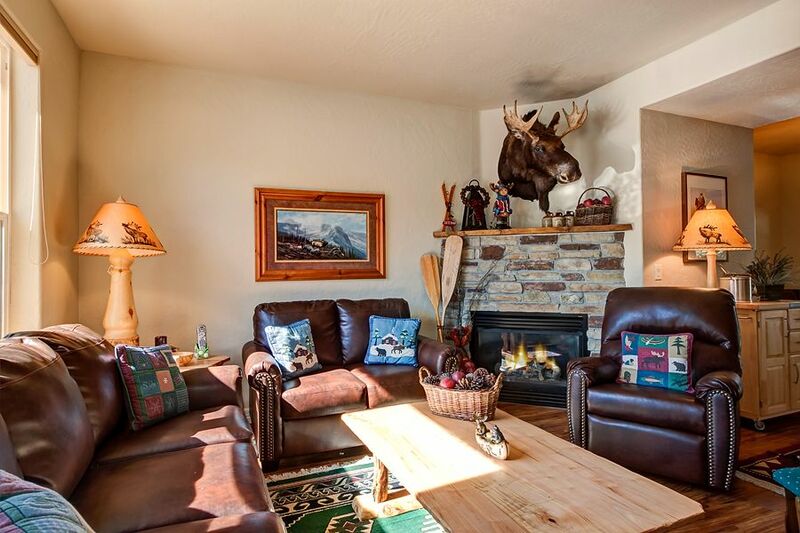 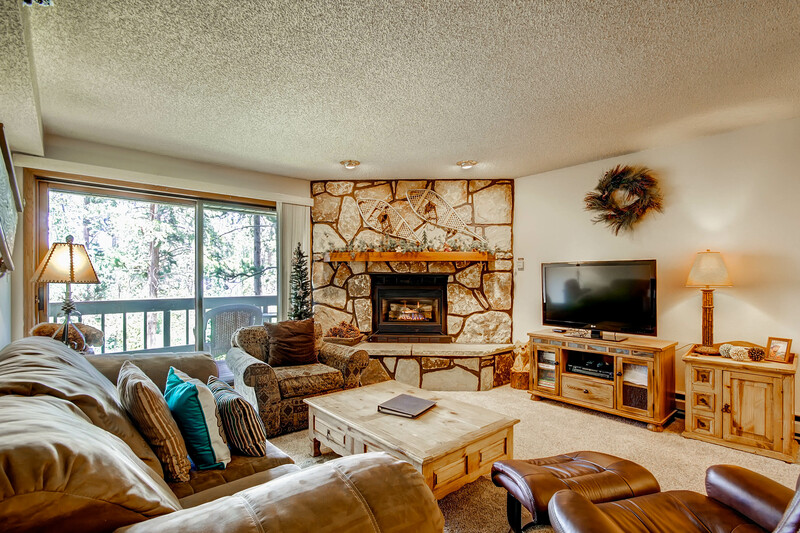 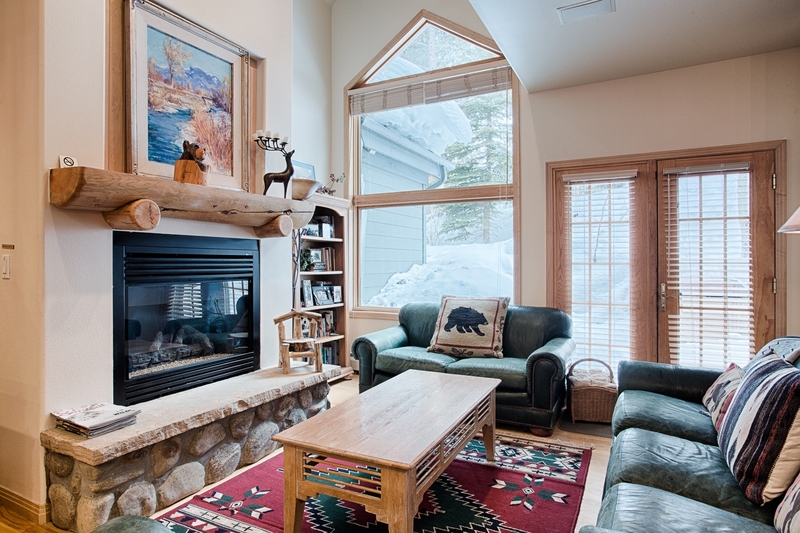 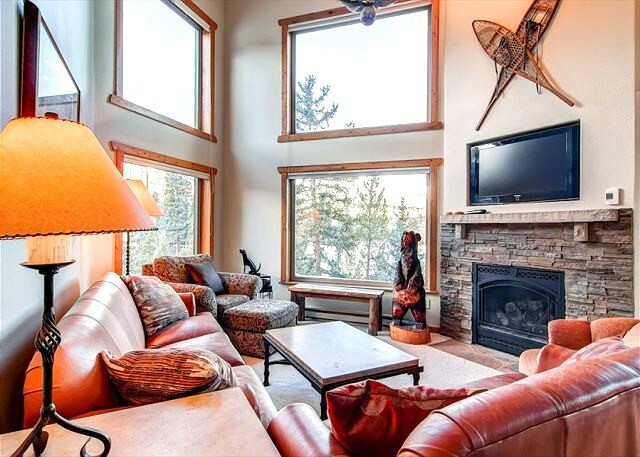 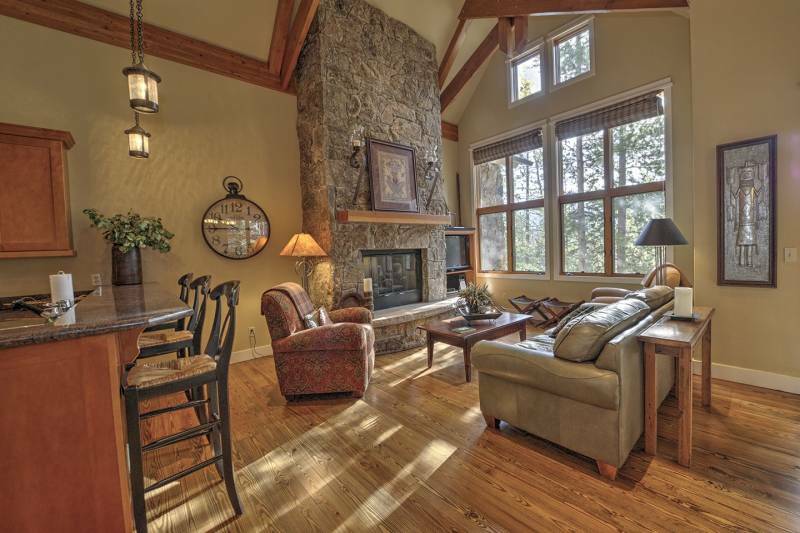 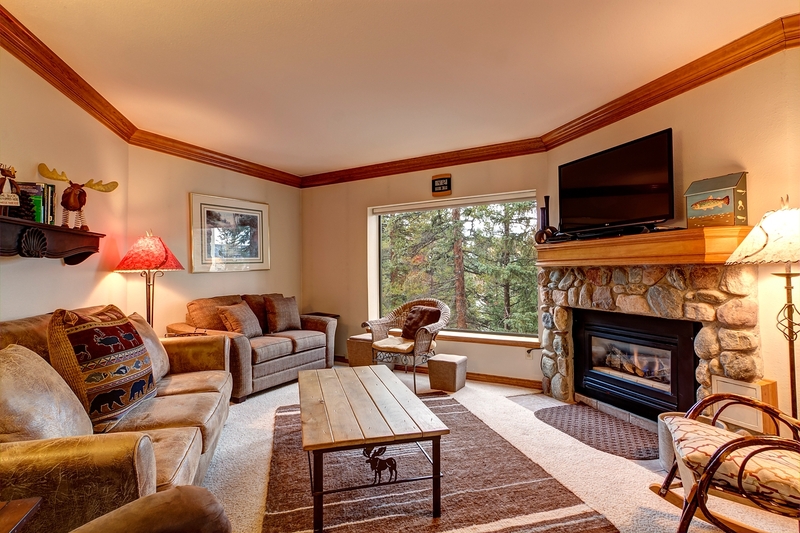 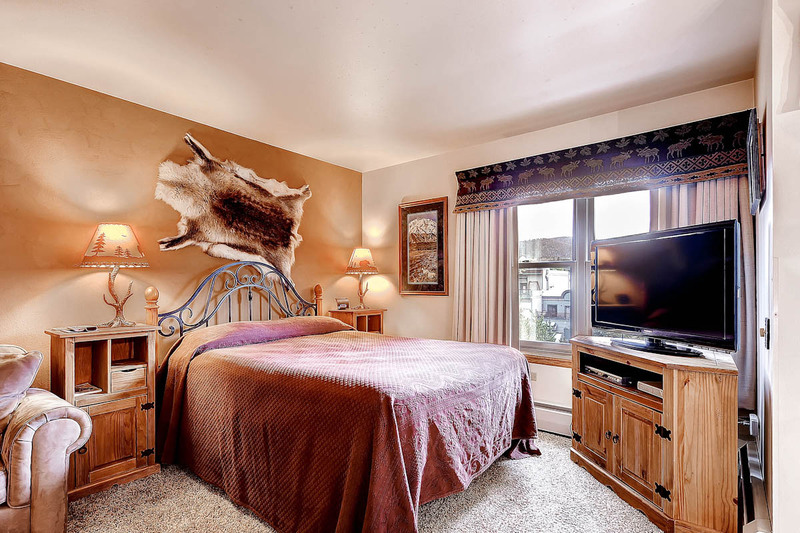 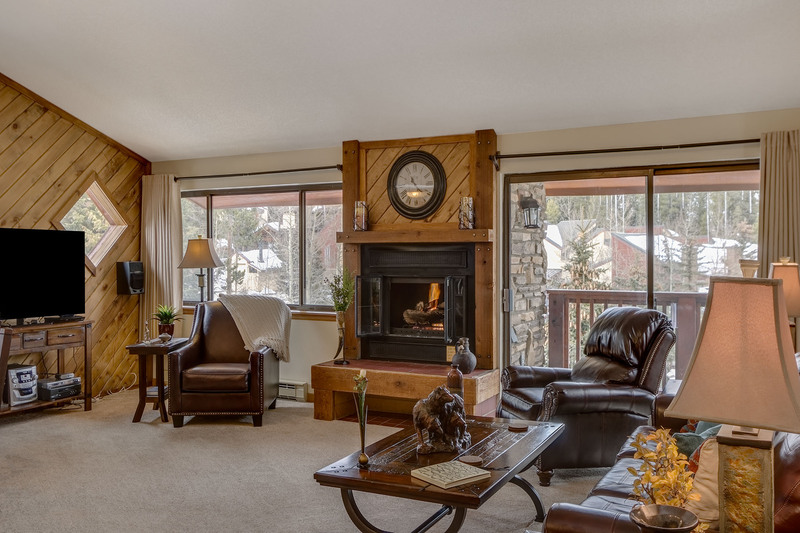 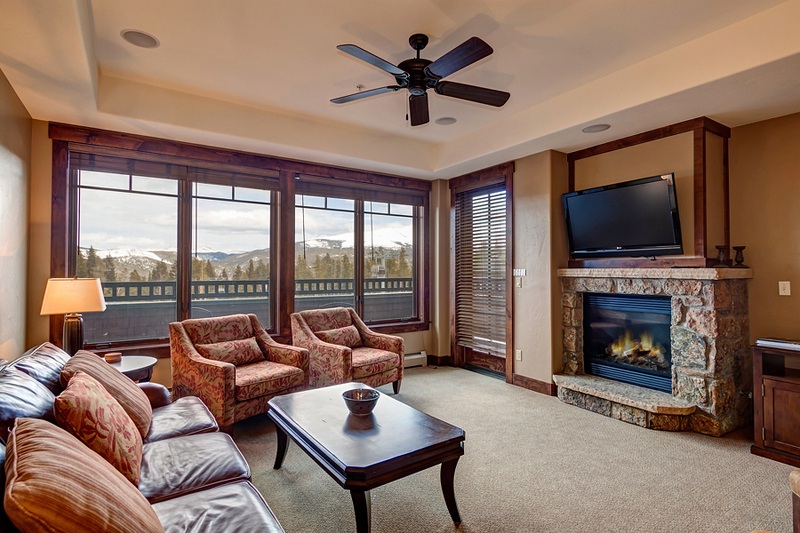 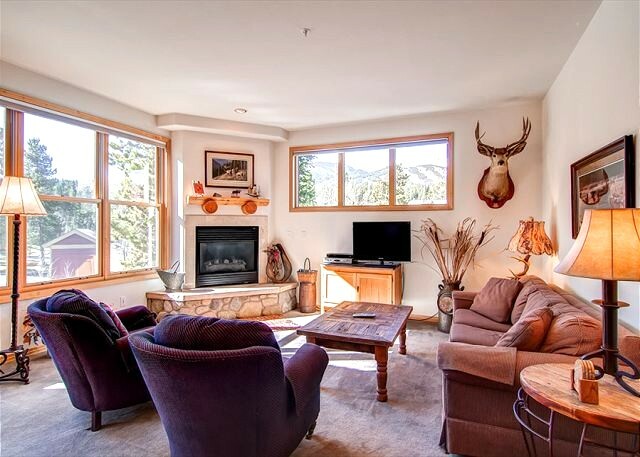 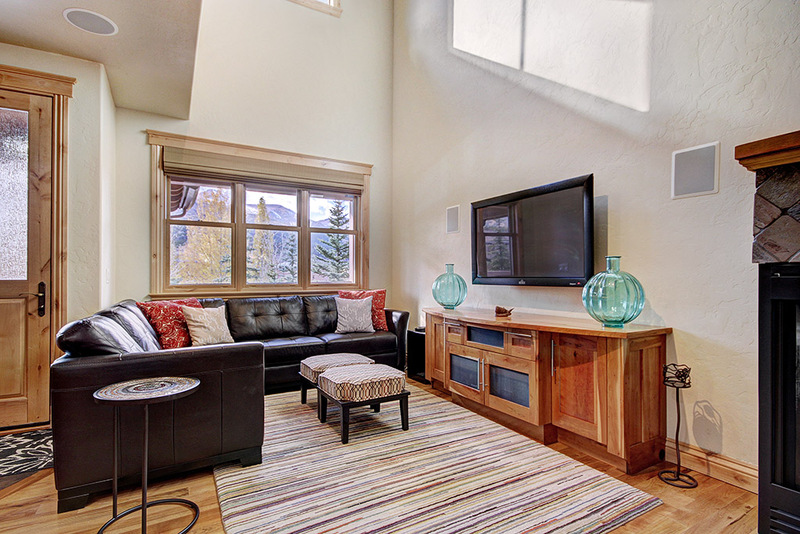 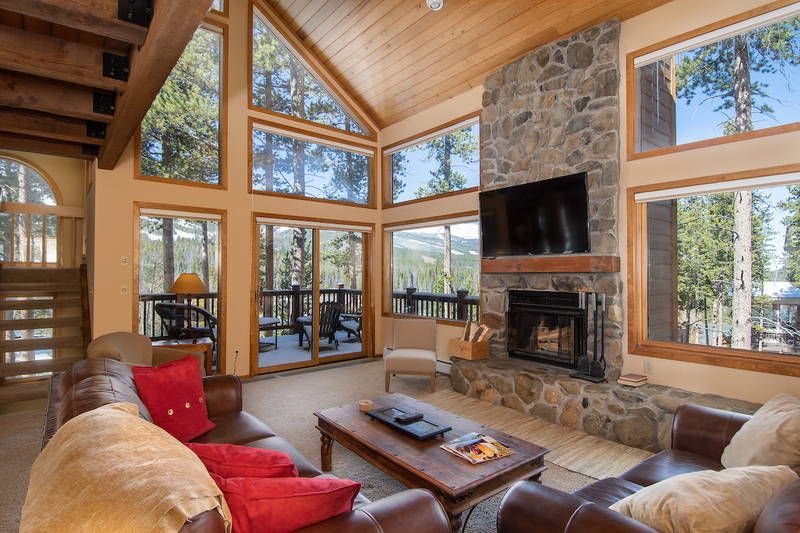 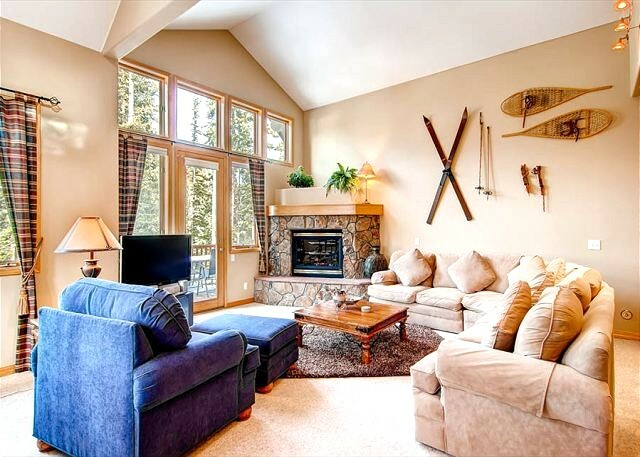 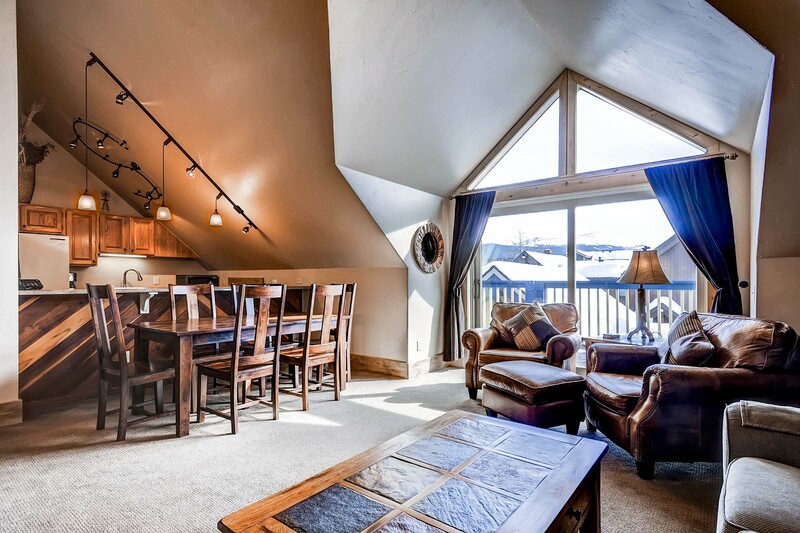 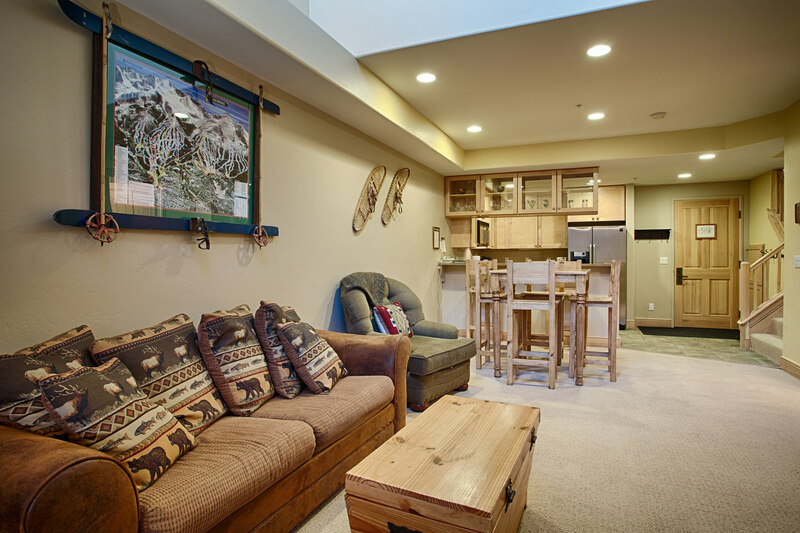 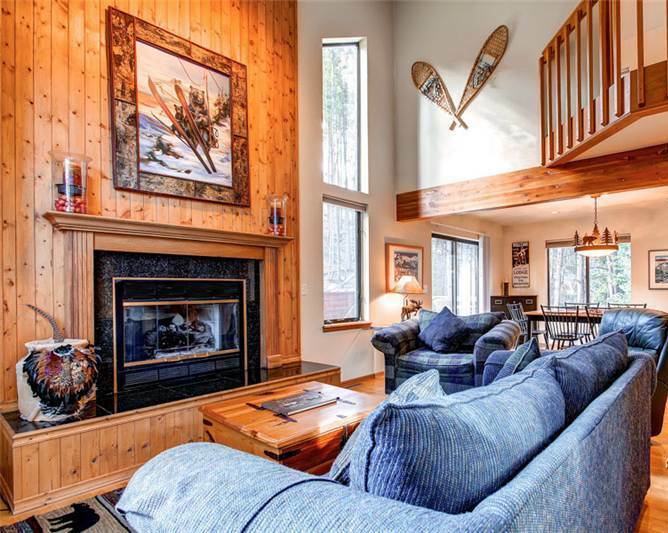 Guests will love the spectacular mountain views from the living room, bedroom and loft. 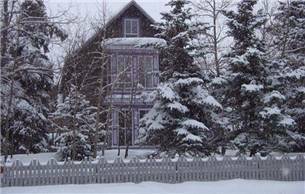 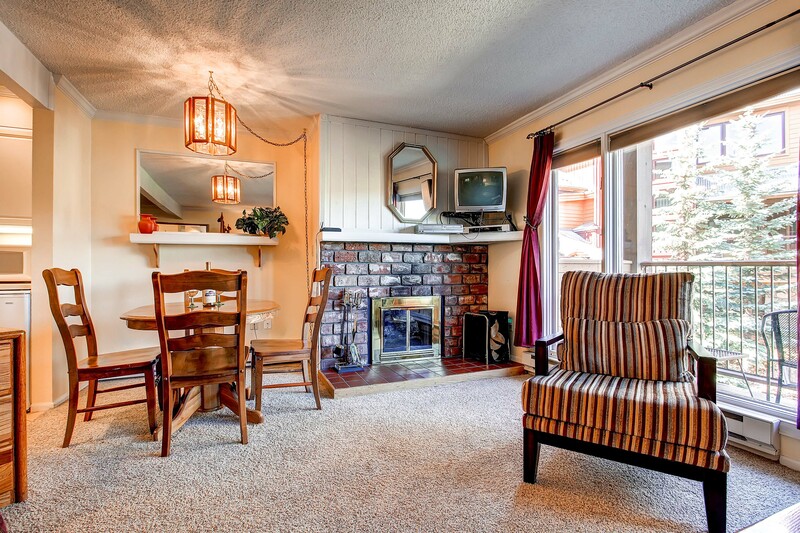 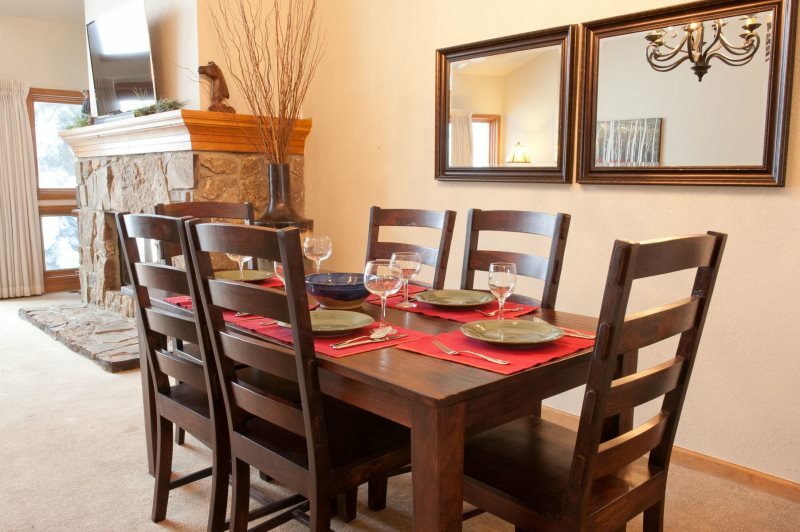 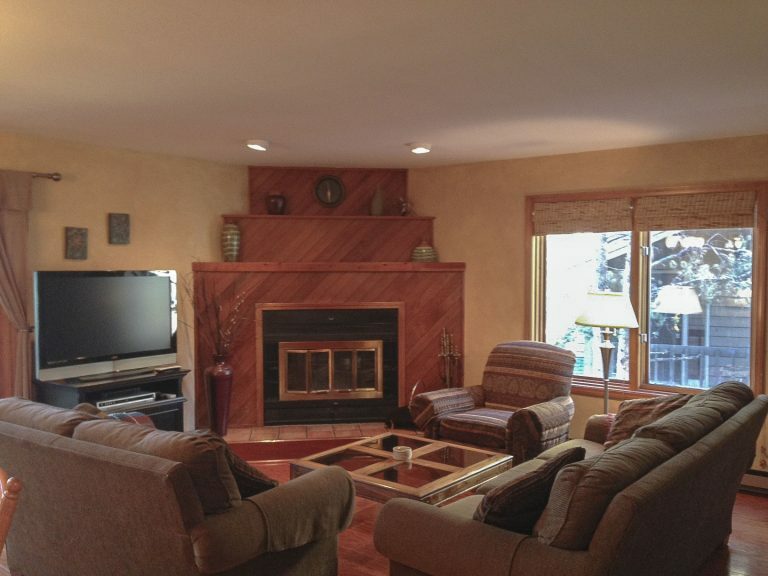 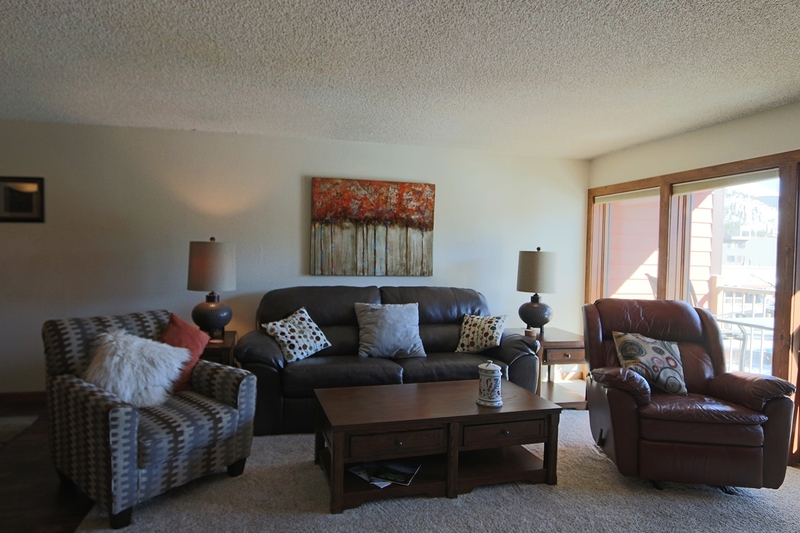 Recent updates include new carpeting, doors, paint, light fixtures and furnishings. 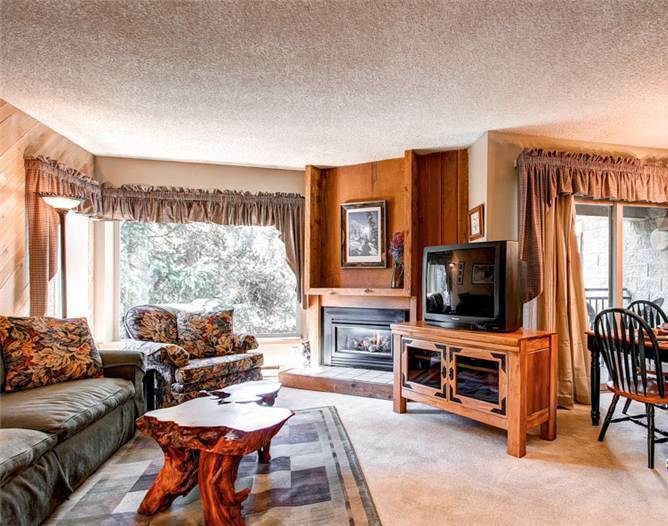 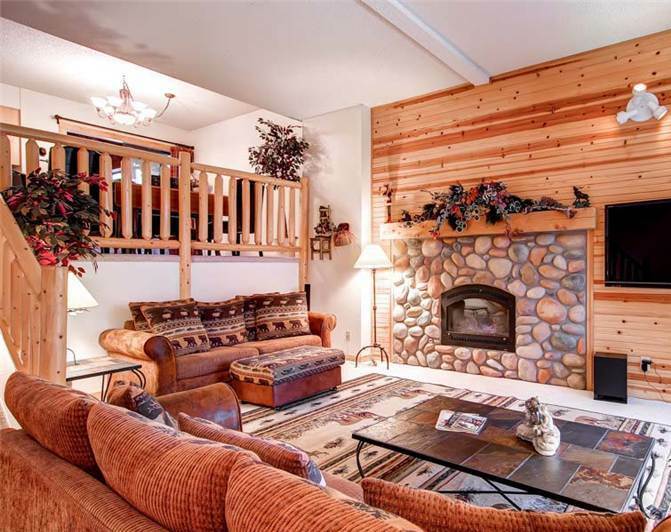 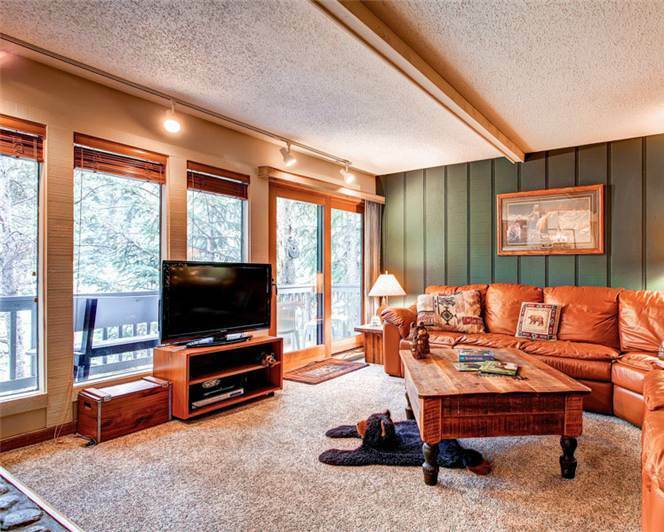 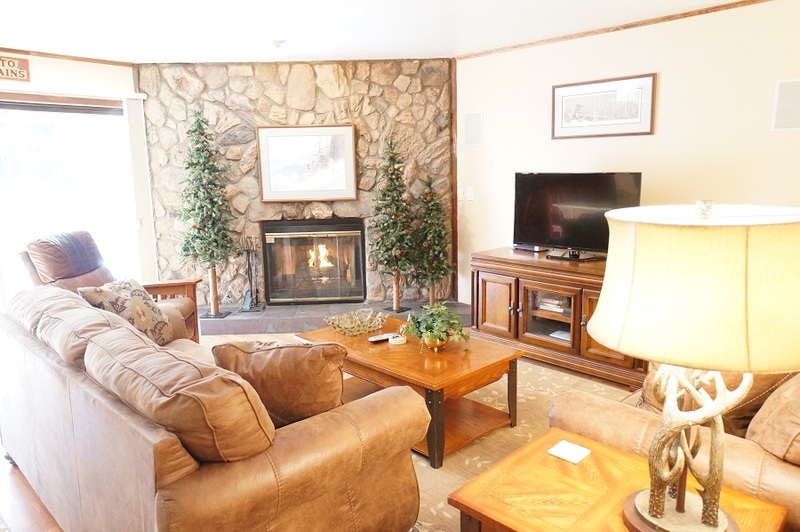 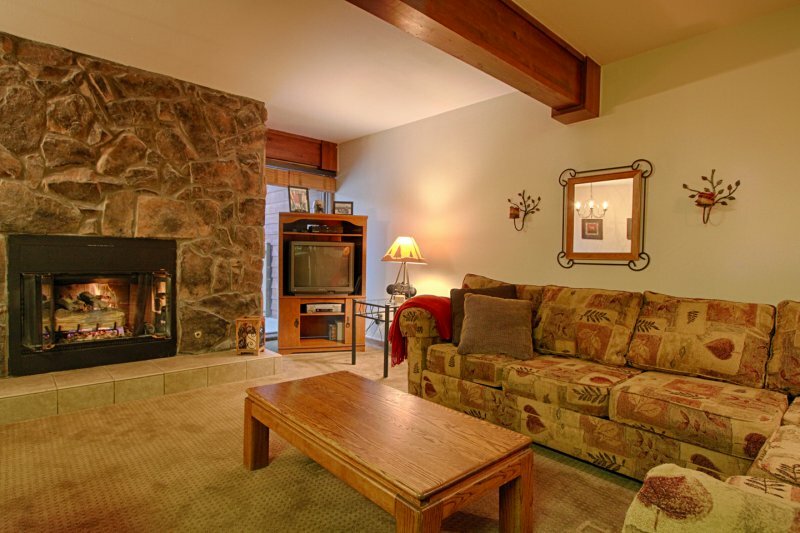 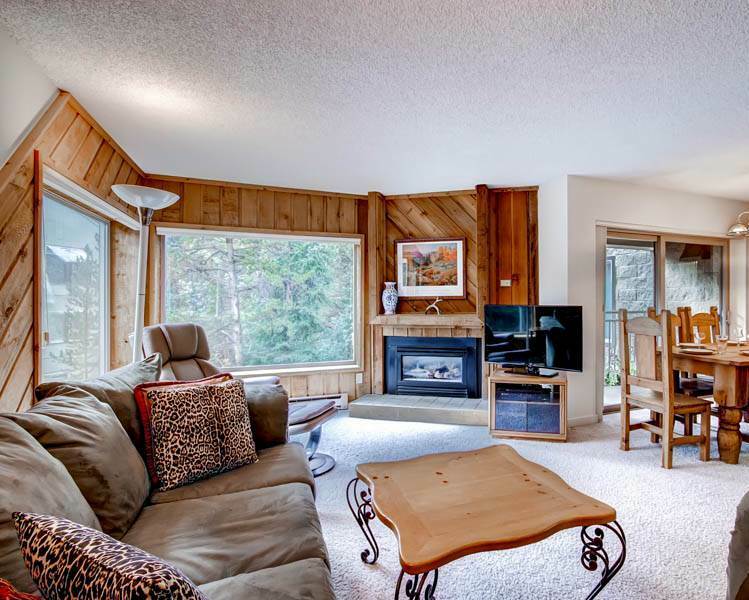 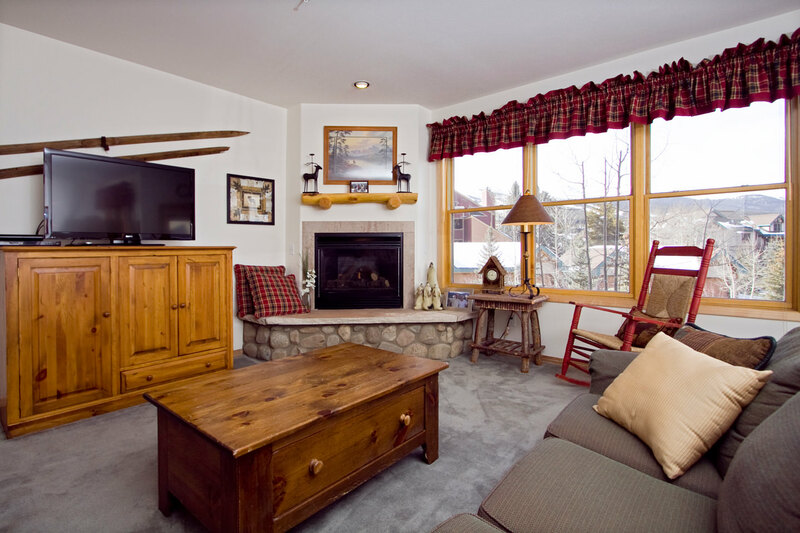 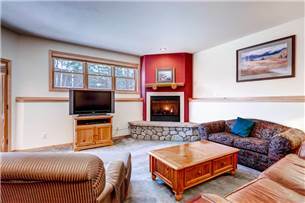 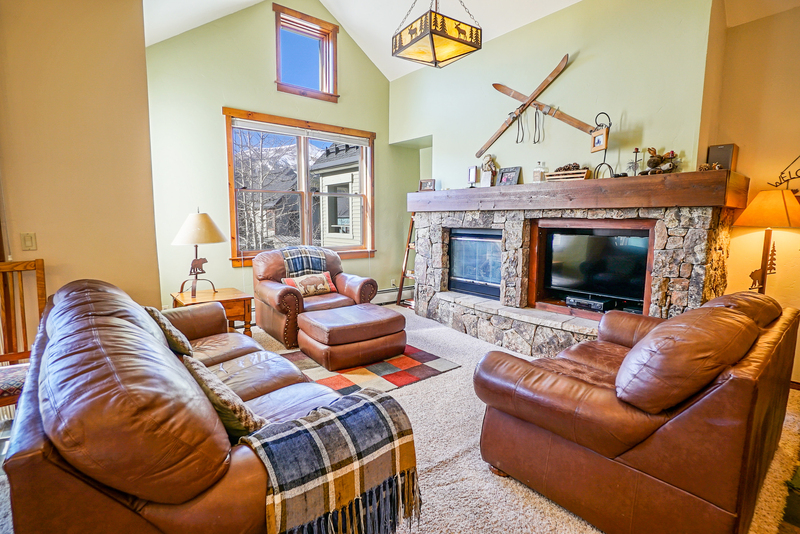 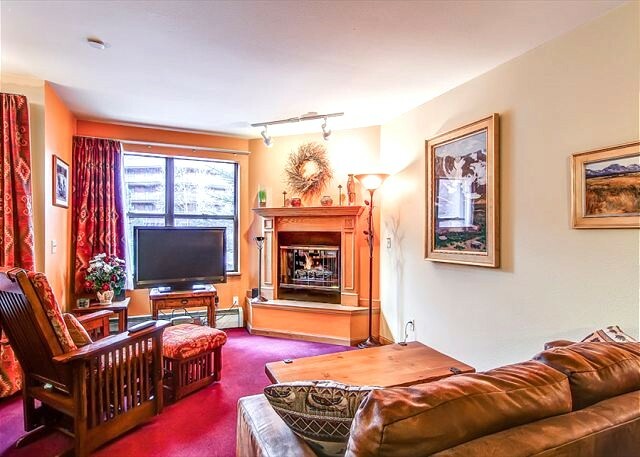 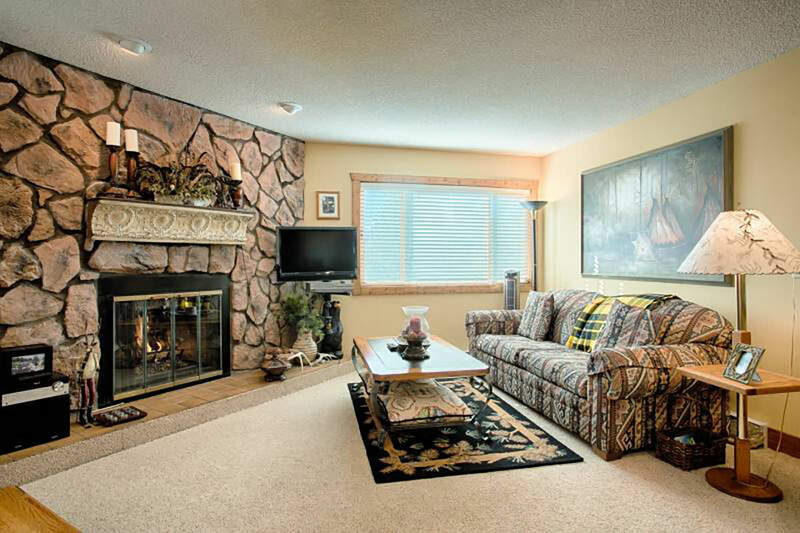 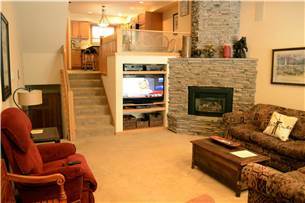 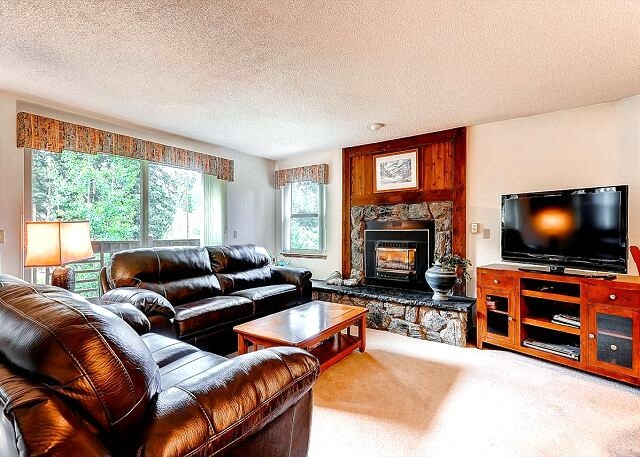 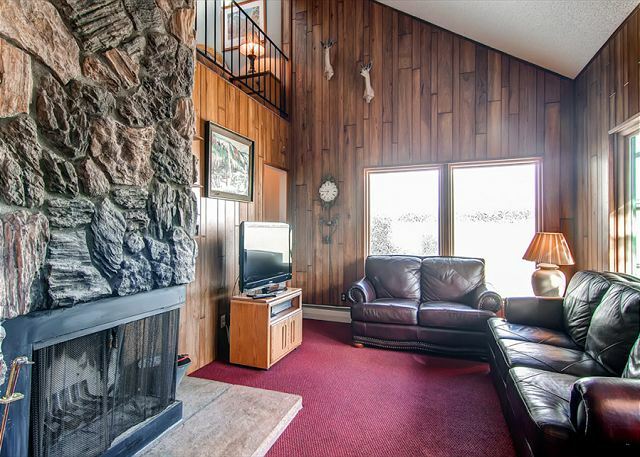 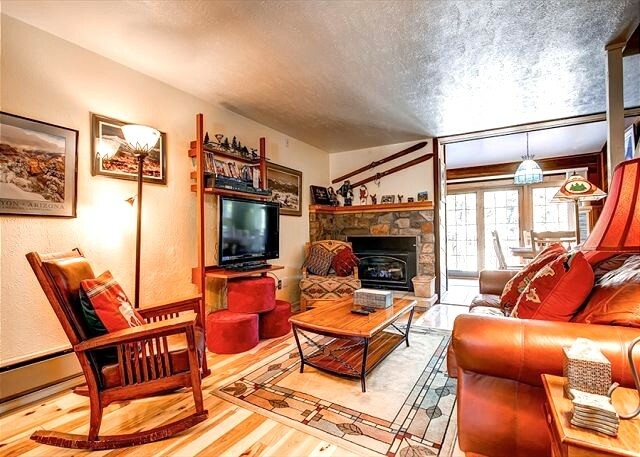 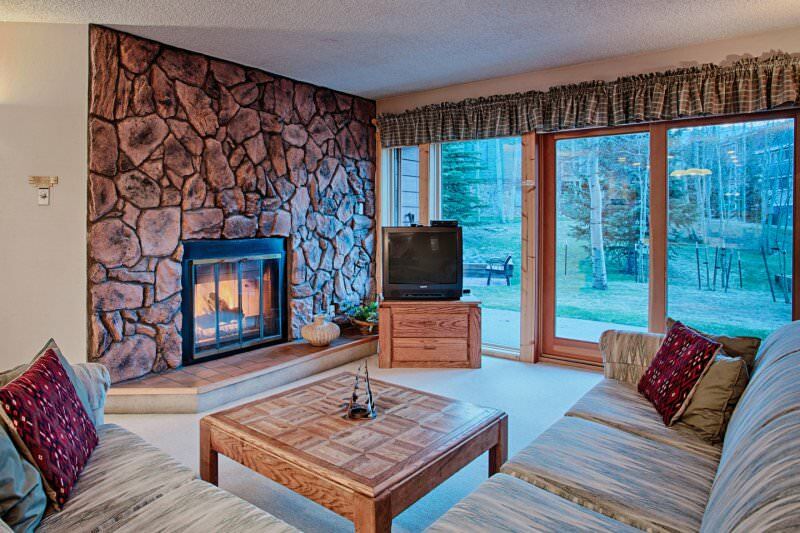 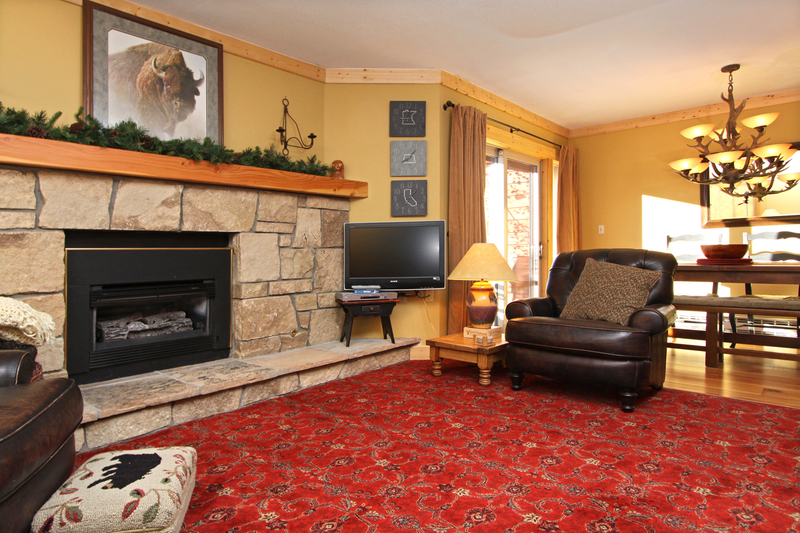 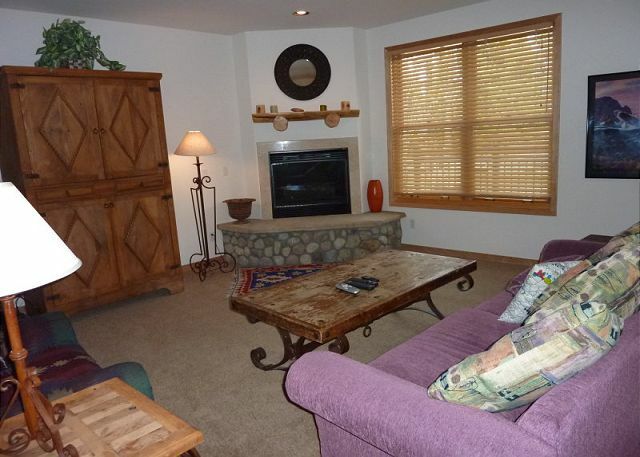 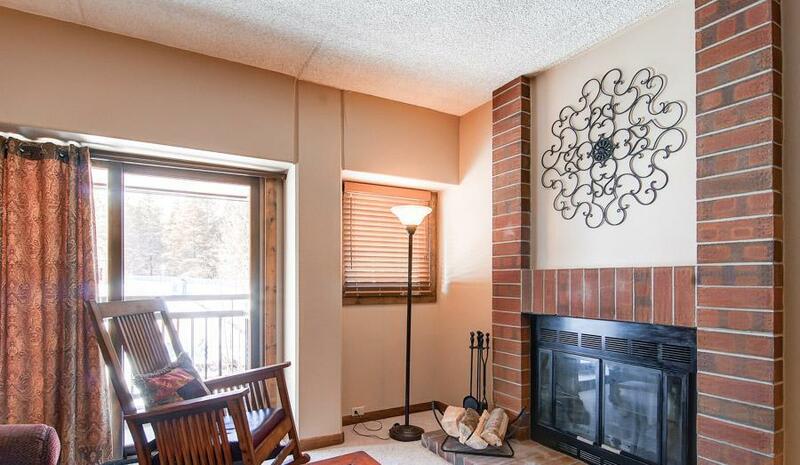 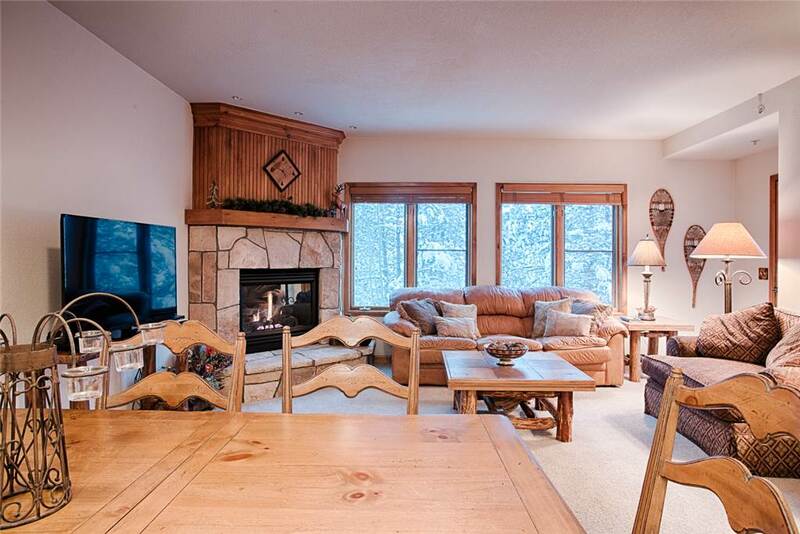 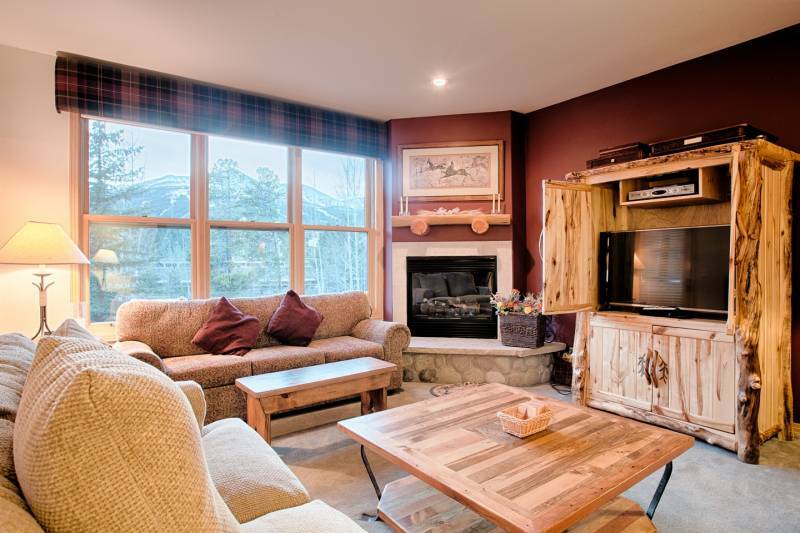 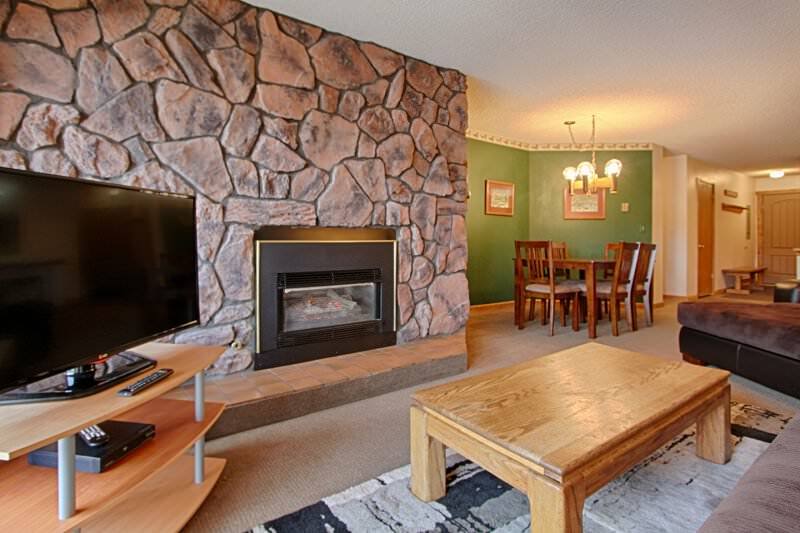 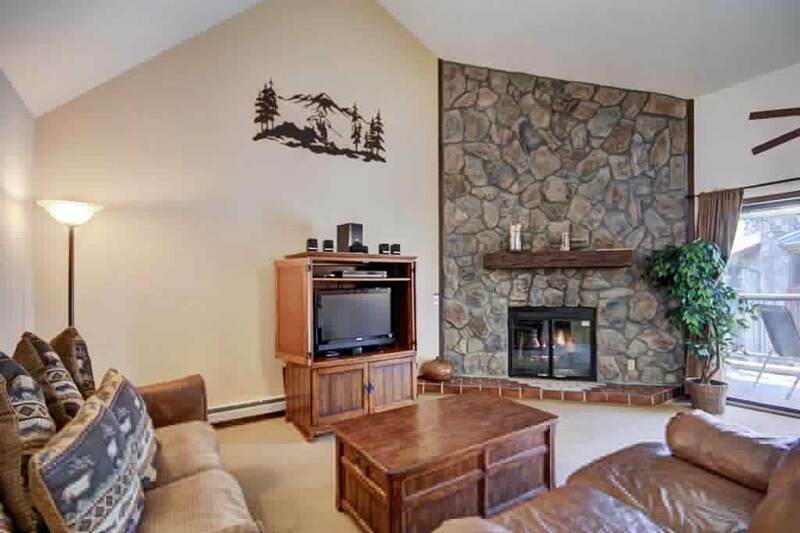 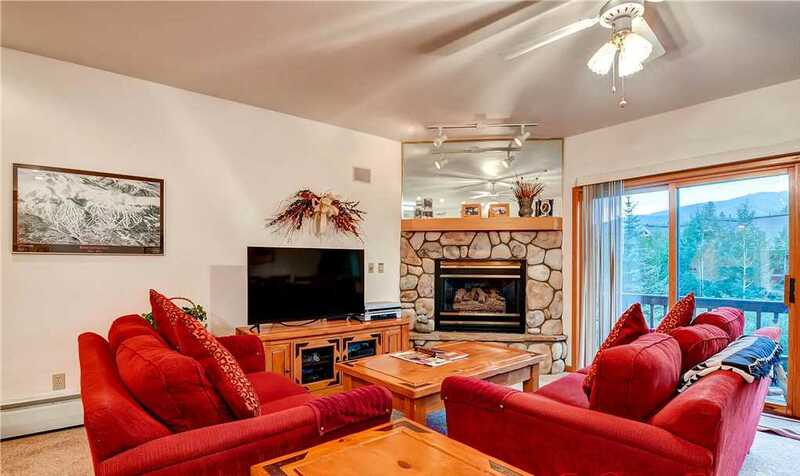 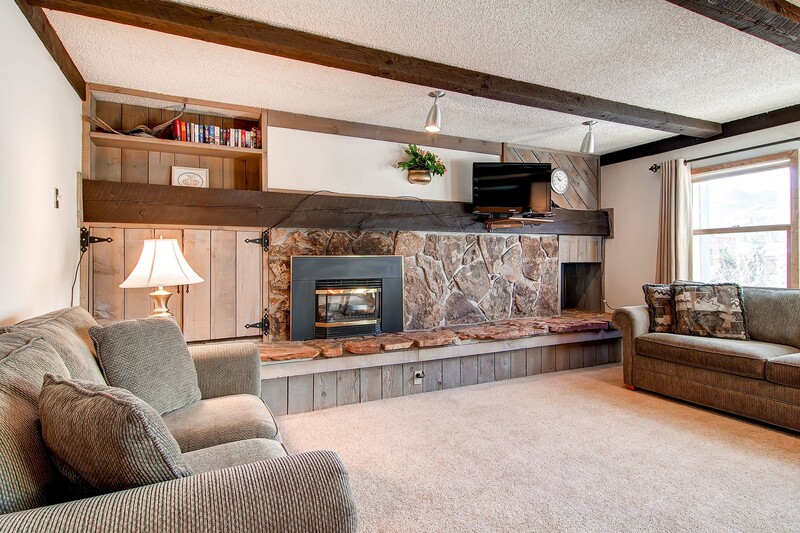 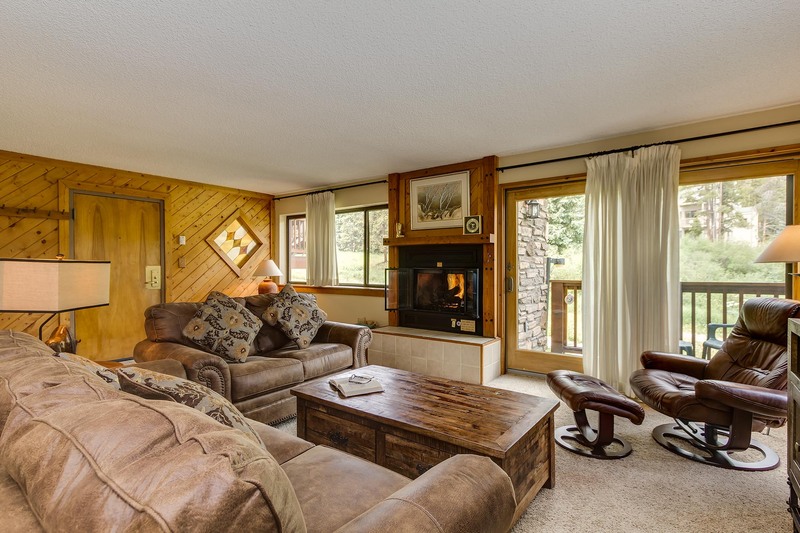 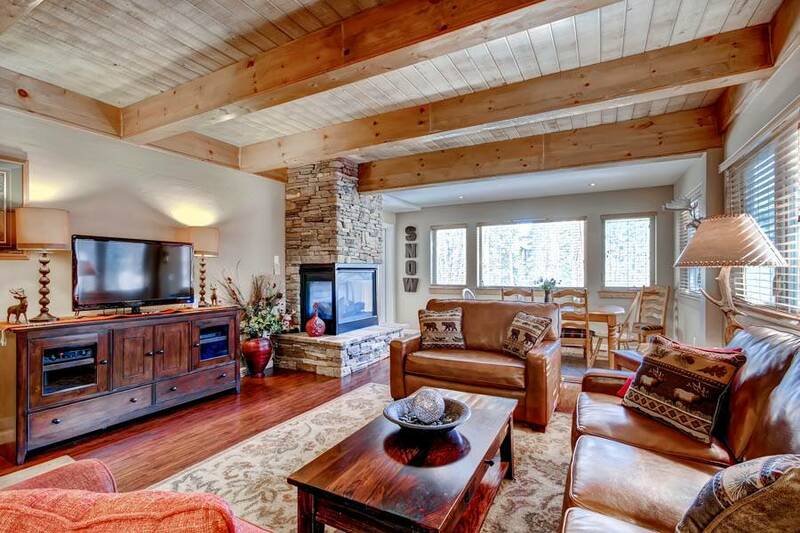 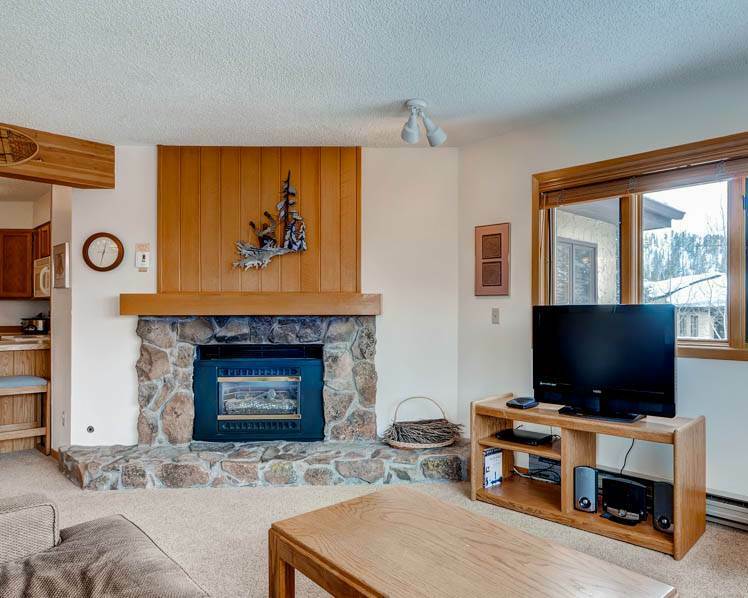 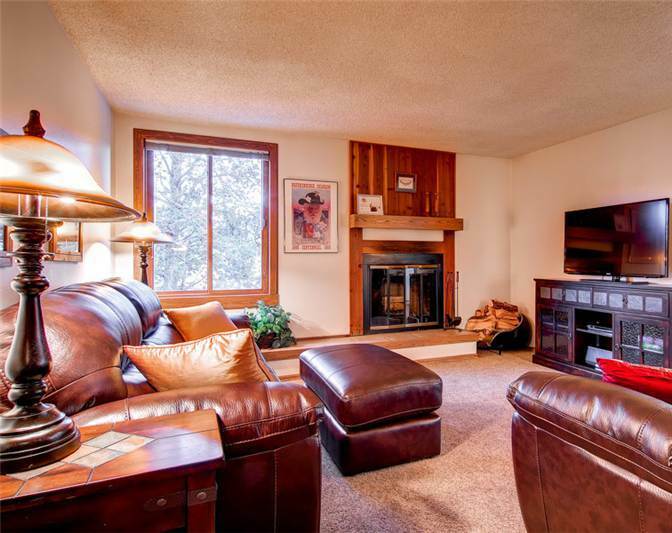 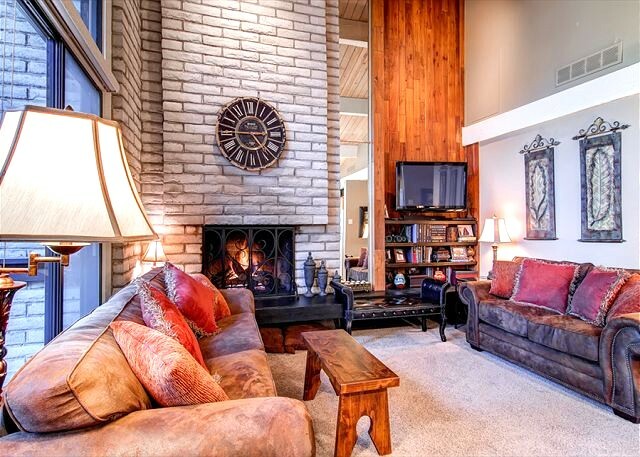 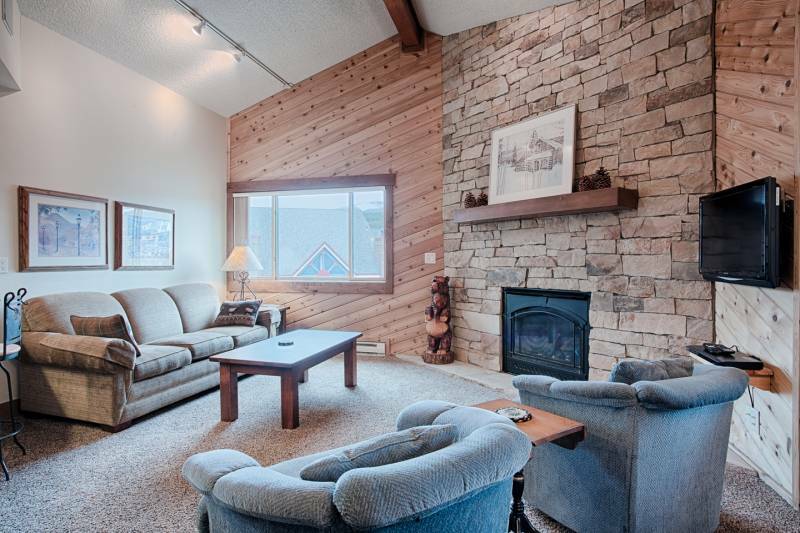 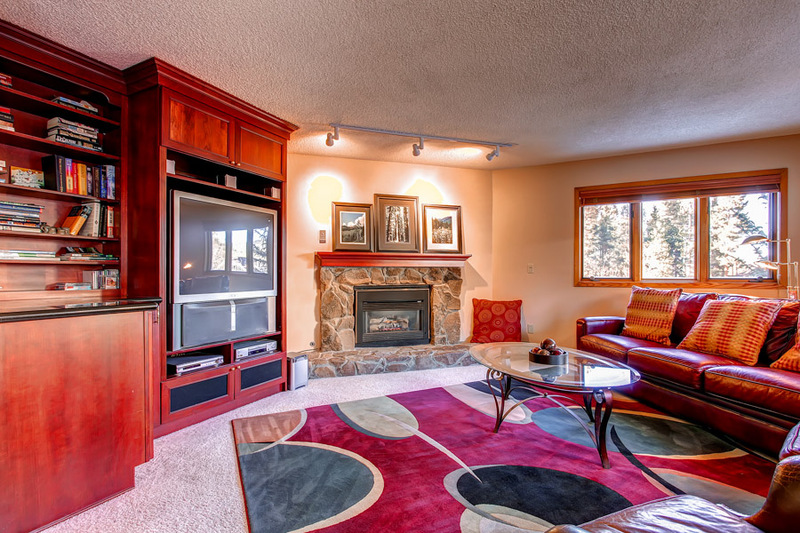 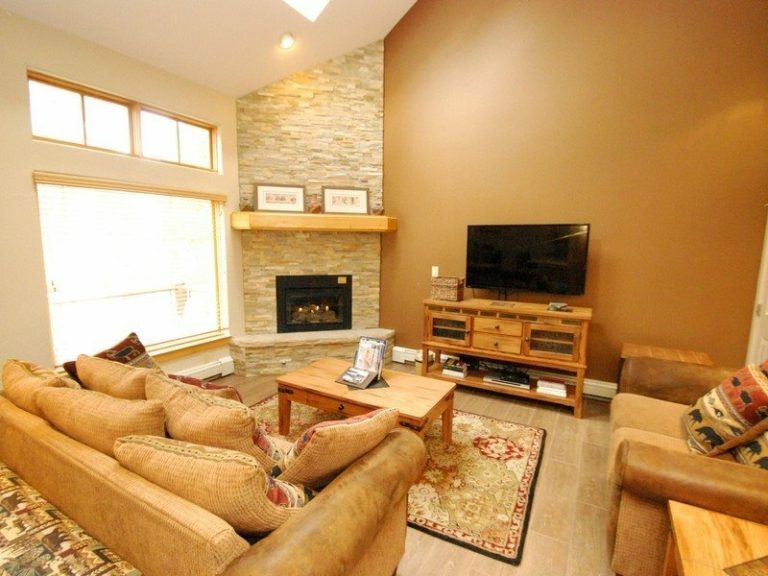 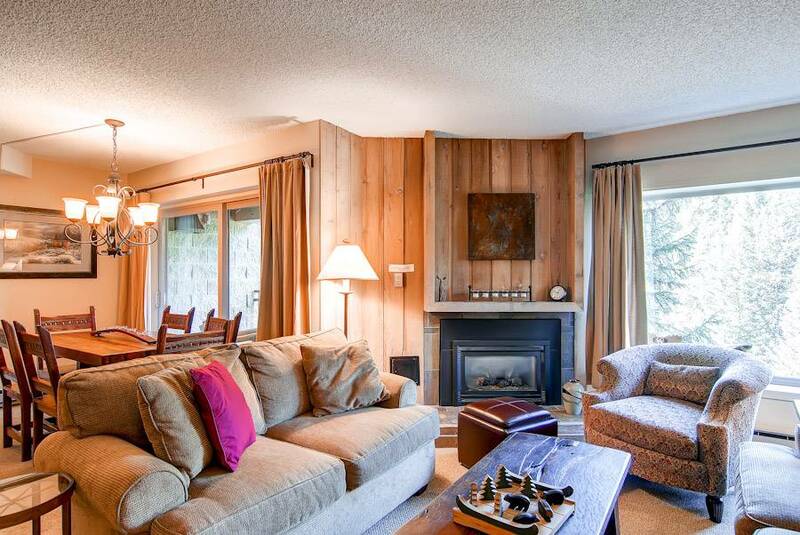 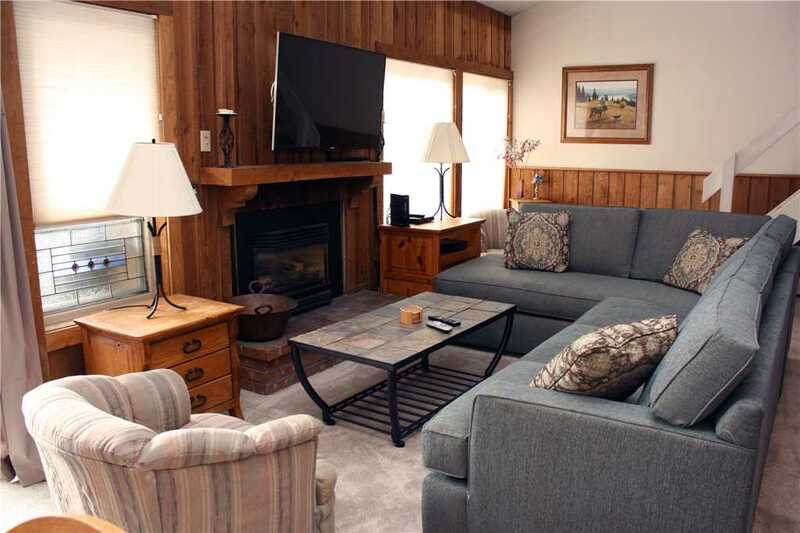 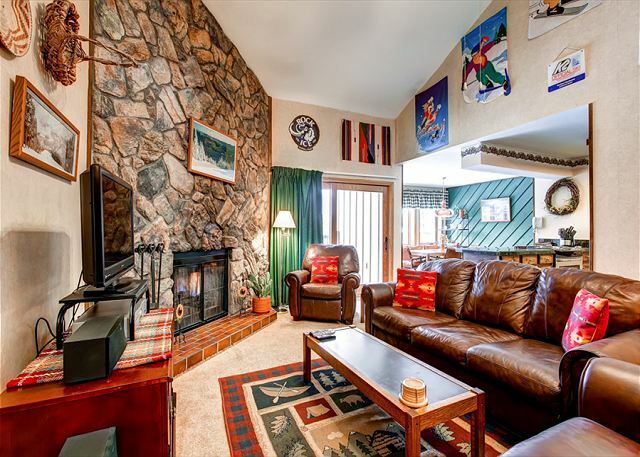 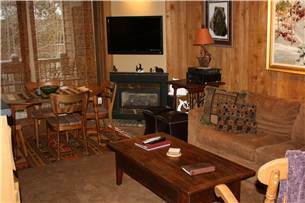 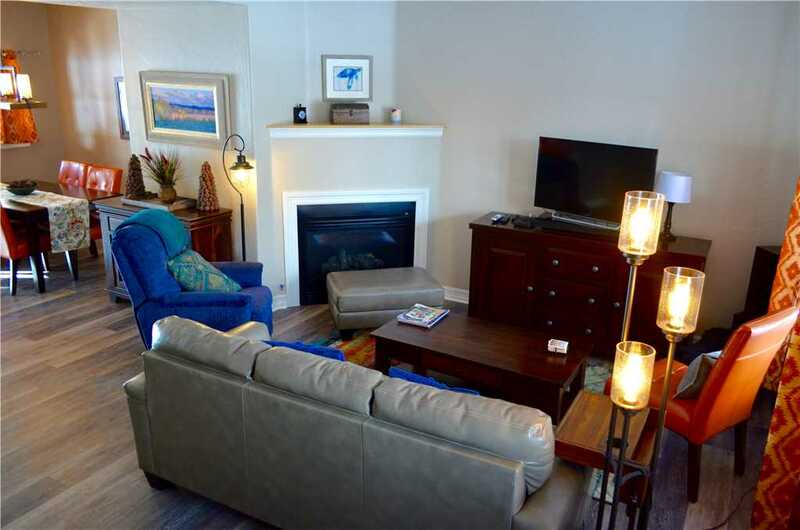 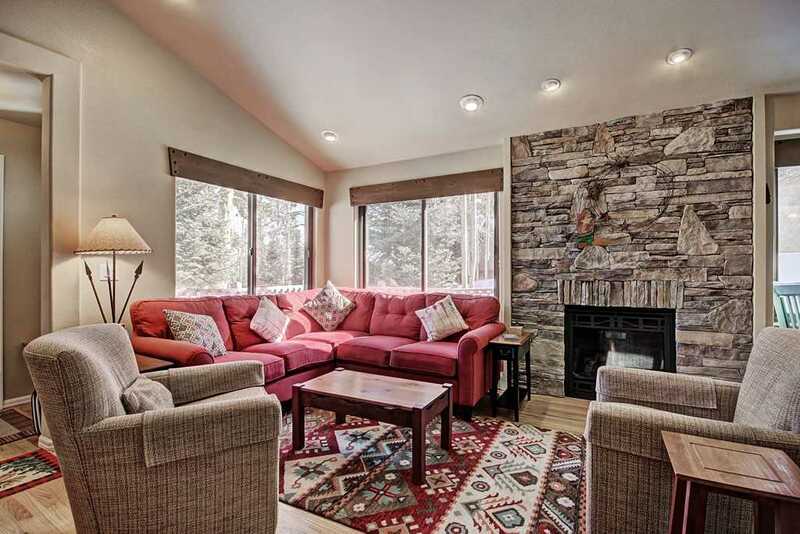 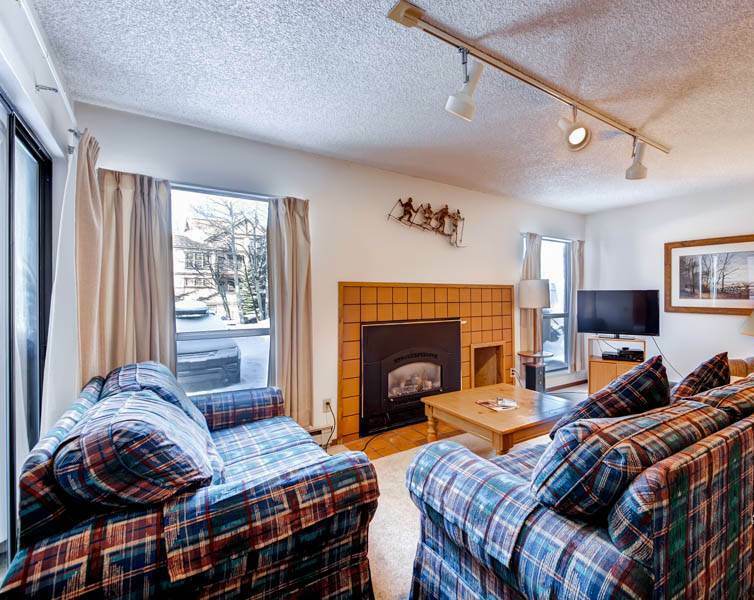 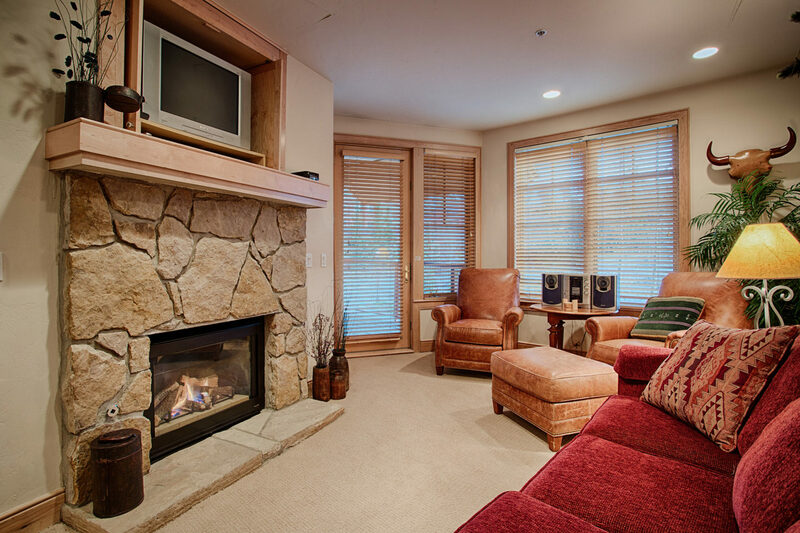 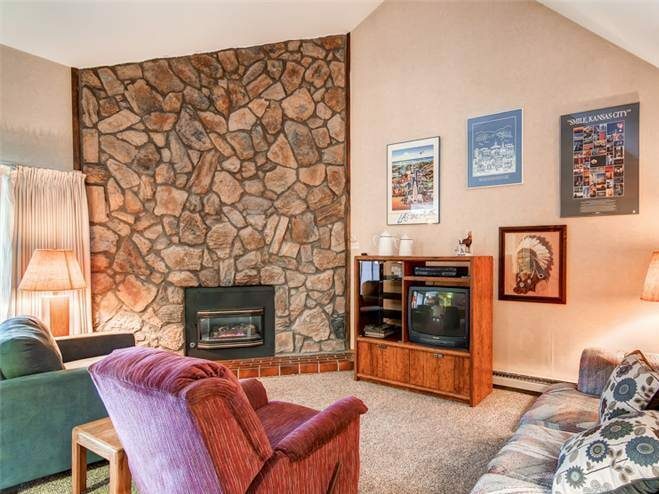 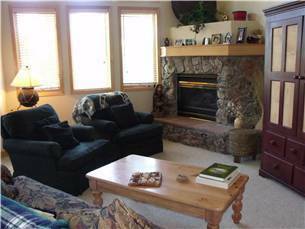 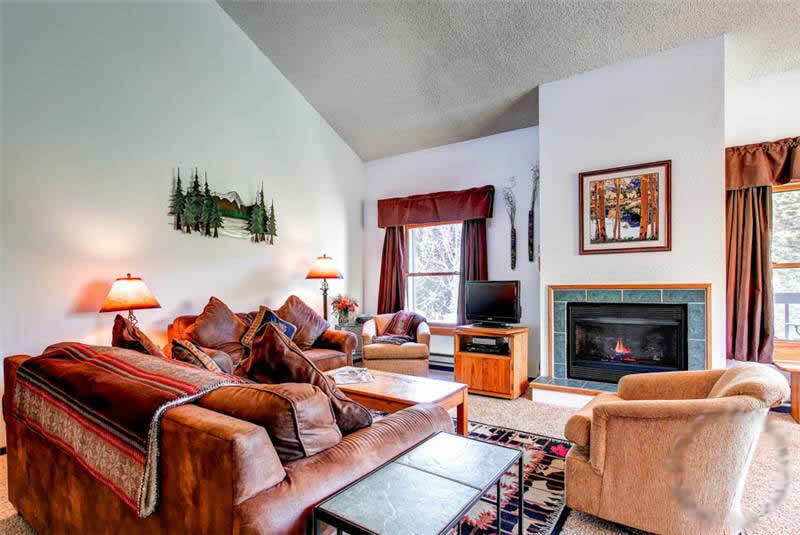 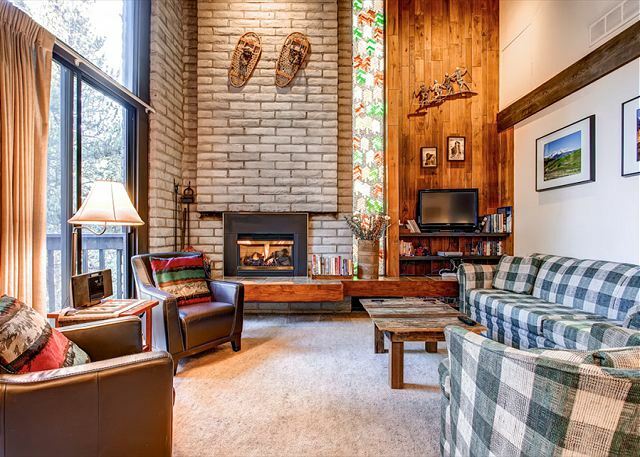 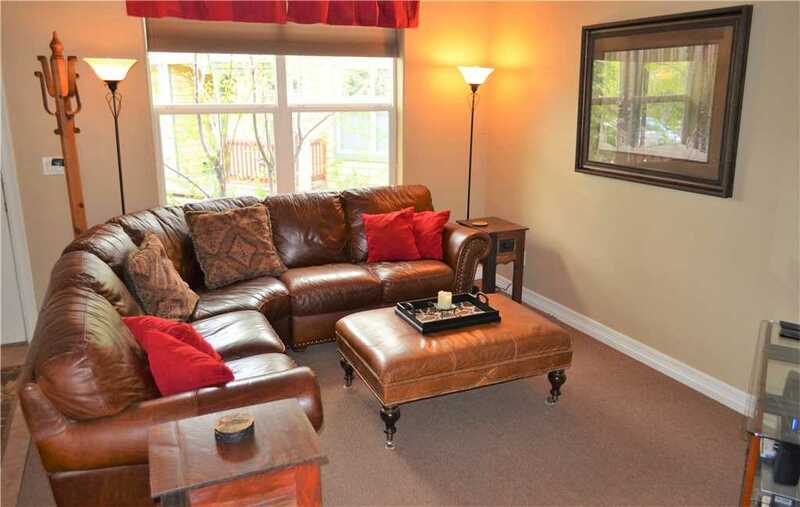 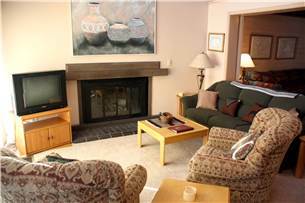 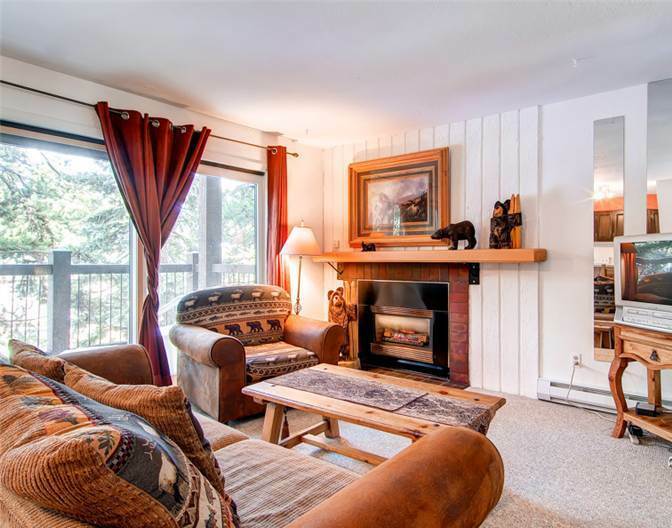 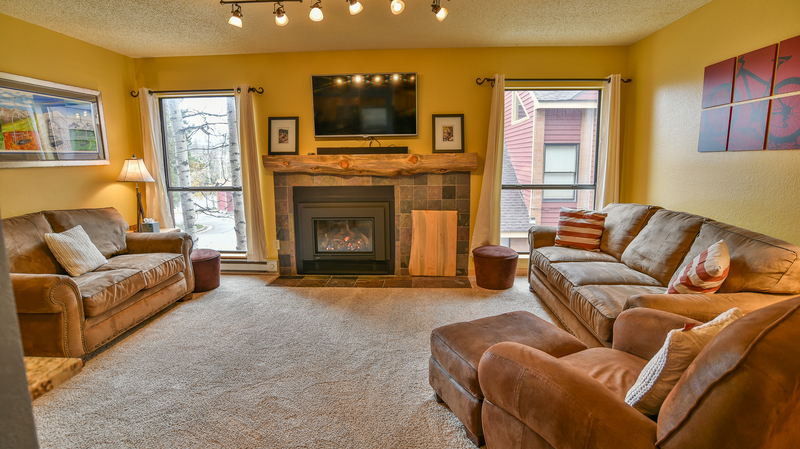 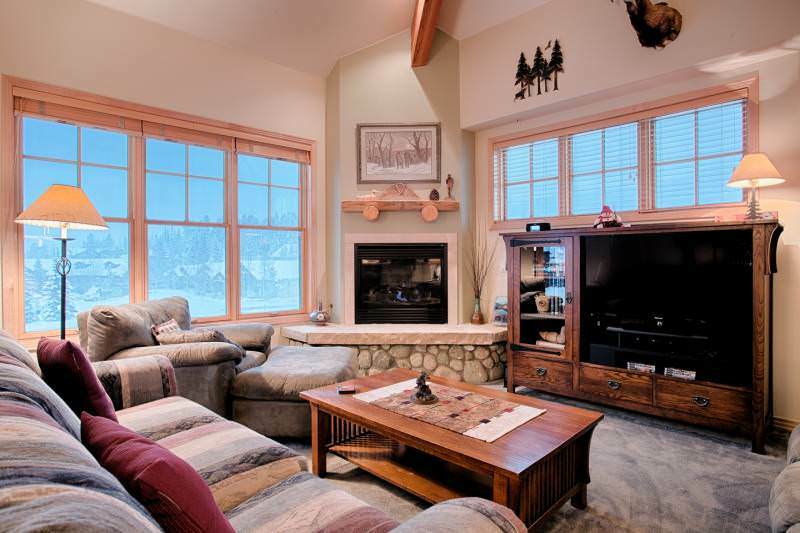 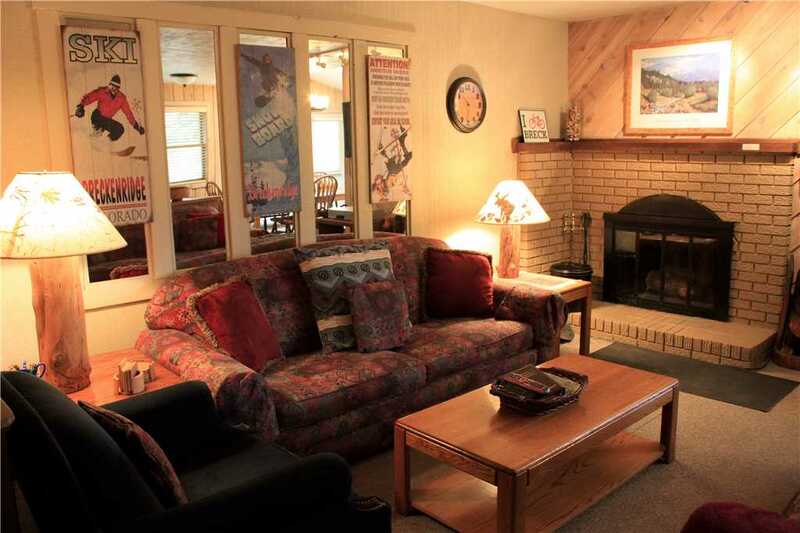 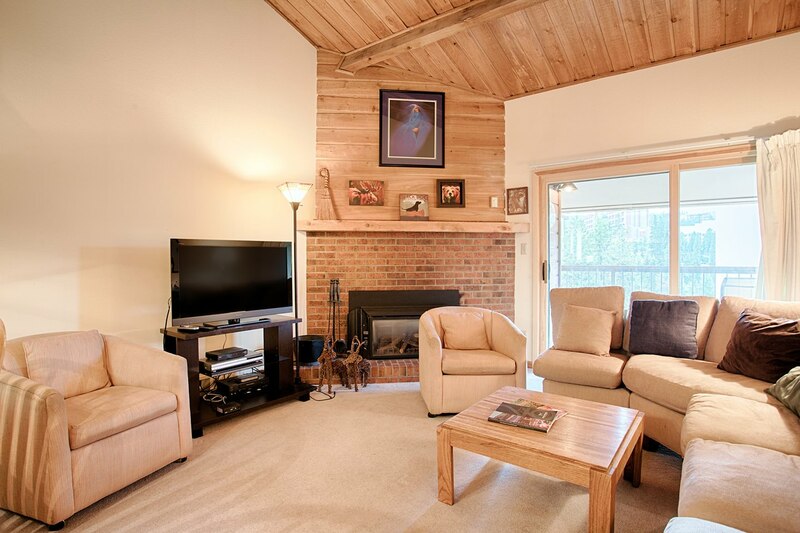 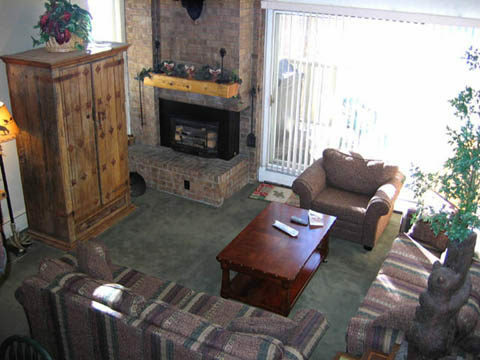 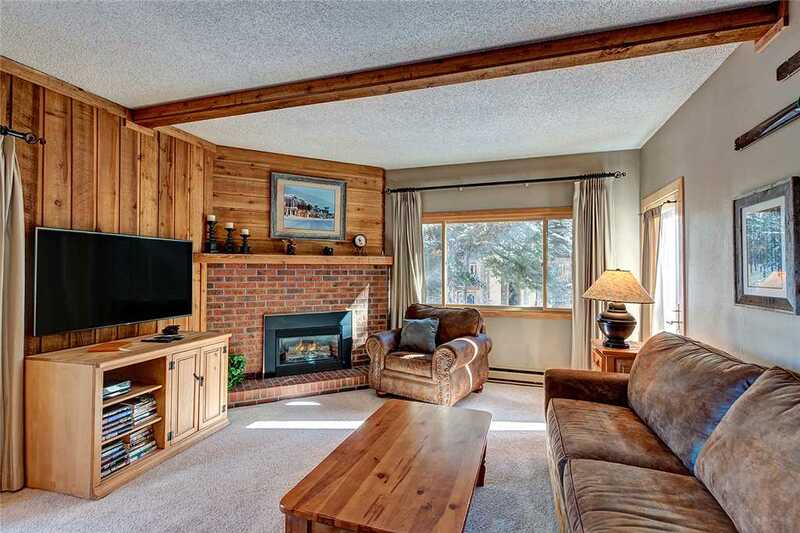 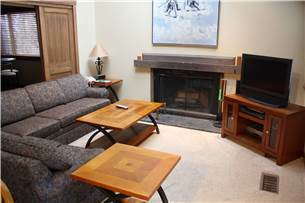 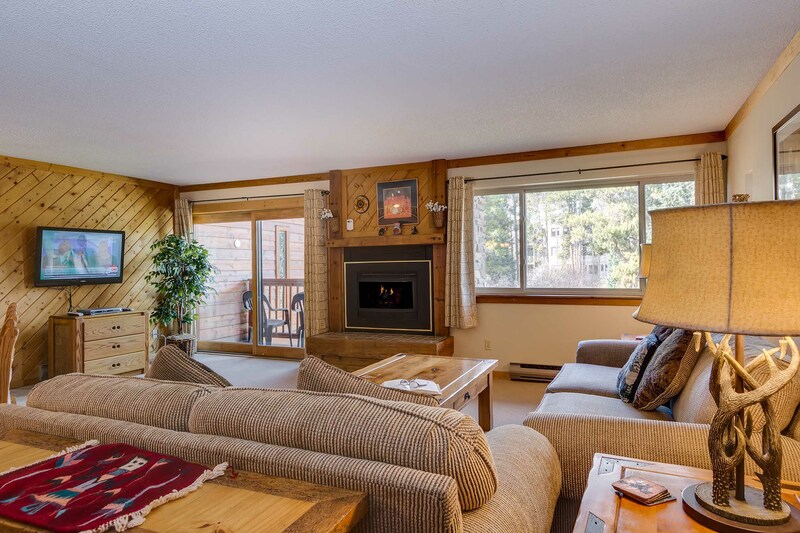 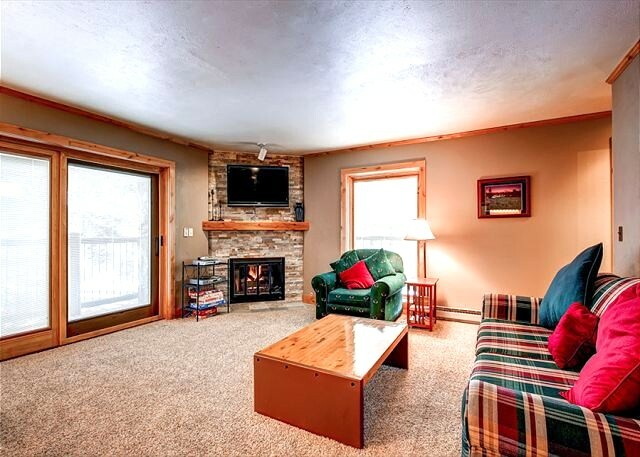 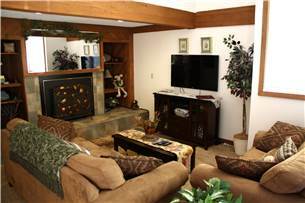 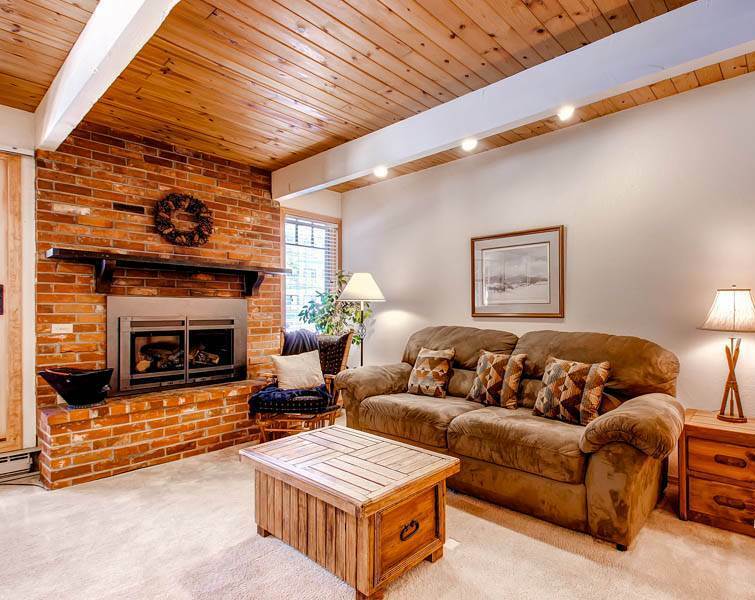 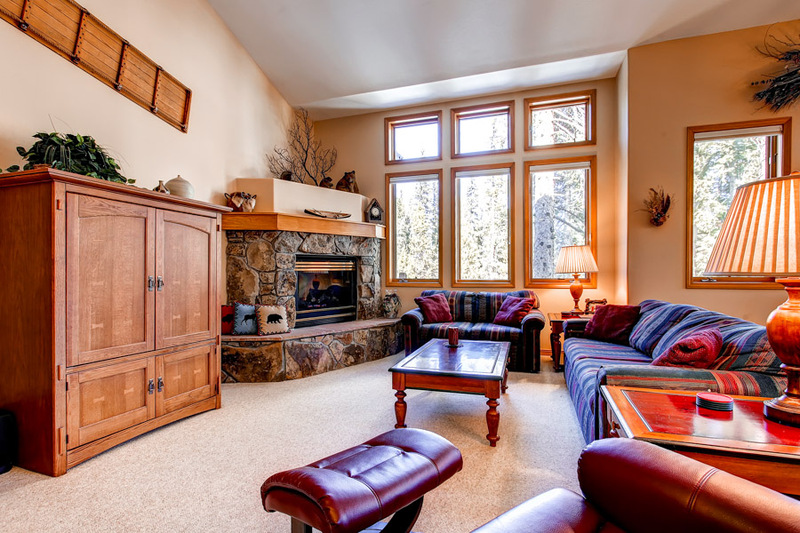 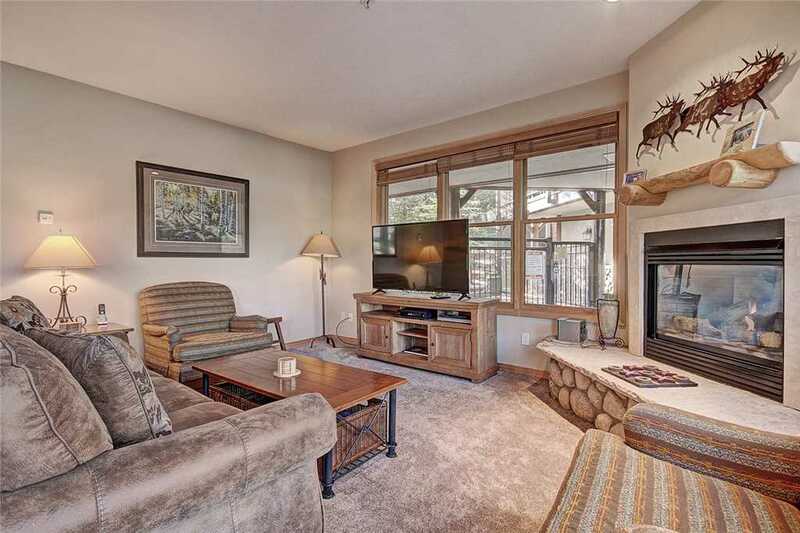 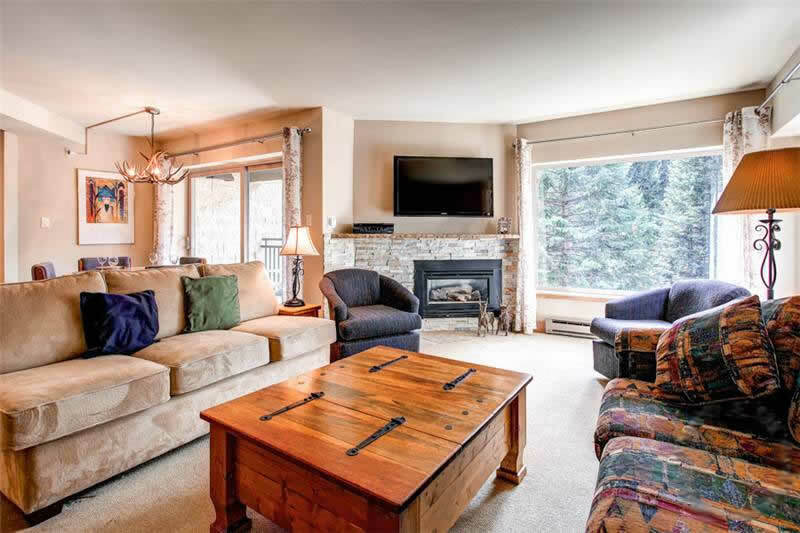 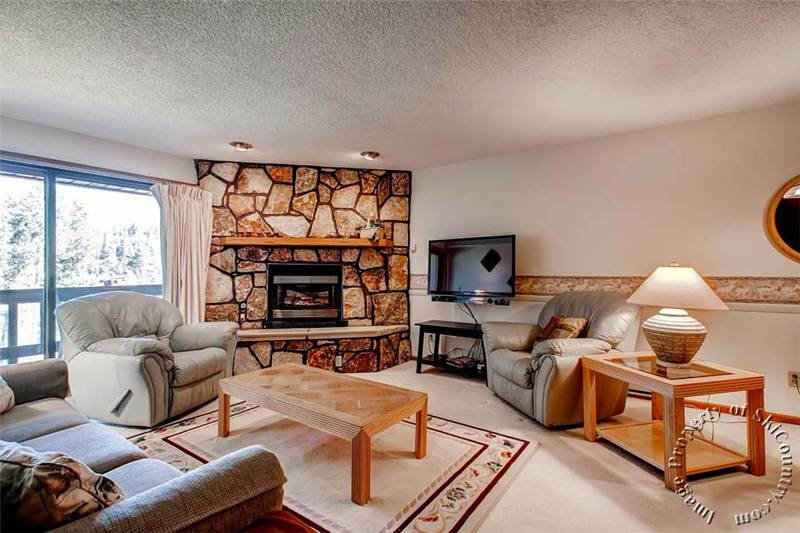 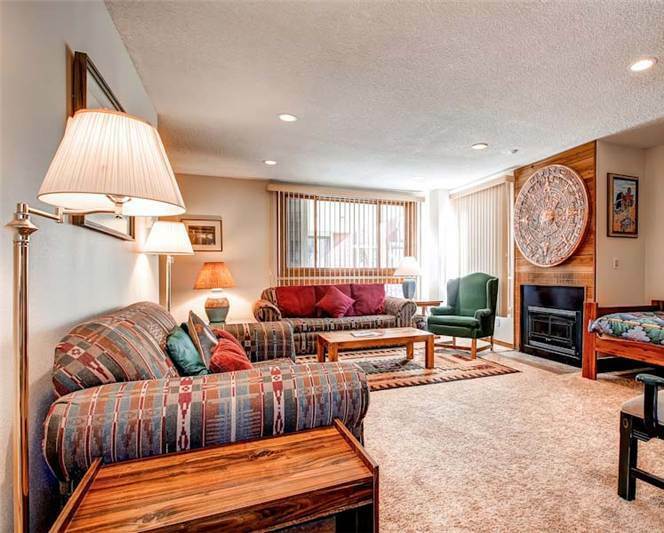 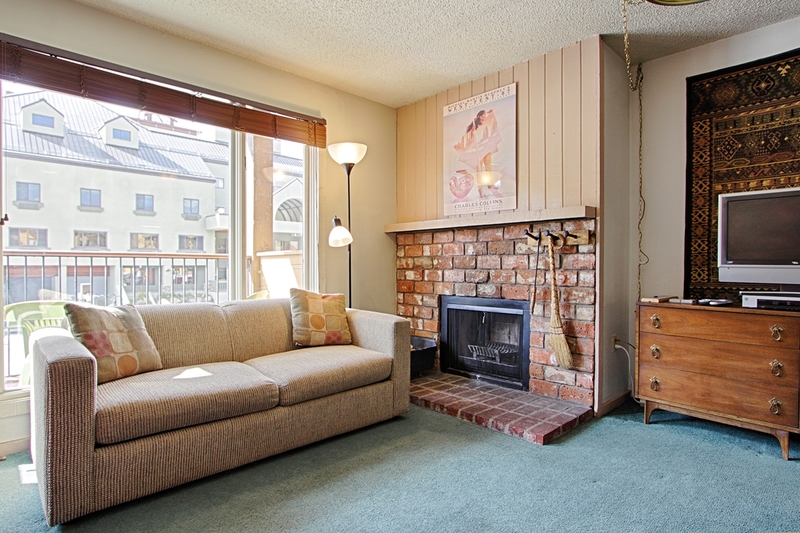 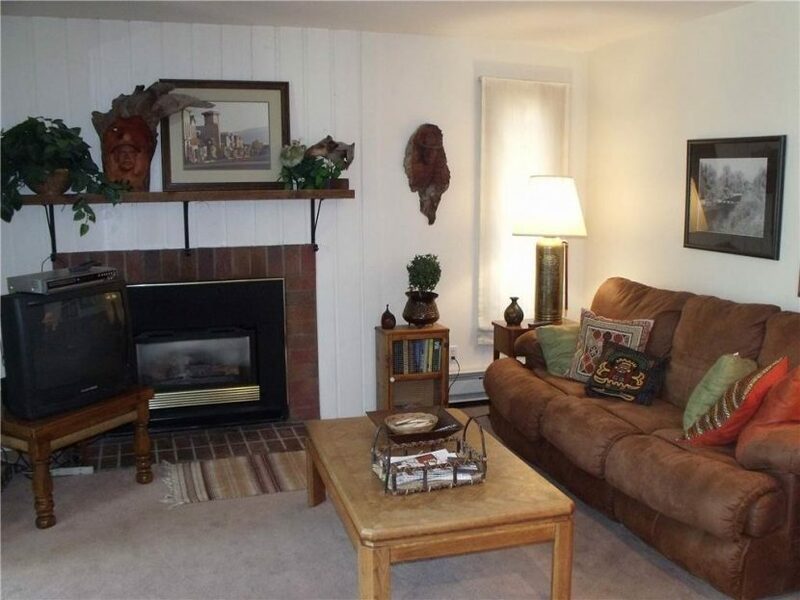 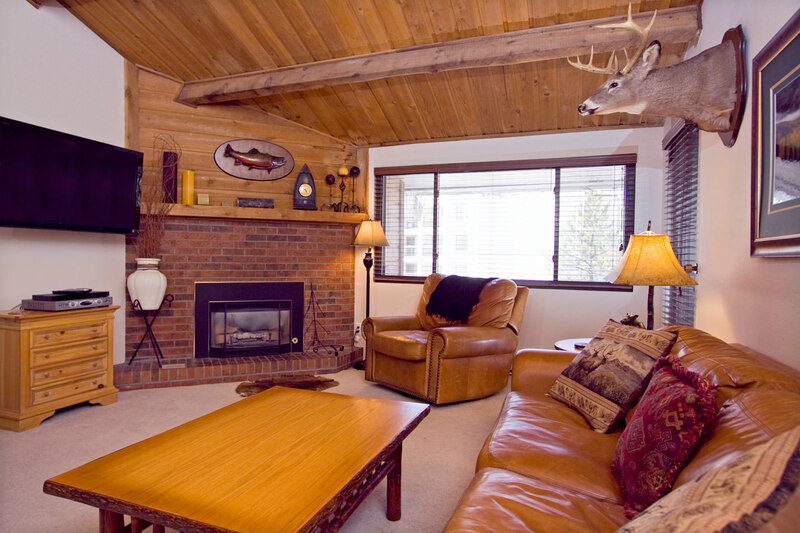 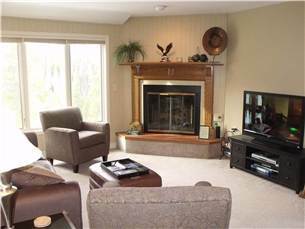 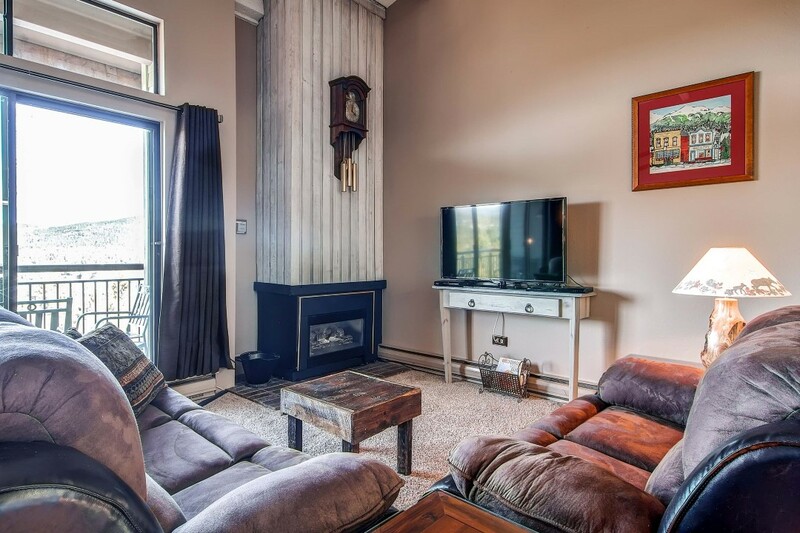 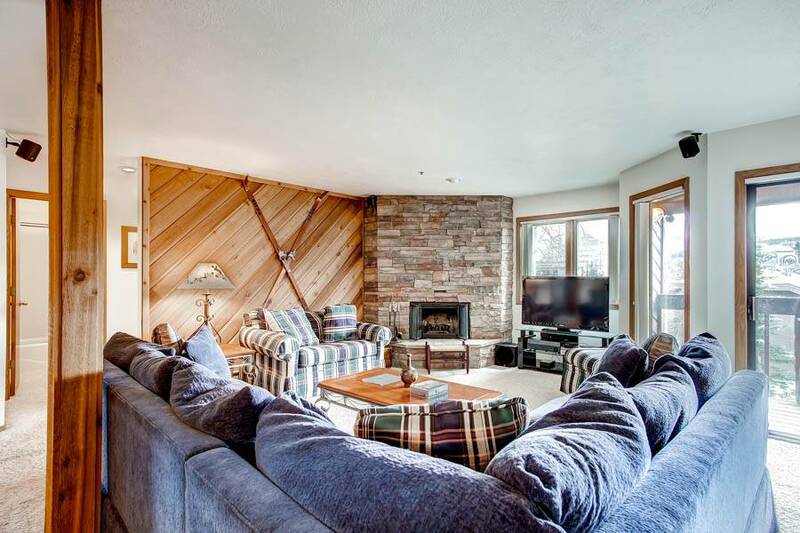 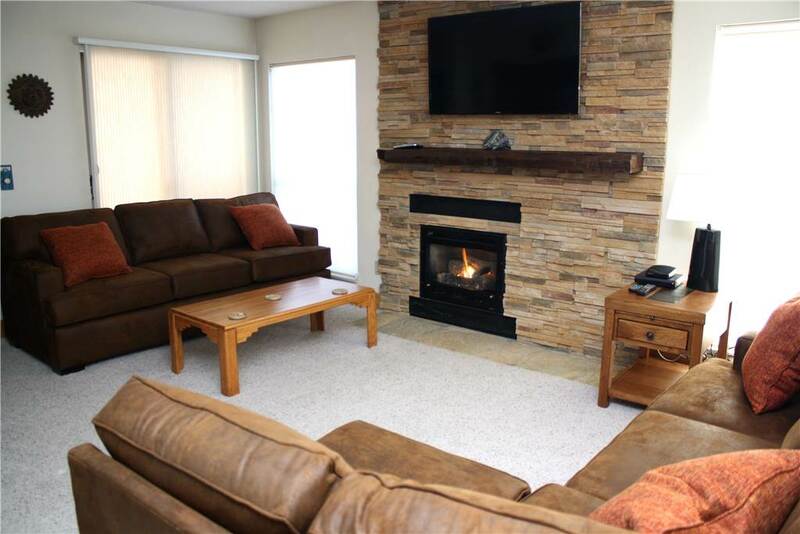 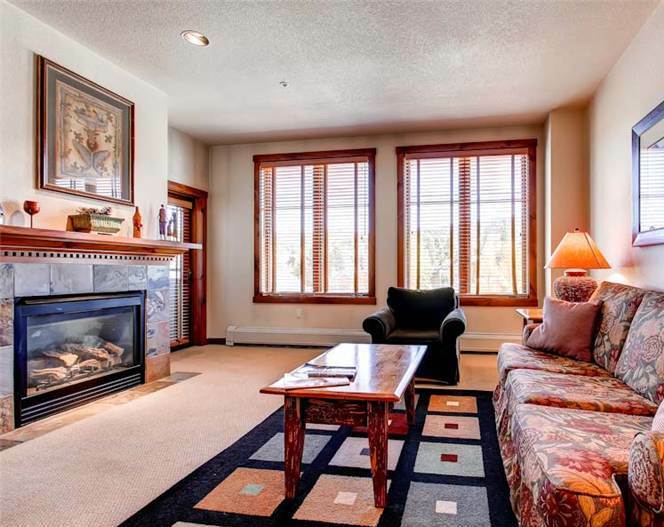 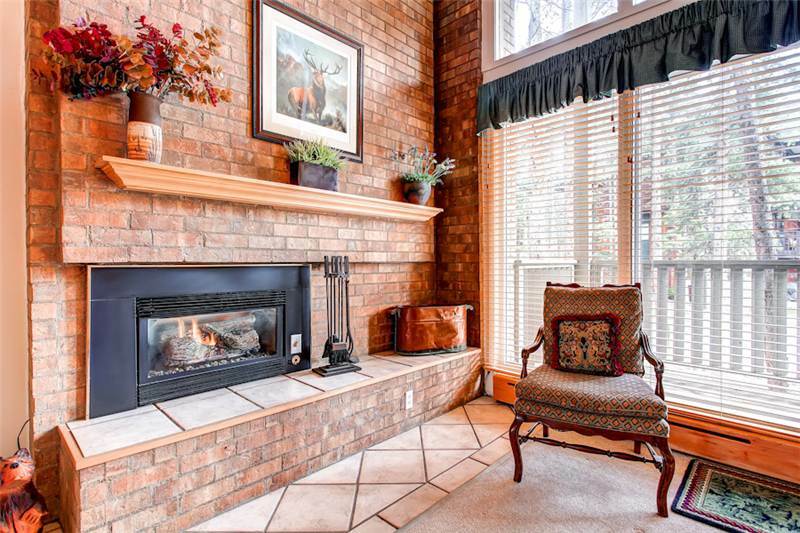 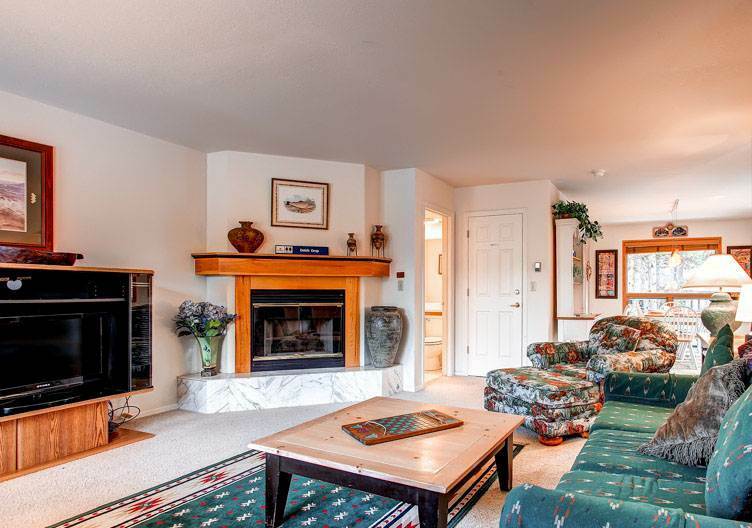 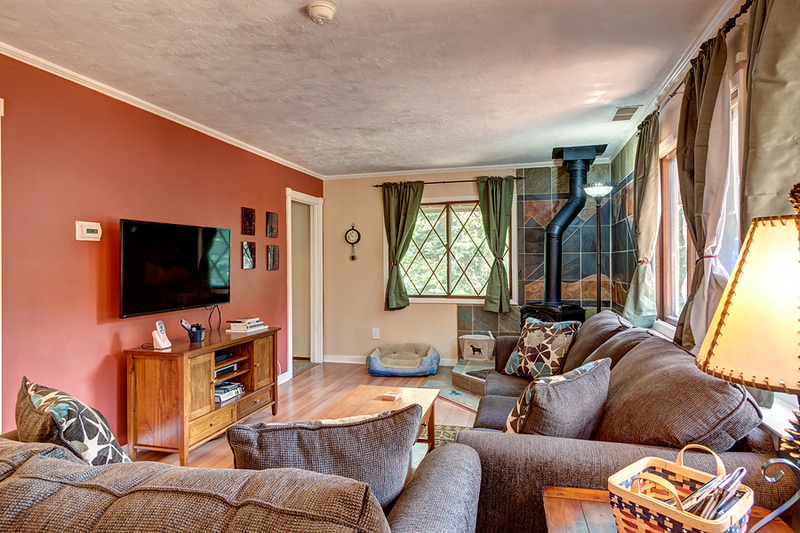 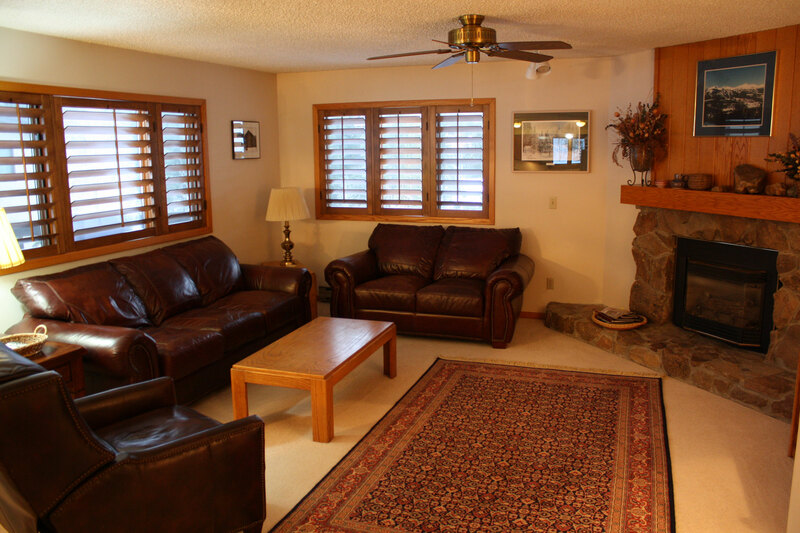 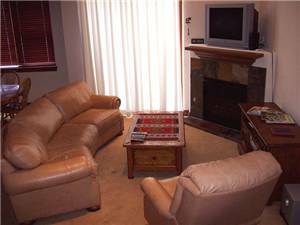 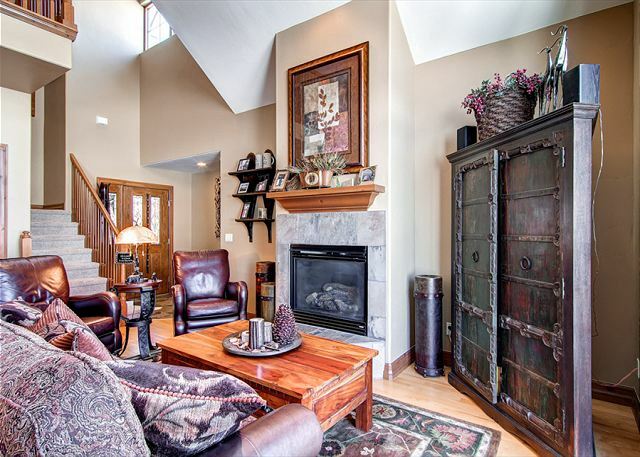 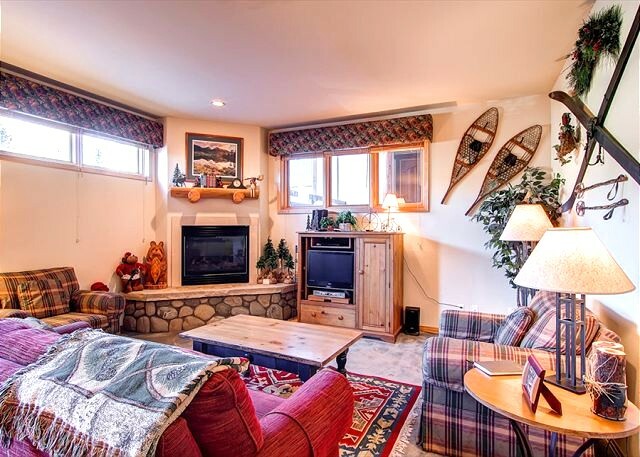 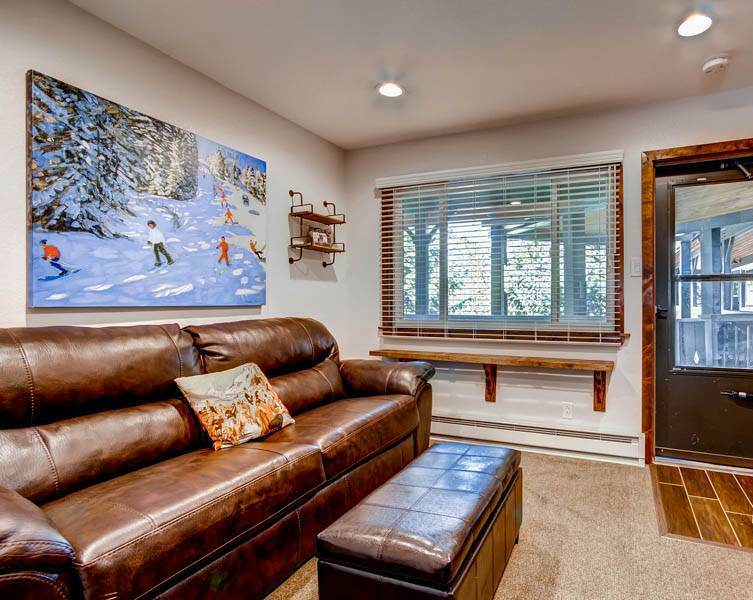 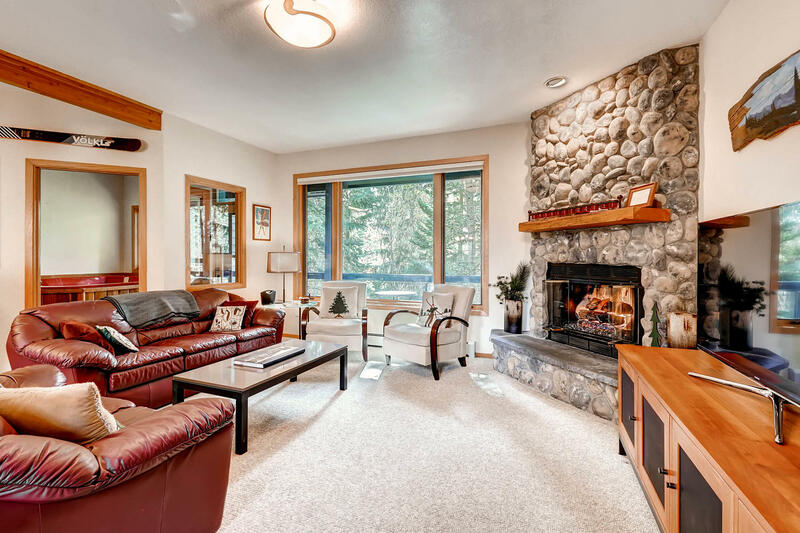 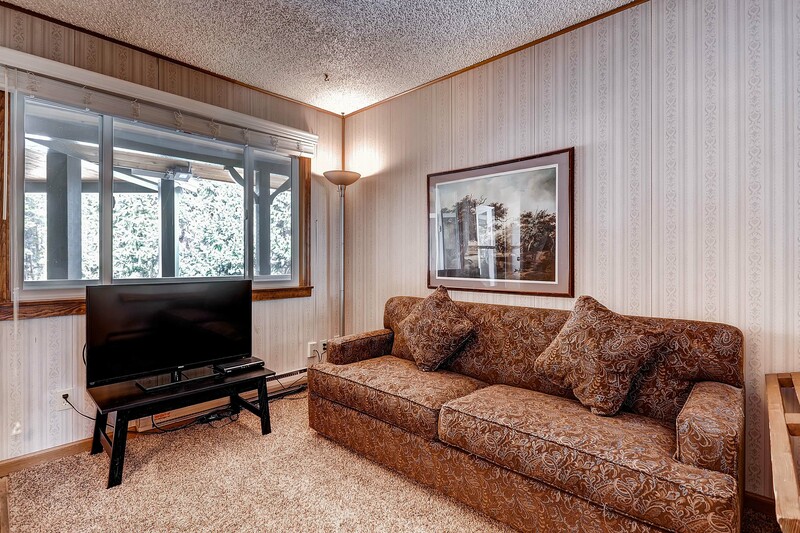 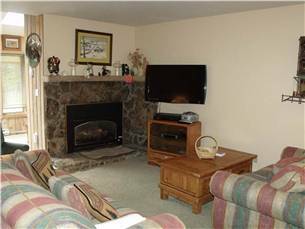 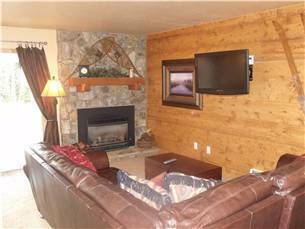 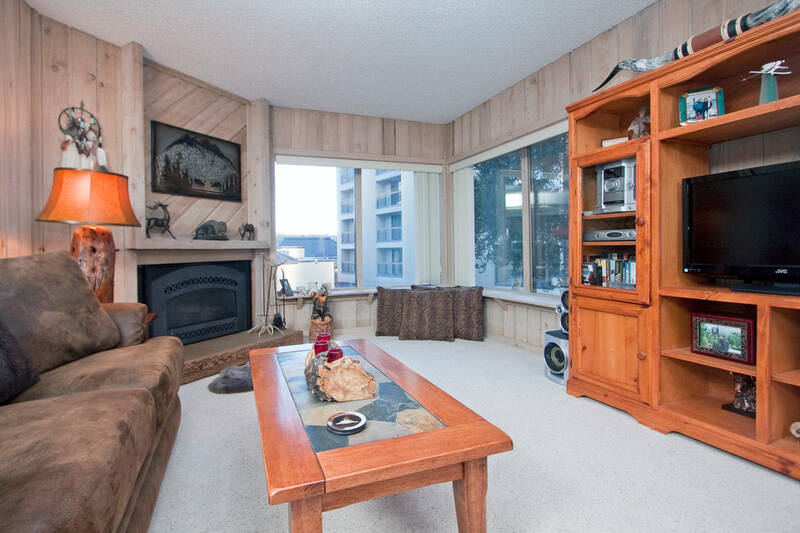 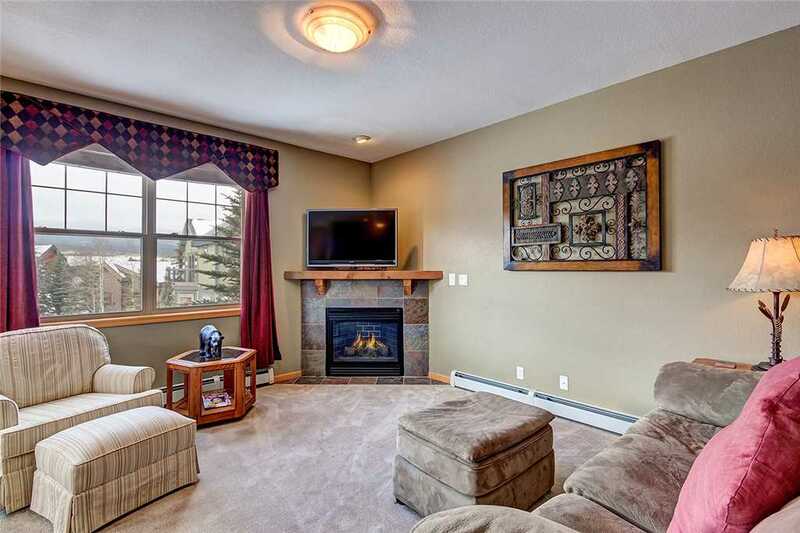 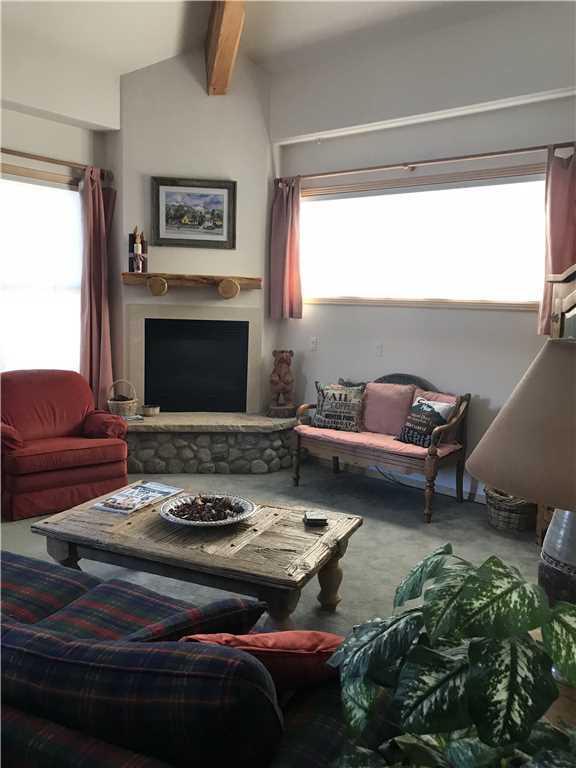 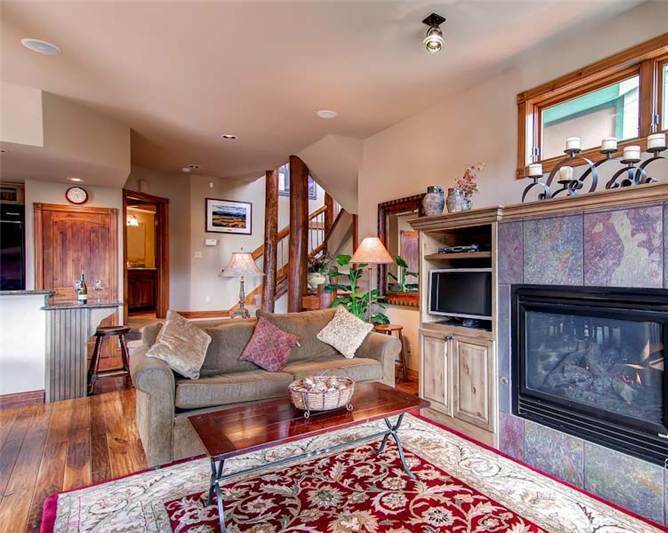 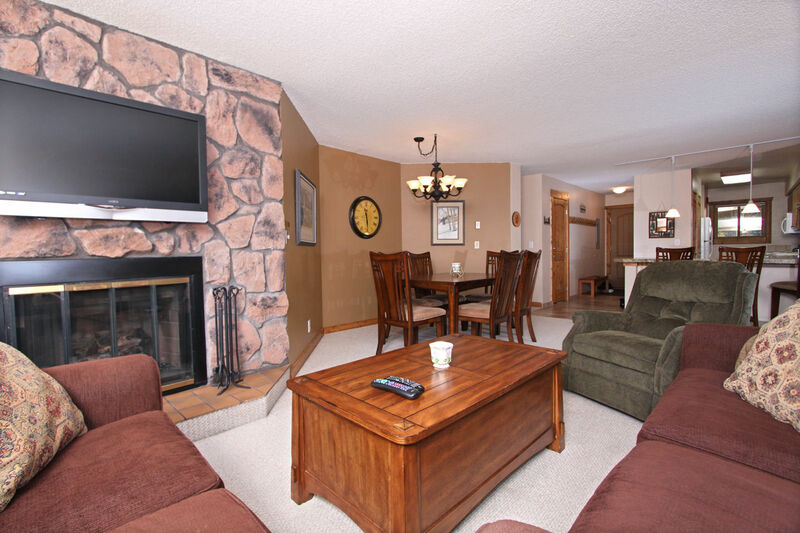 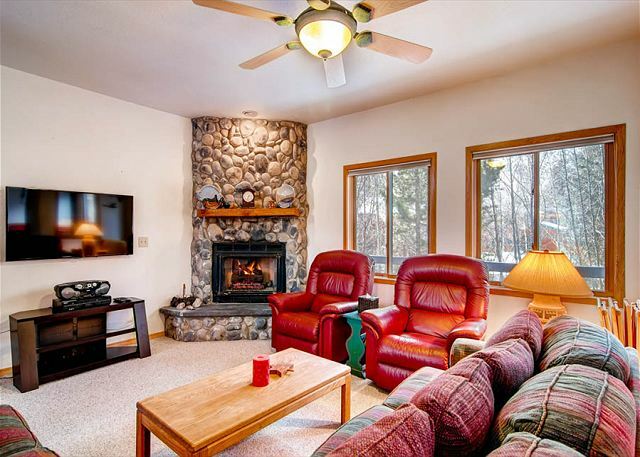 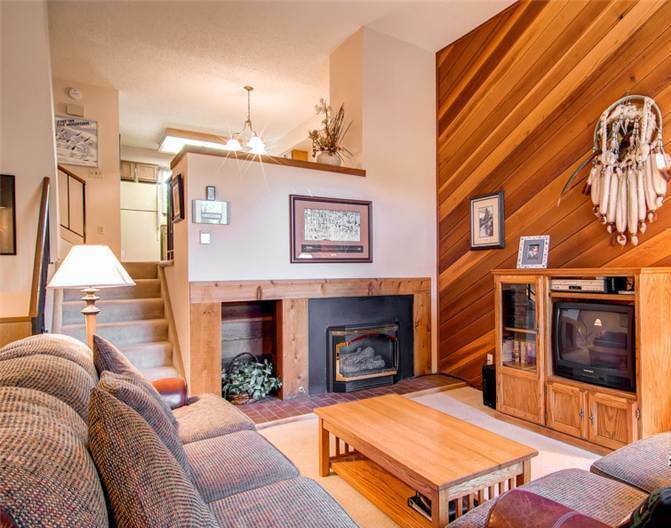 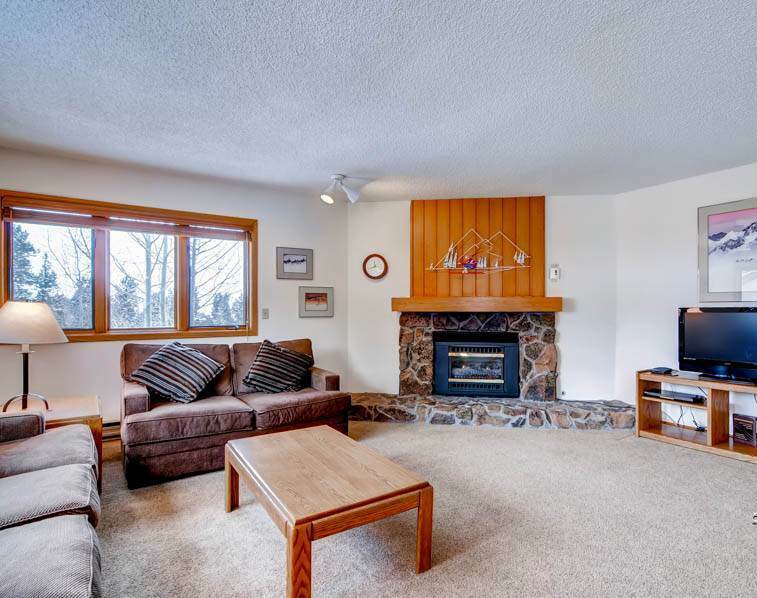 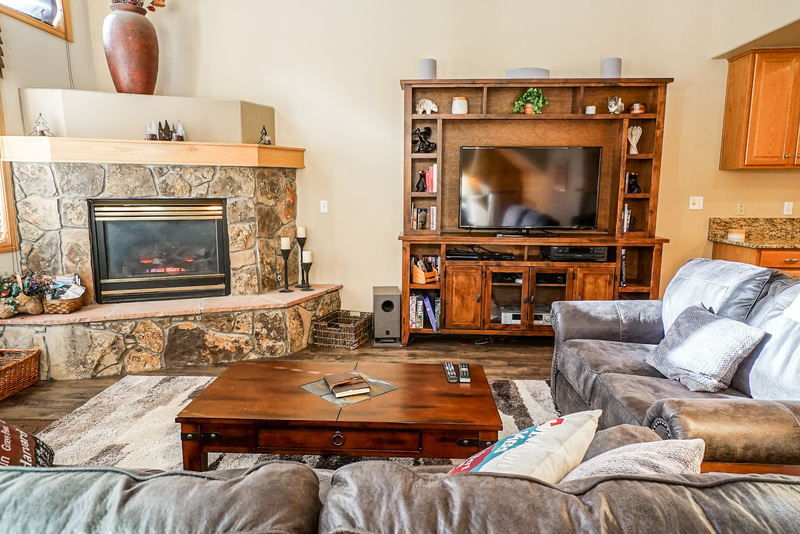 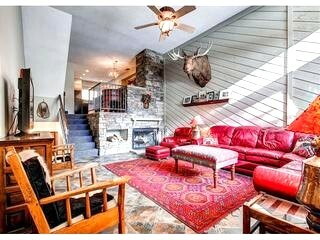 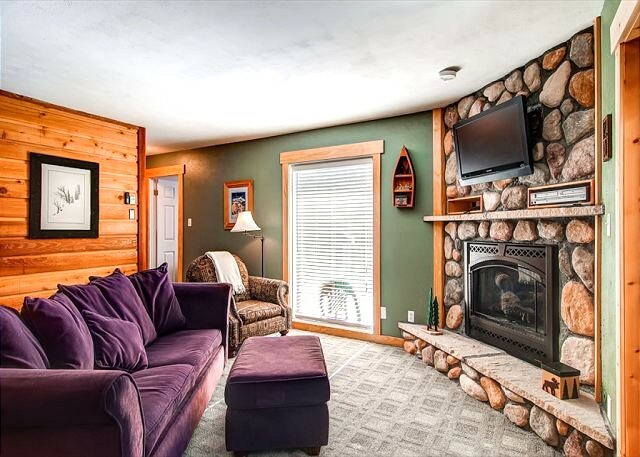 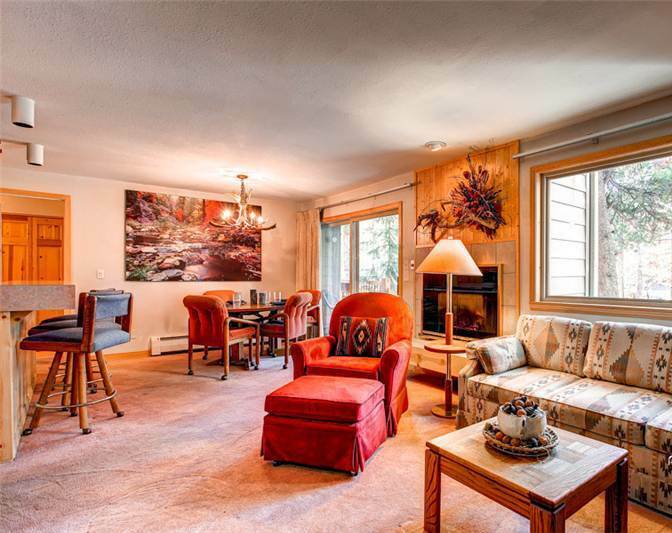 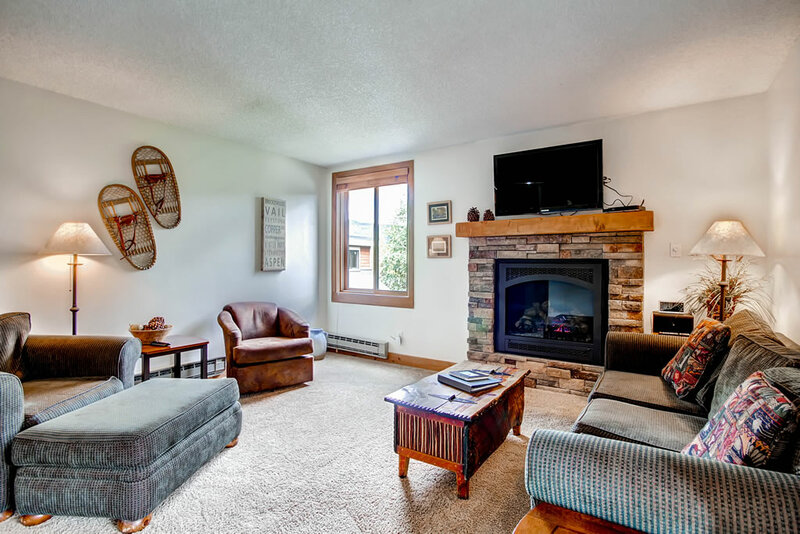 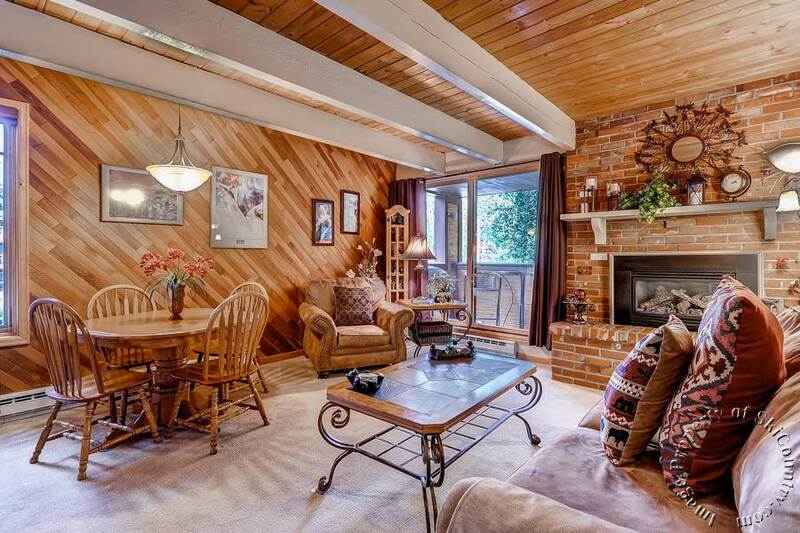 Comfy tweed couches are great for relaxing in front of a warm fire in the gas fireplace, playing one of the family board games or catching up on movies on the huge flatscreen TV with DVD/VCR. 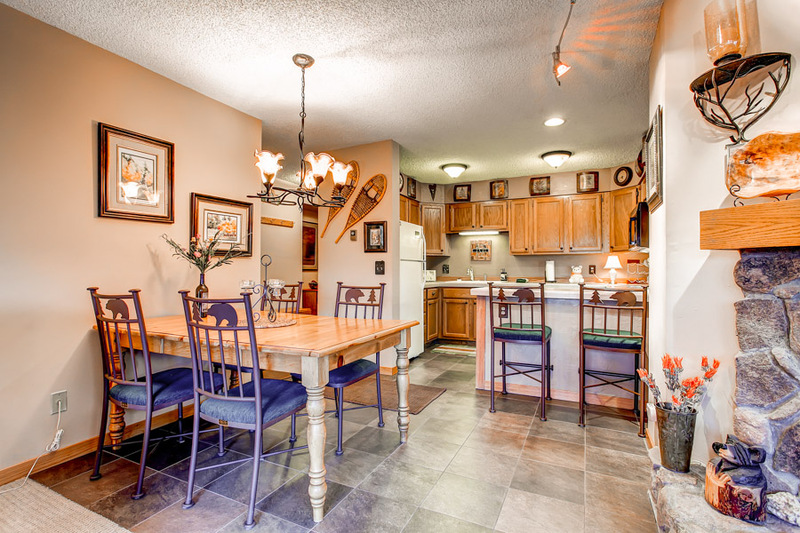 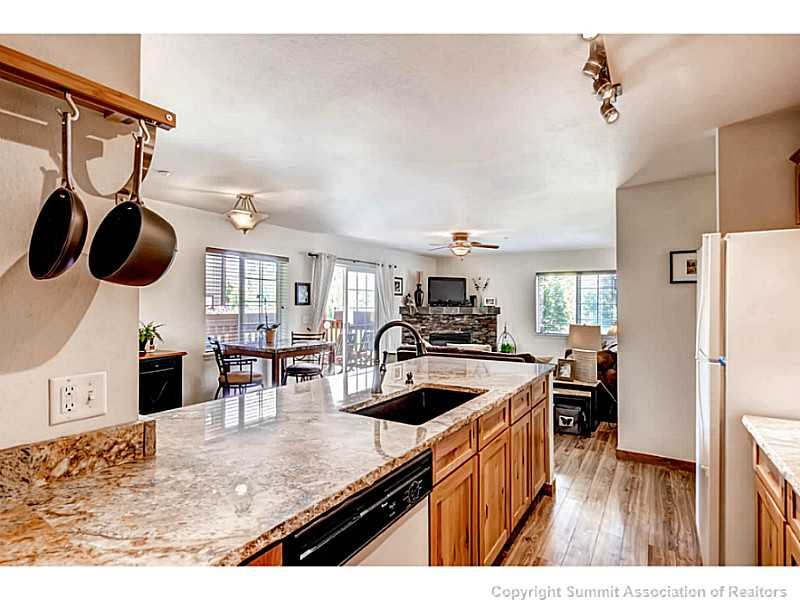 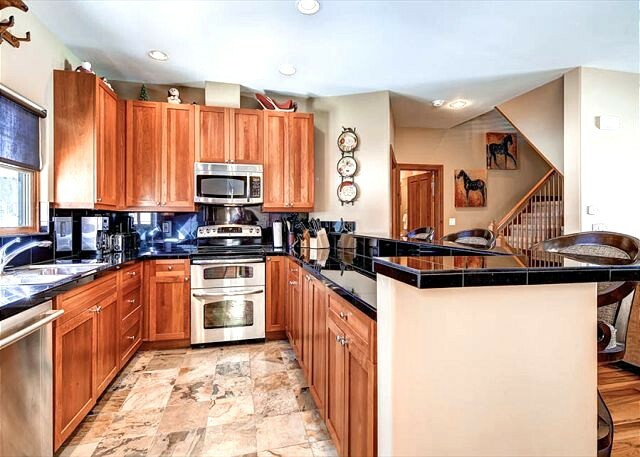 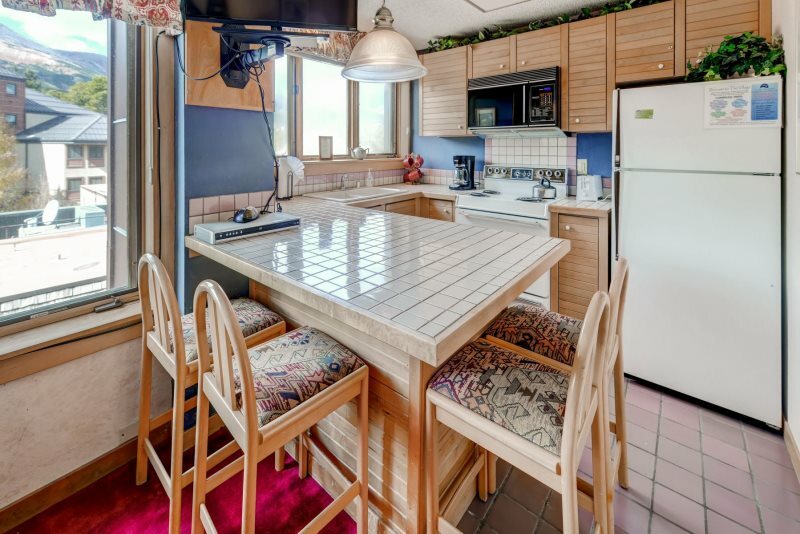 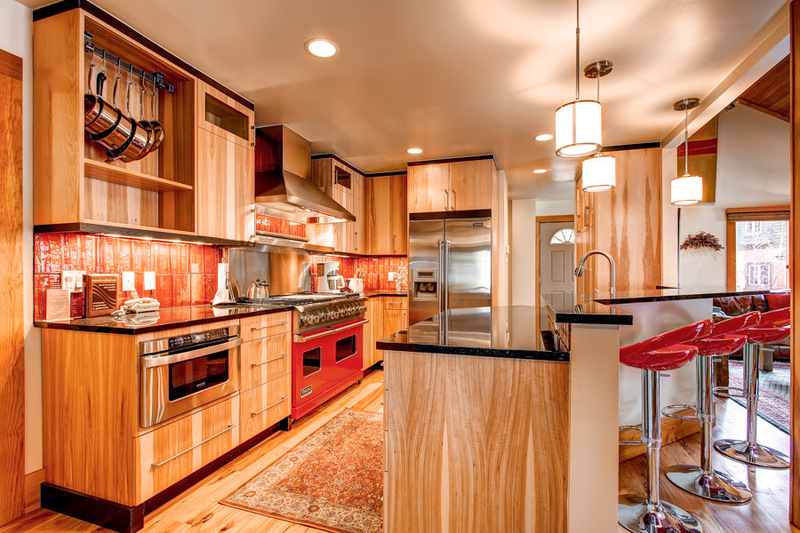 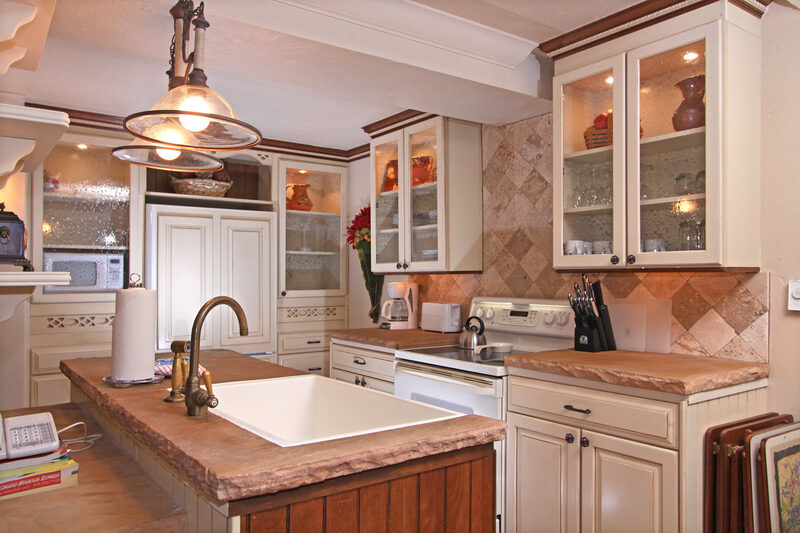 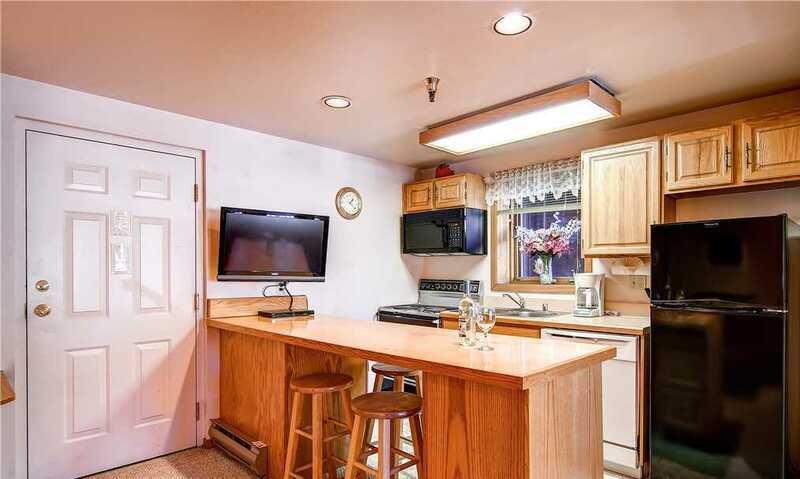 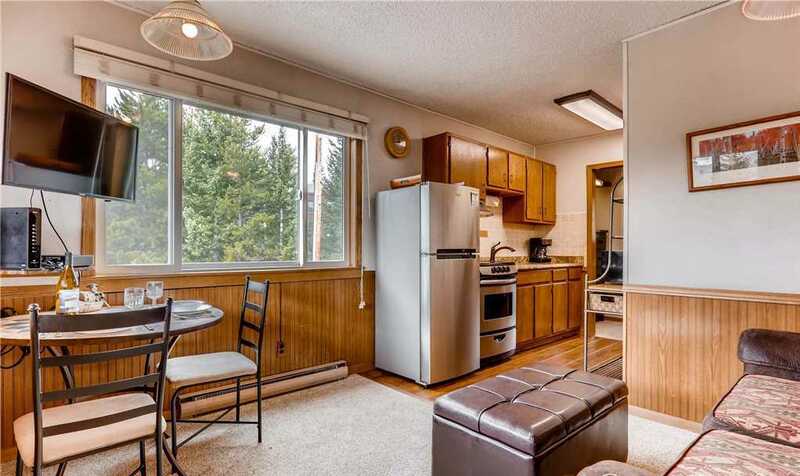 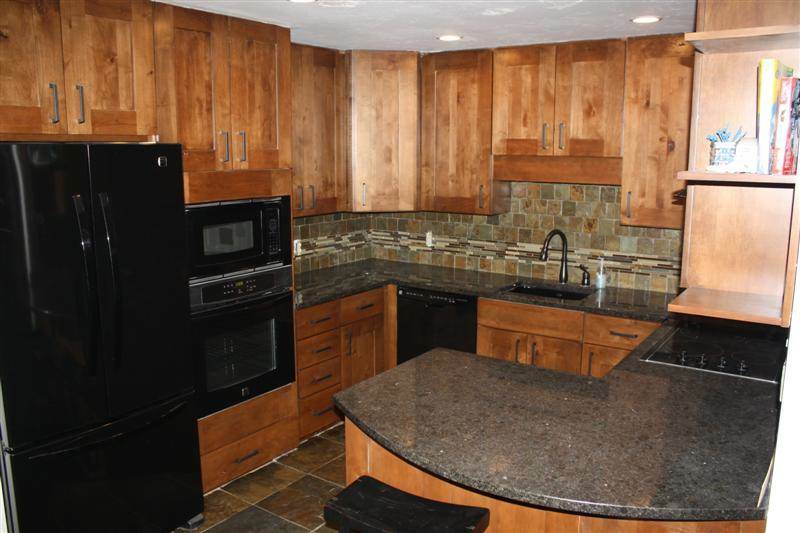 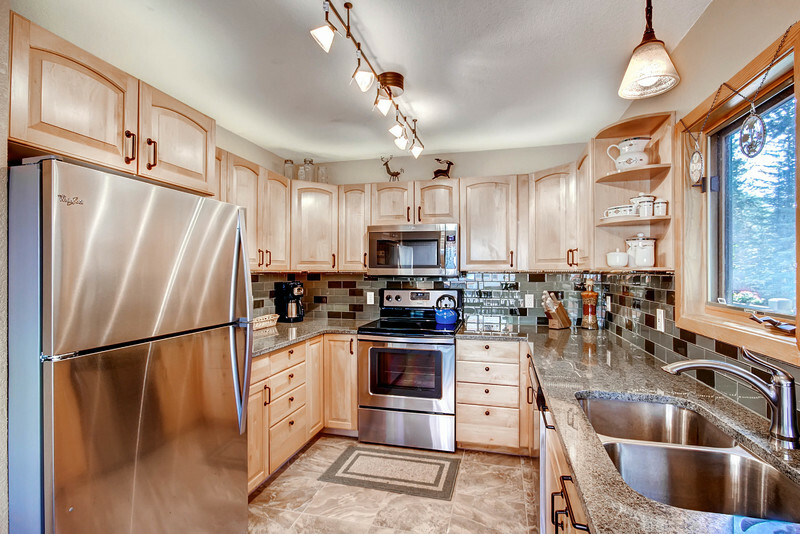 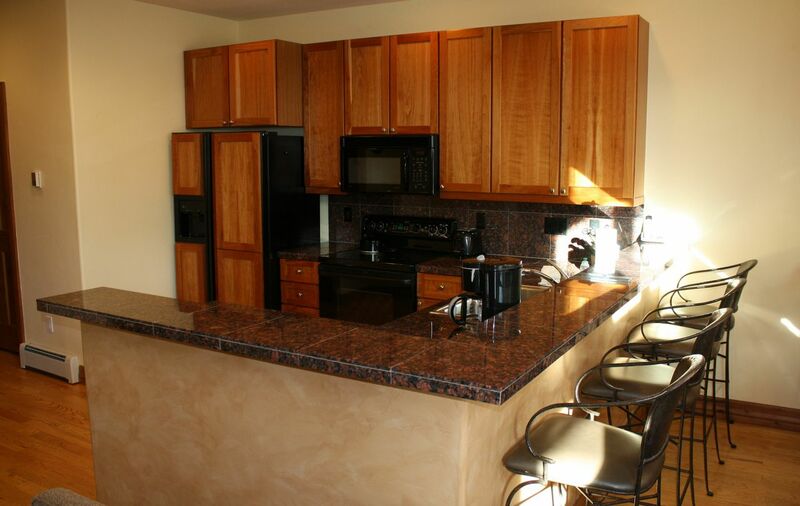 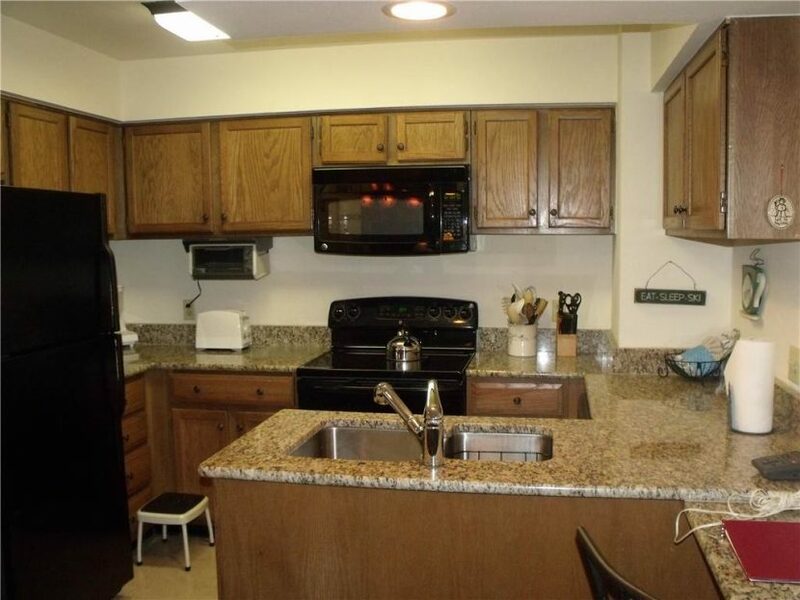 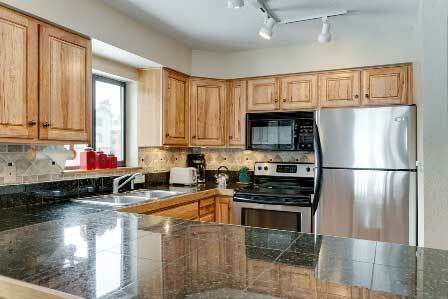 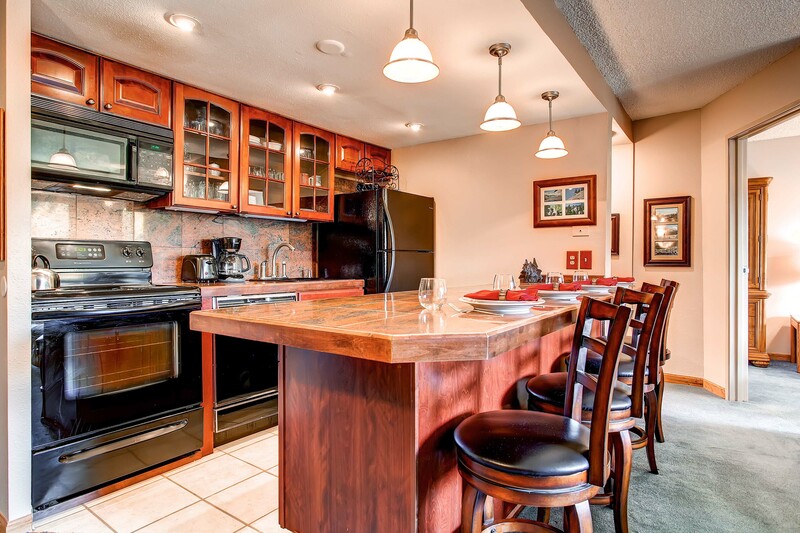 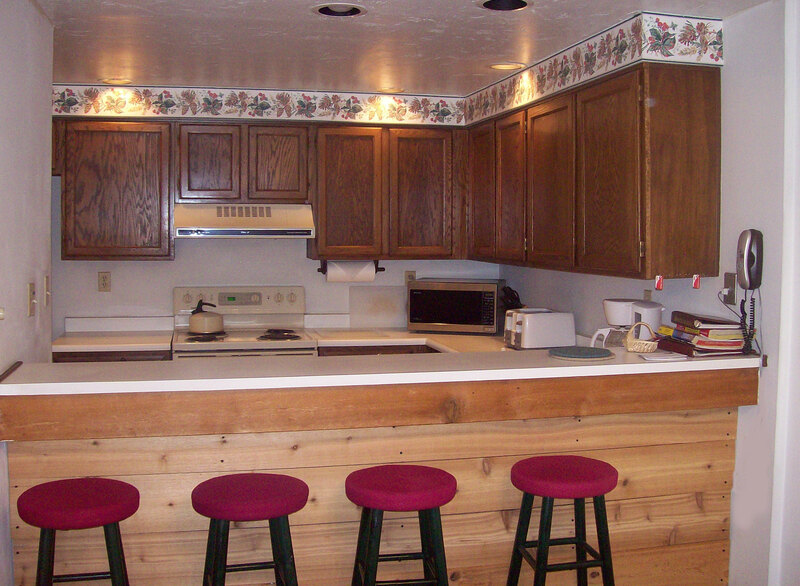 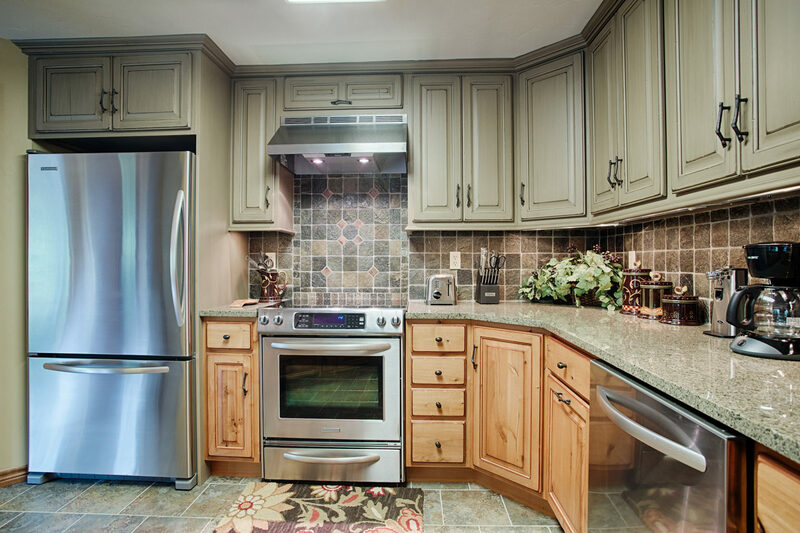 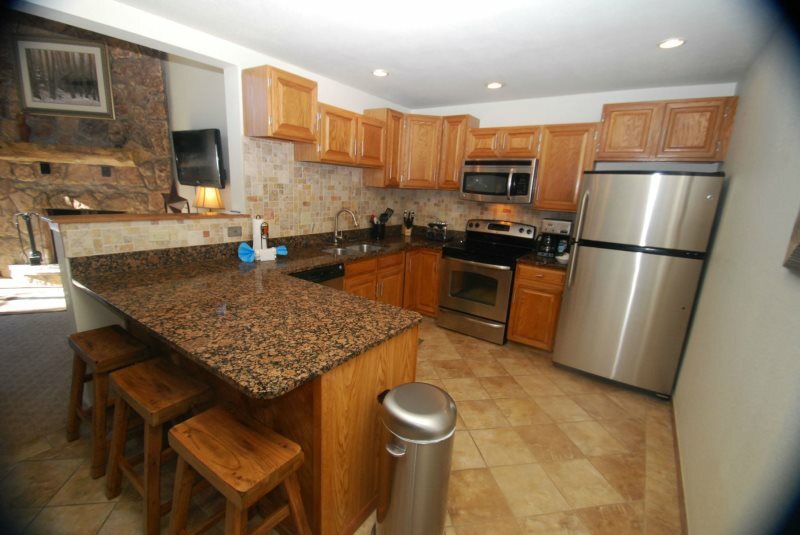 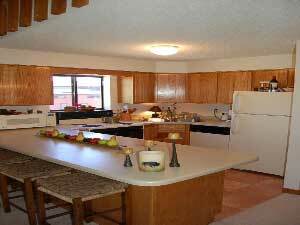 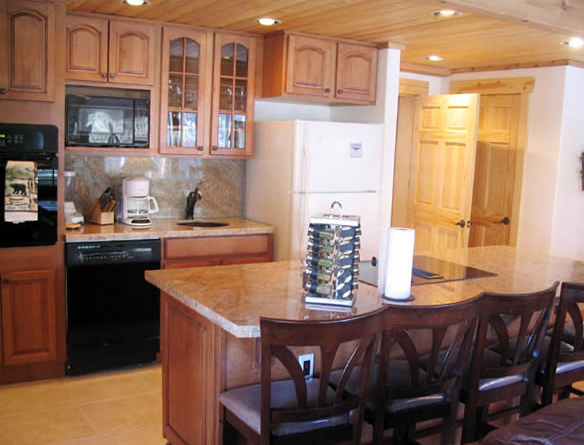 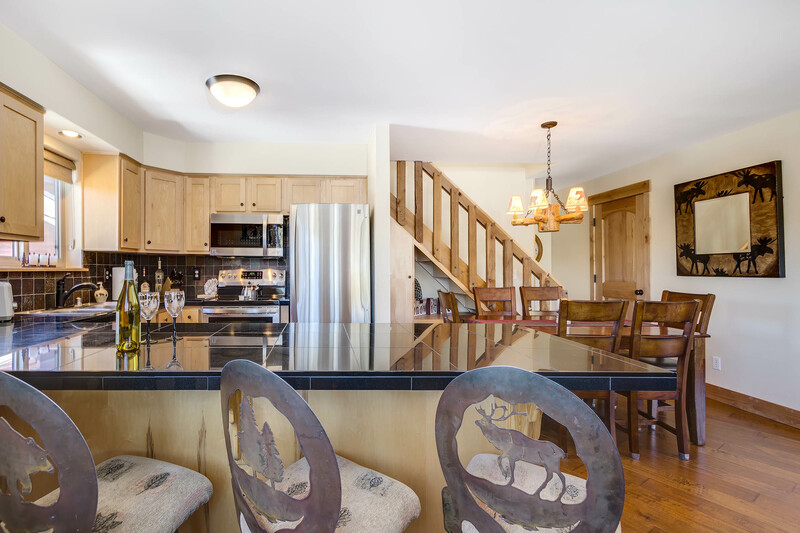 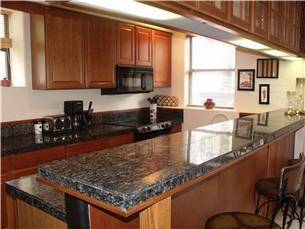 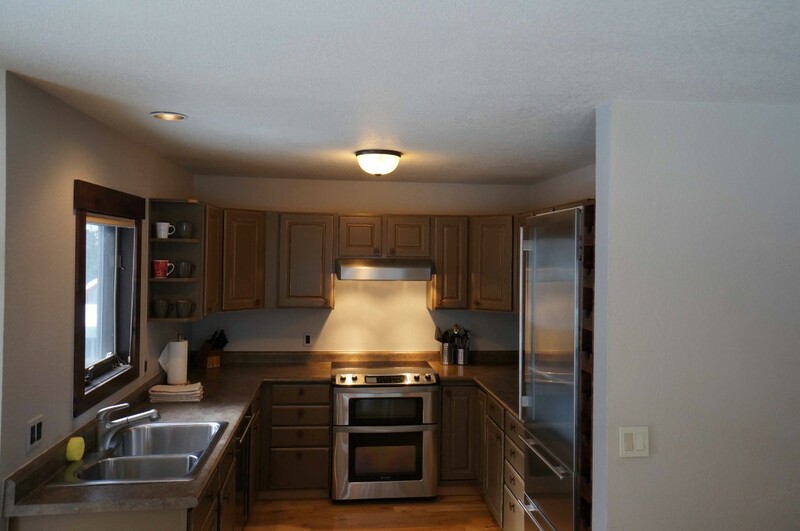 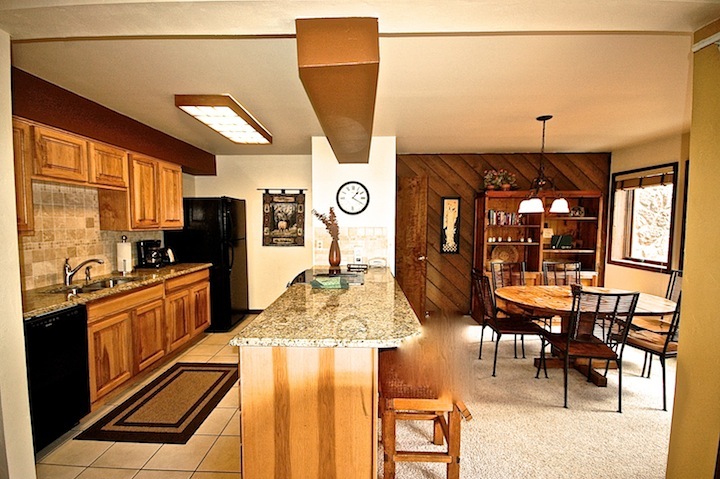 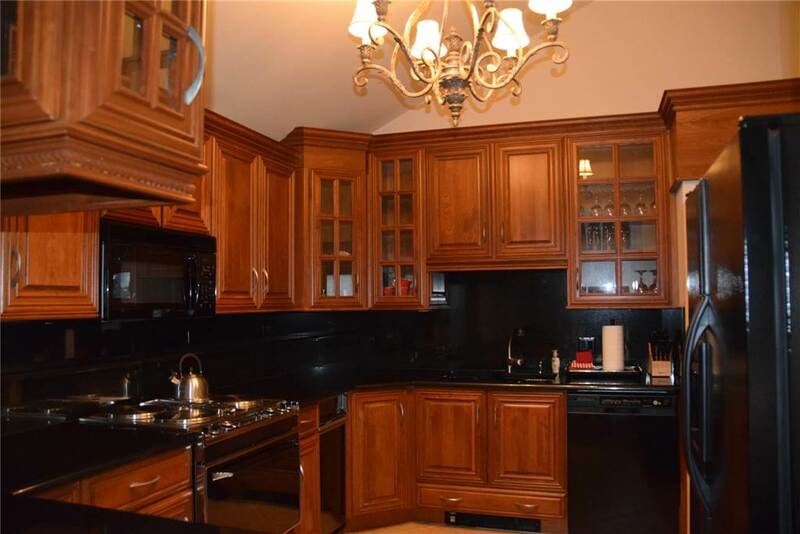 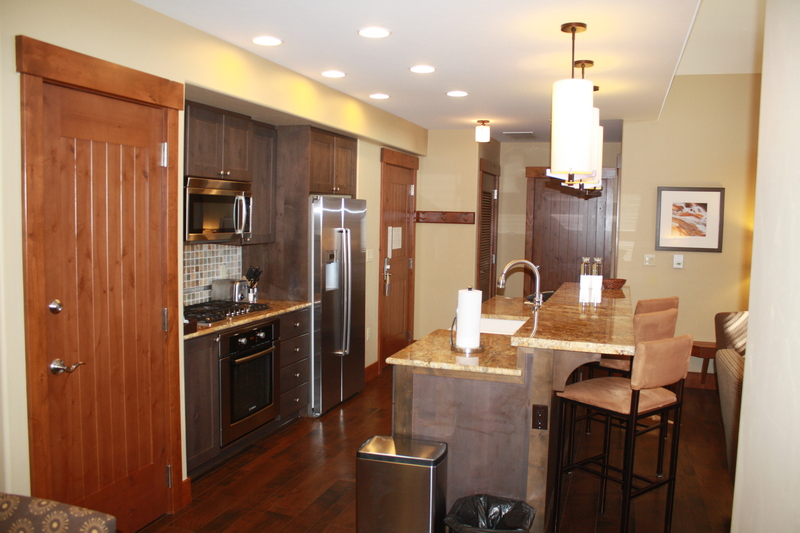 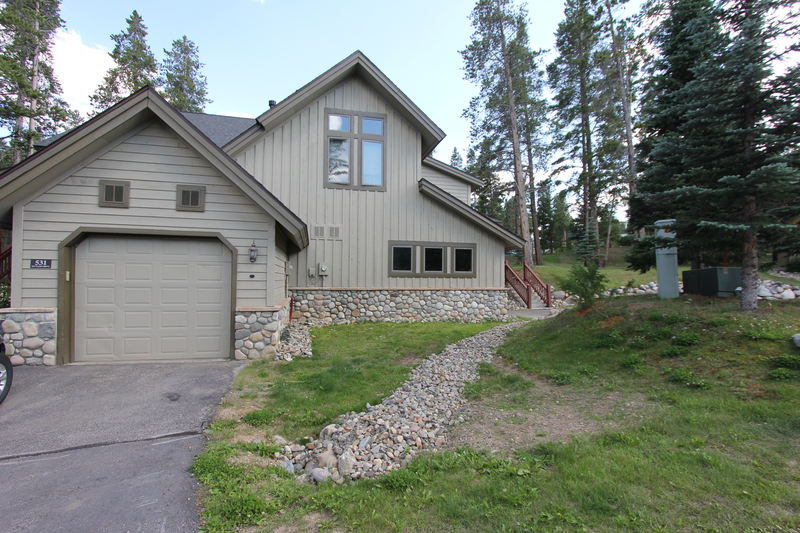 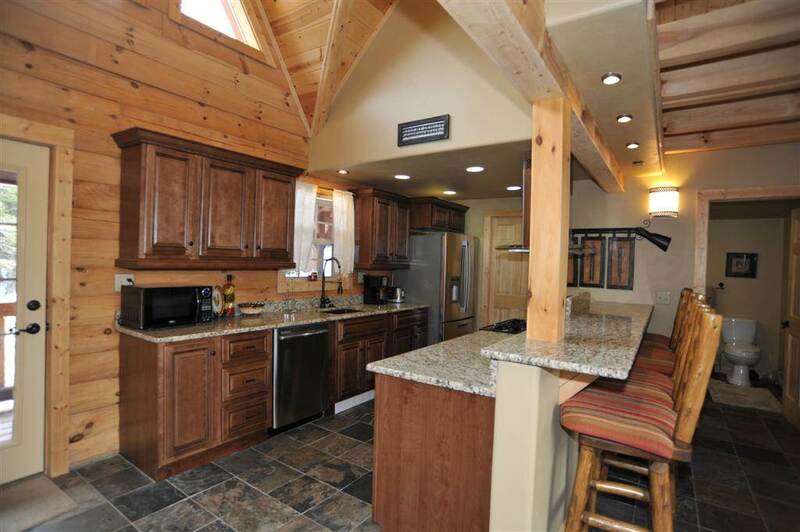 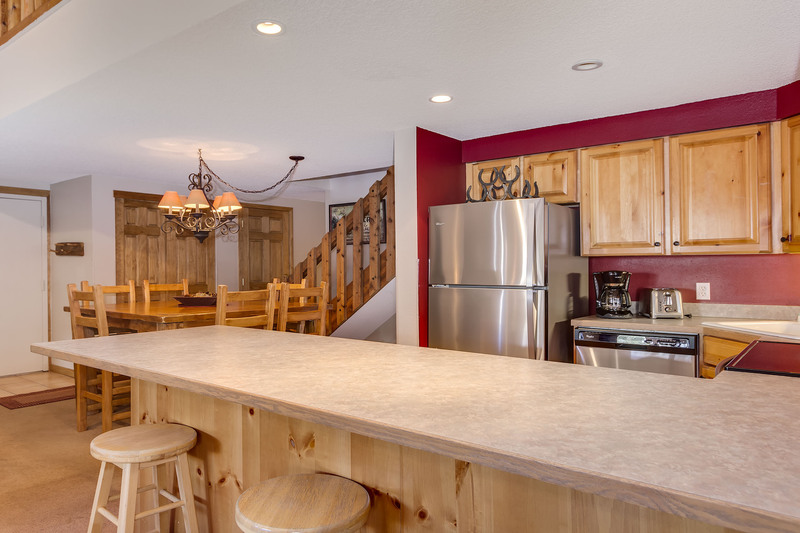 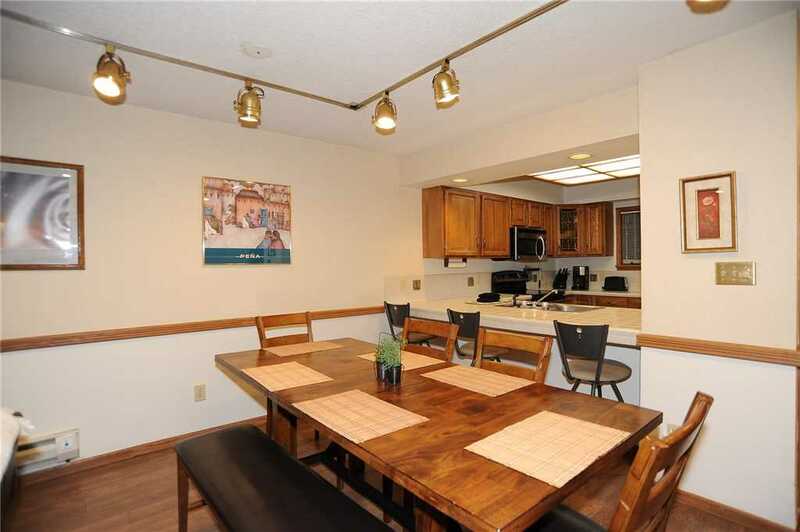 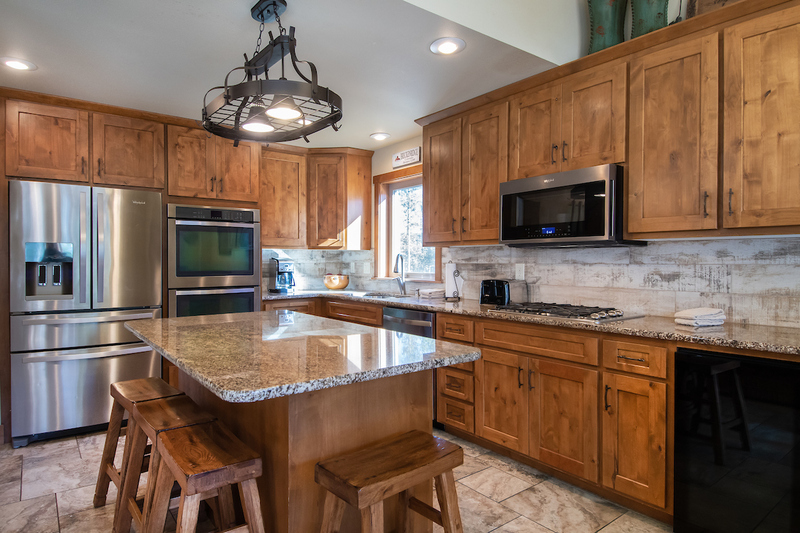 The updated kitchen features granite tile countertops, new cabinetry and big breakfast bar with seating for four people. 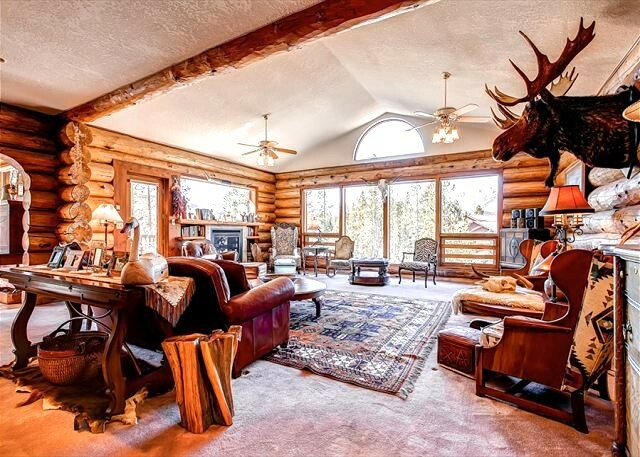 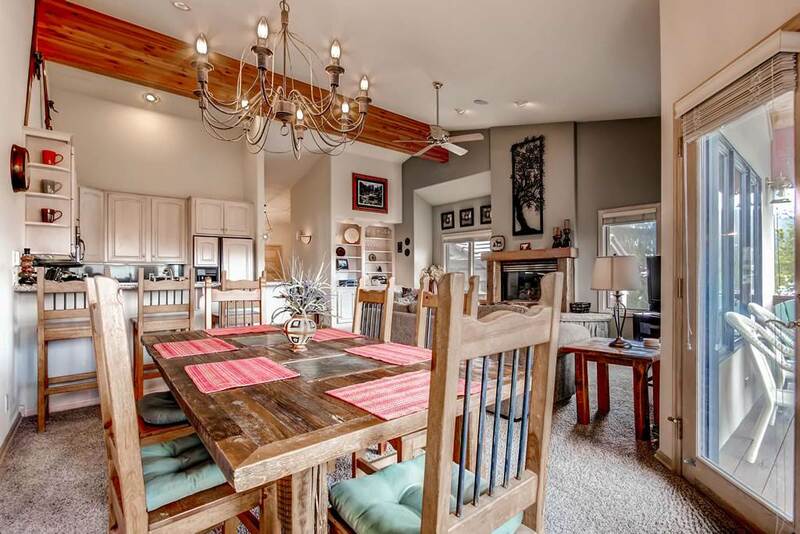 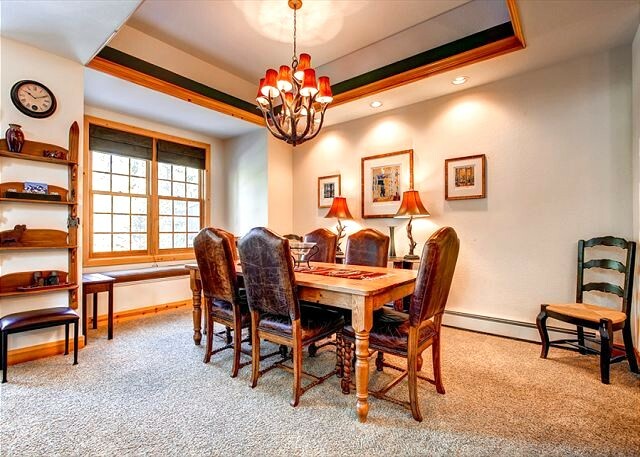 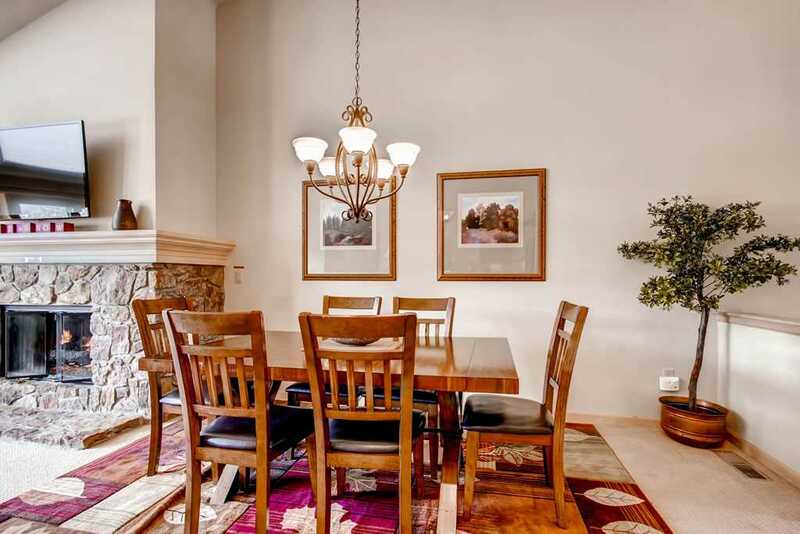 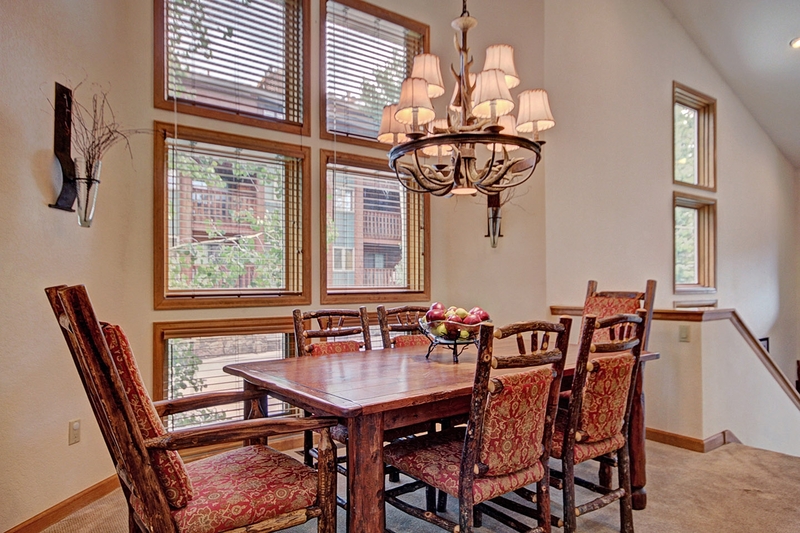 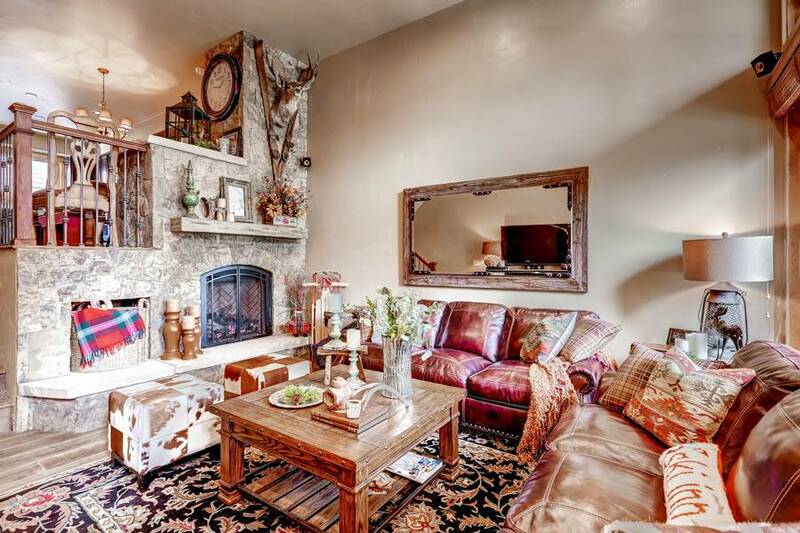 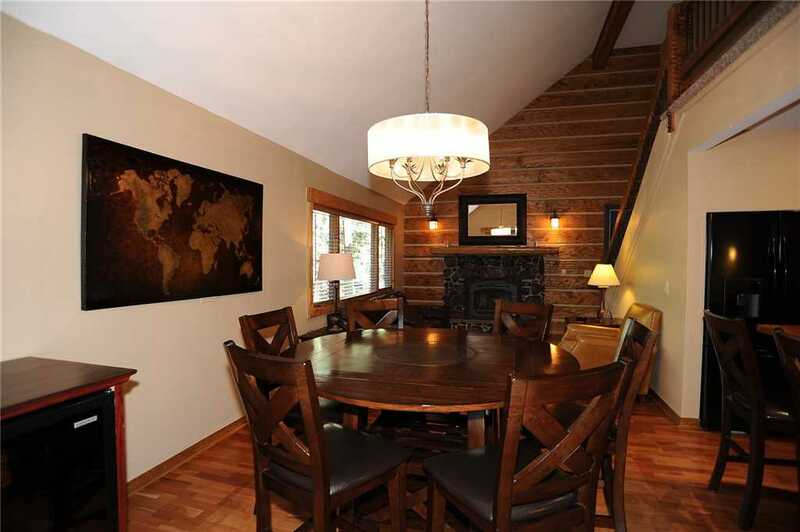 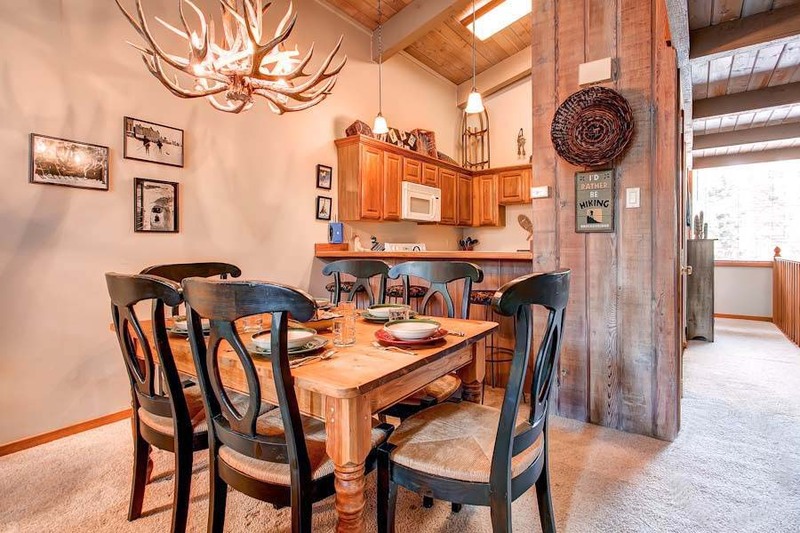 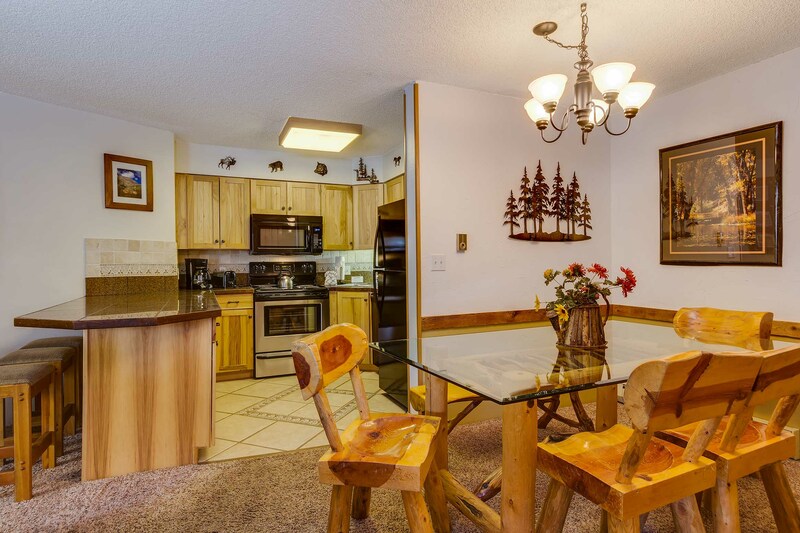 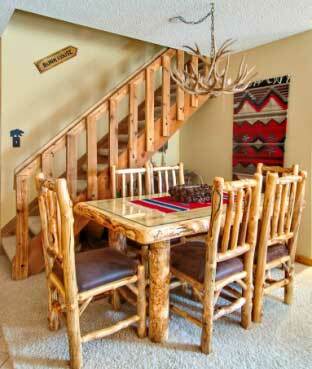 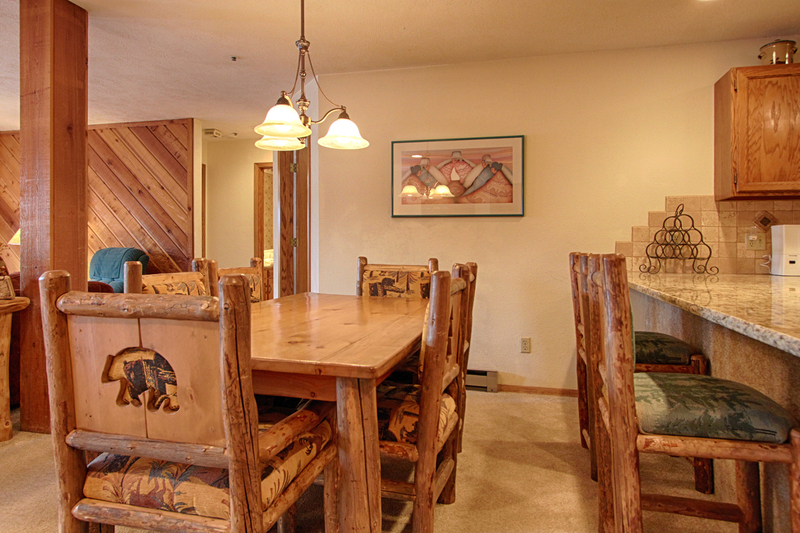 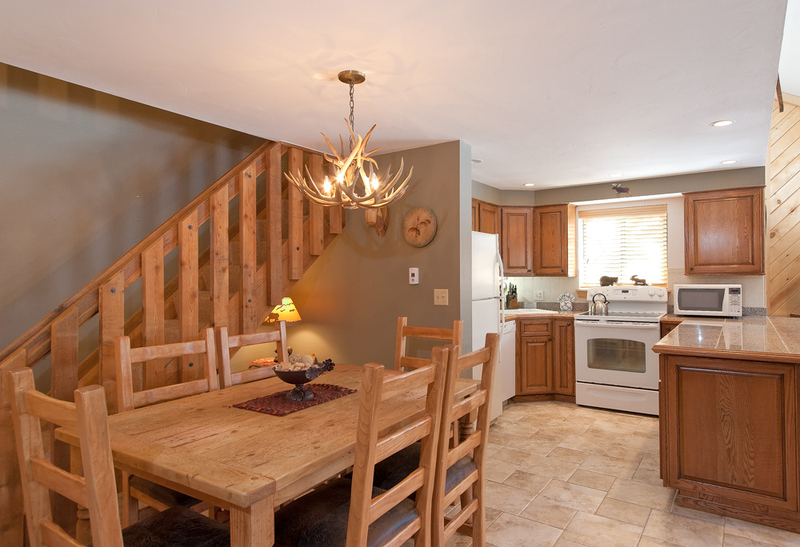 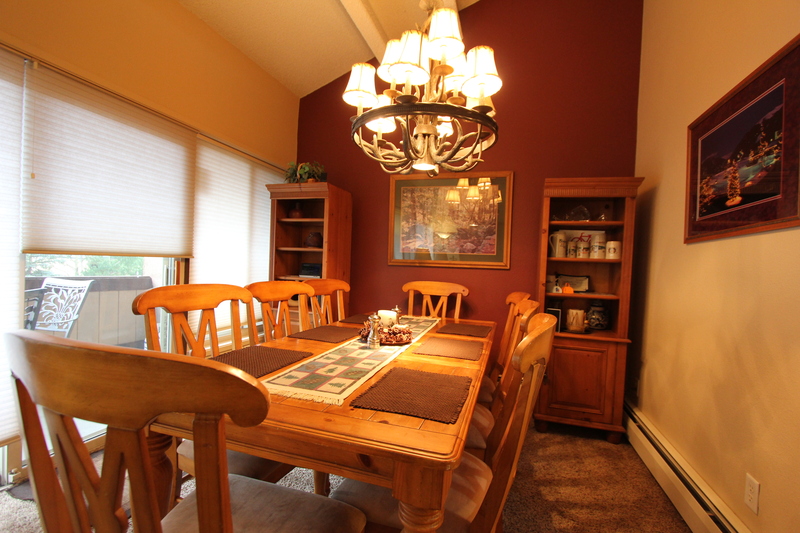 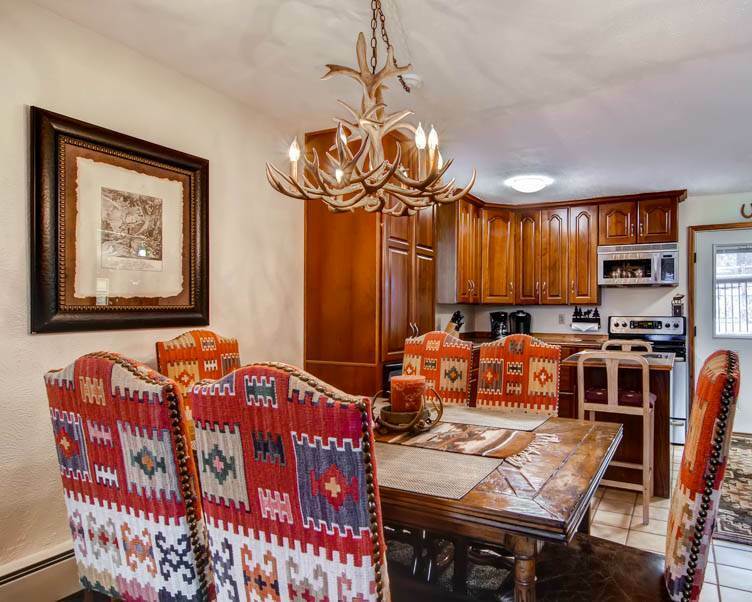 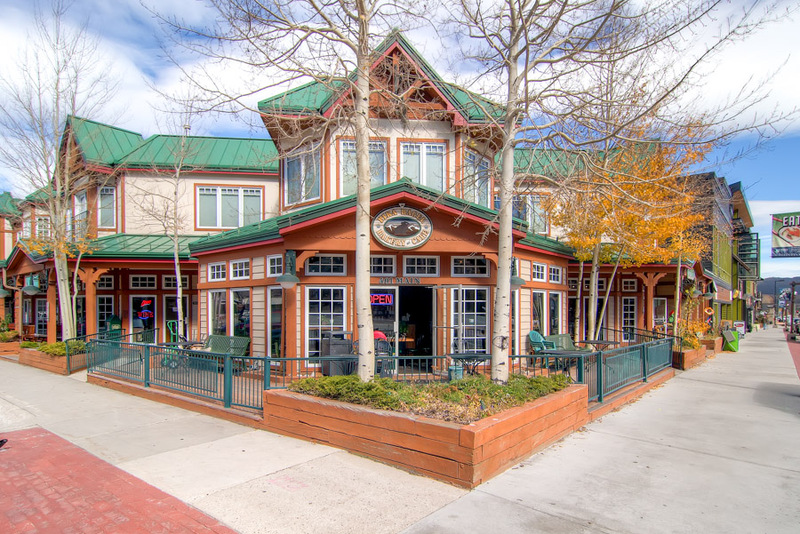 The adjacent dining area features a distressed pine dining set with seating for six people under an antler chandelier. 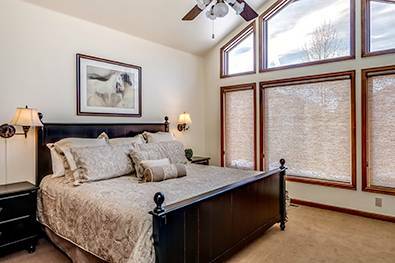 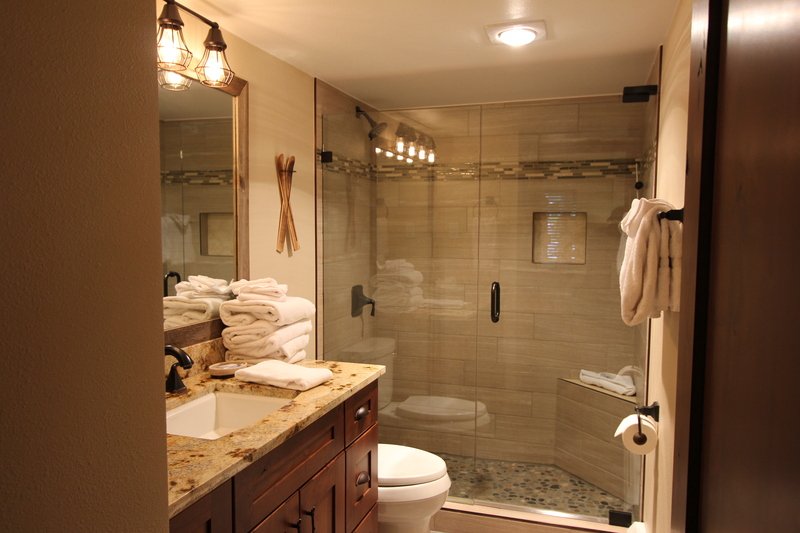 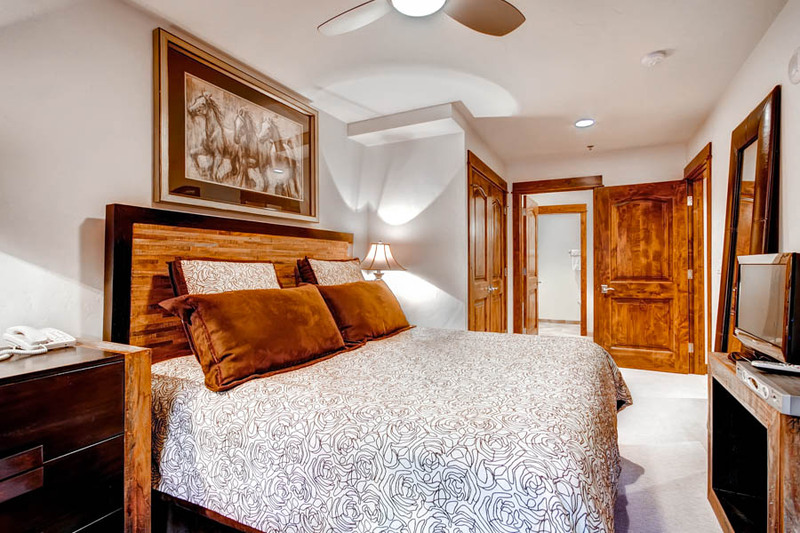 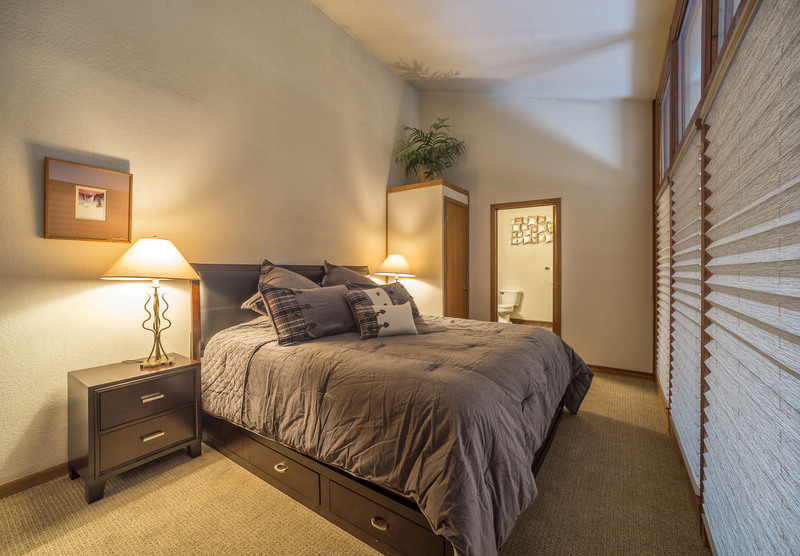 The master suite features a big King bed, private balcony, wall-mounted flatscreen TV, blackout shades and a remodeled bathroom with new tile, countertops and cabinetry. 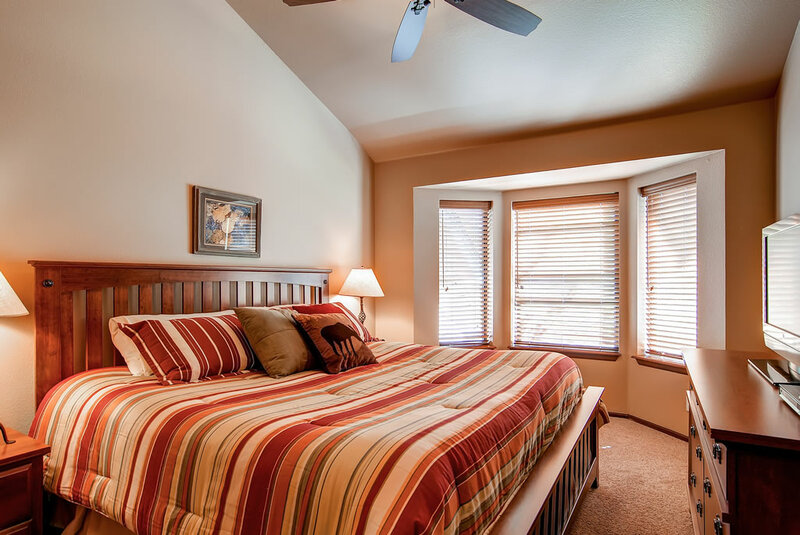 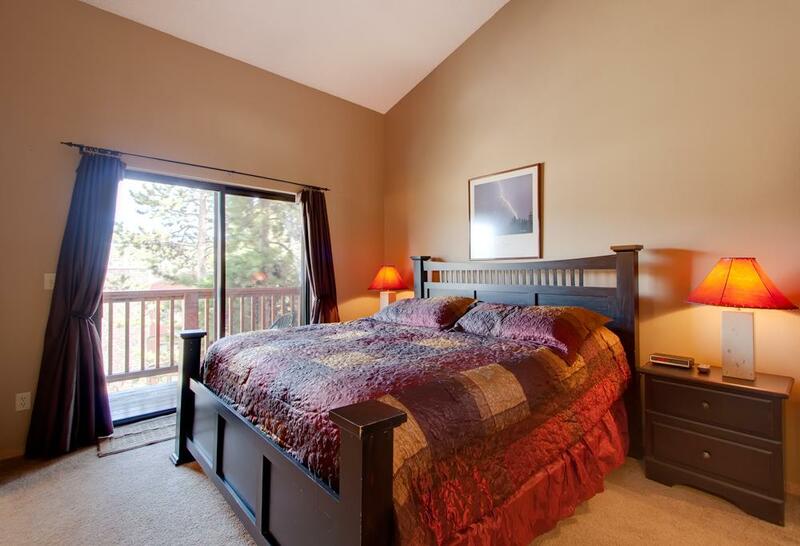 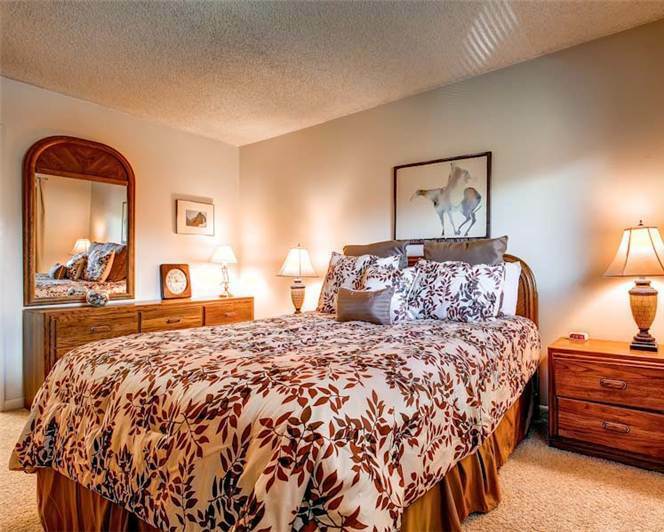 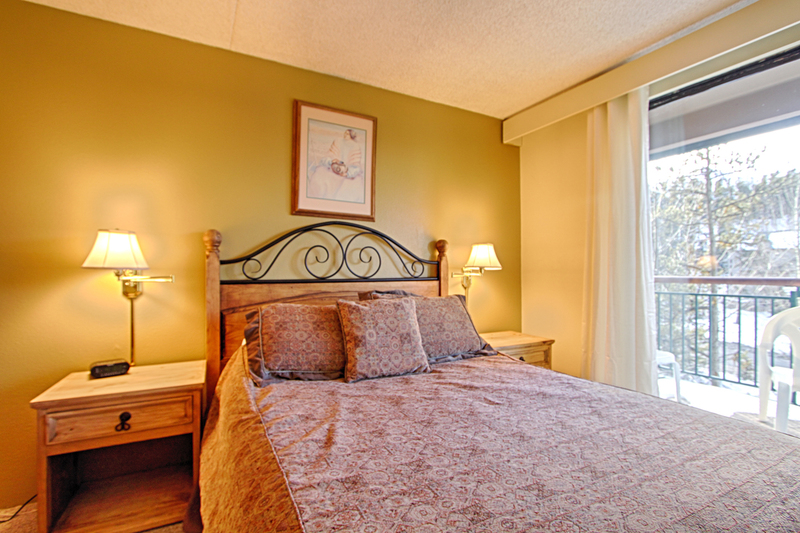 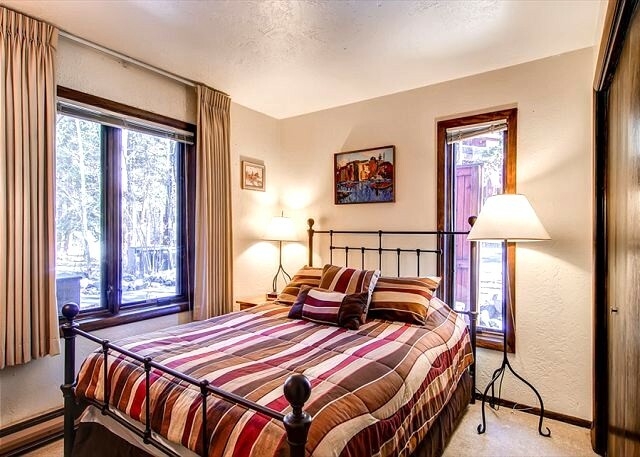 The guest bedroom has a Queen bed, two big windows and plenty of closet space. 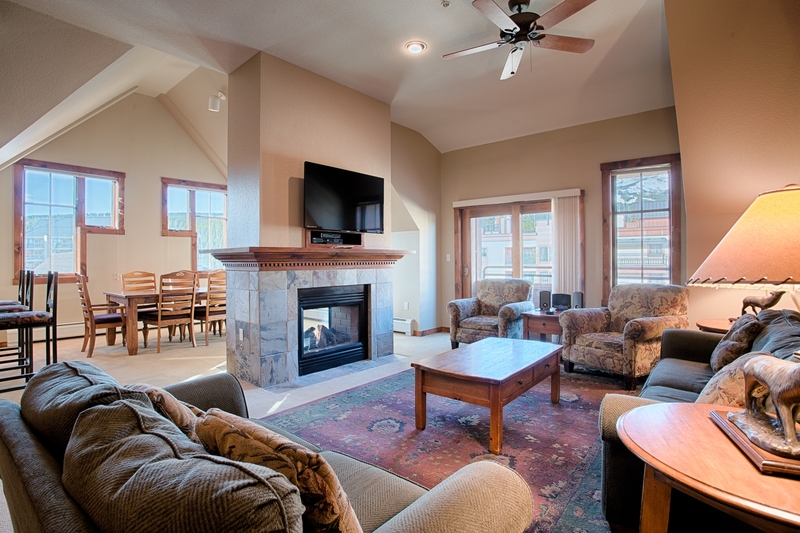 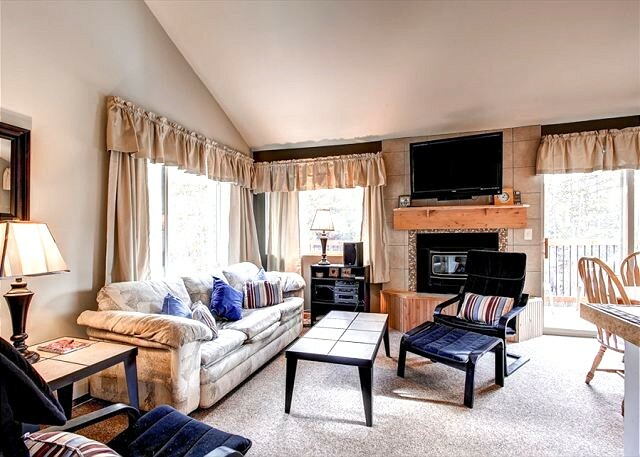 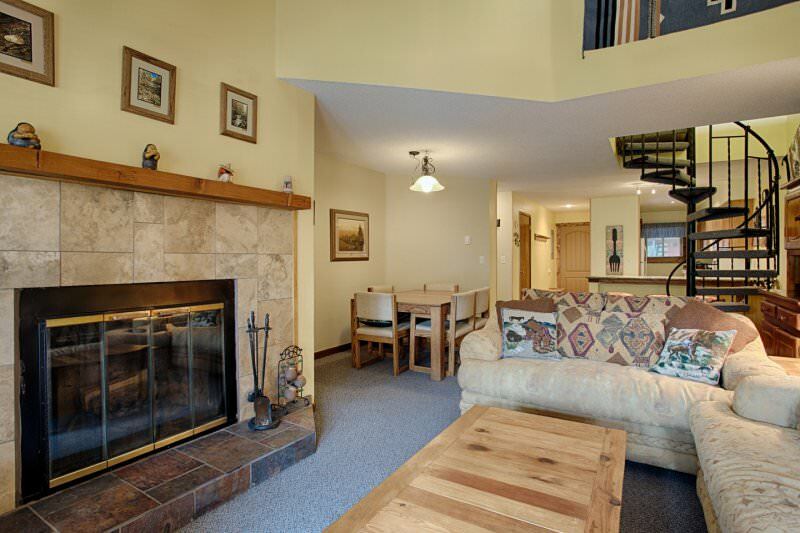 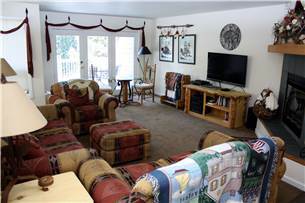 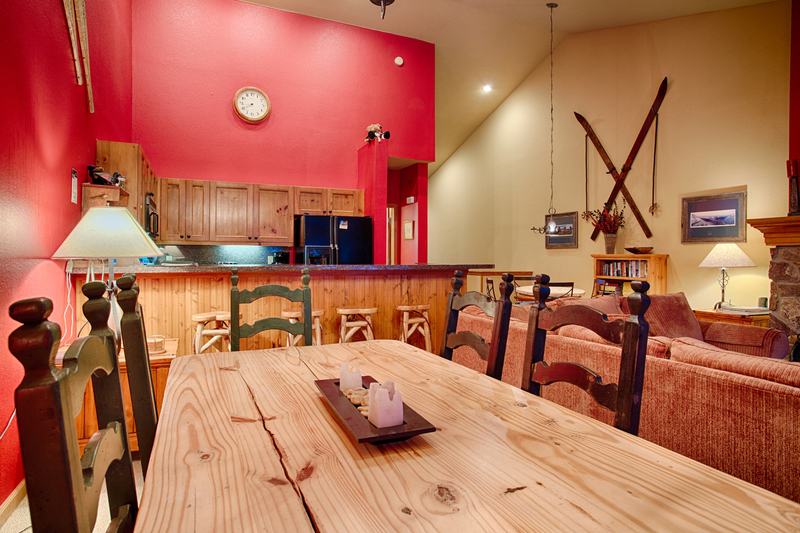 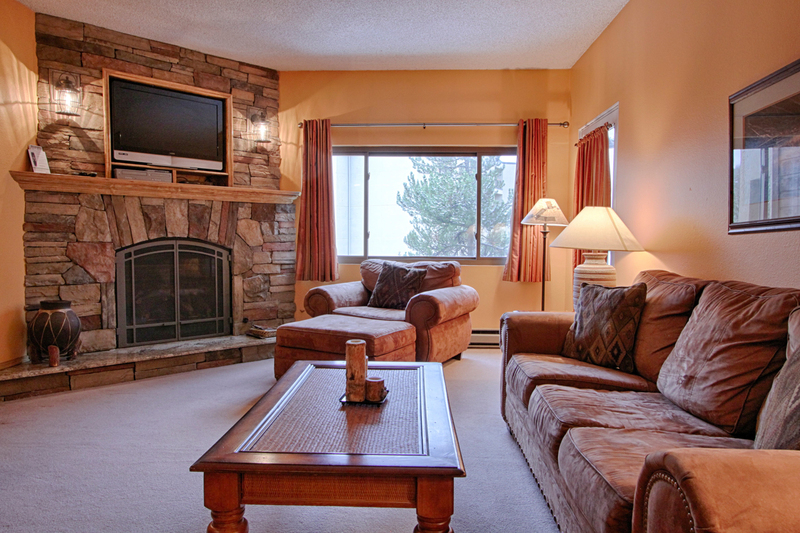 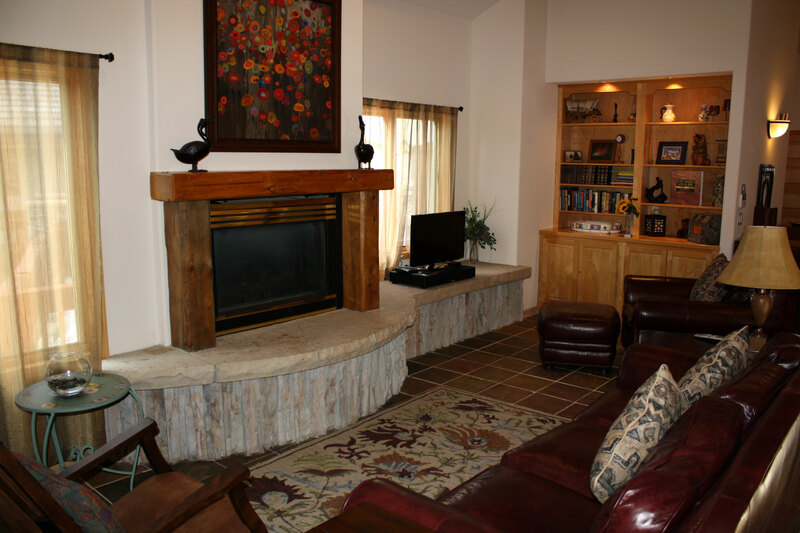 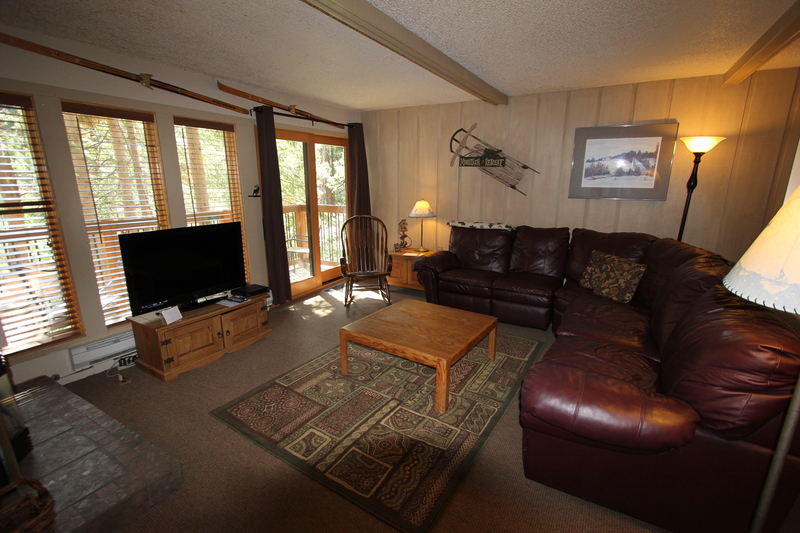 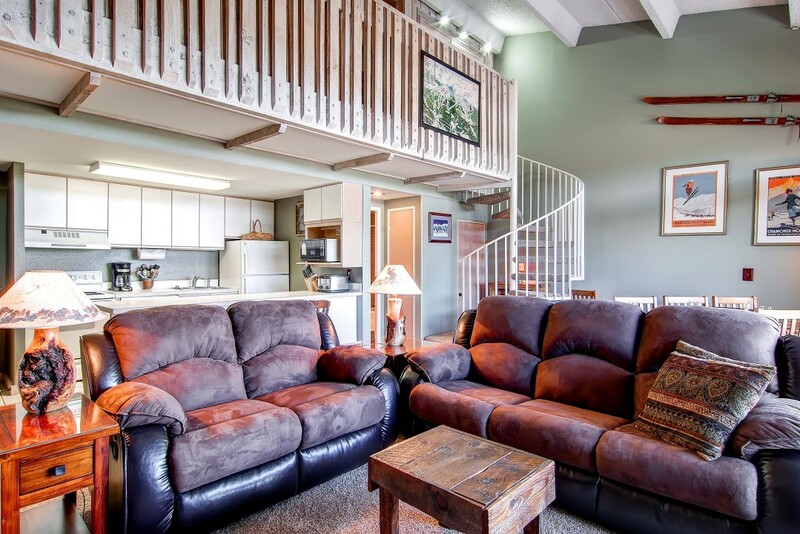 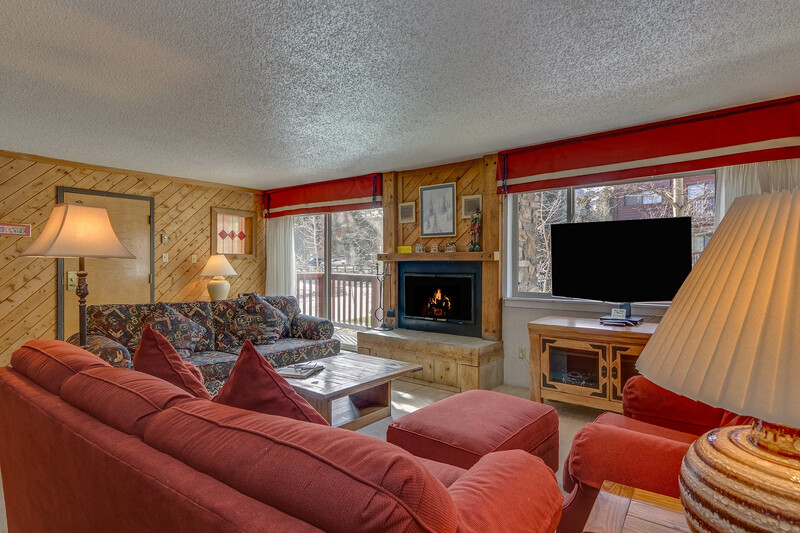 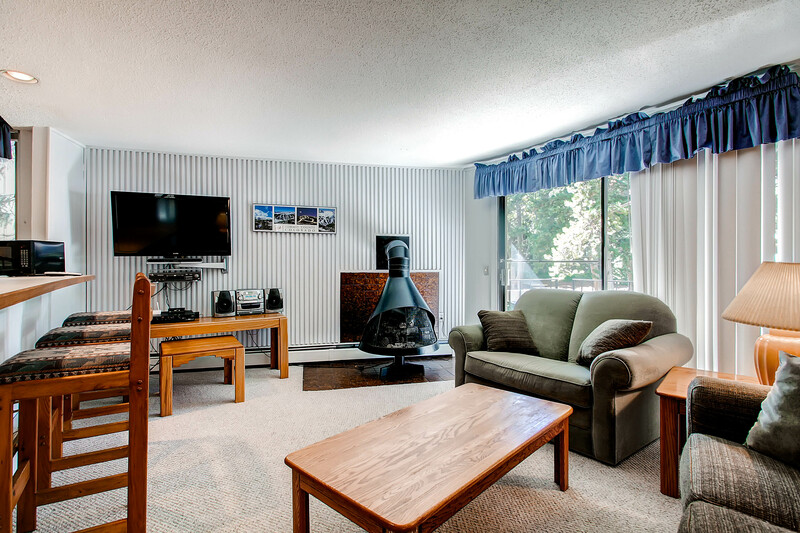 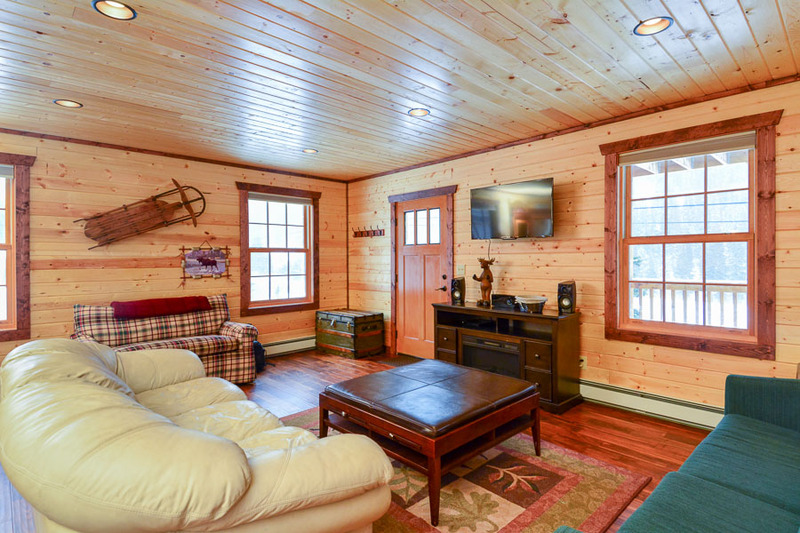 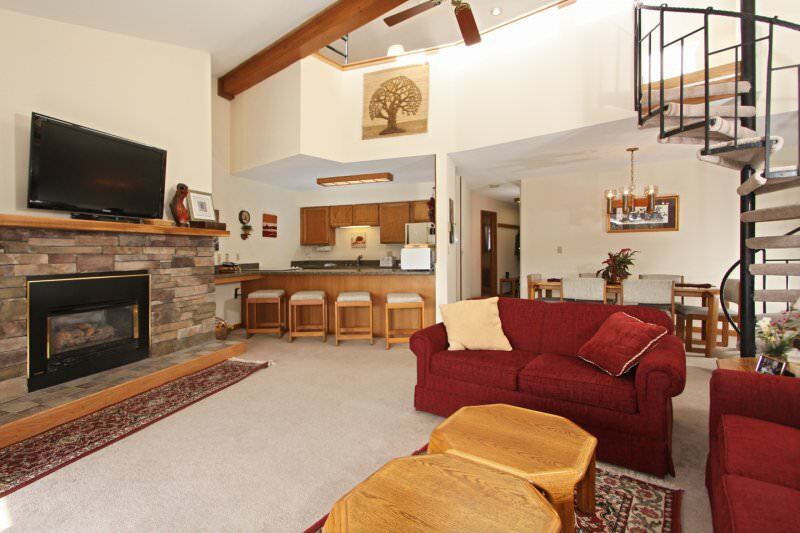 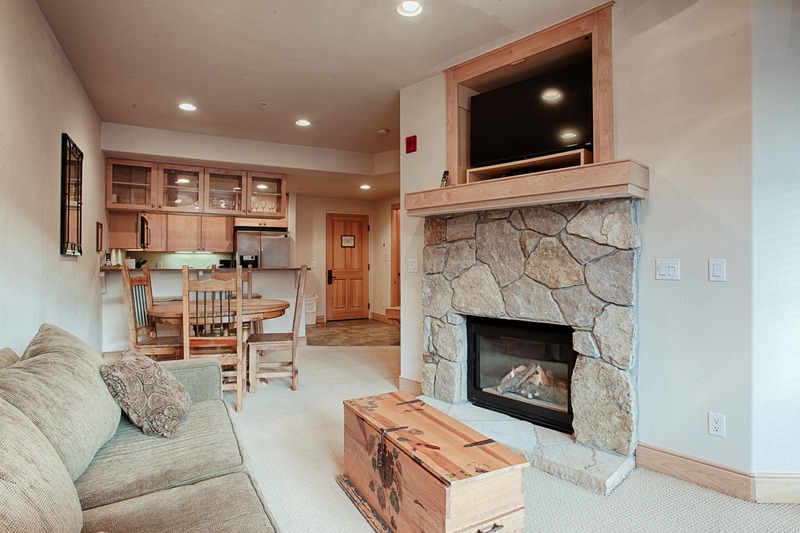 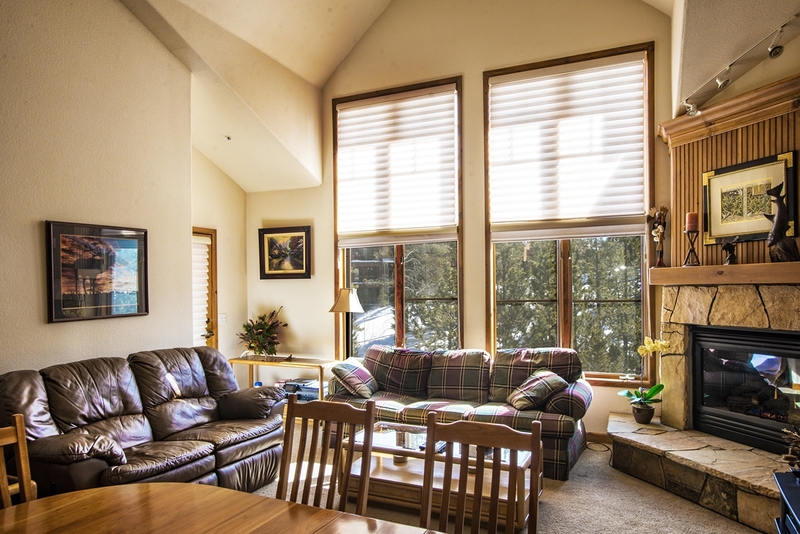 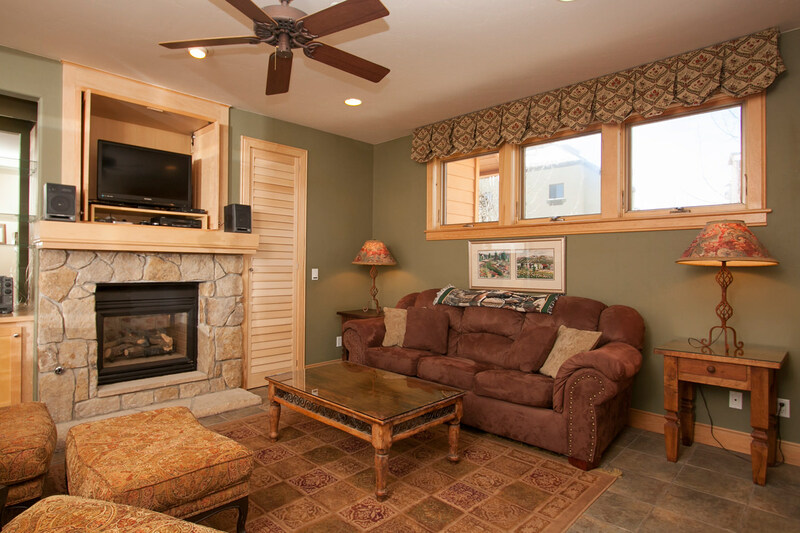 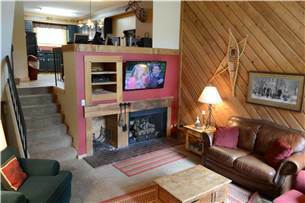 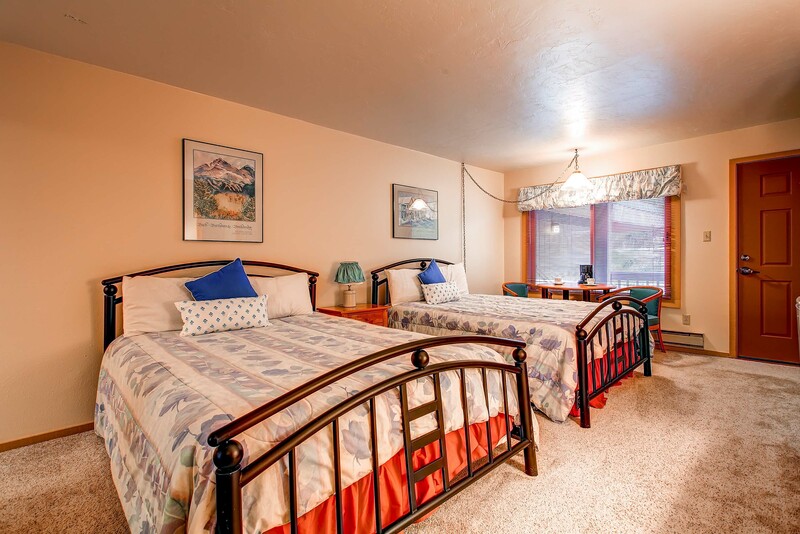 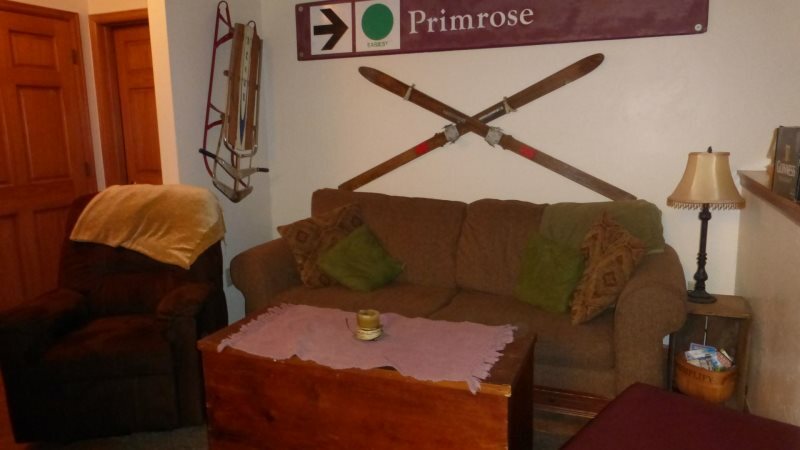 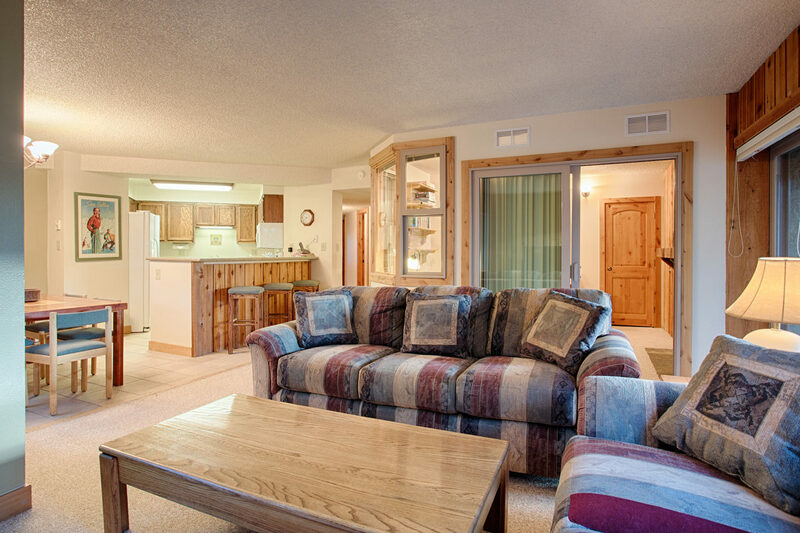 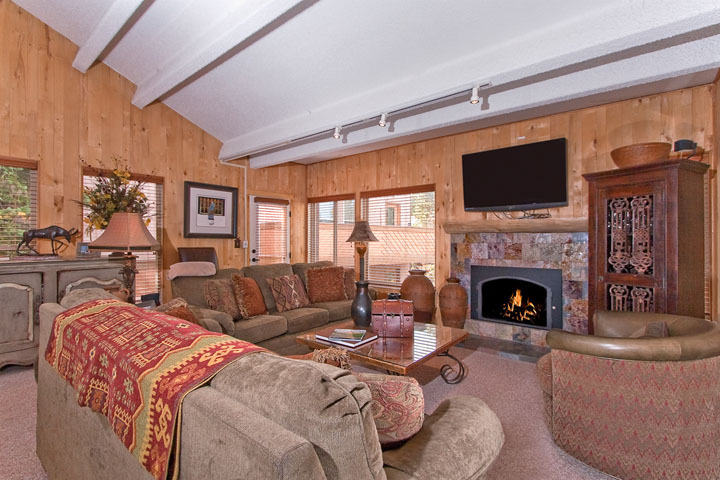 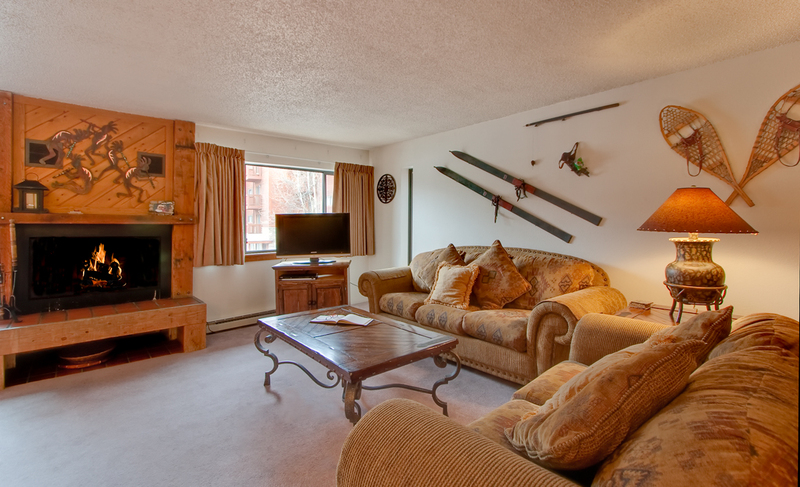 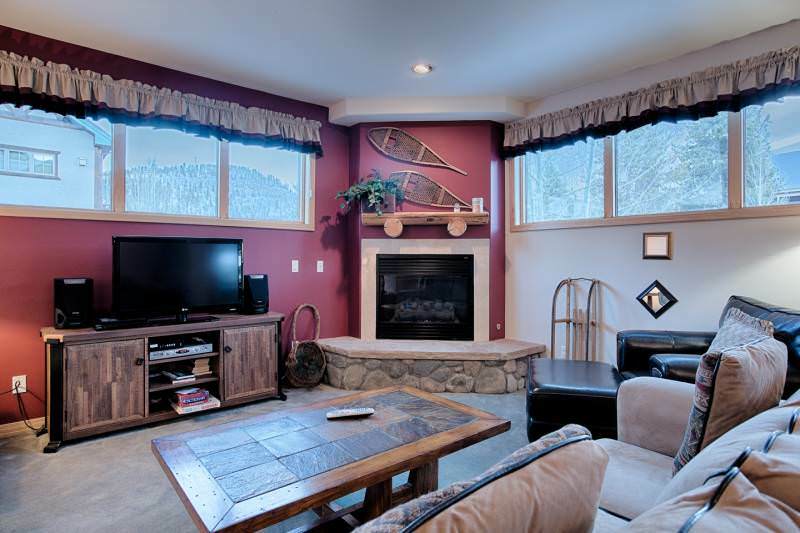 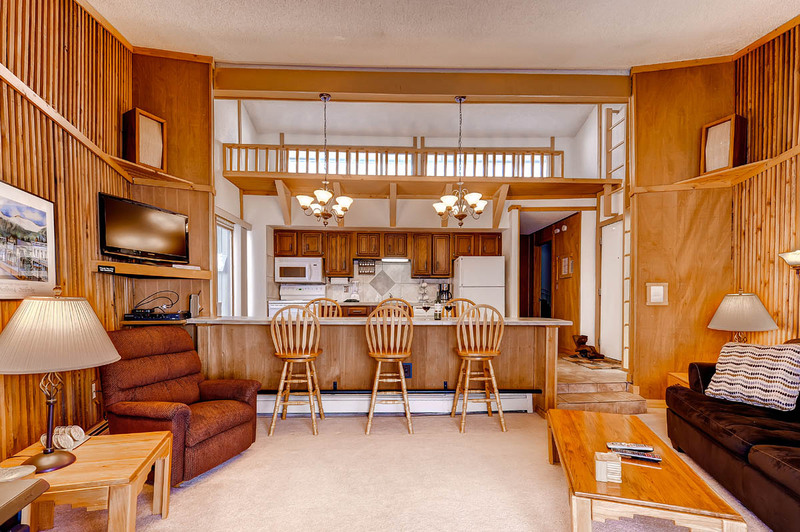 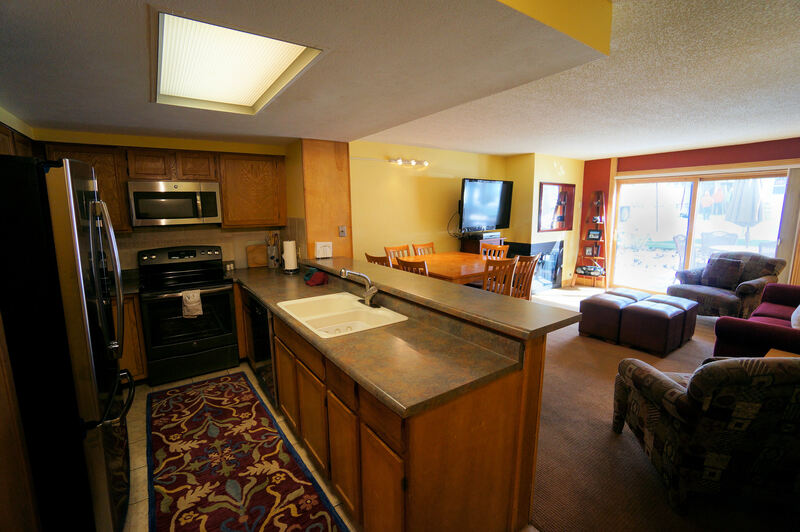 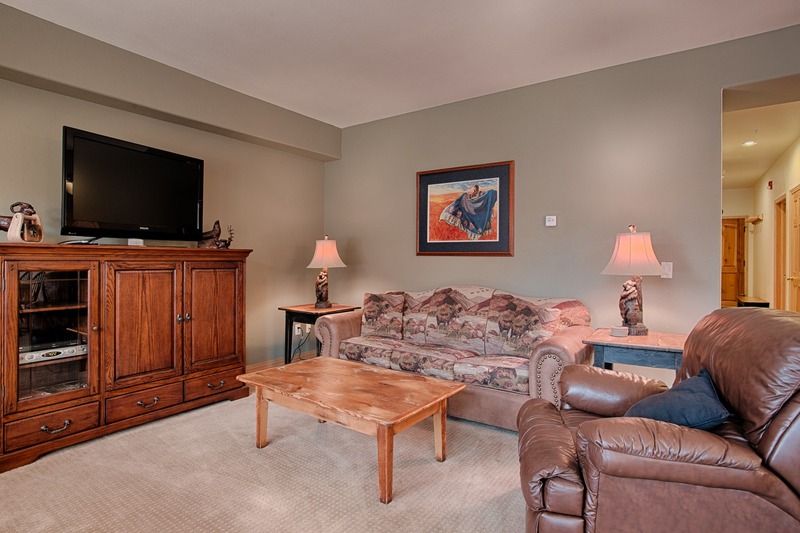 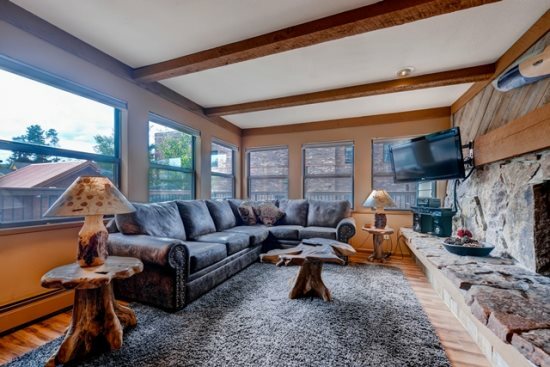 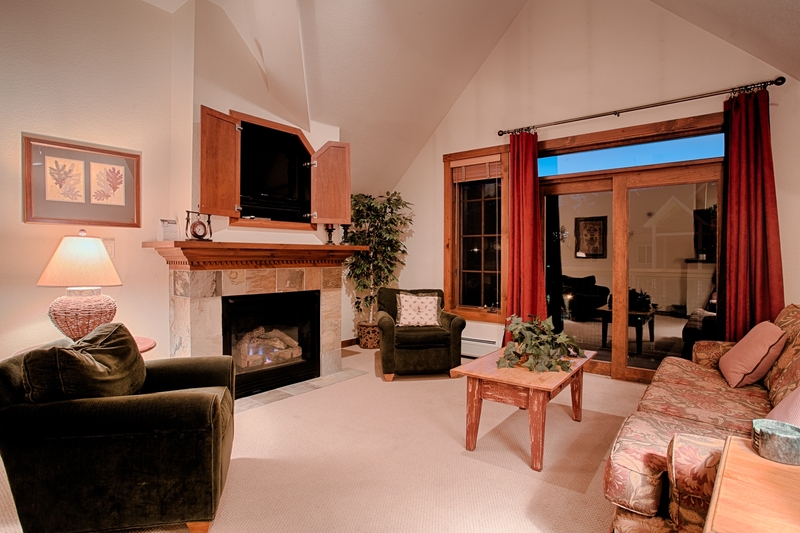 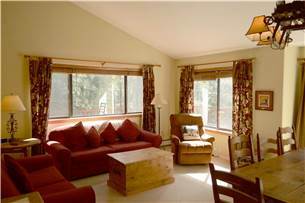 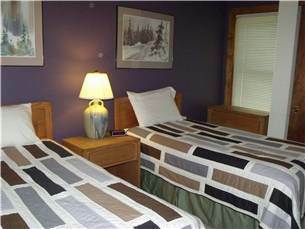 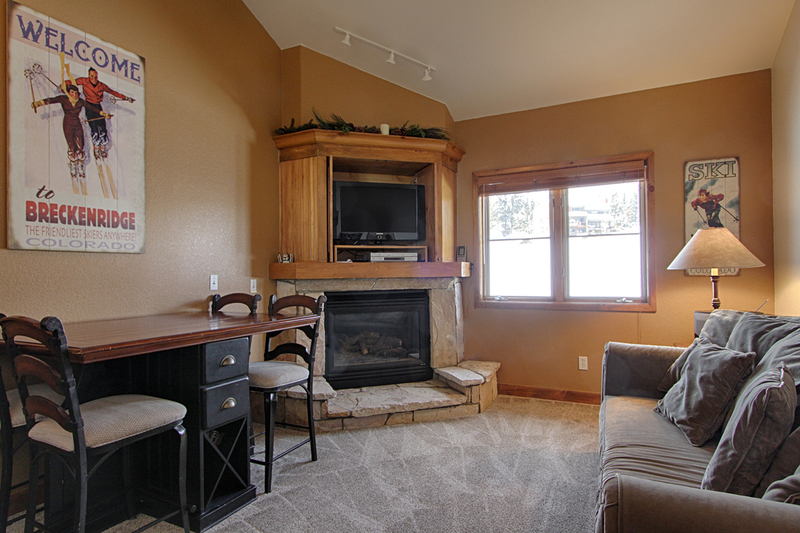 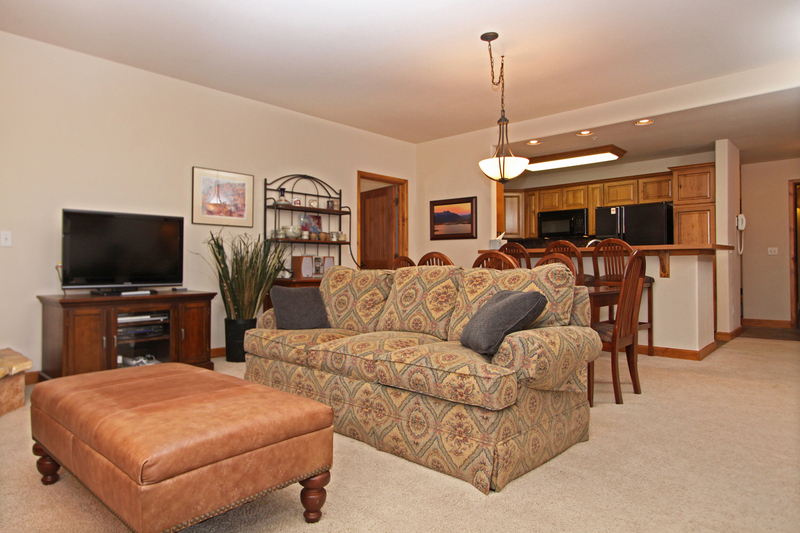 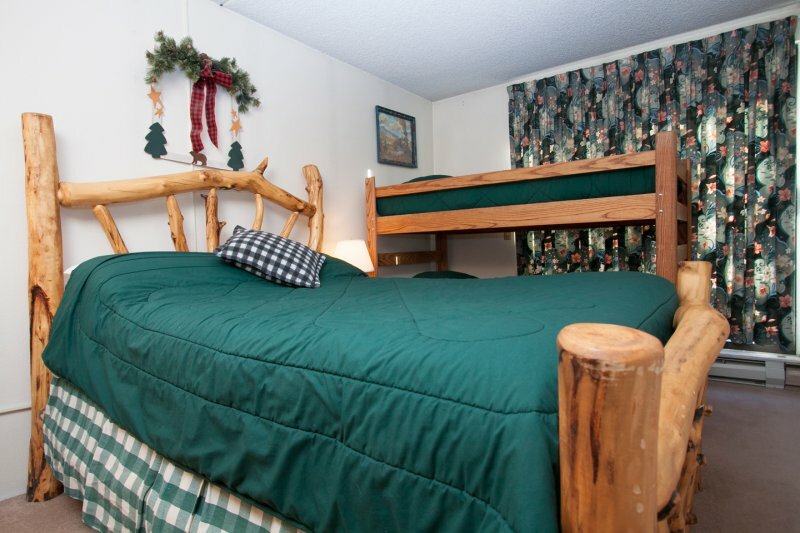 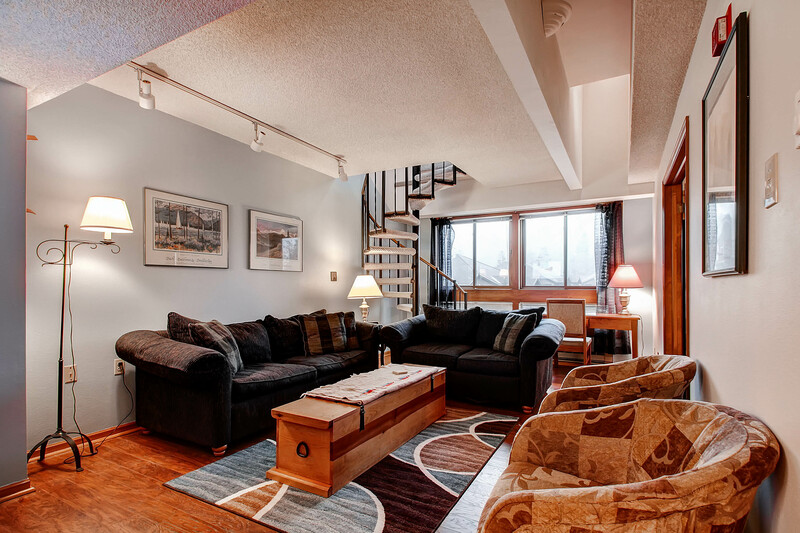 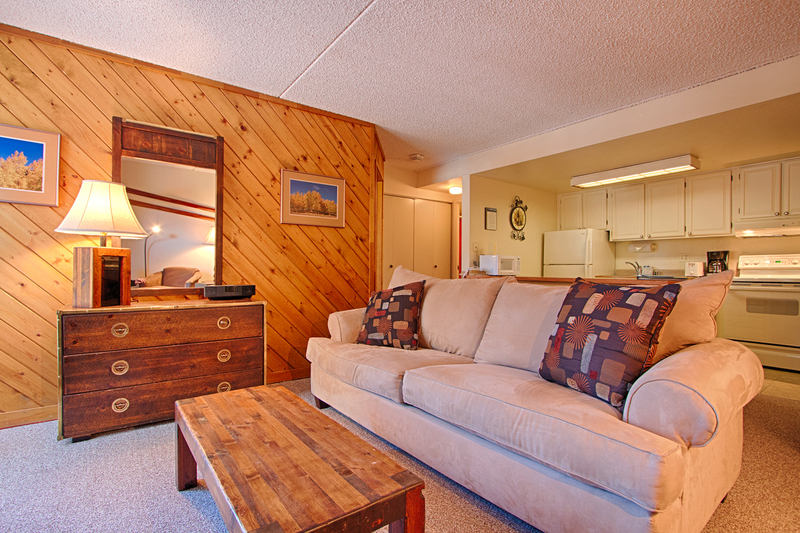 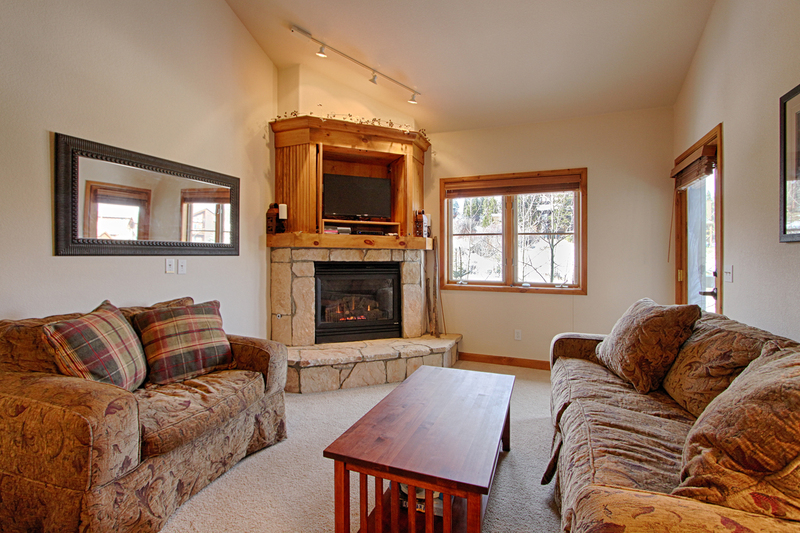 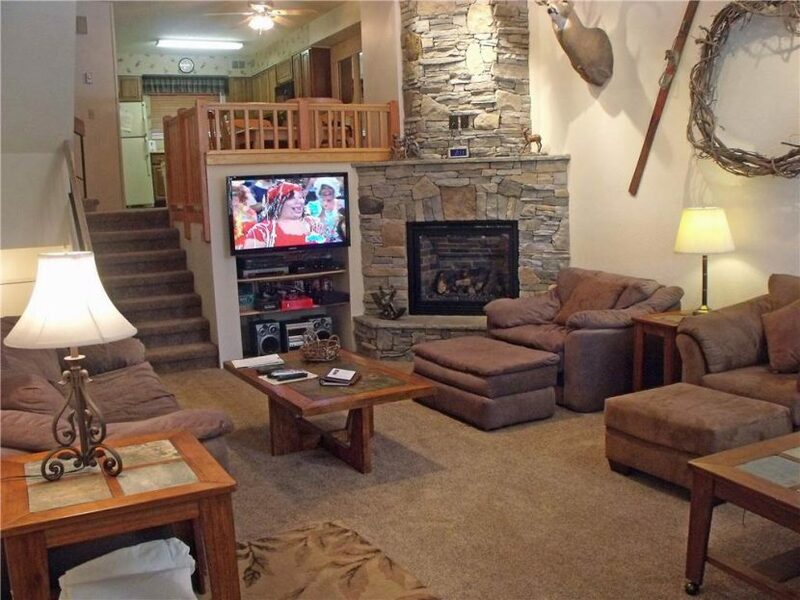 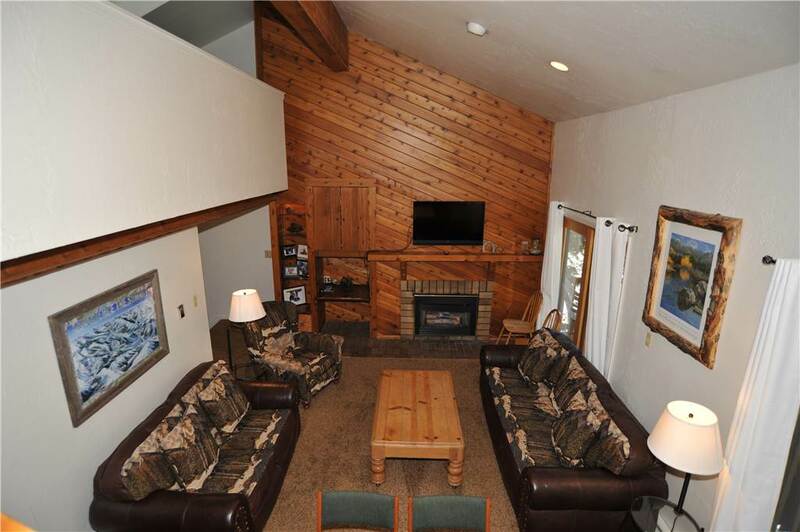 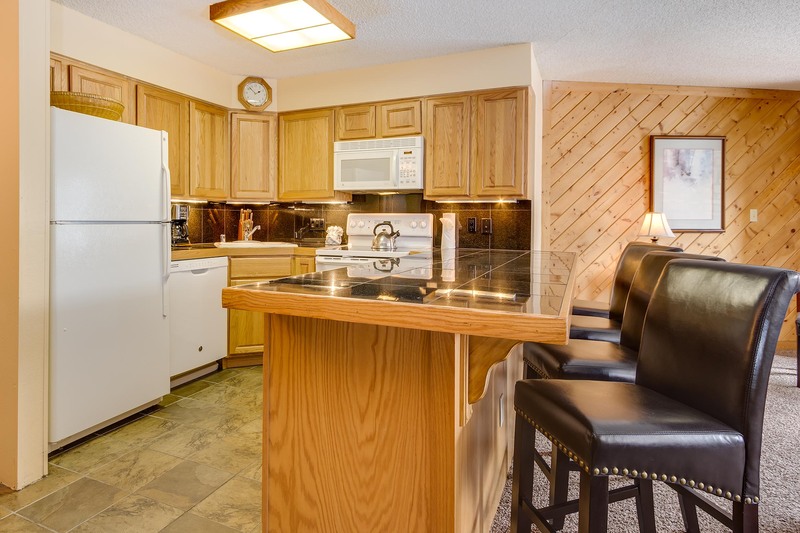 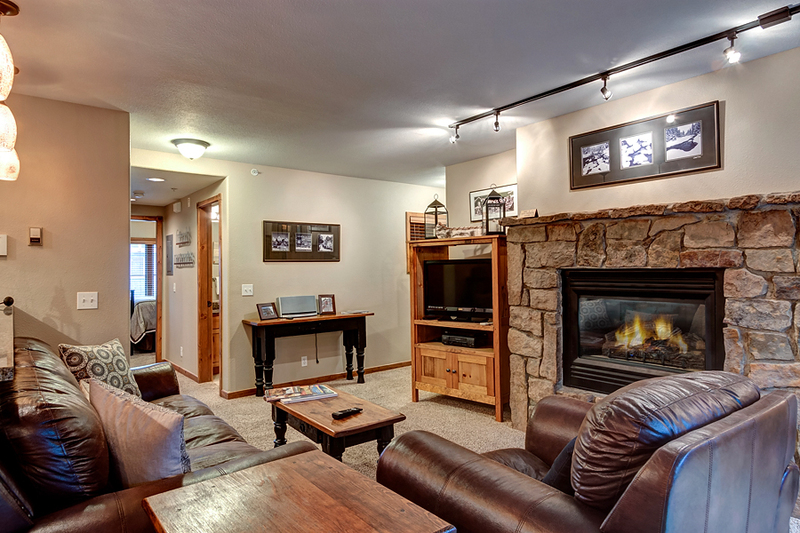 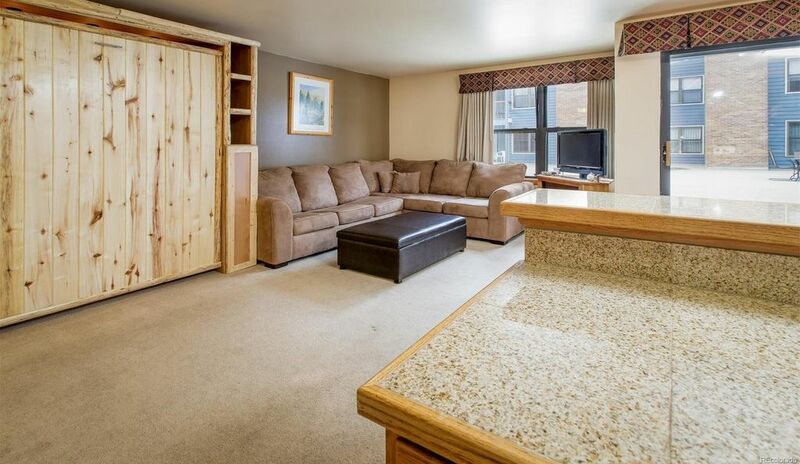 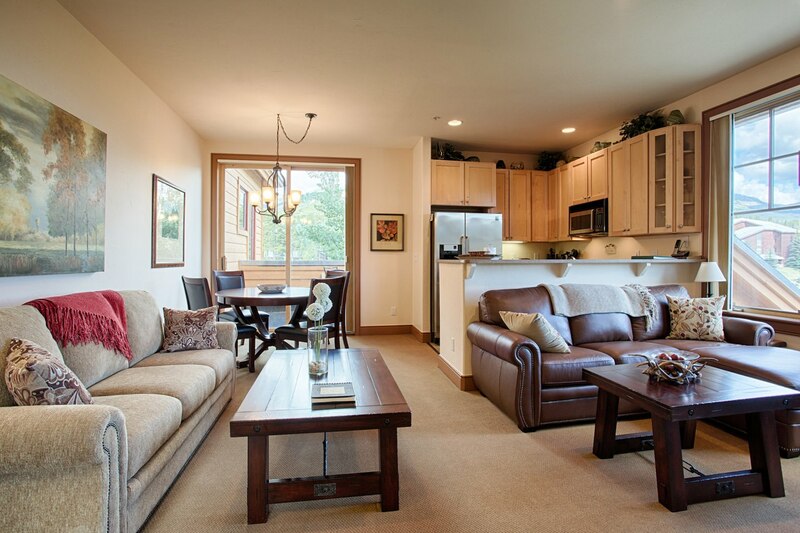 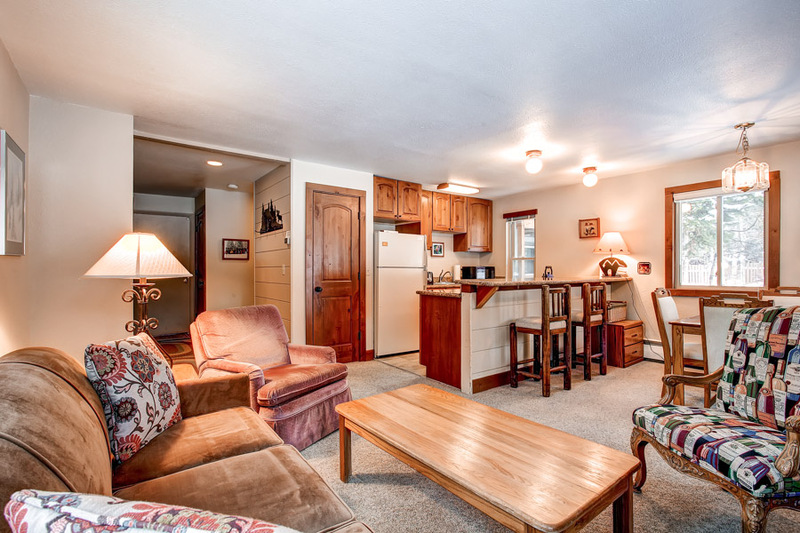 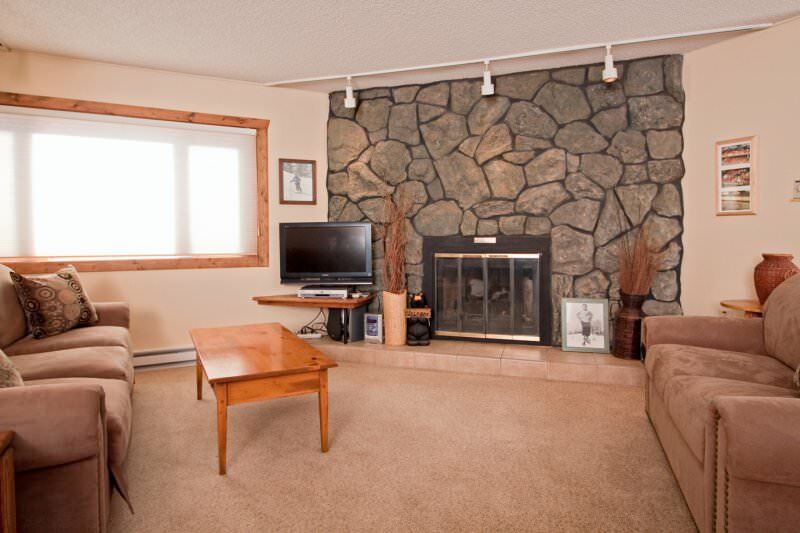 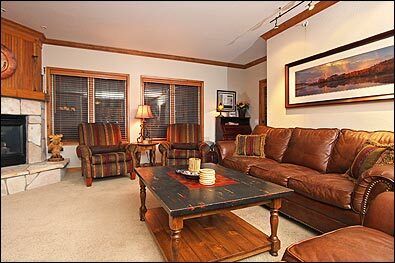 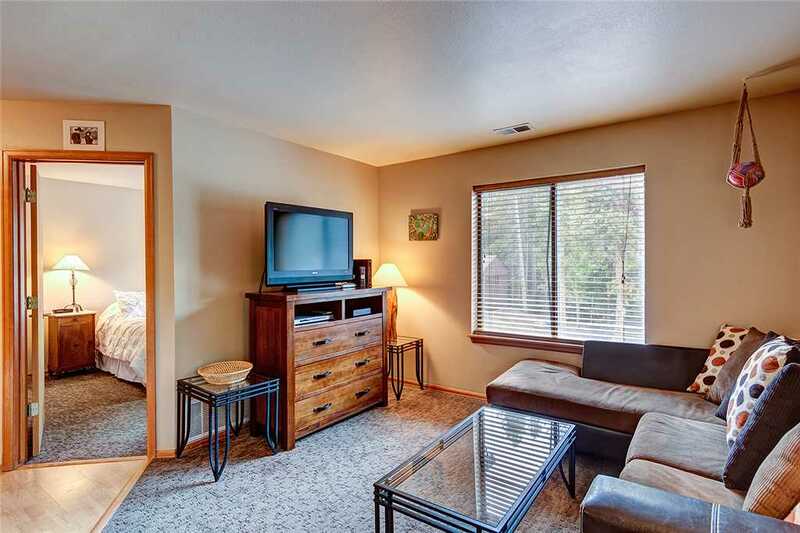 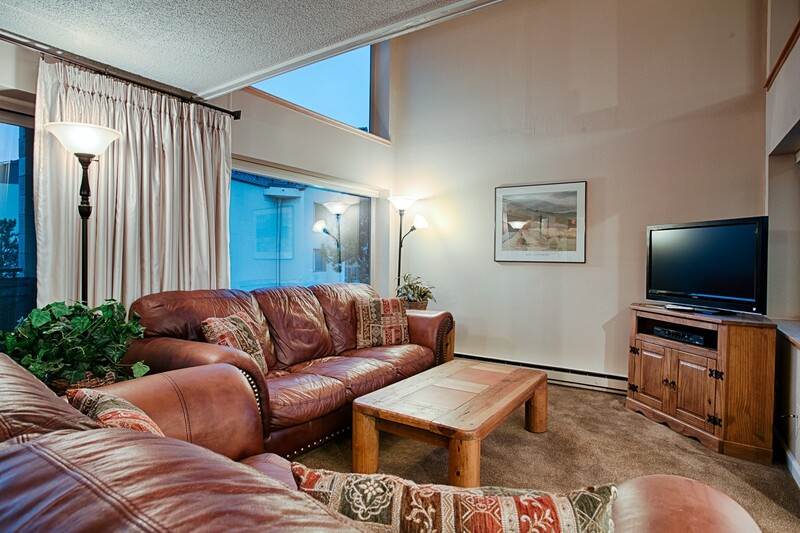 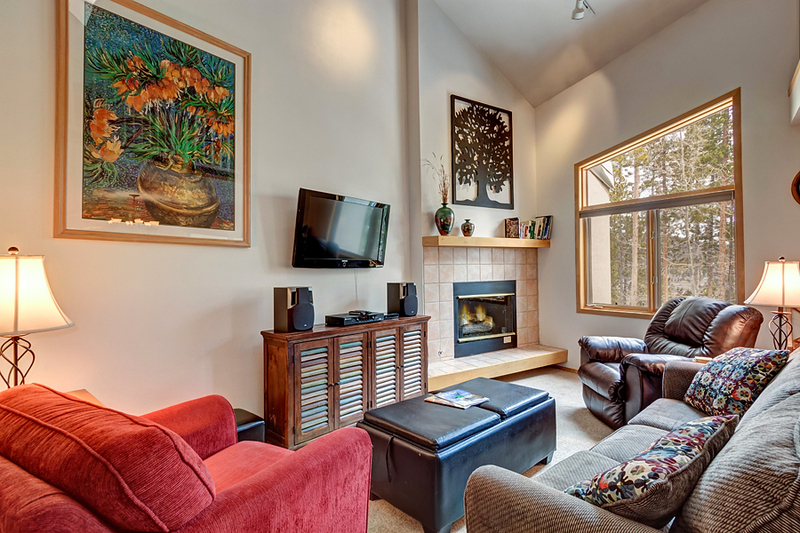 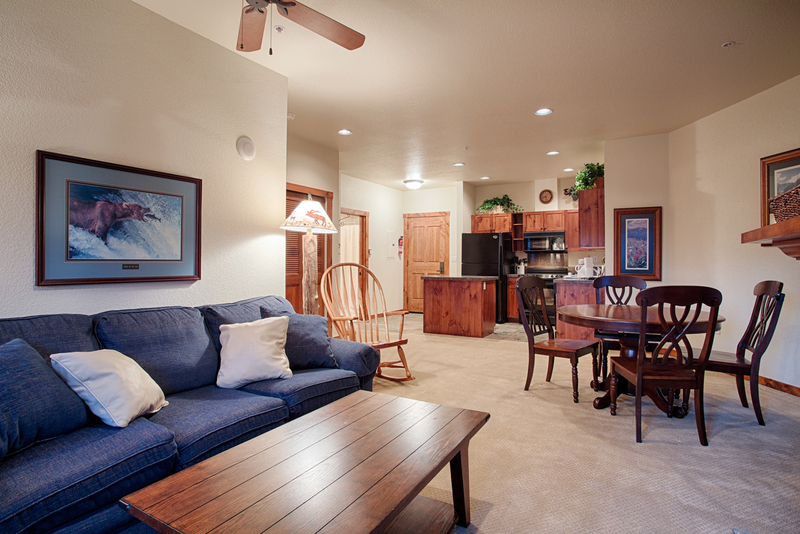 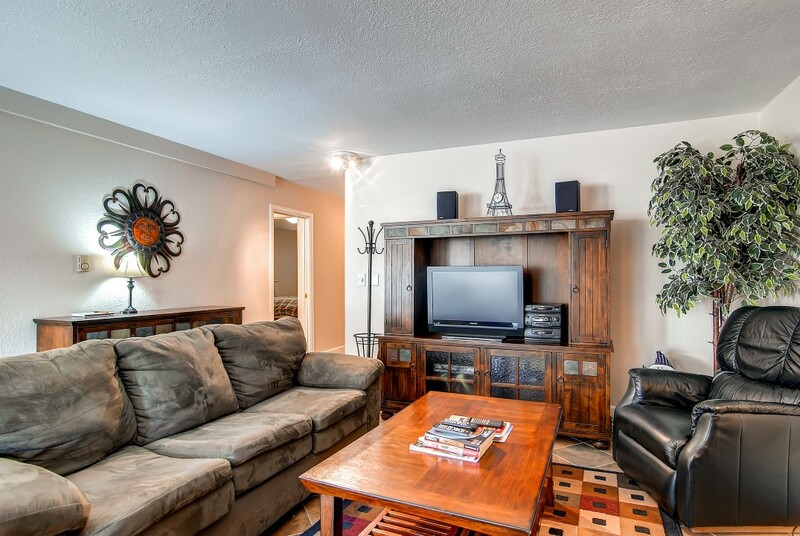 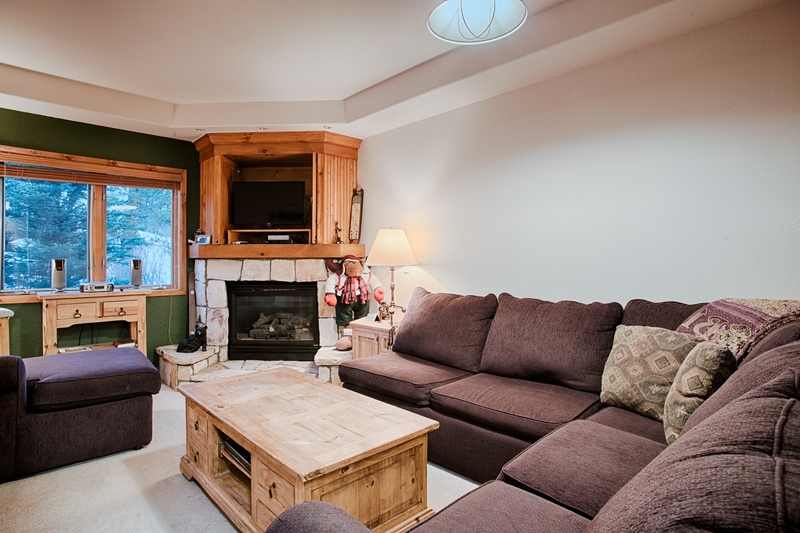 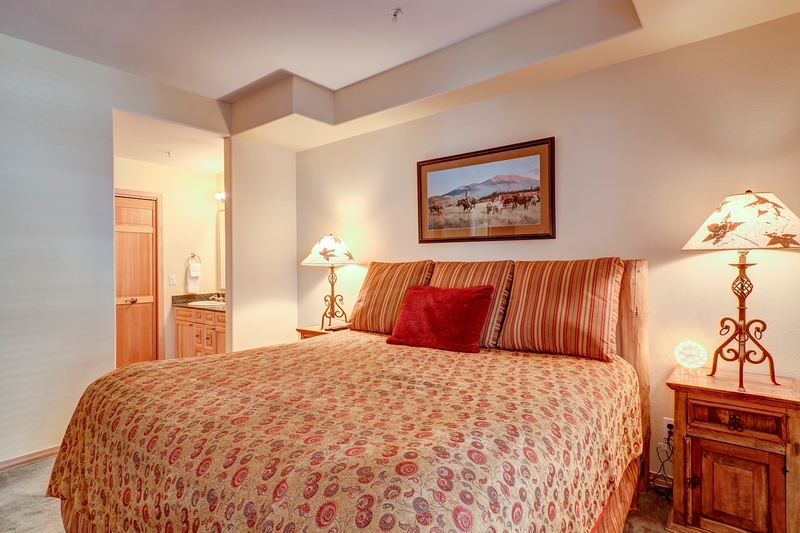 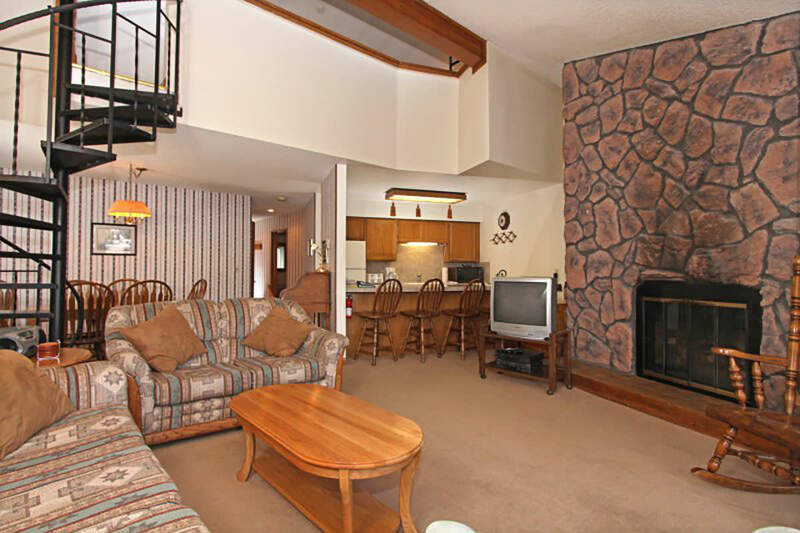 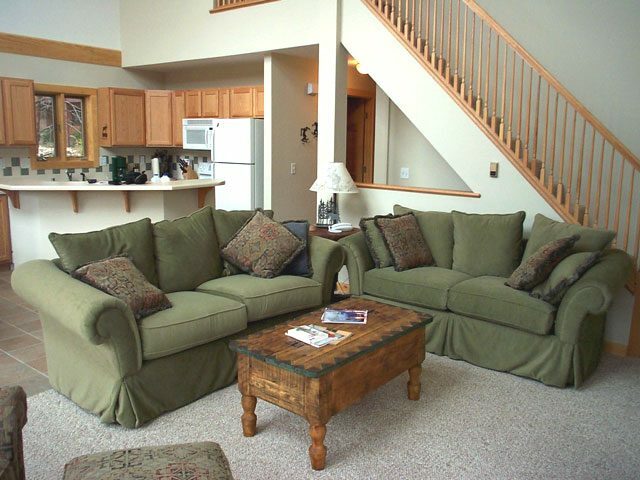 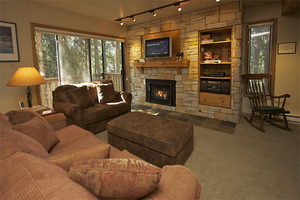 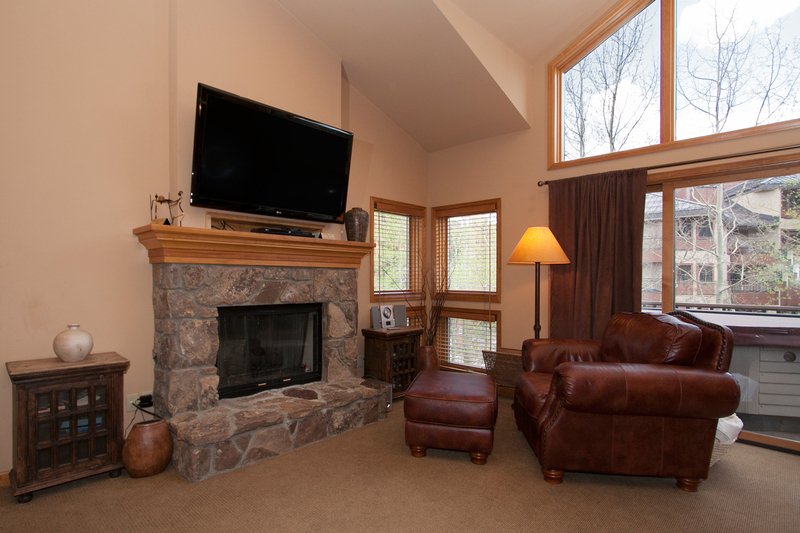 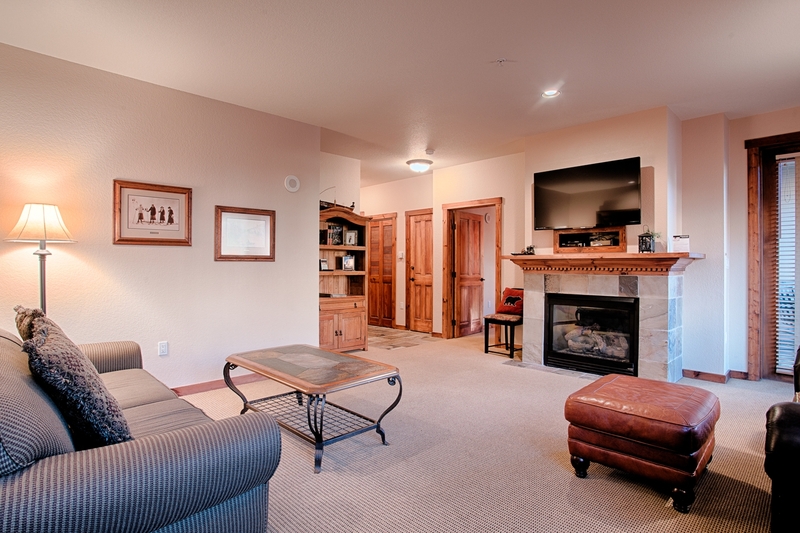 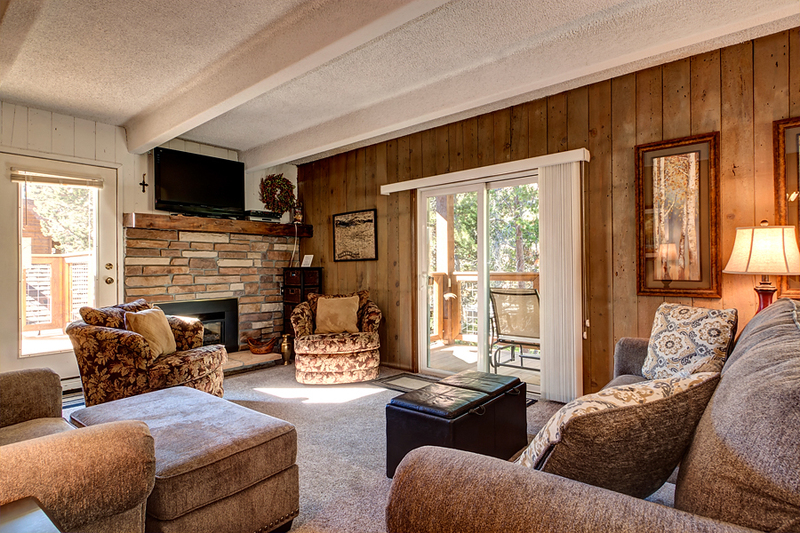 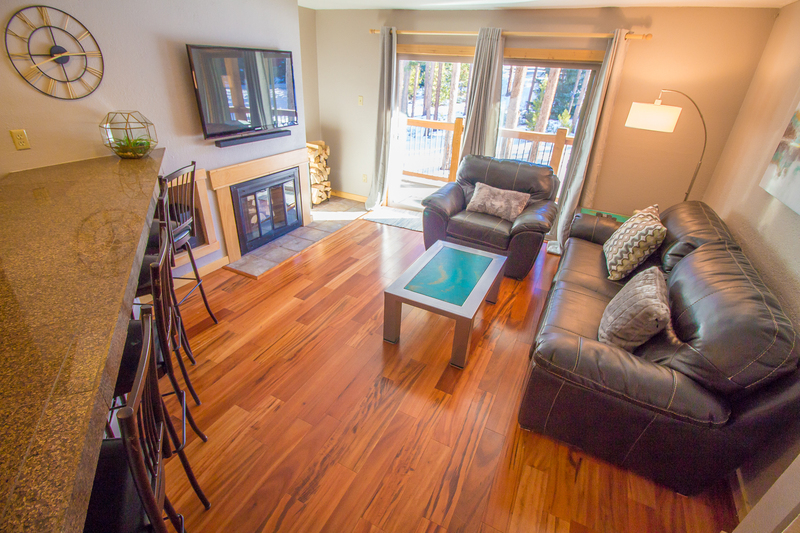 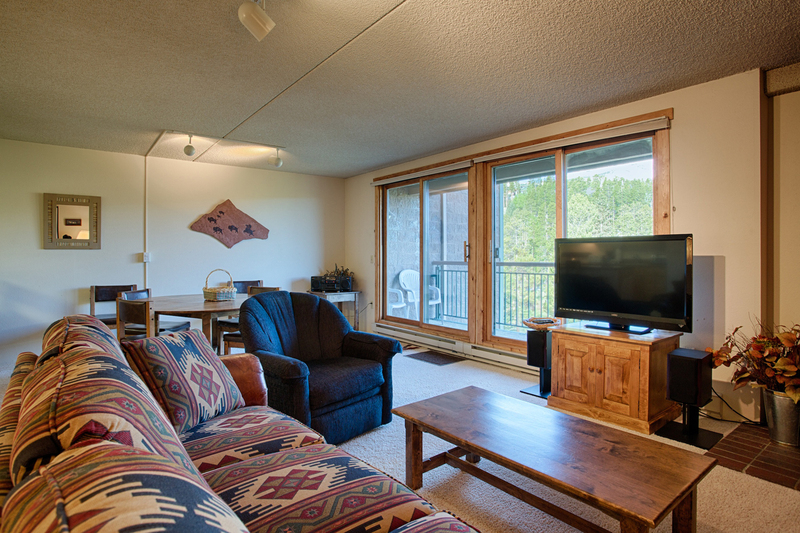 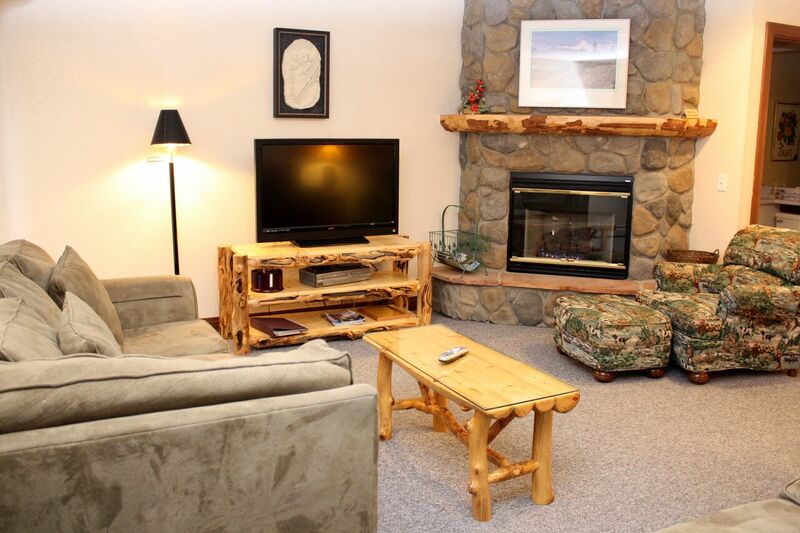 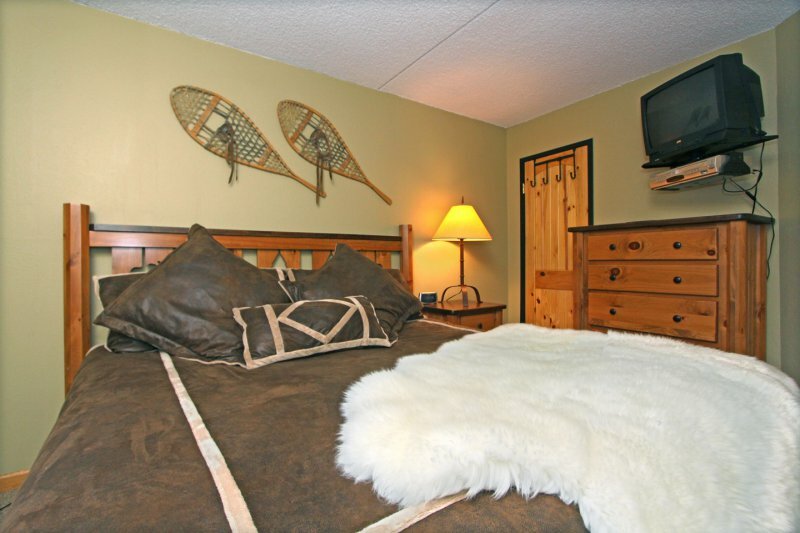 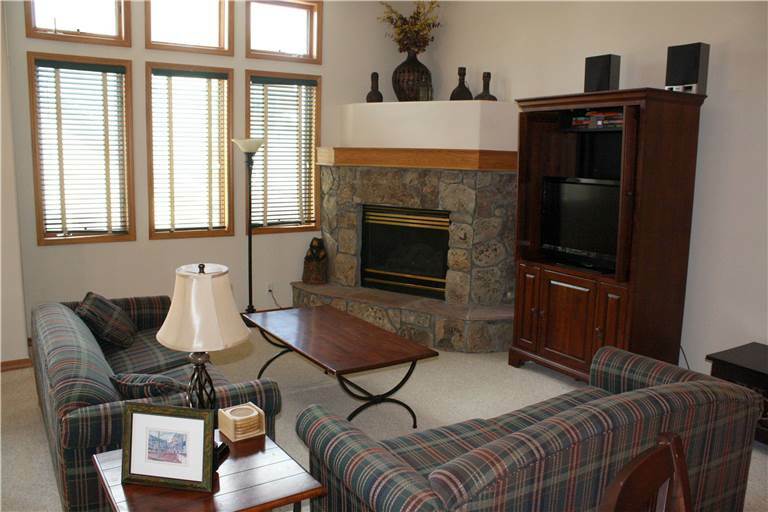 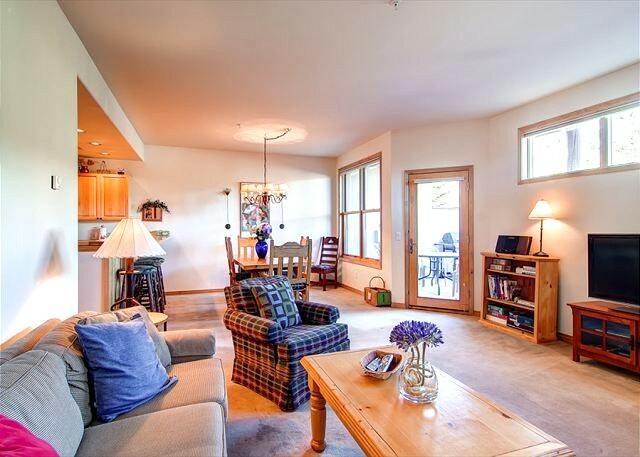 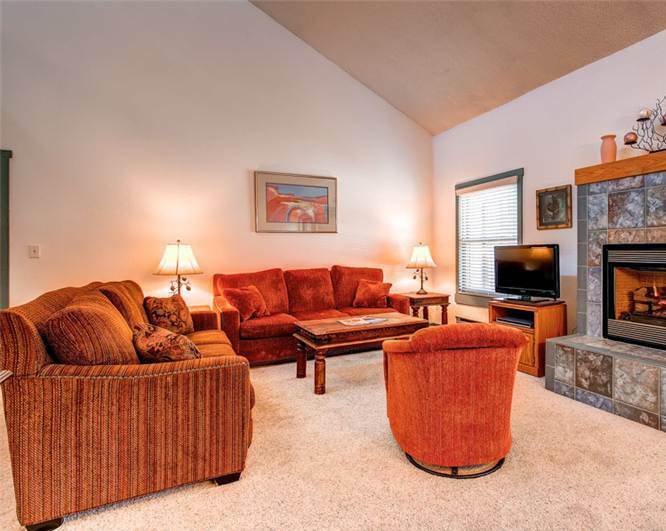 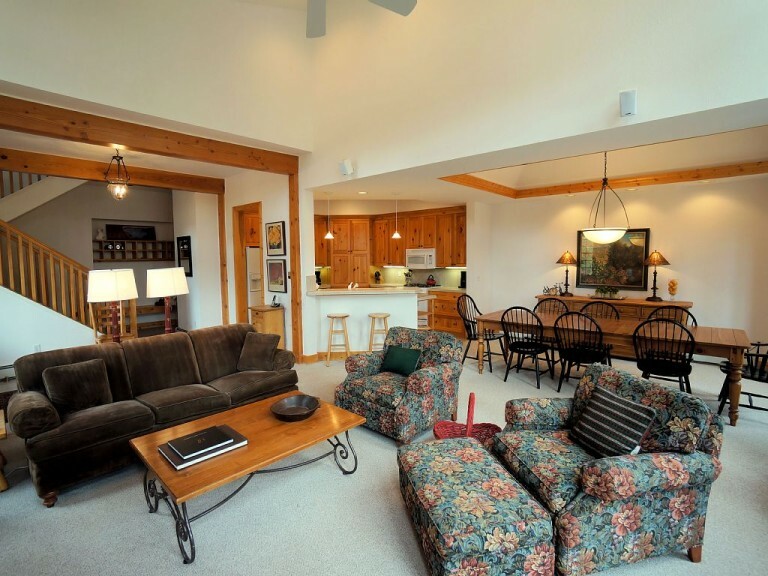 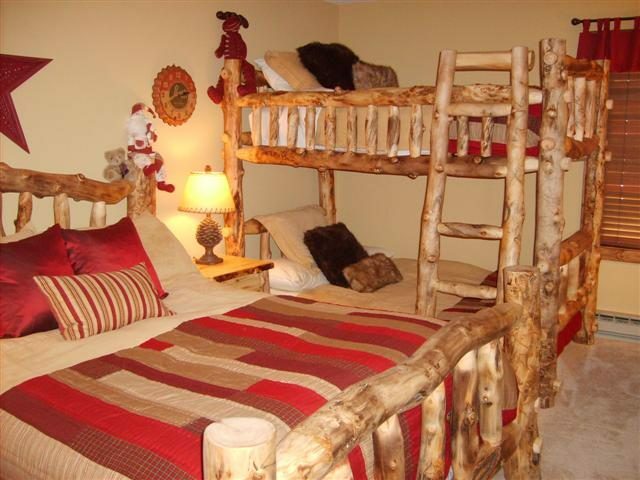 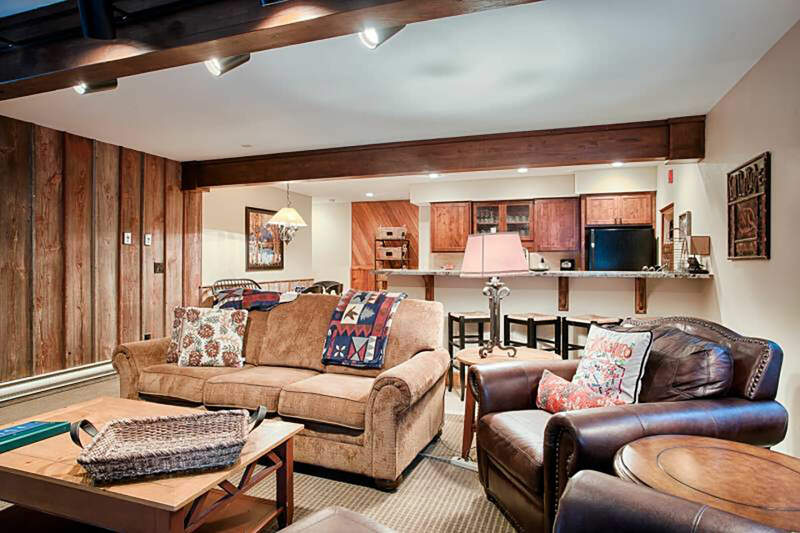 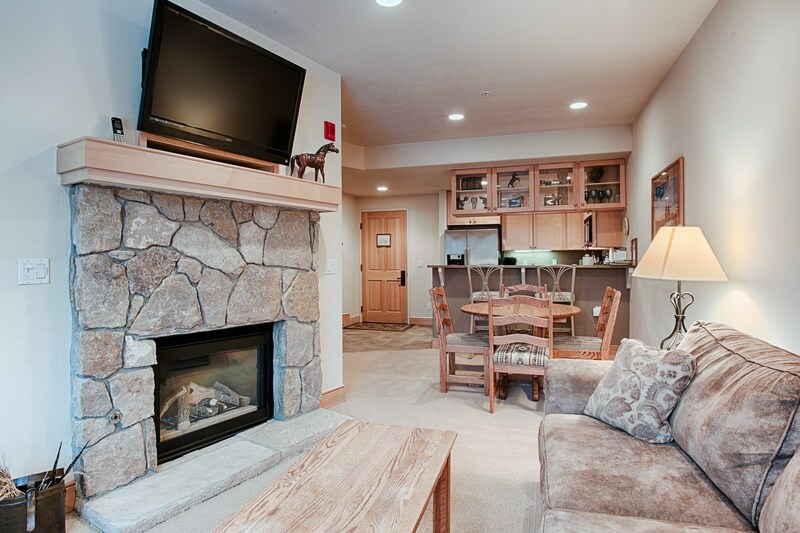 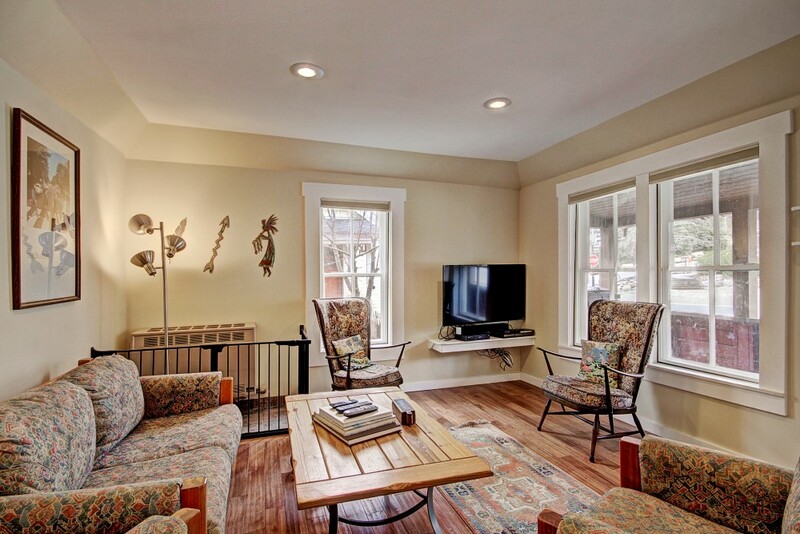 The spacious loft offers a private space with a Twin bed with a Bunk bed, lots of storage and a TV with DVD/VCR. 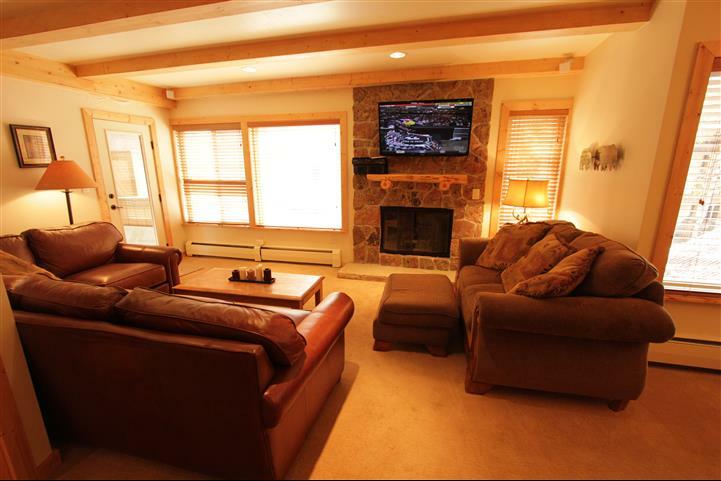 13F is a good selection for two small families.